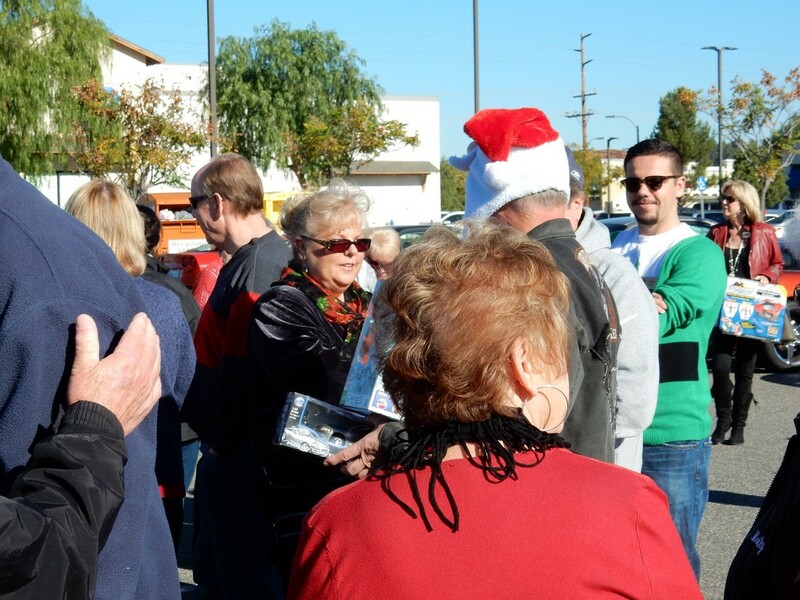 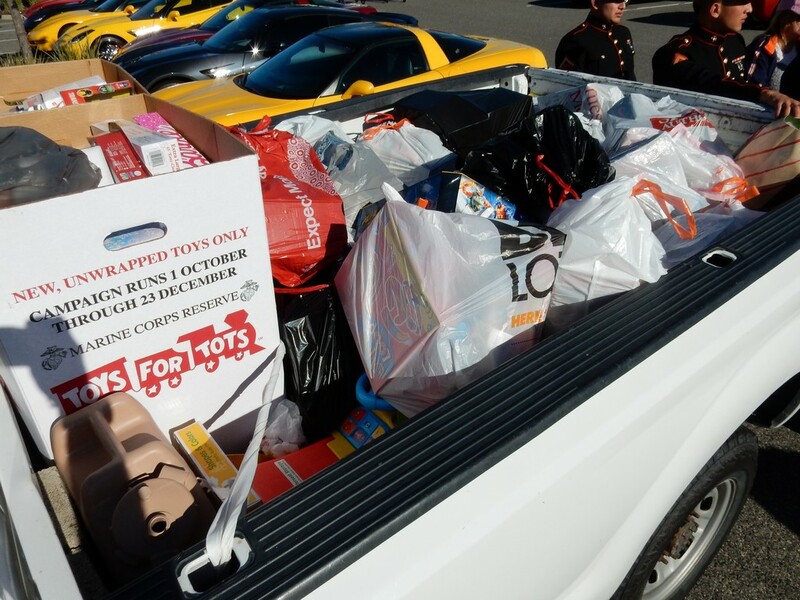 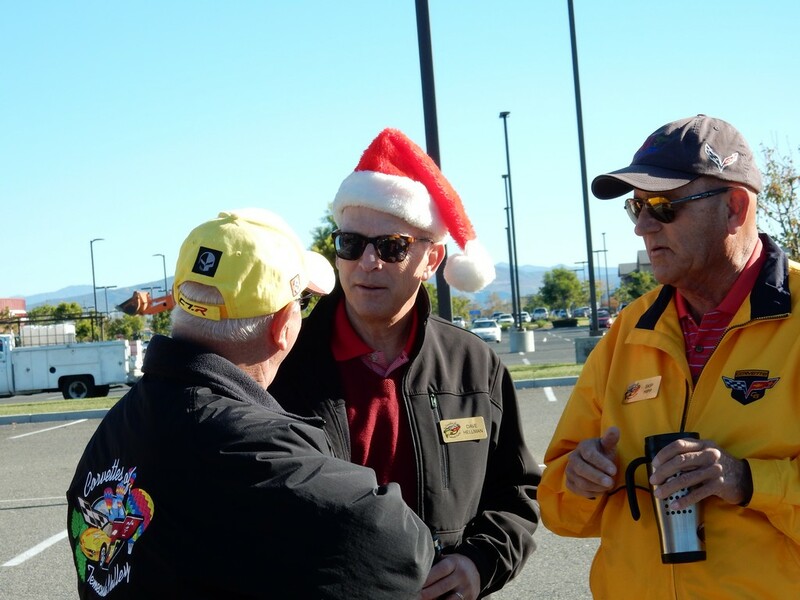 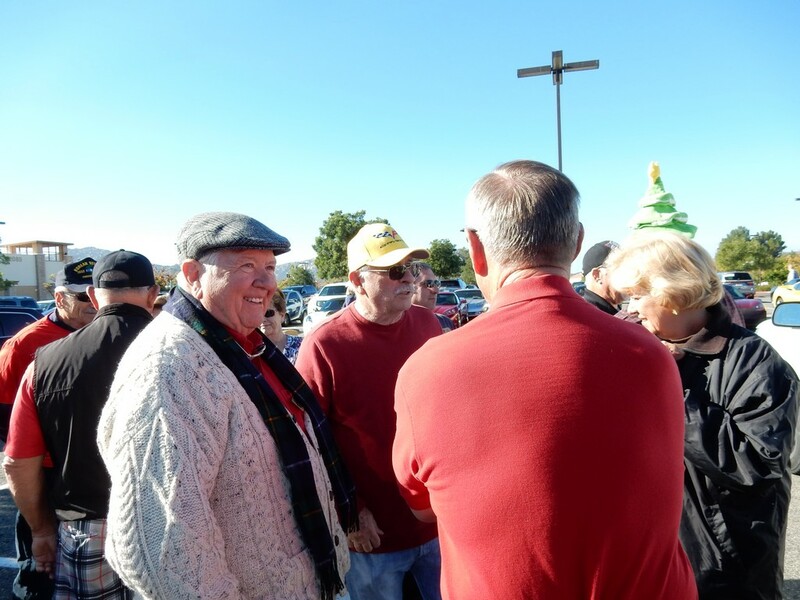 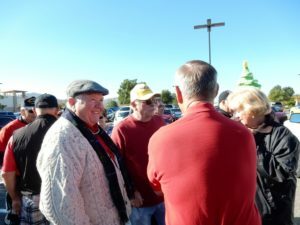 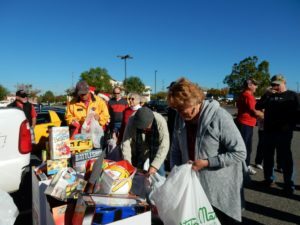 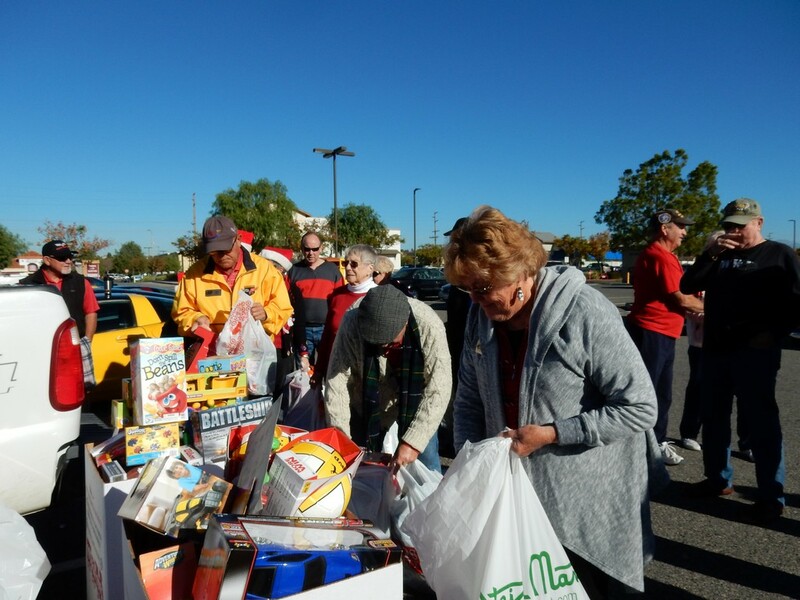 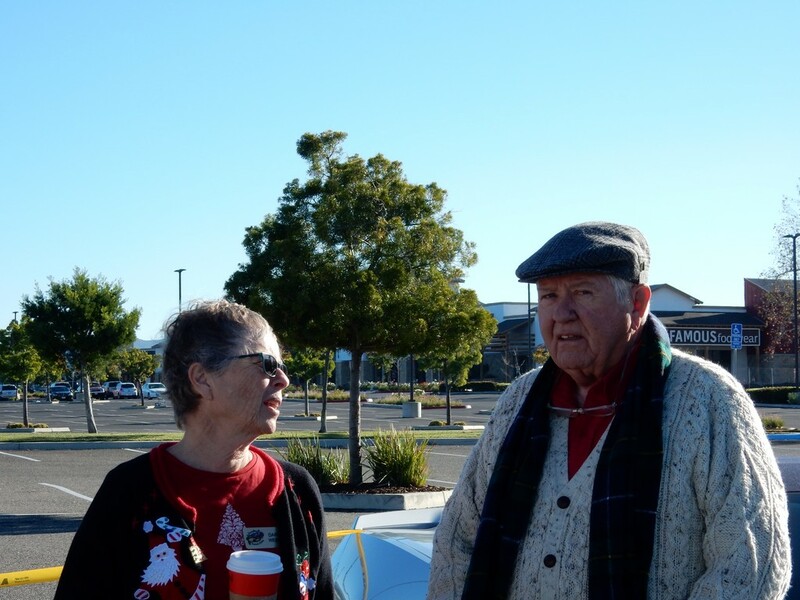 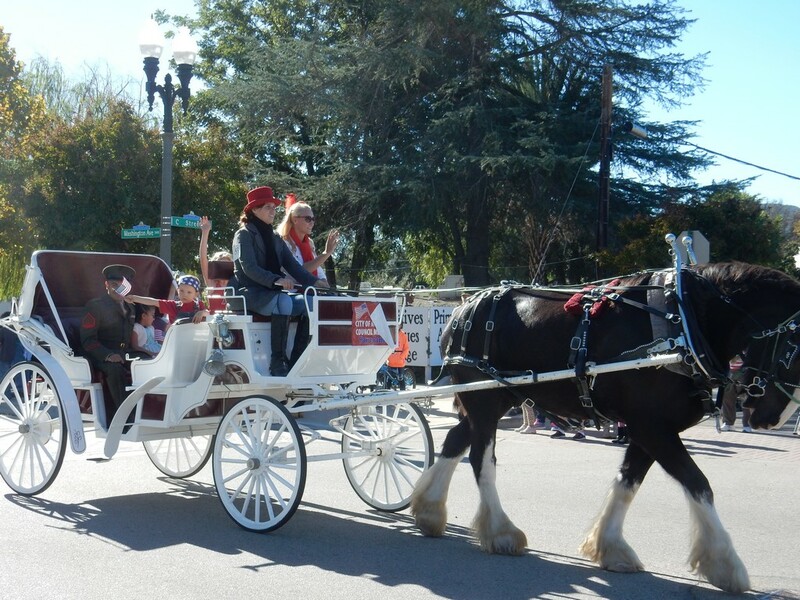 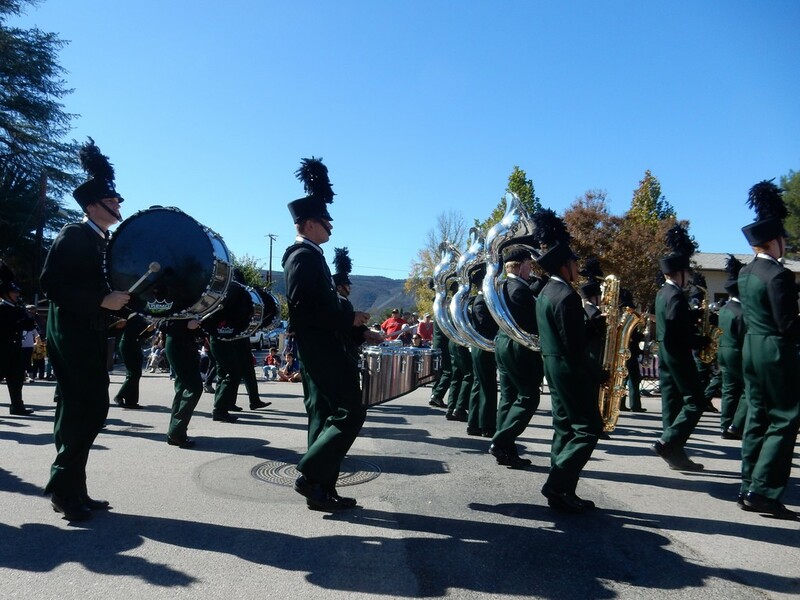 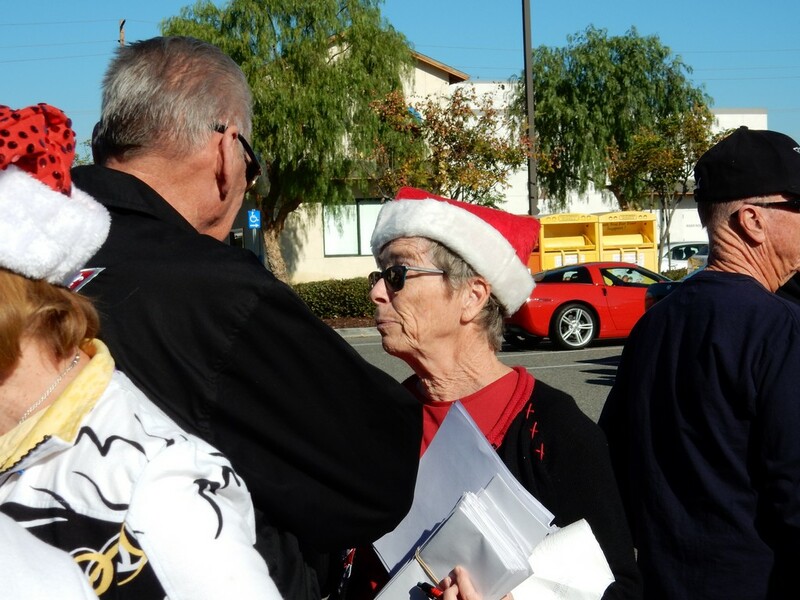 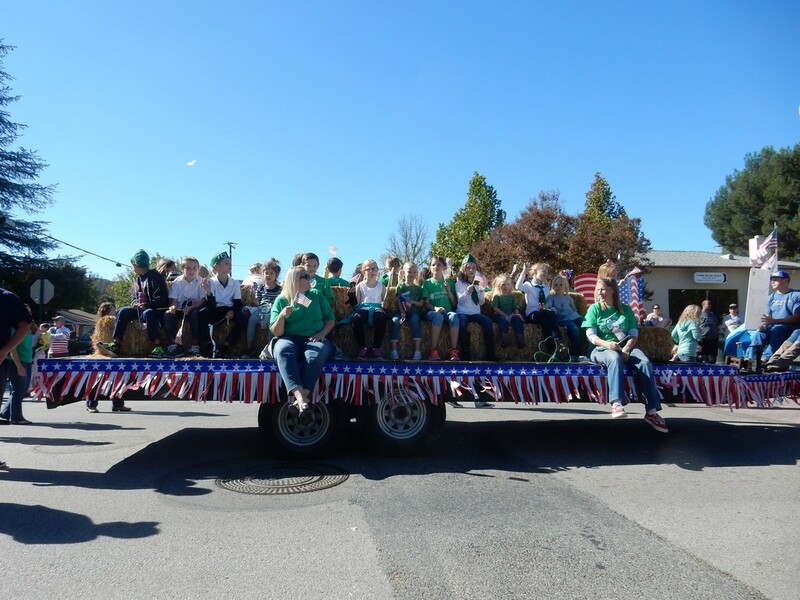 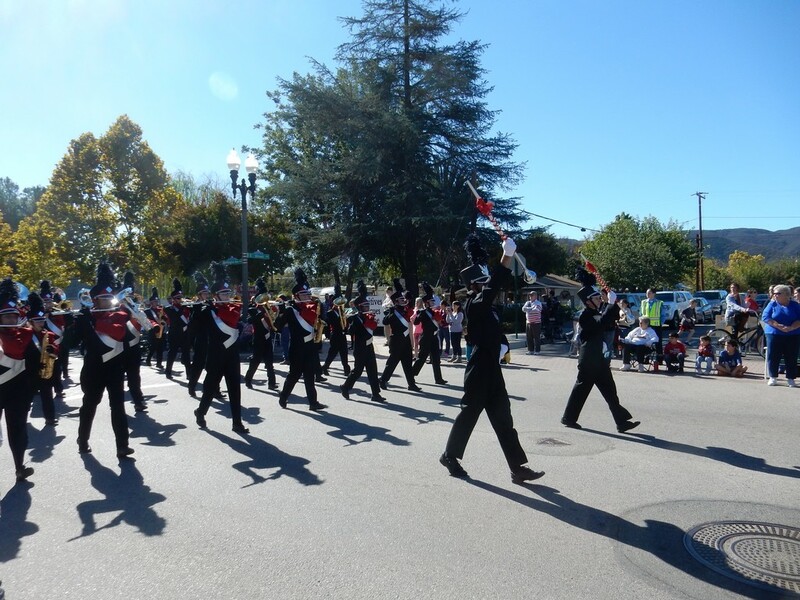 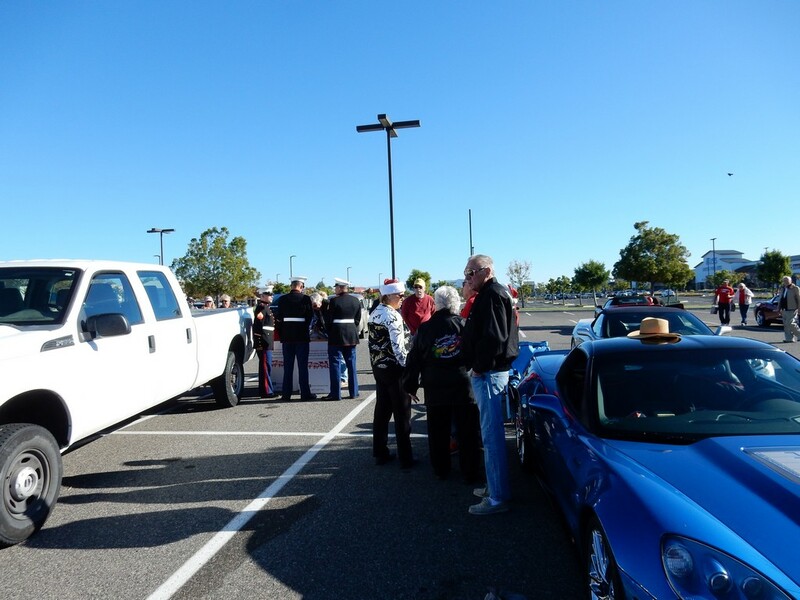 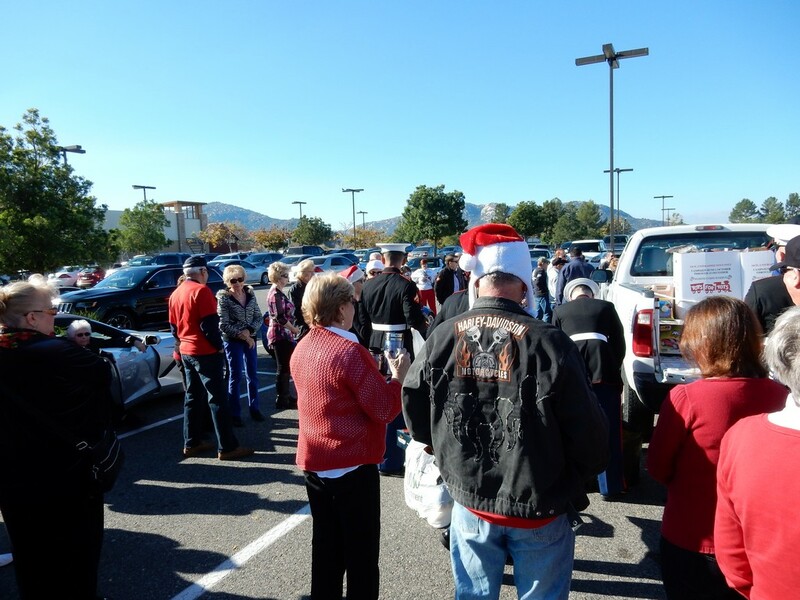 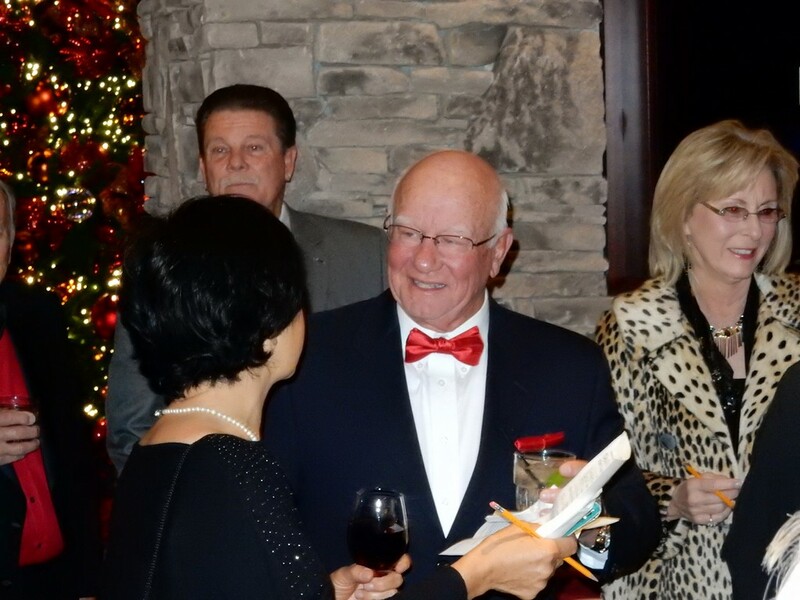 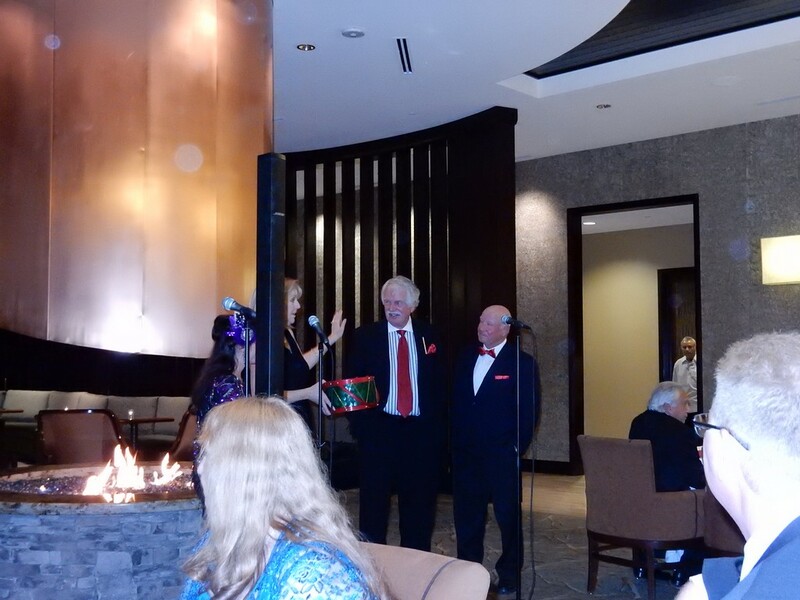 The 2015 finale of Toys for Tots and Food for COTV really showed the generosity of the Club. 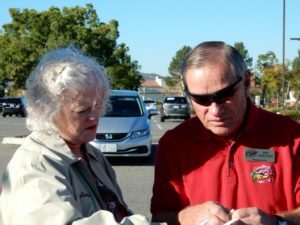 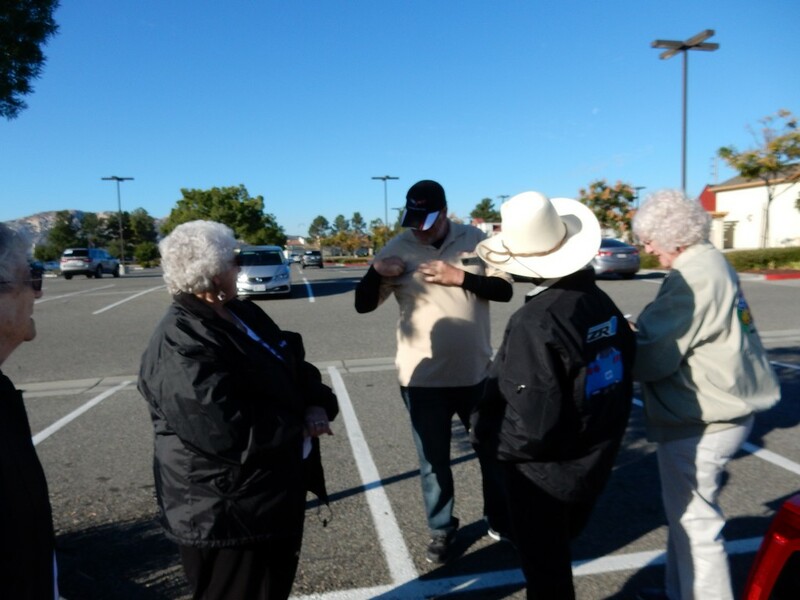 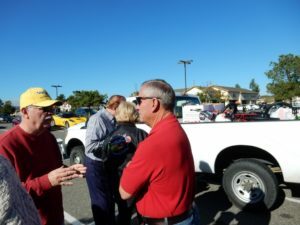 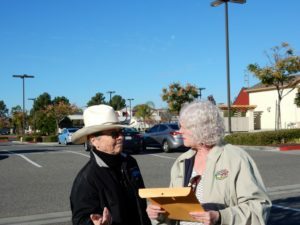 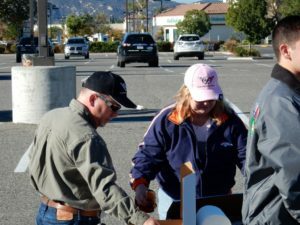 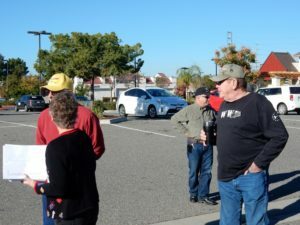 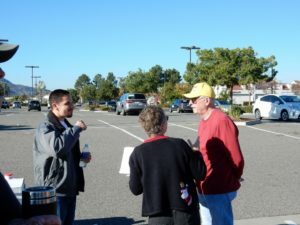 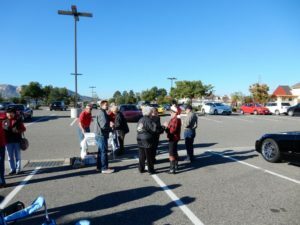 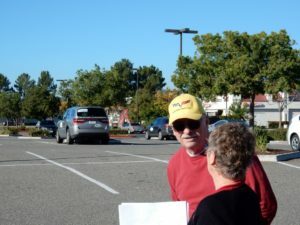 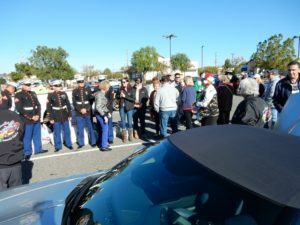 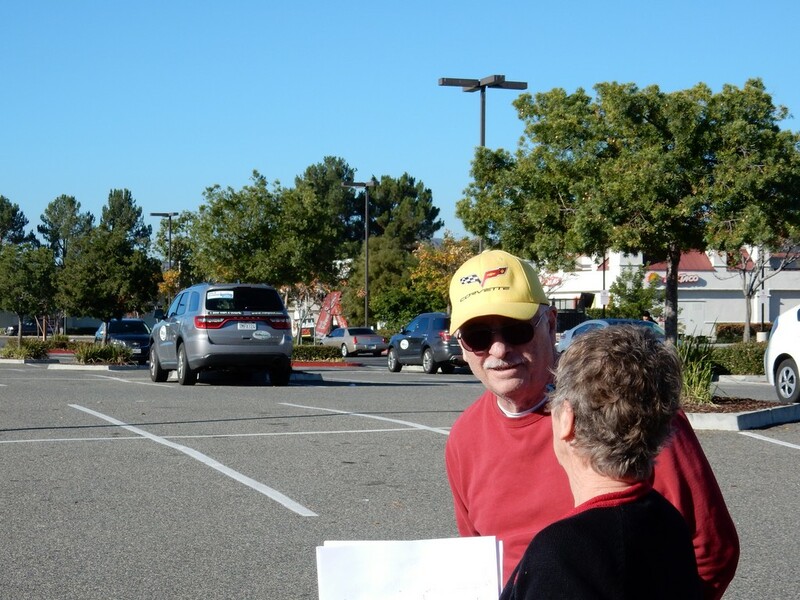 We had five, count them, five young marines from Camp Pendleton meet more than 75 COTV members at our usual stomping grounds at the Kohl’s parking lot from 9:30 to 10:30 on a crisp and clear December morning. 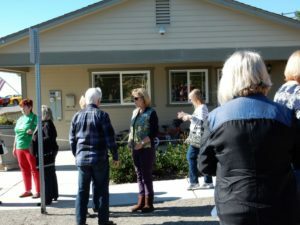 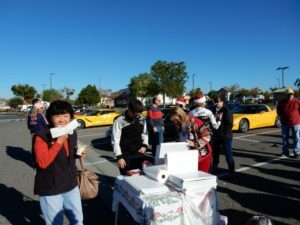 Sure, there were donuts for all, but we would like to think that it was the opportunity to give to those more in need than ourselves that drew such a large crowd. 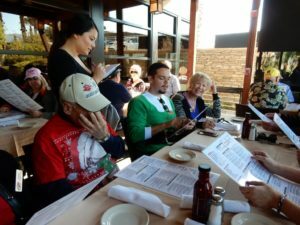 There were fancy hats and fancy sweaters, although Tyler Fox may win the big prize in the Dress Like an Elf contest since he had on a fantastic sweater, which he later shed to reveal another fantastic seasonal T-shirt. 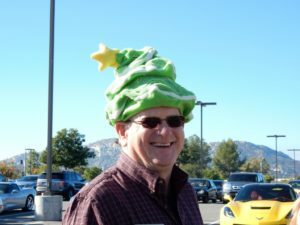 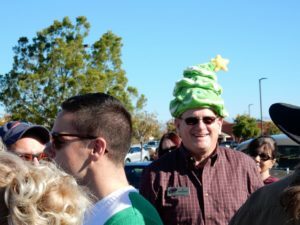 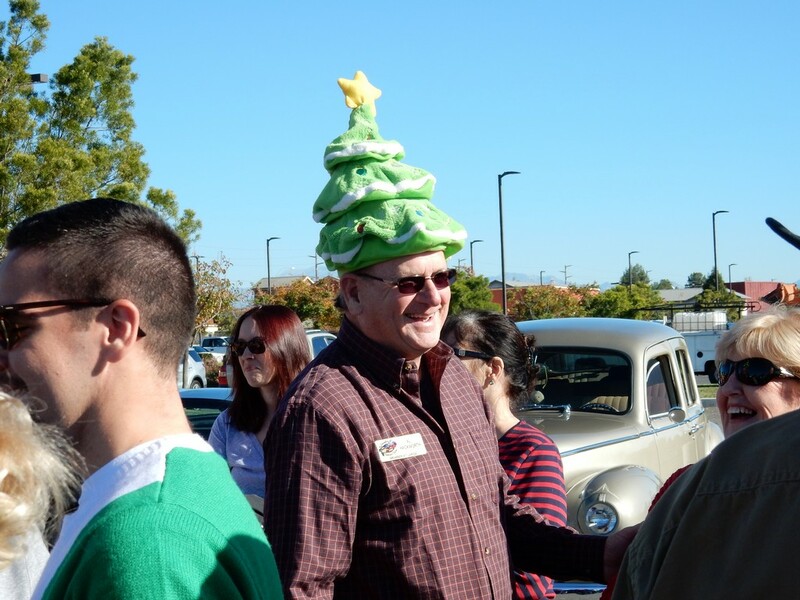 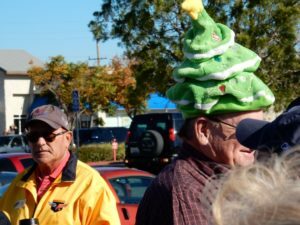 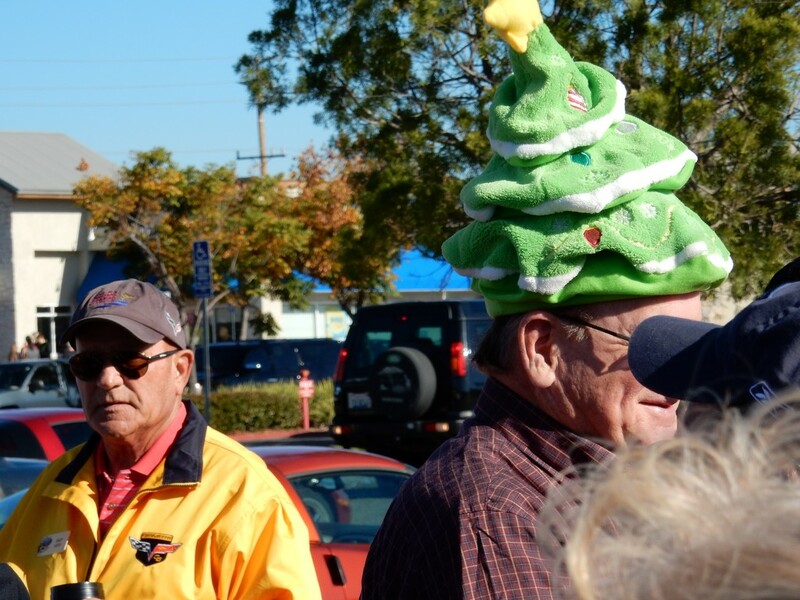 Al Hackworth is hard to beat in the creative headgear department and his animated Christmas tree hat was a clear winner as well. 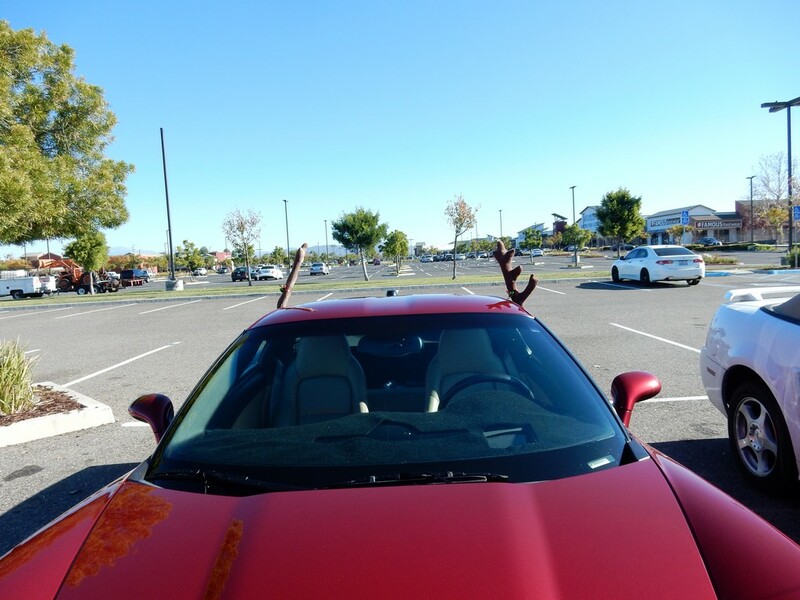 But who’s judging??? 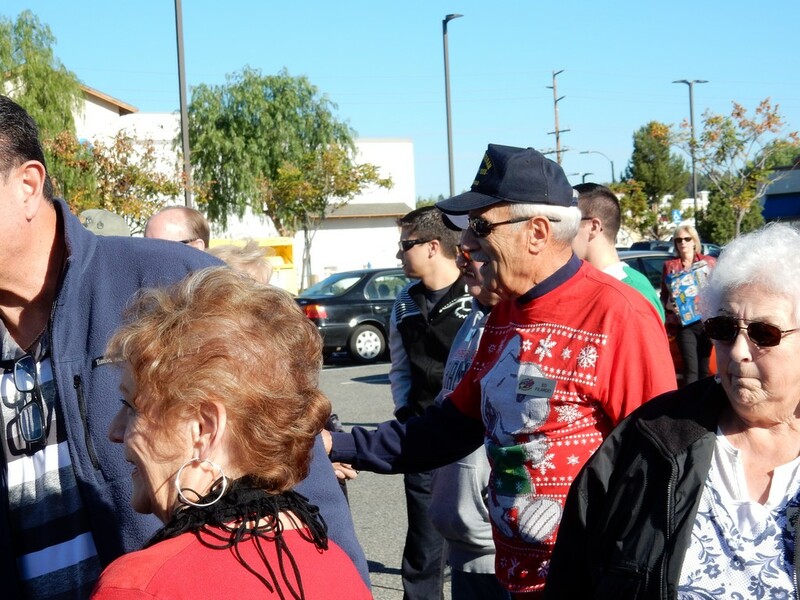 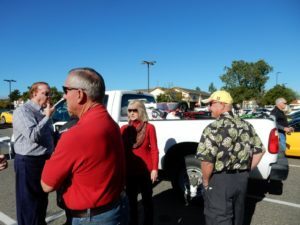 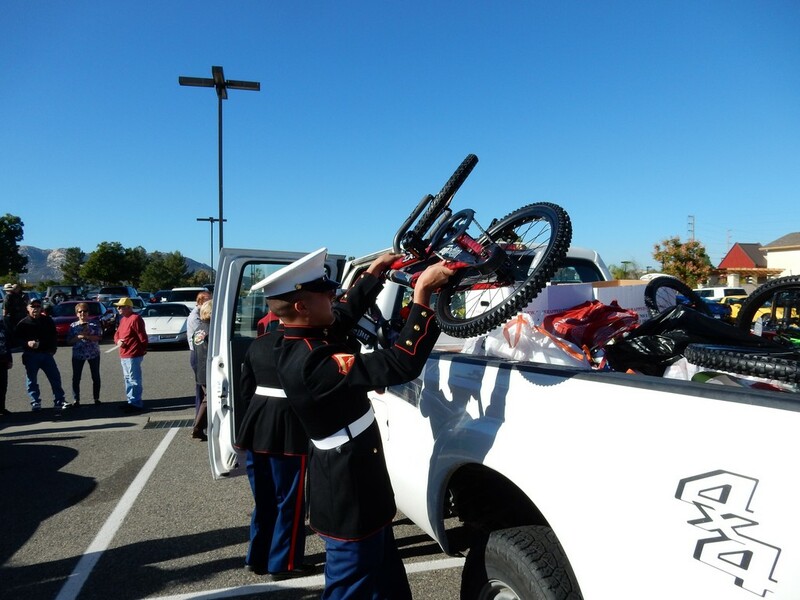 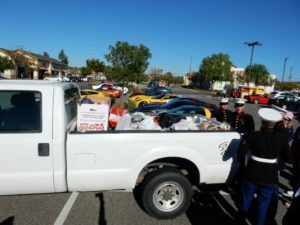 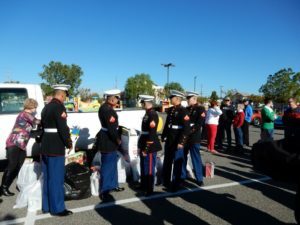 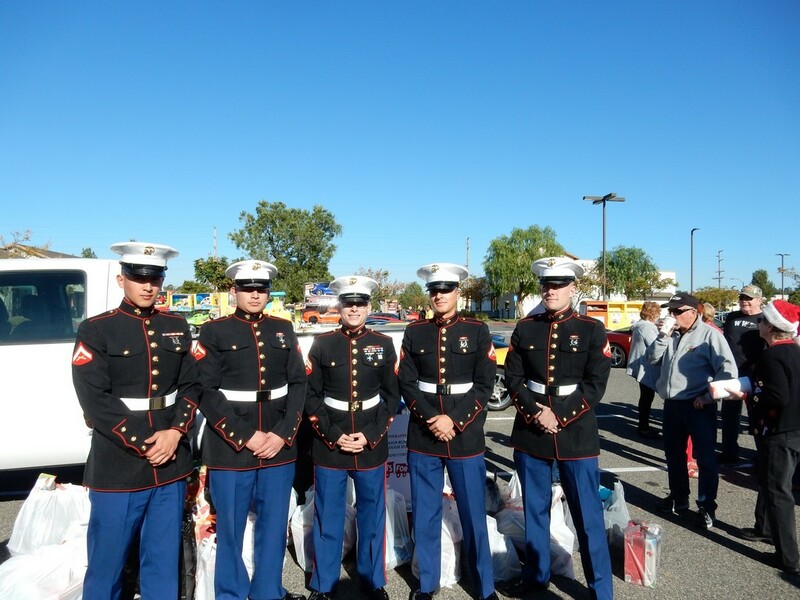 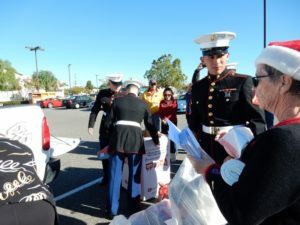 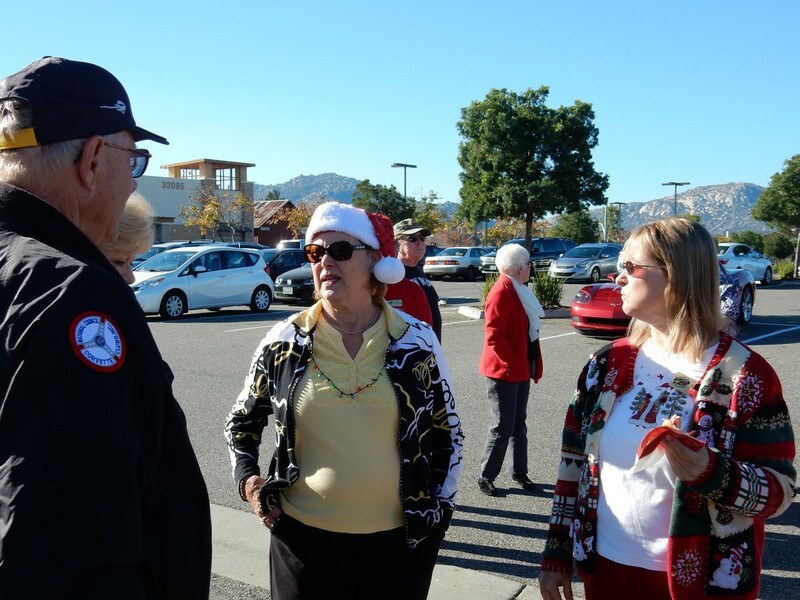 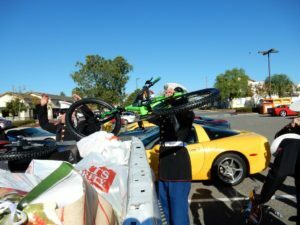 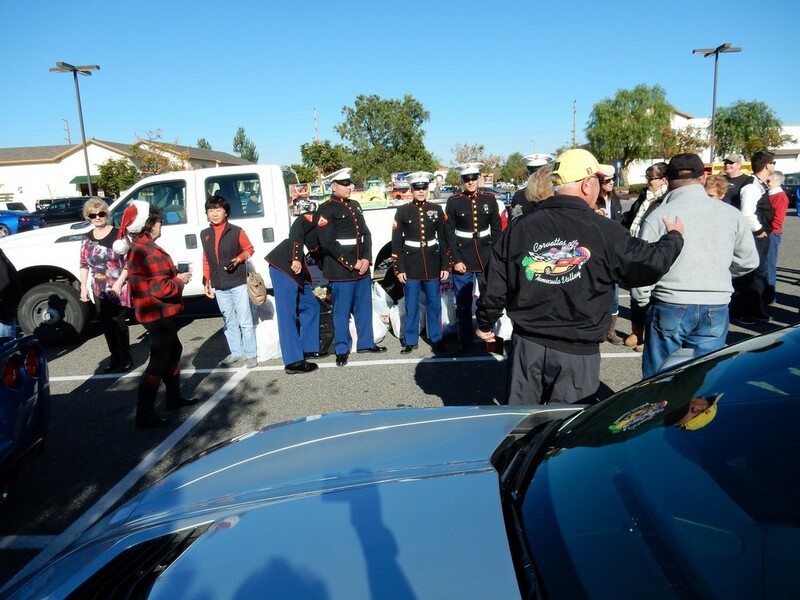 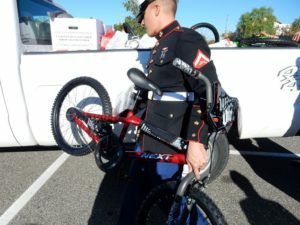 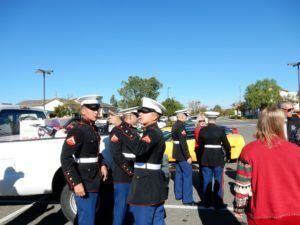 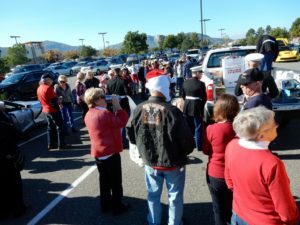 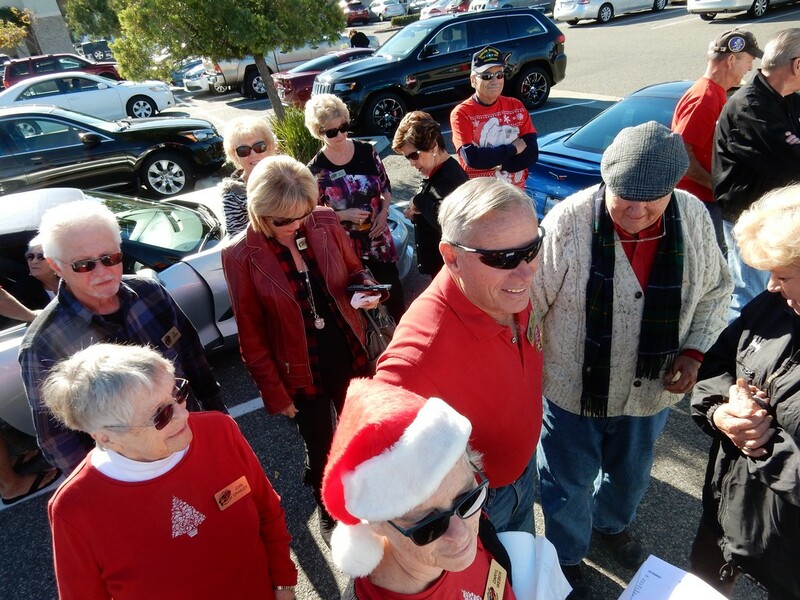 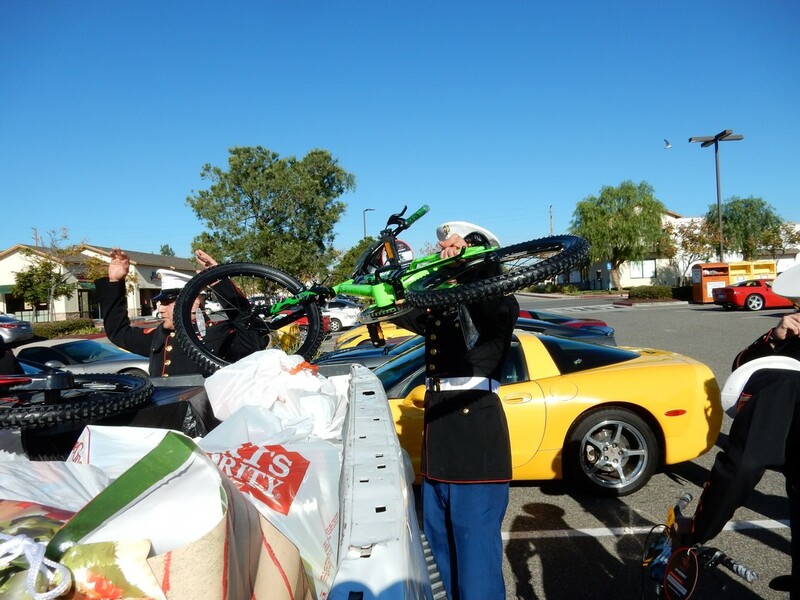 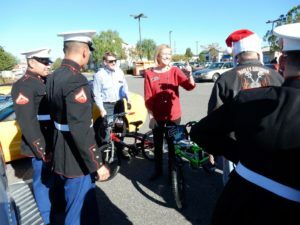 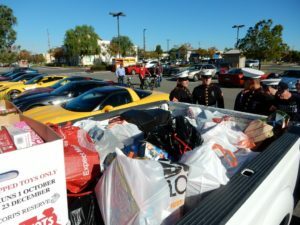 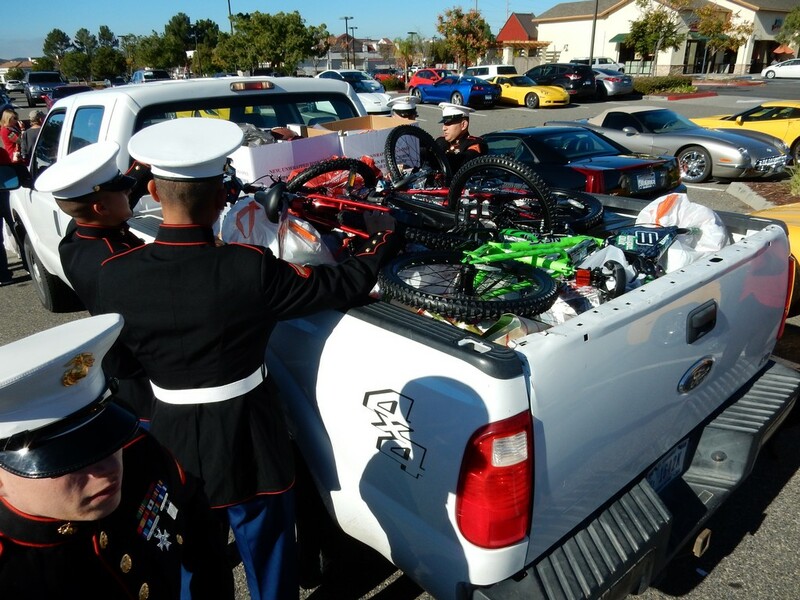 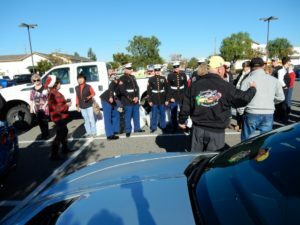 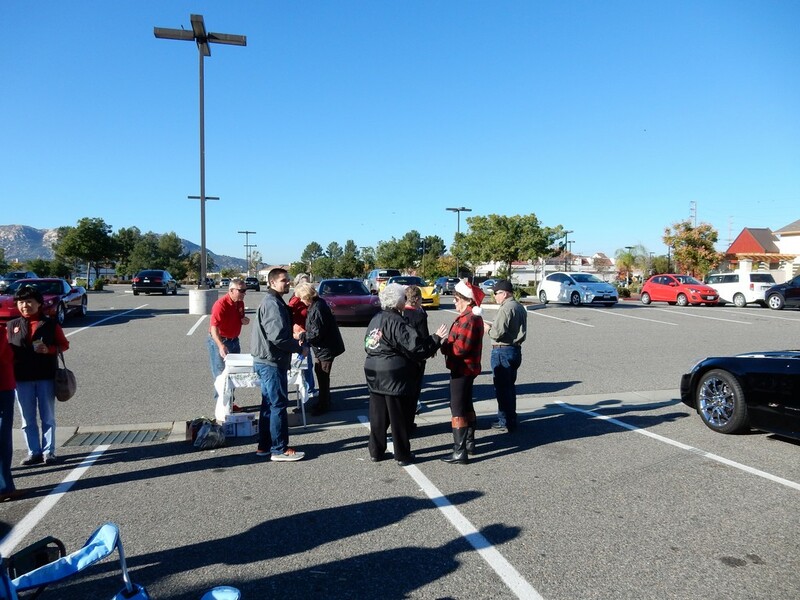 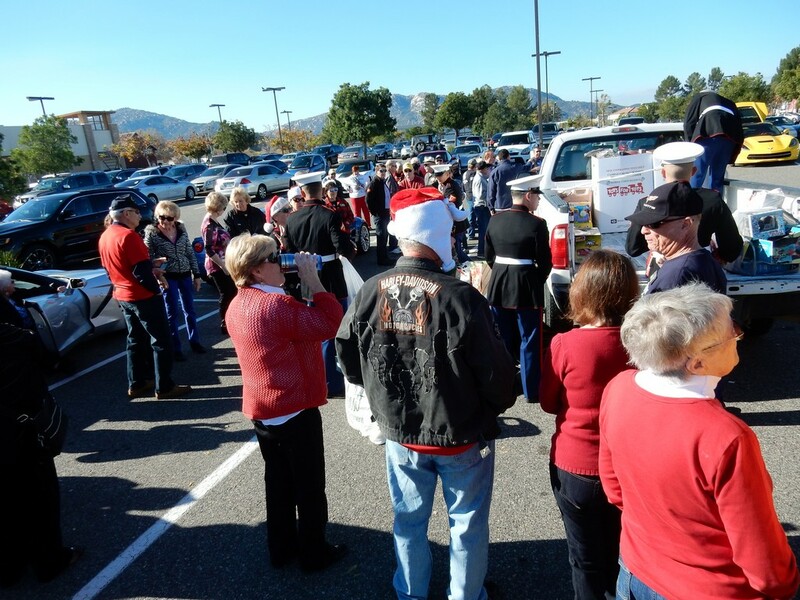 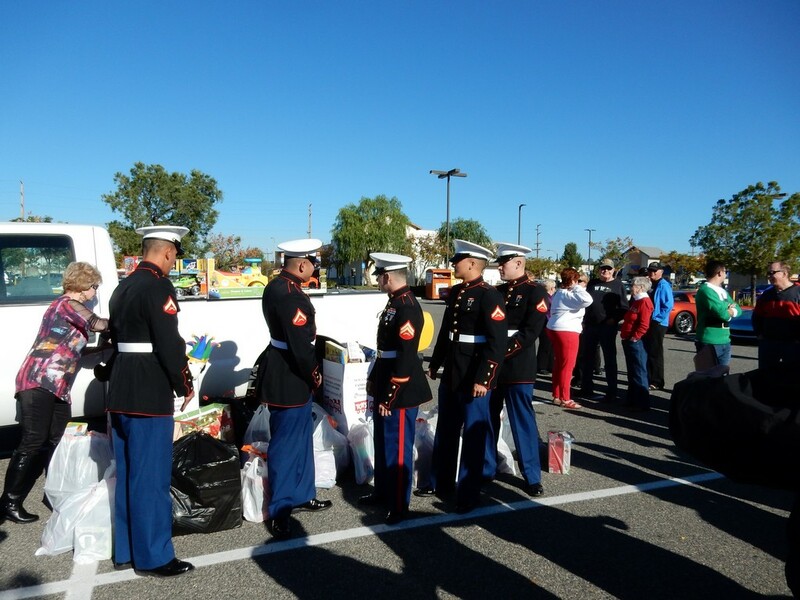 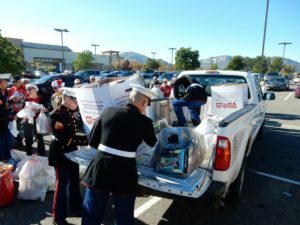 The Marines, in full dress uniforms, arrived from Camp Pendleton in a Government issue pick-up, which was barely large enough to contain the multitude of gifts donated by our generous members. 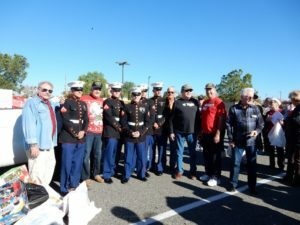 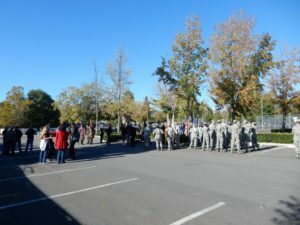 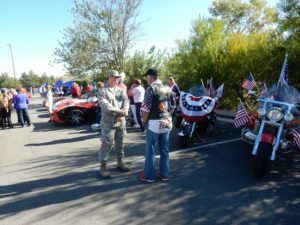 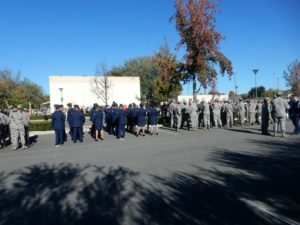 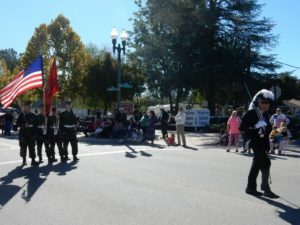 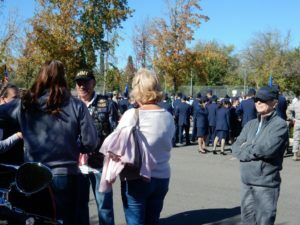 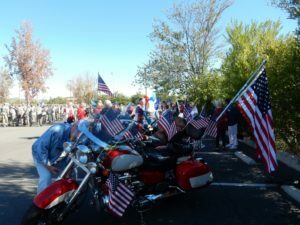 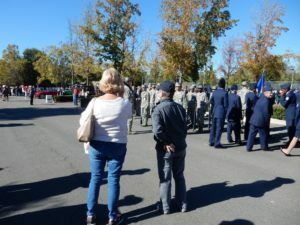 They shook hands with everyone who thanked them for their service and had their photos taken with many of the members, as well as a group shot with the veterans in our group who were present. We all bagged and stacked all the toys in the back of the pick-up so that they would not fly out on the freeway on the way back to base. 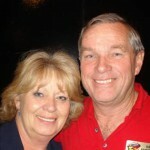 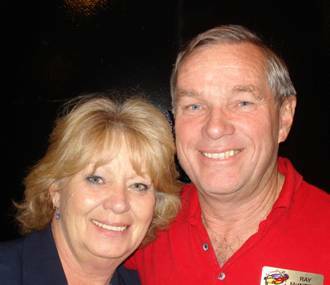 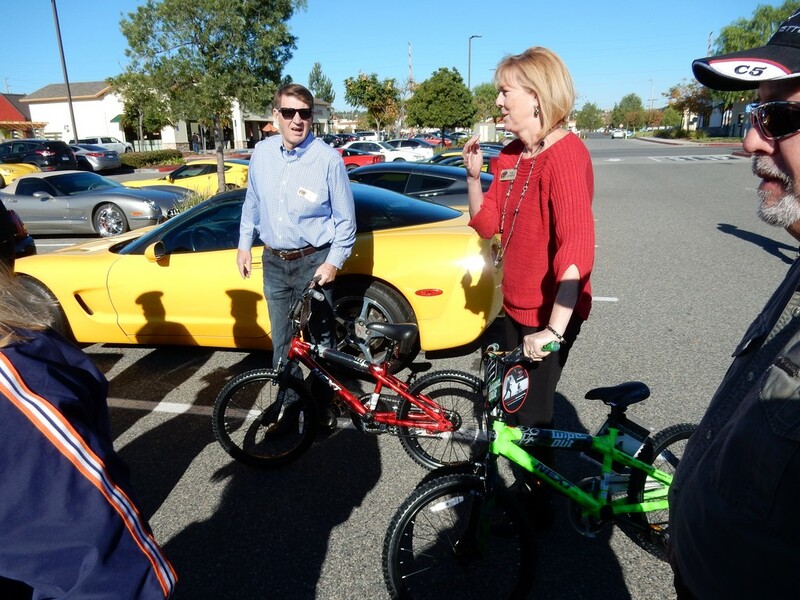 The crowning touch was the three bicycles donated by Al and Vickie which we used to anchor all the donations. How incredibly generous of the Hackworths!! The Marines said this was the most successful event they had been to this year and asked if they could come back again next year, so hopefully even more of our members will have the pleasure of meeting them in 2016. 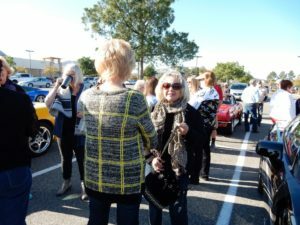 At 10:30, the truck departed and the 50+ foodies departed for a short-ish (after September and November, 60-75 minutes on the road is short!) 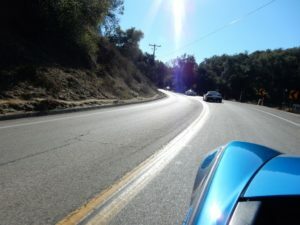 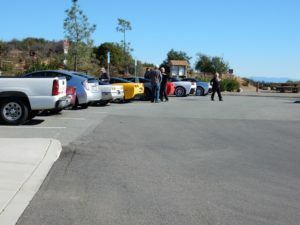 lunch run “over hill and over dale” through the beautiful countryside of De Luz and the Santa Rosa Plateau and then onto the freeway for some relief from the hills and curves to stretch the Corvettes’ legs. 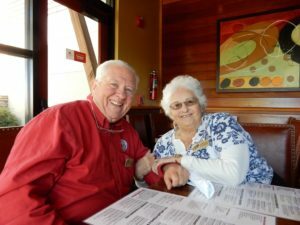 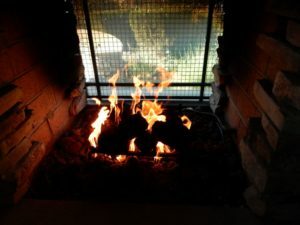 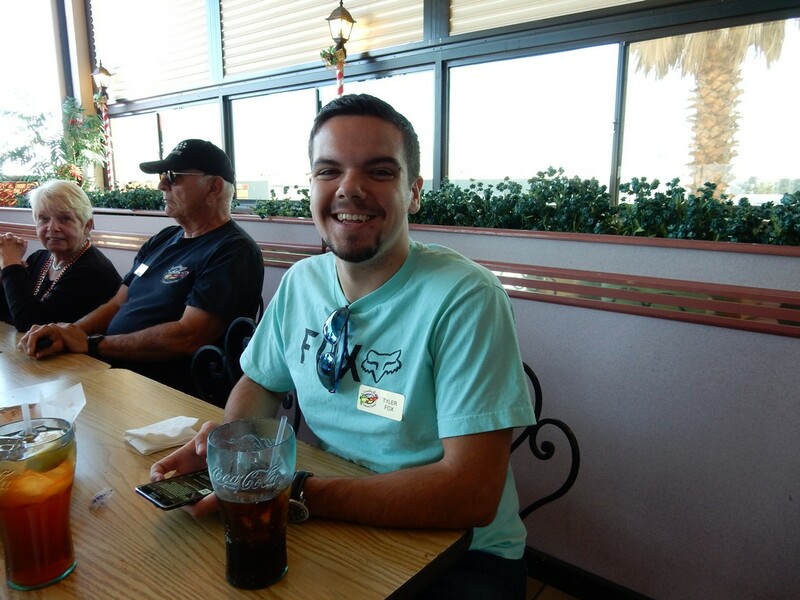 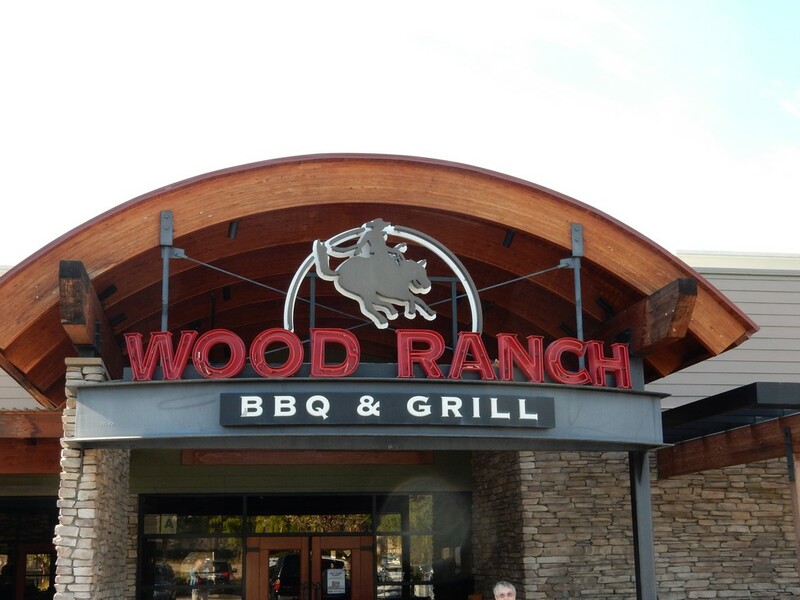 The destination was the Wood Ranch BBQ in the Dos Lagos shopping center. Every now and then we have to head north instead of south on these runs! 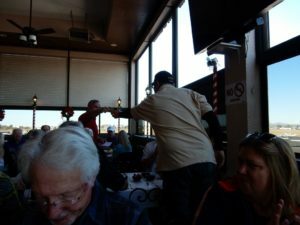 We had 40 in the View Room and the overflow at a table with a view just inside. 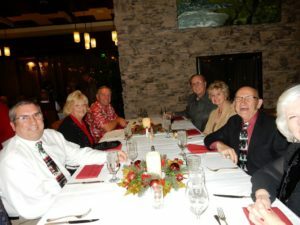 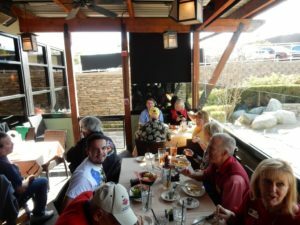 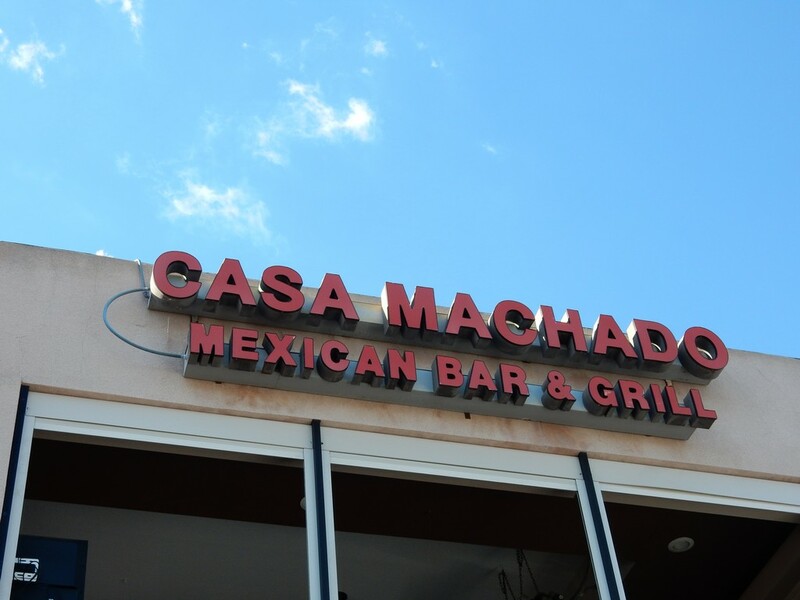 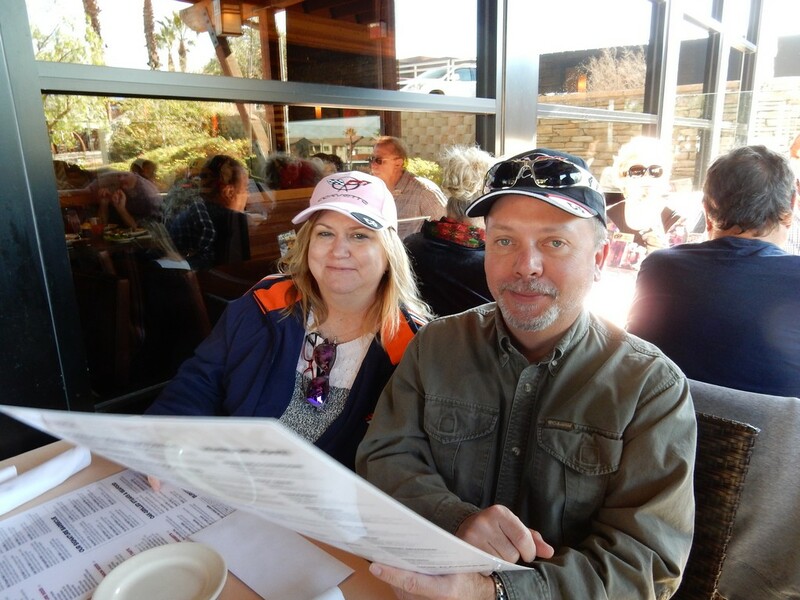 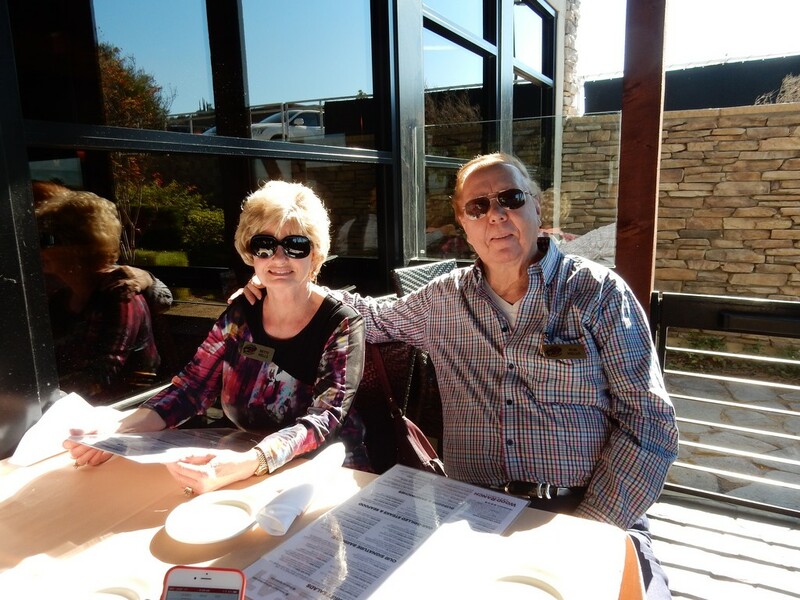 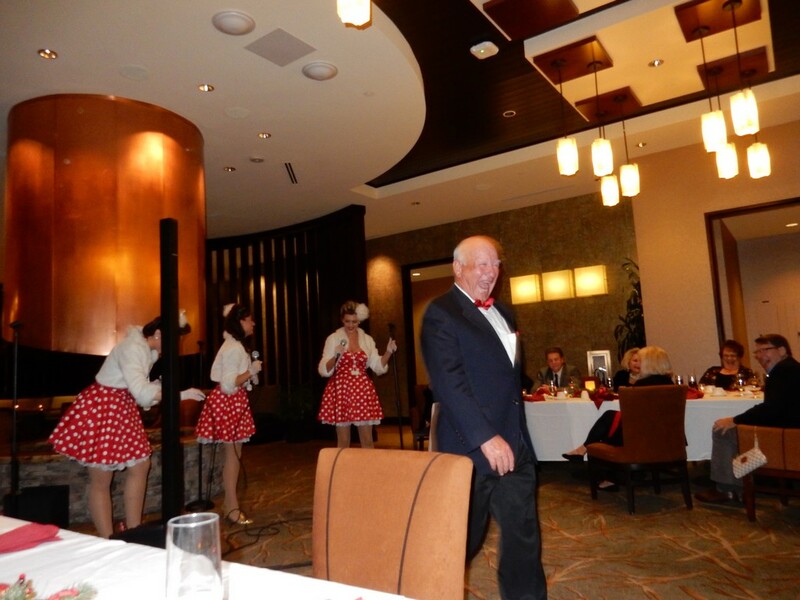 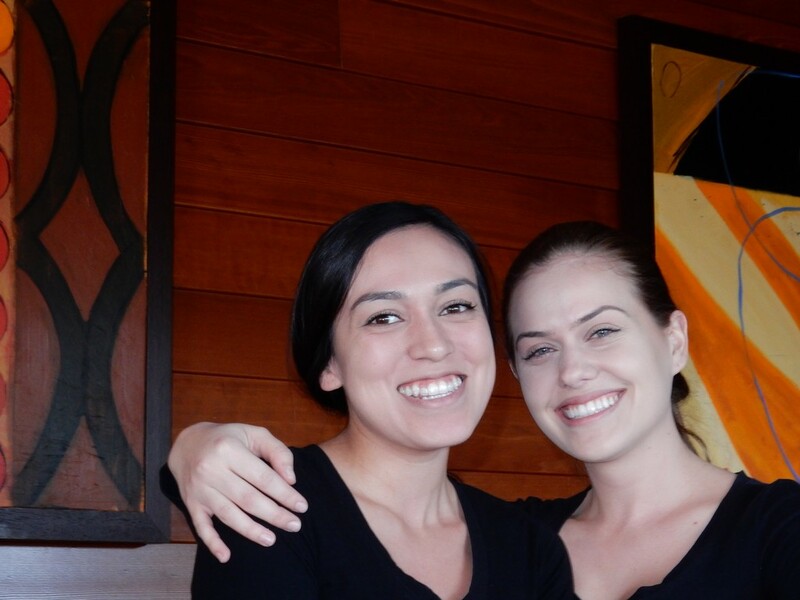 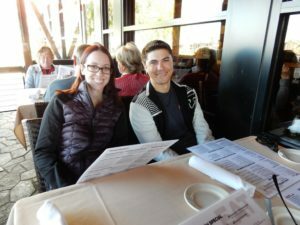 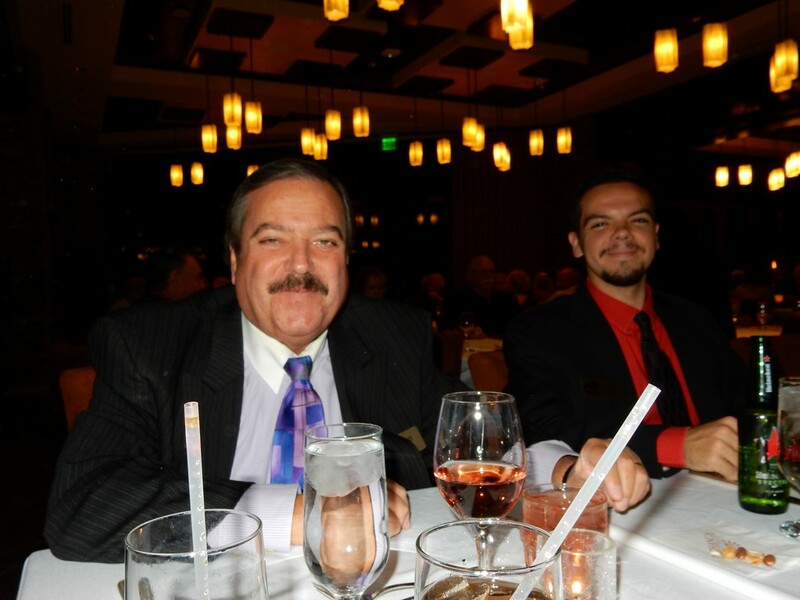 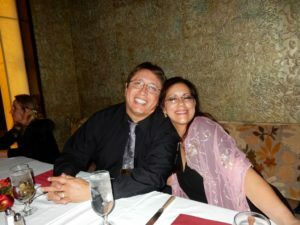 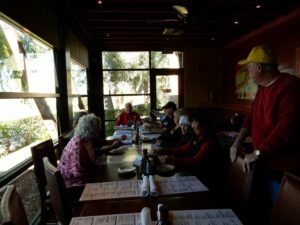 The team at Wood Ranch gave the group excellent service and everyone seemed to enjoy the variety of the menu. 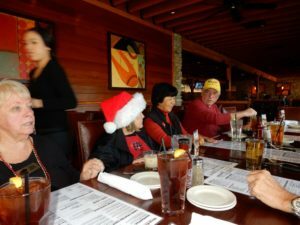 The Wood Ranch manager asked that we come back next year. 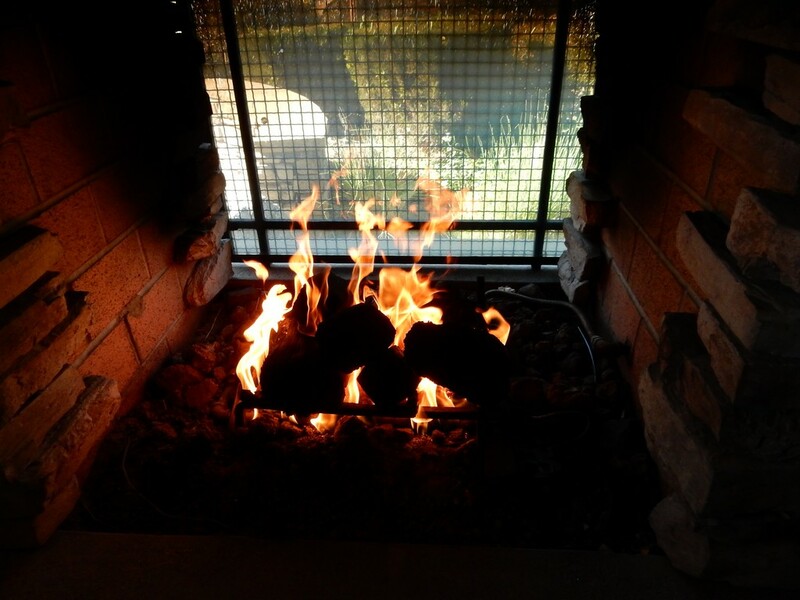 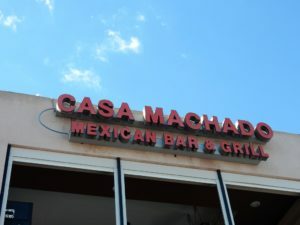 If you are looking for barbecue for a meal, remember how nice this one was and keep Wood Ranch on your list of possibilities. Best wishes to all for the rest of the Holiday Season and looking forward to a wonderful year for COTV in 2016! And who among us will ever forget……..
Who were those strangers, all “duded up” for the holidays? 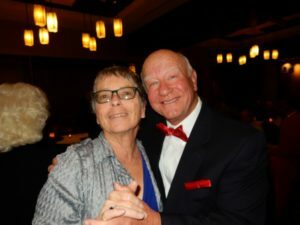 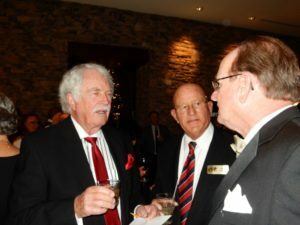 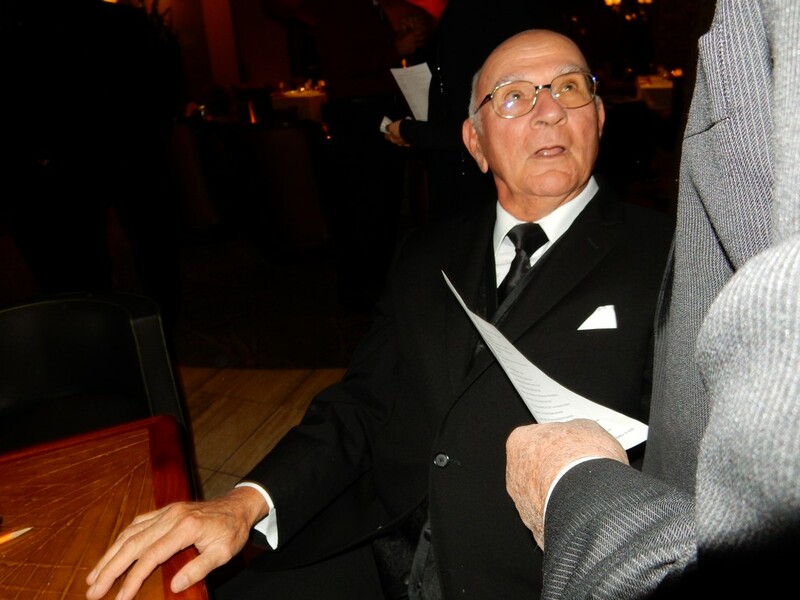 So many tuxes, suits and dresses, instead of jeans and shorts; so much glamour, instead of the same old same old; so many good looking folks – who were they? Well, the answer is they were about 95 of your fellow COTV members celebrating the holidays together as we do every year. 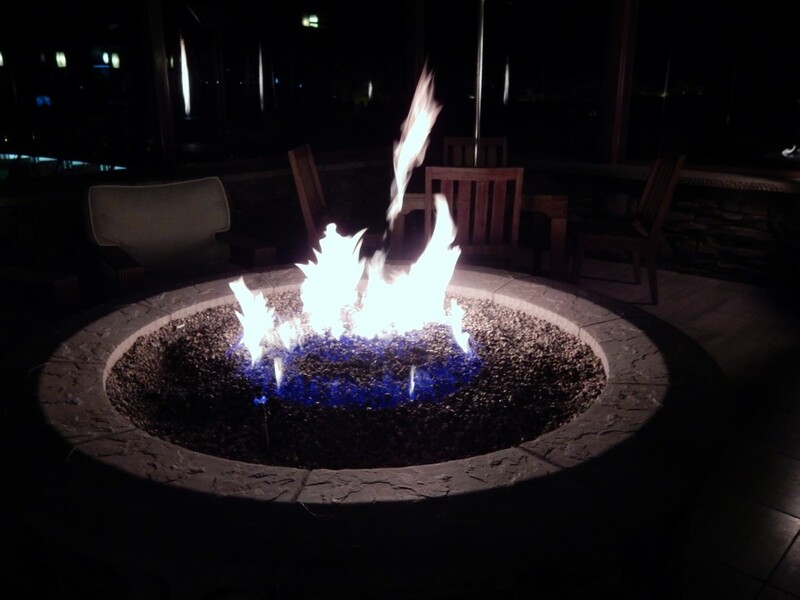 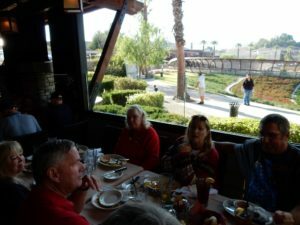 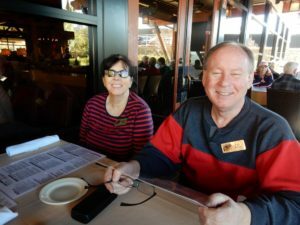 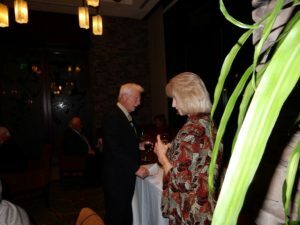 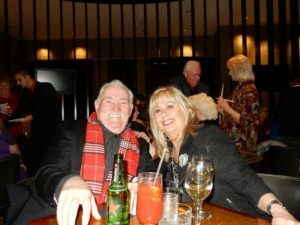 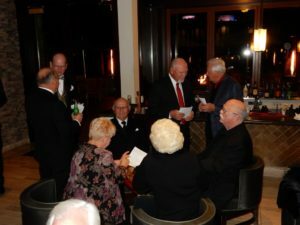 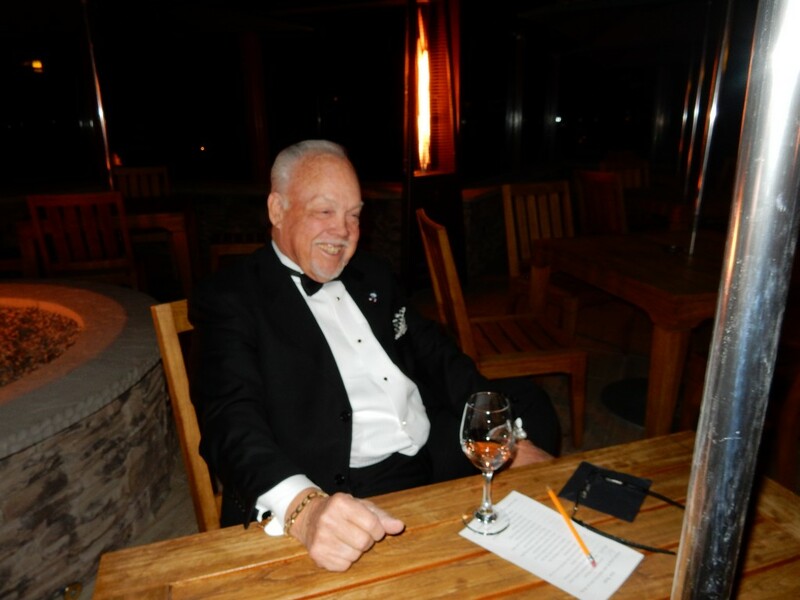 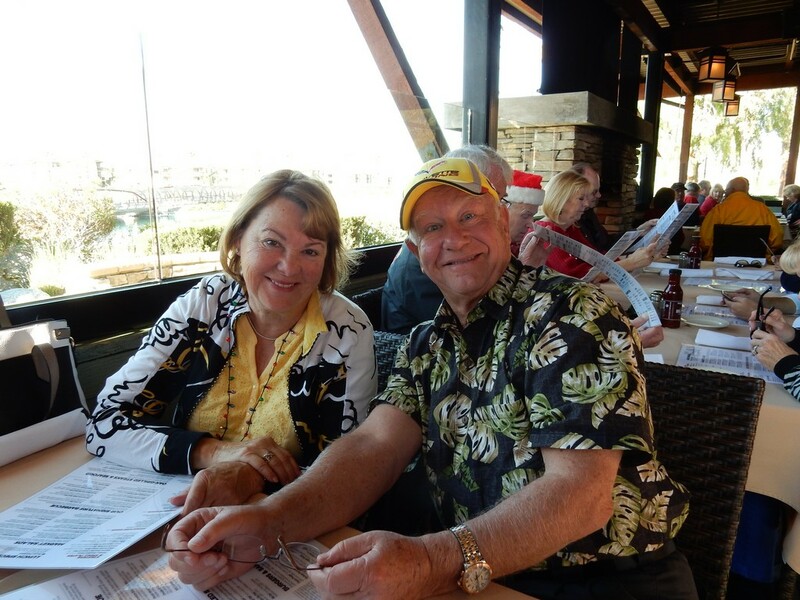 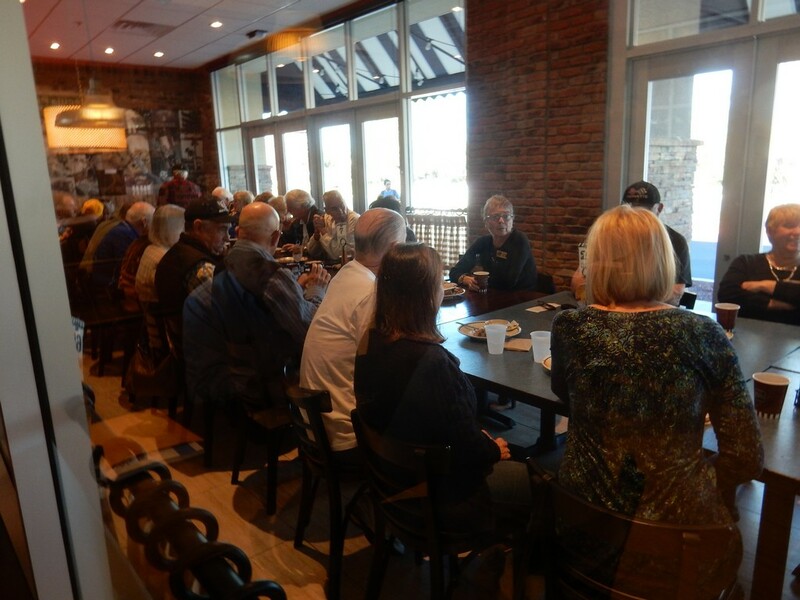 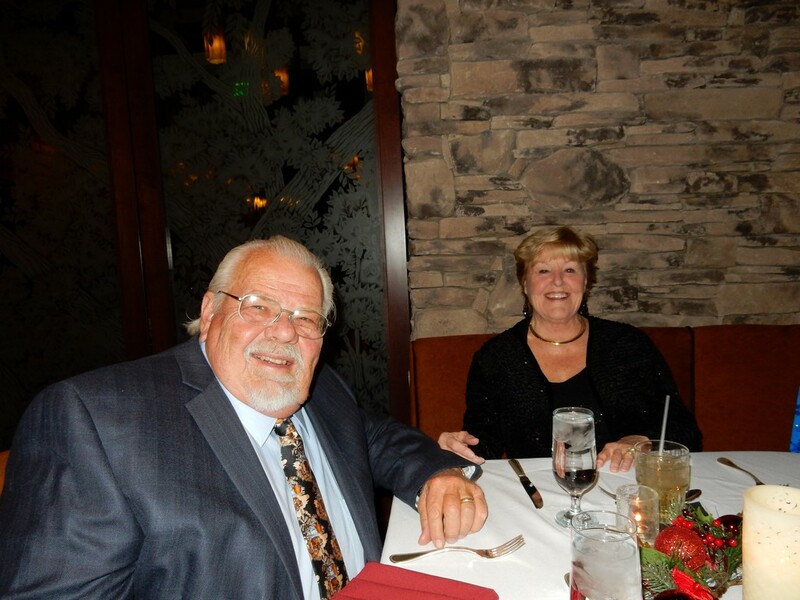 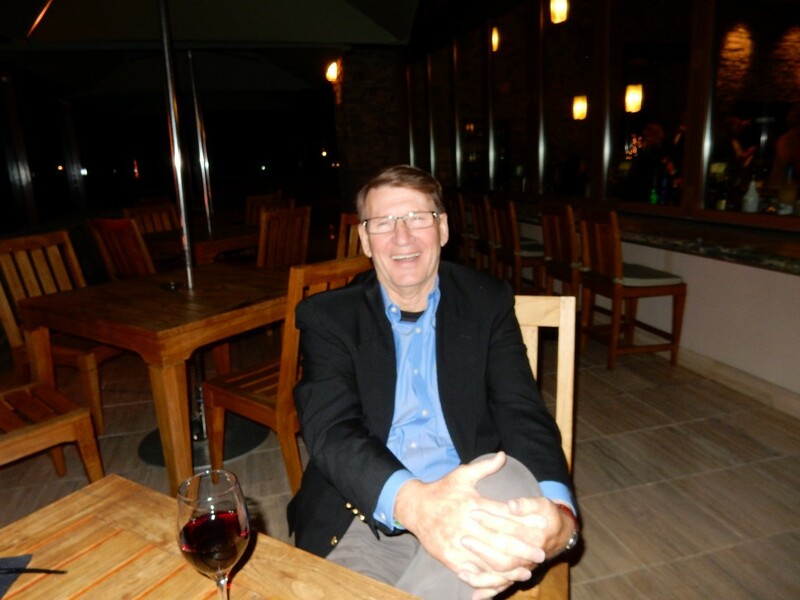 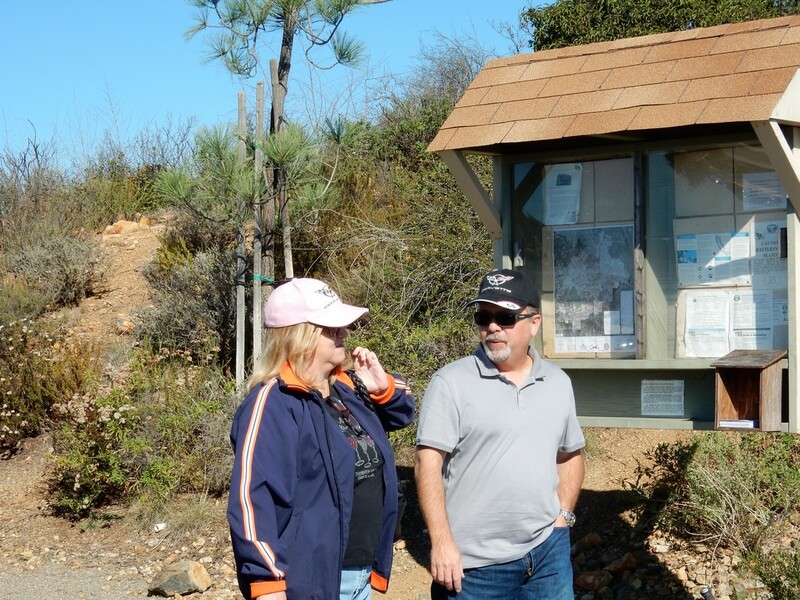 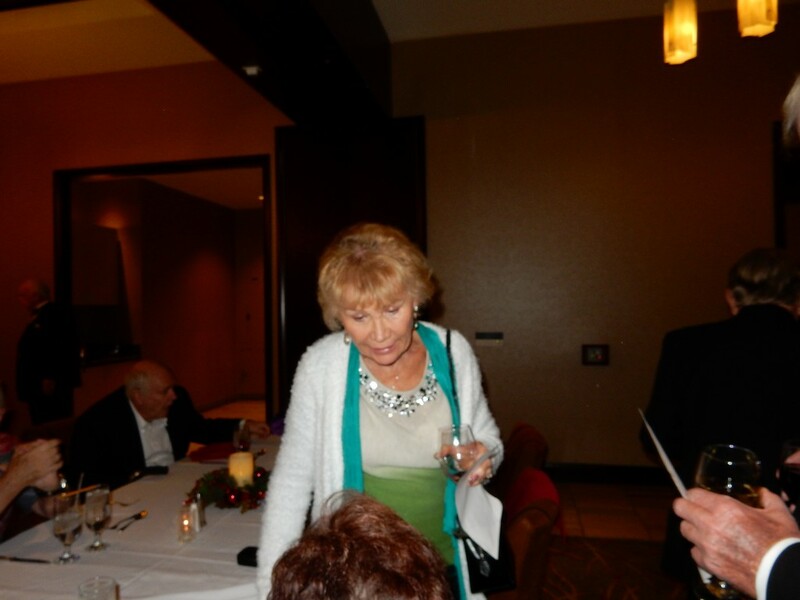 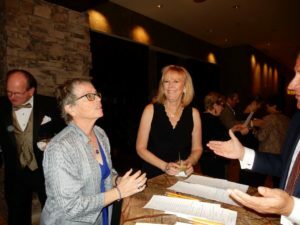 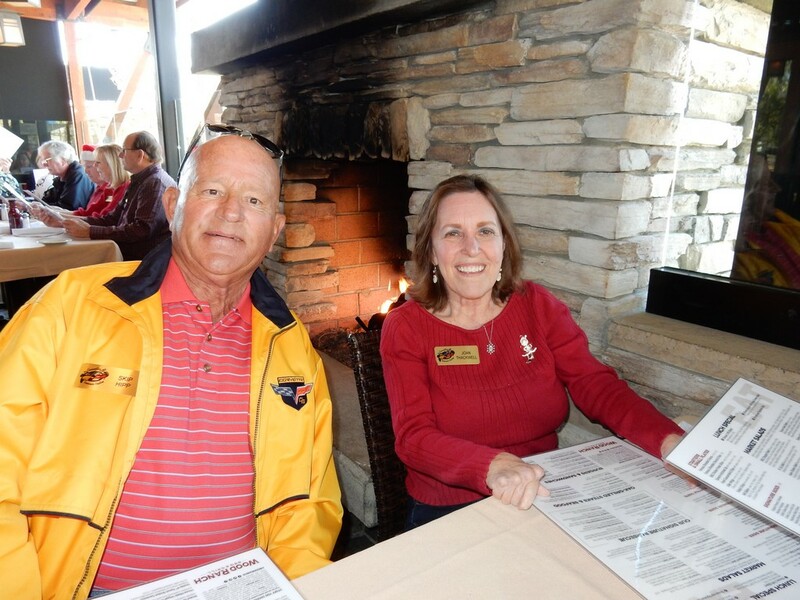 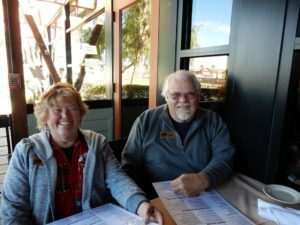 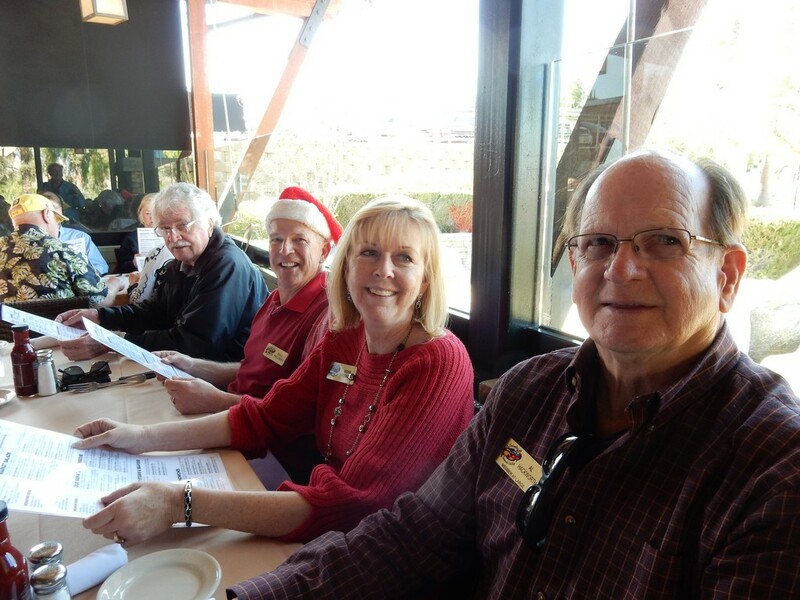 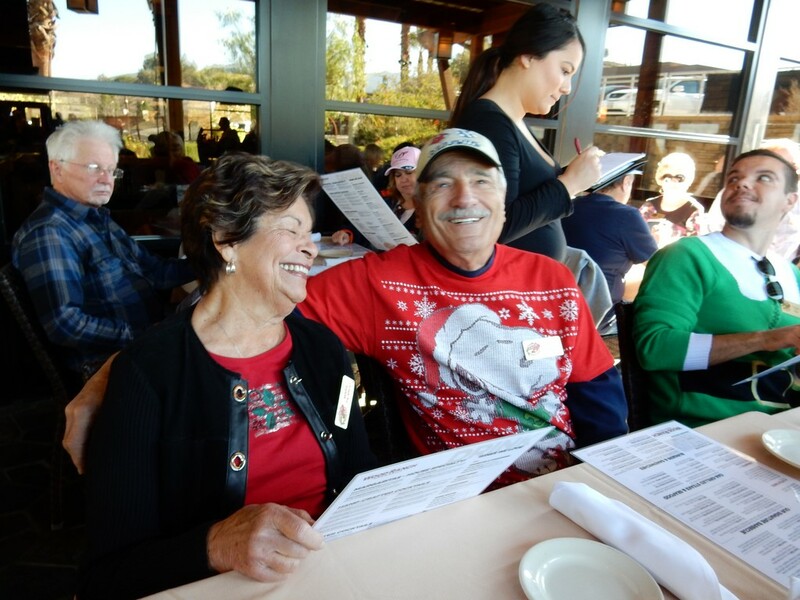 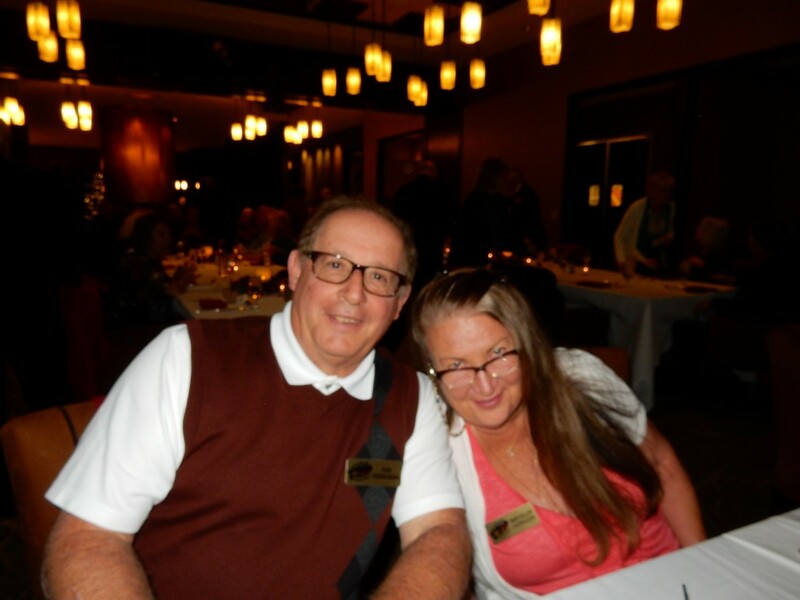 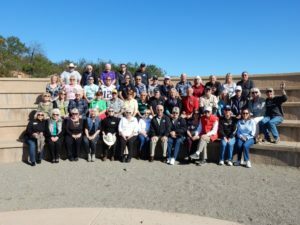 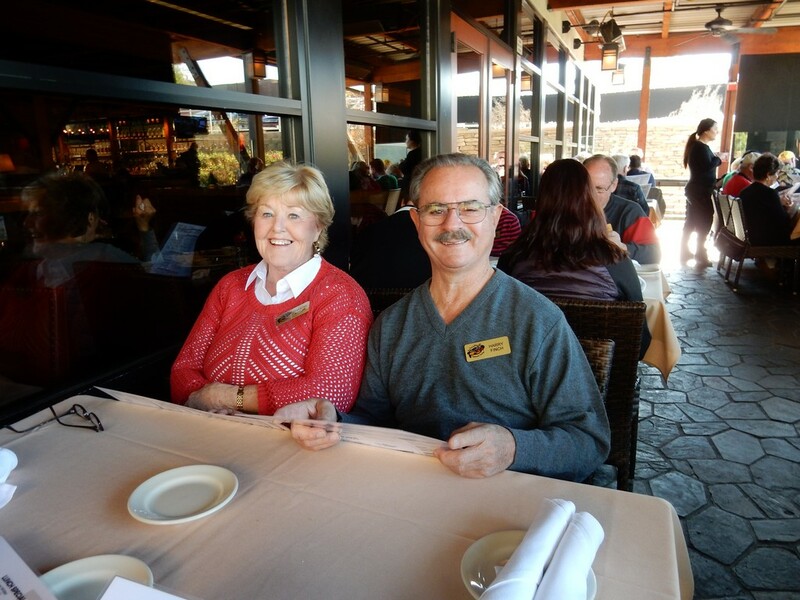 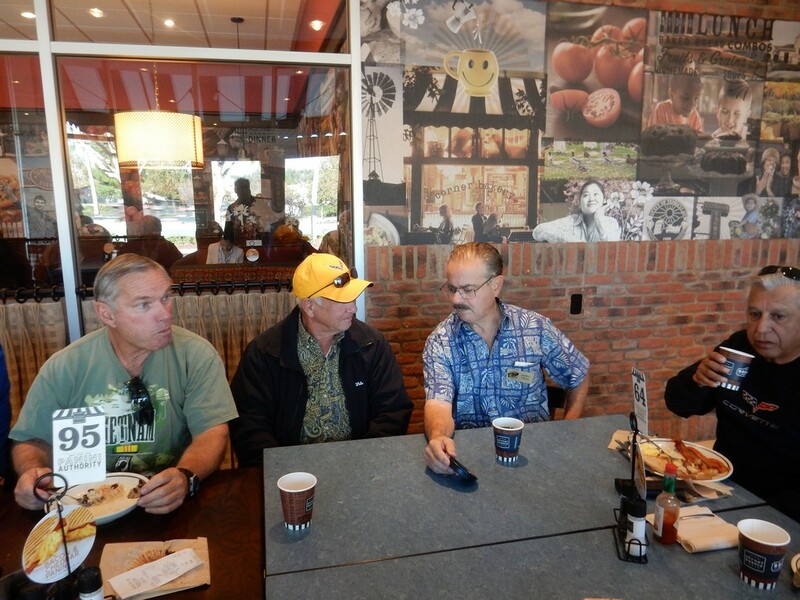 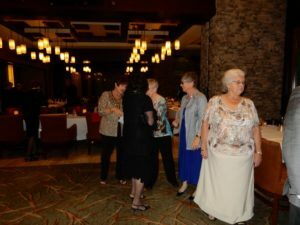 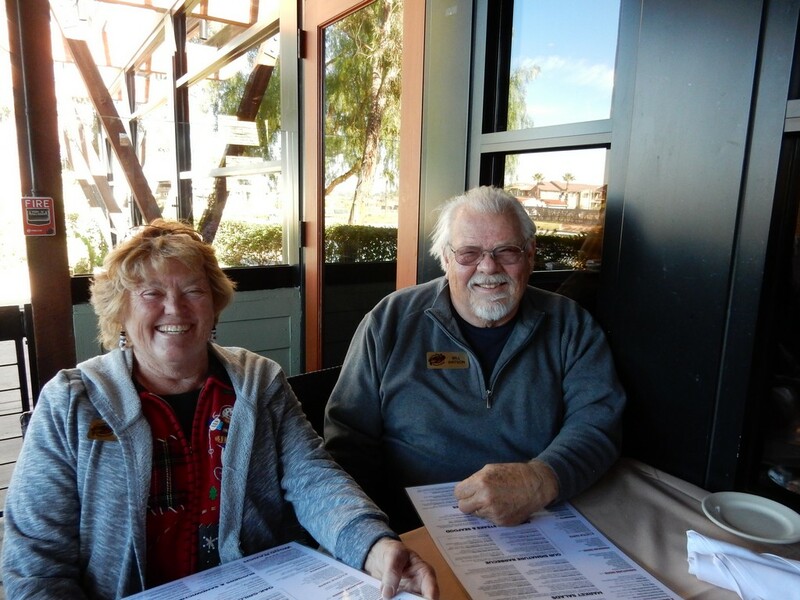 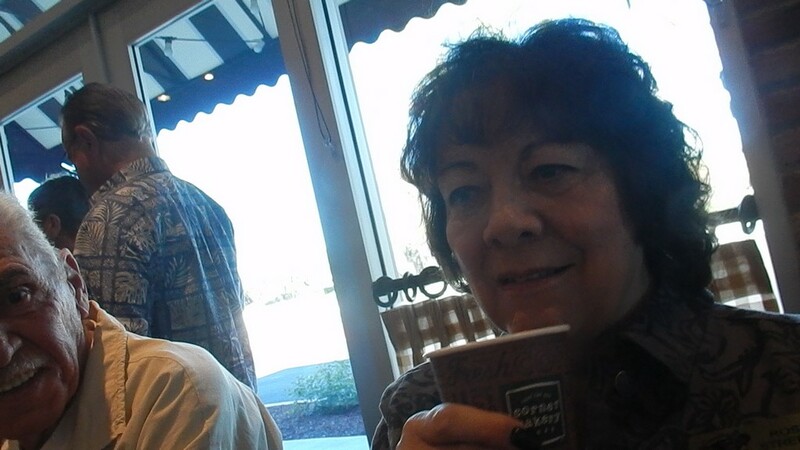 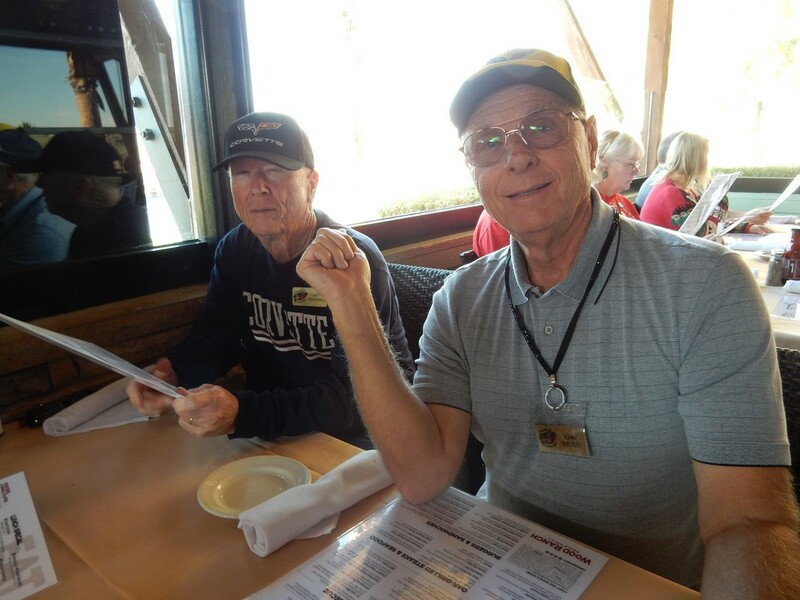 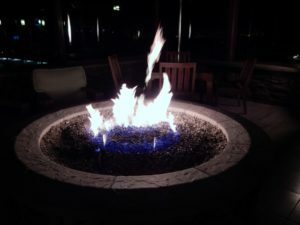 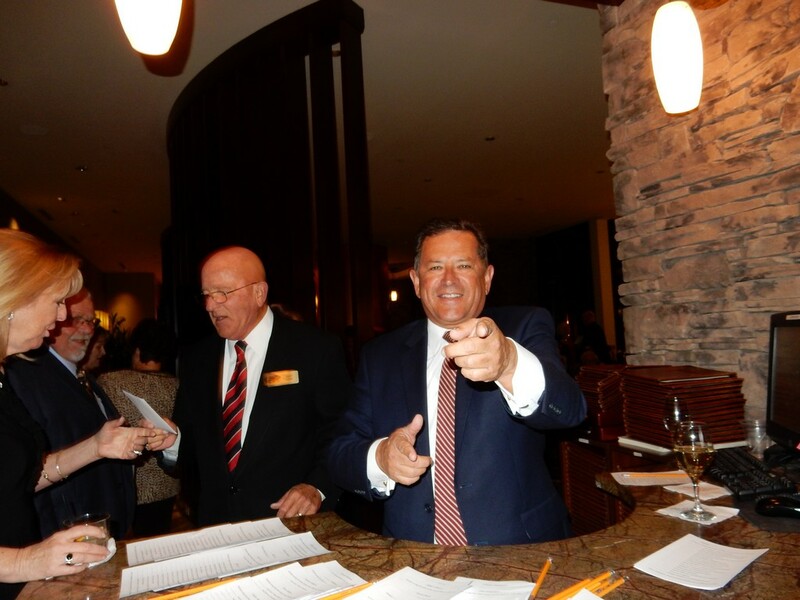 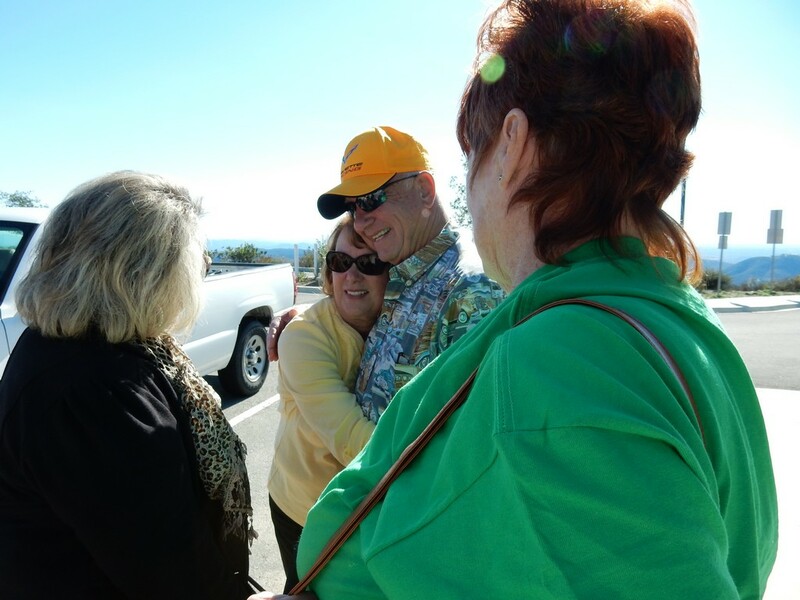 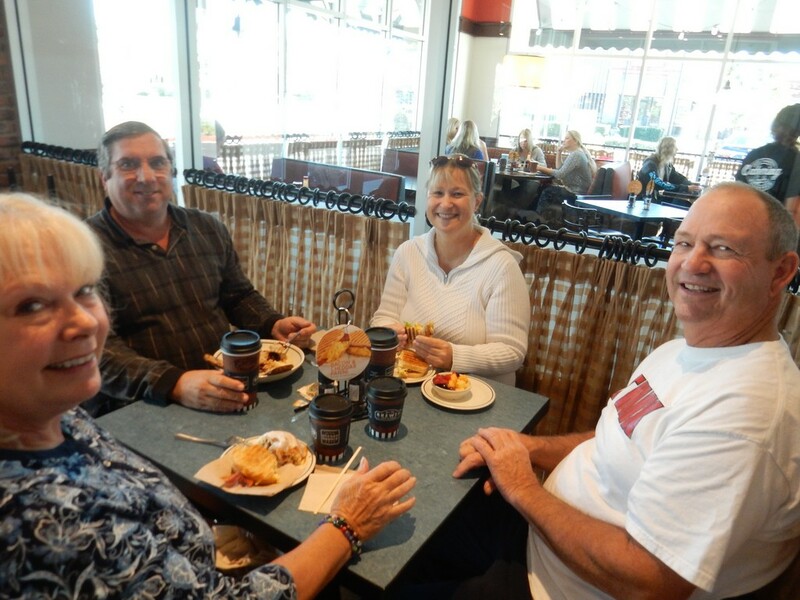 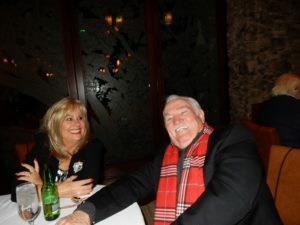 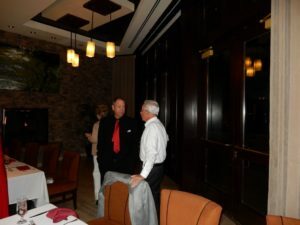 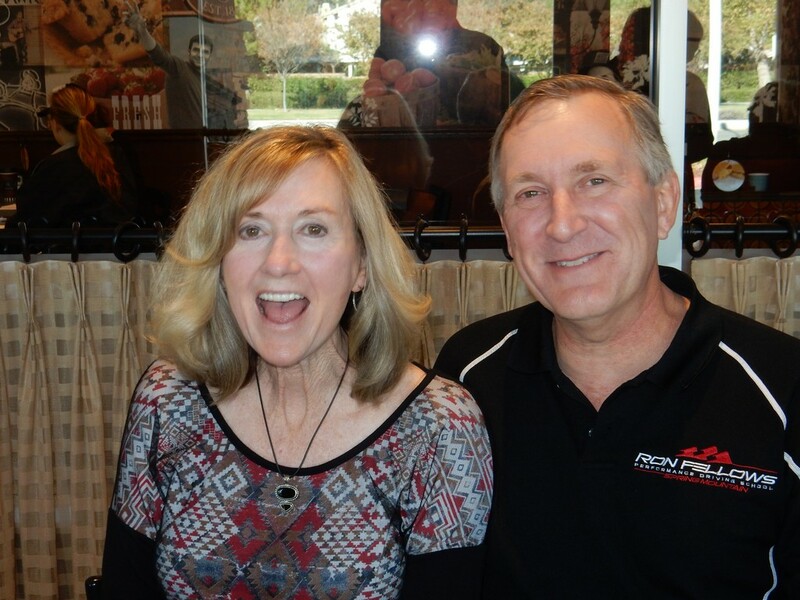 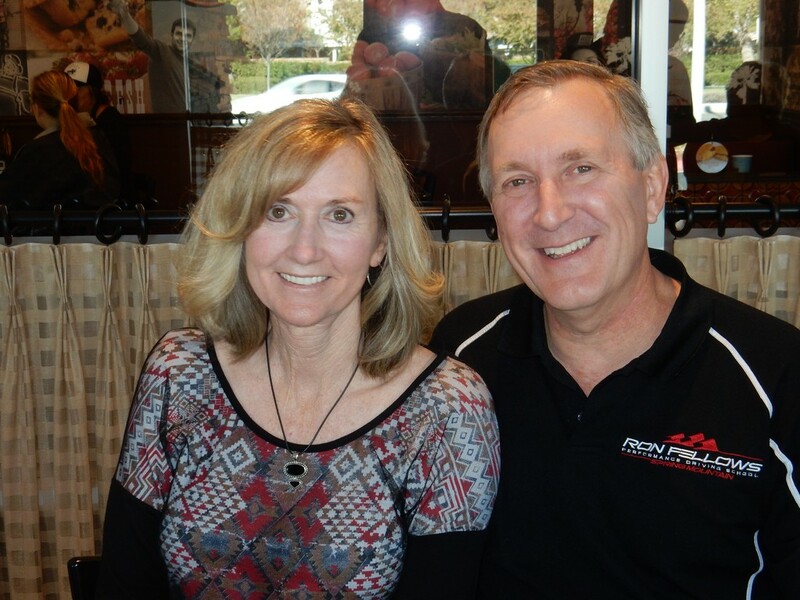 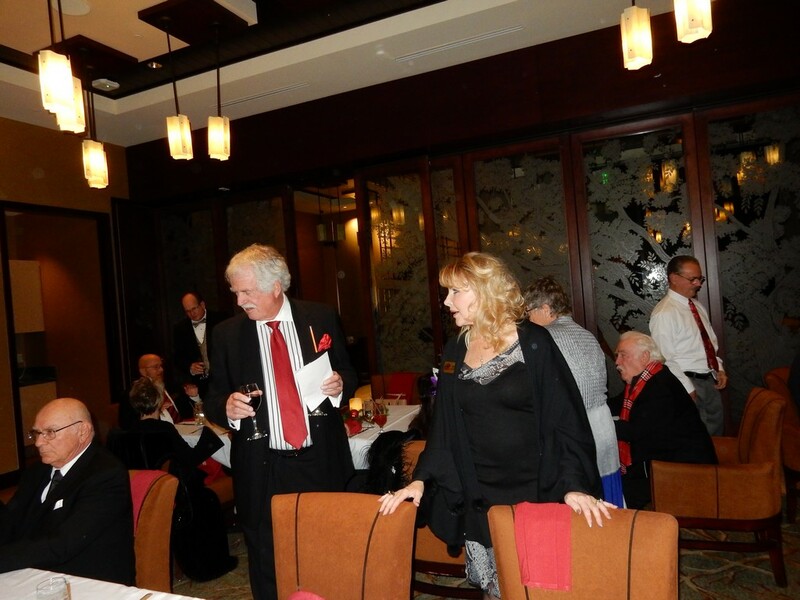 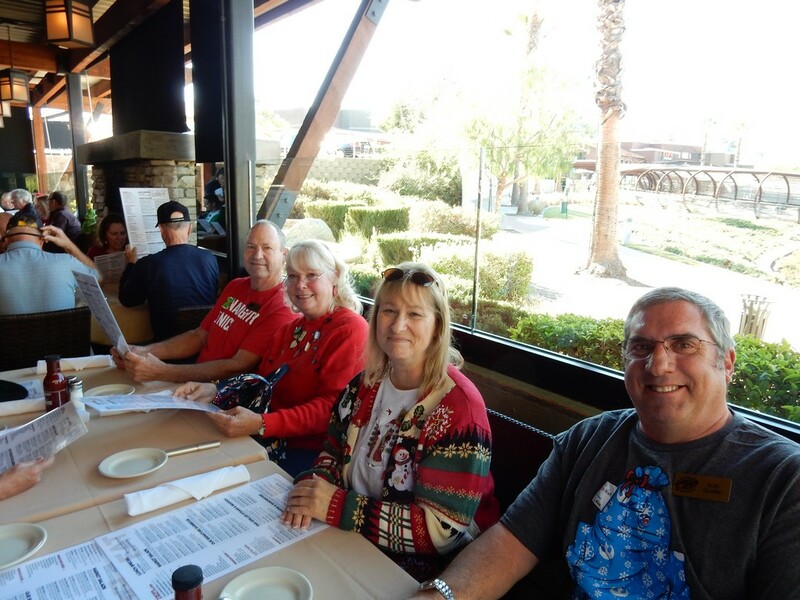 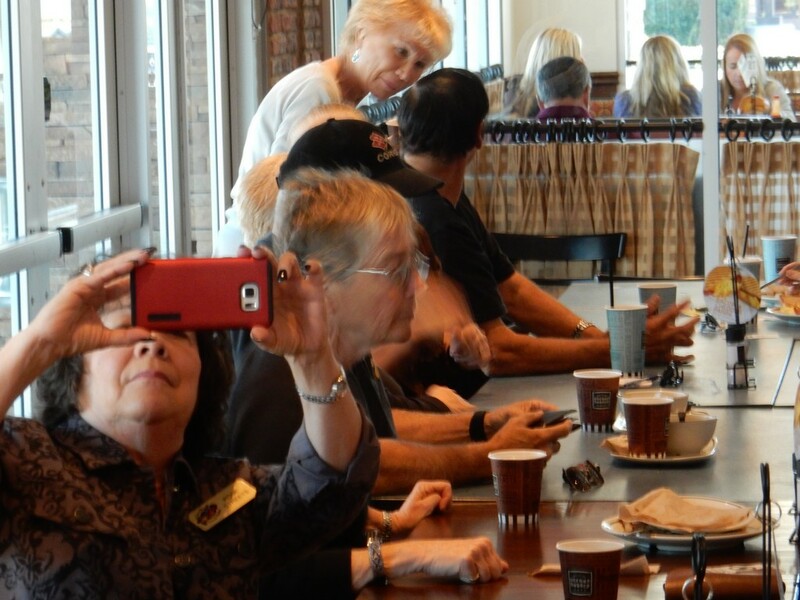 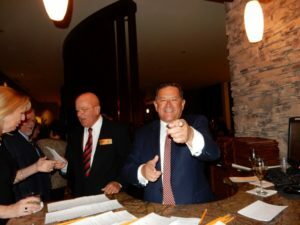 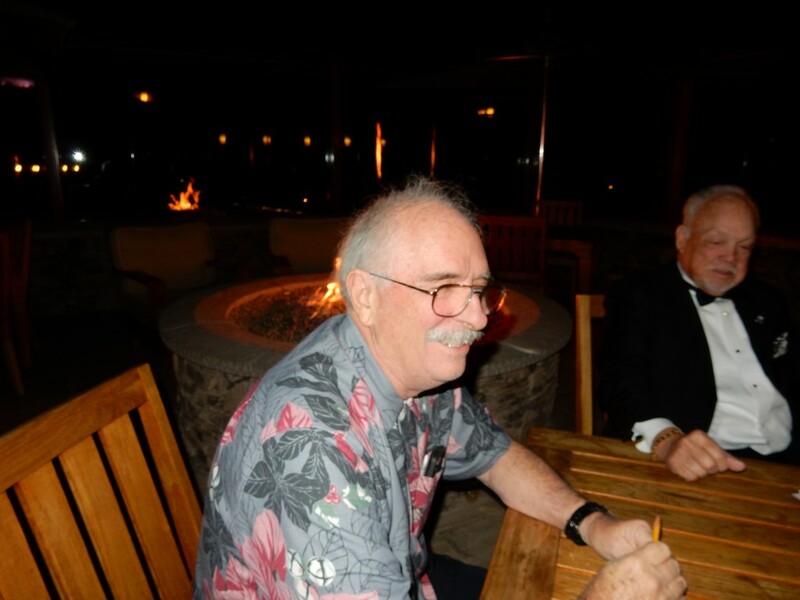 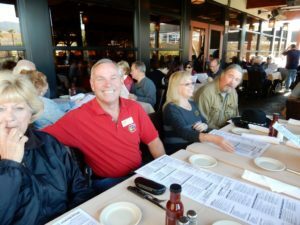 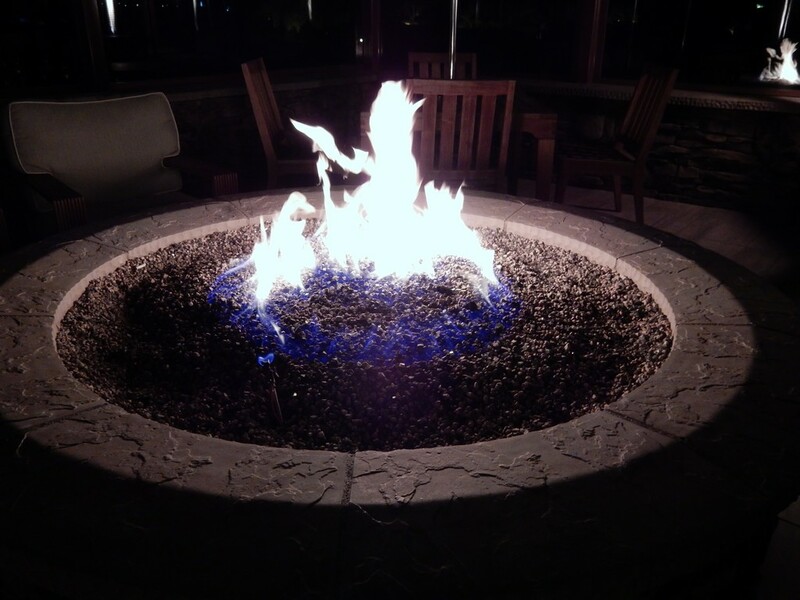 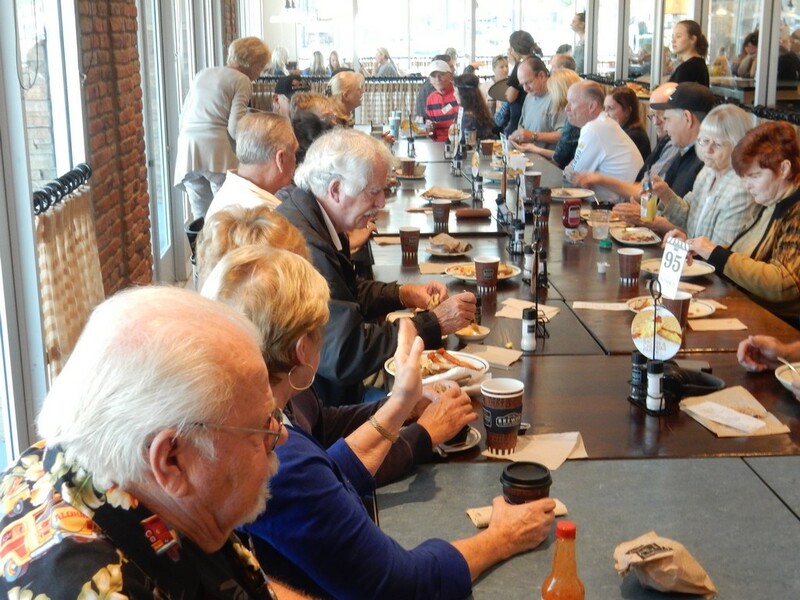 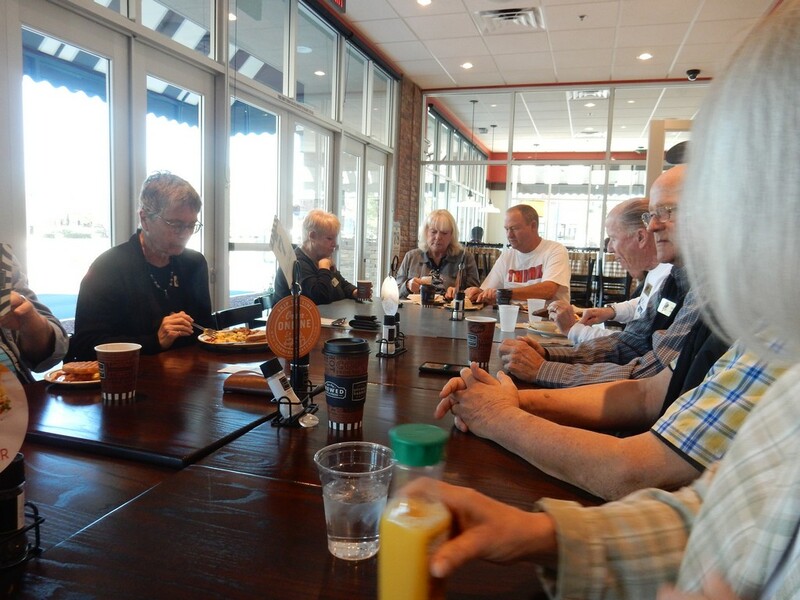 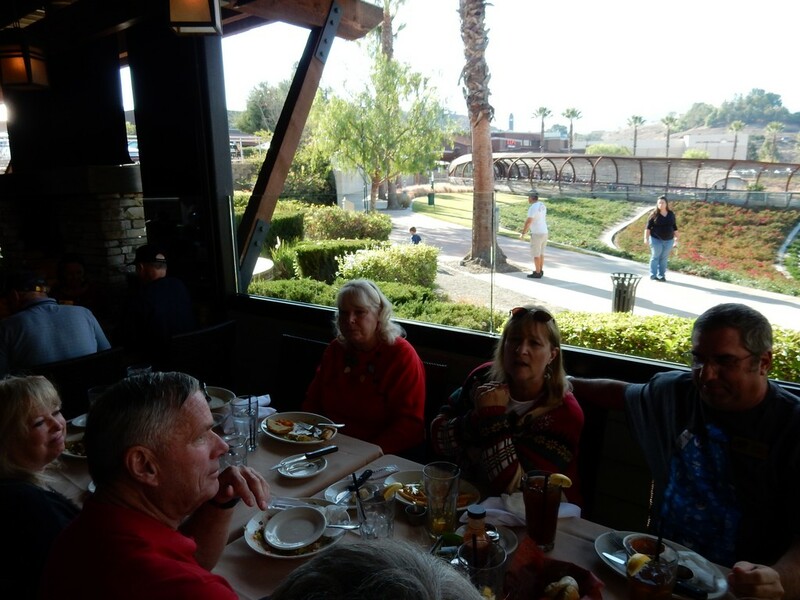 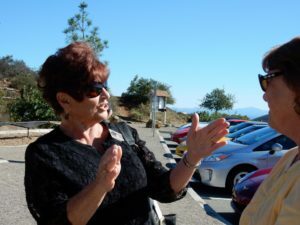 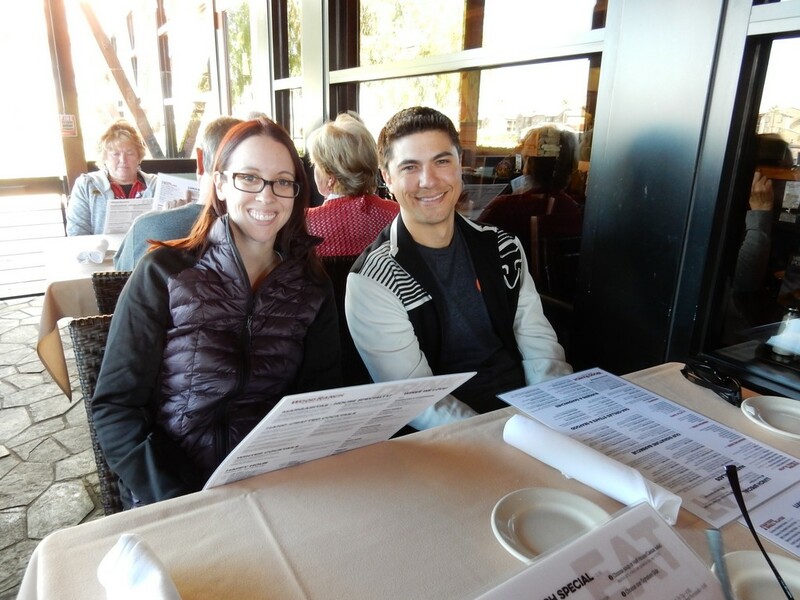 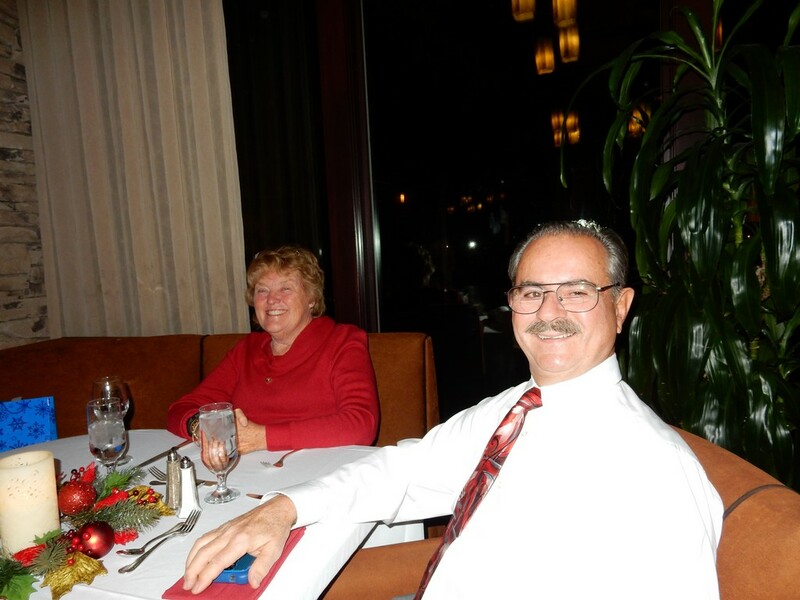 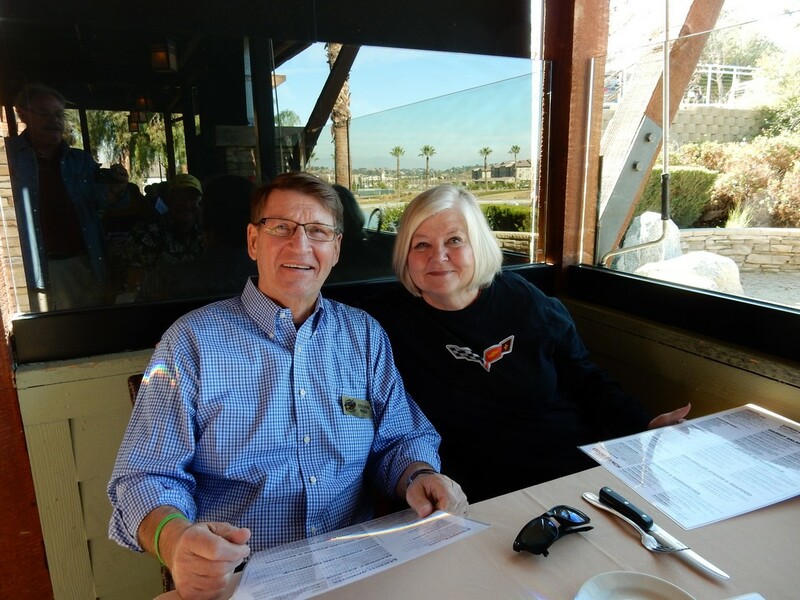 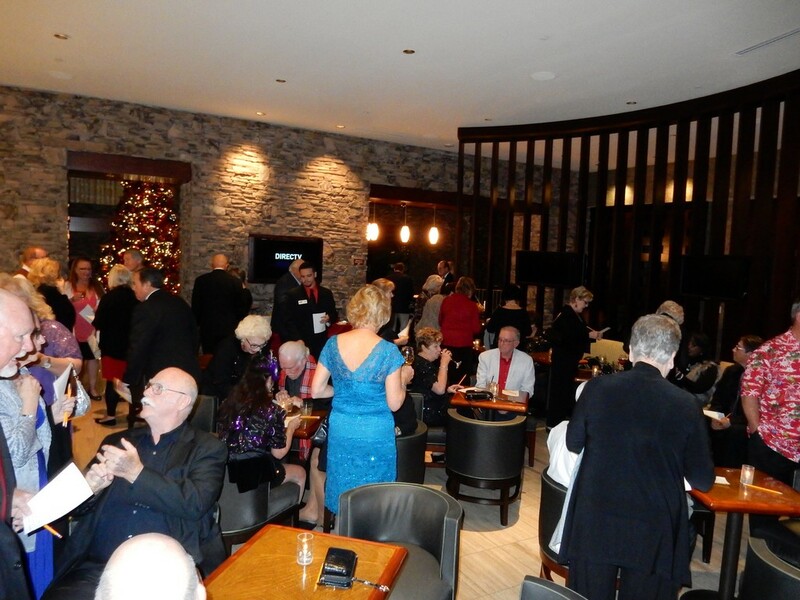 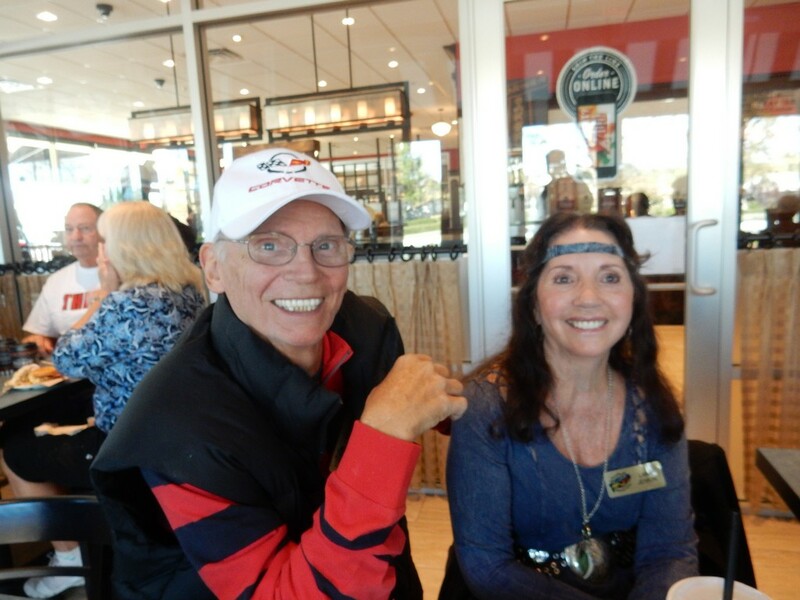 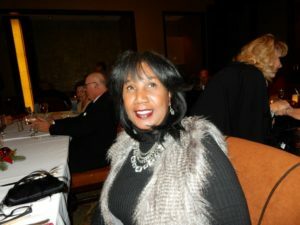 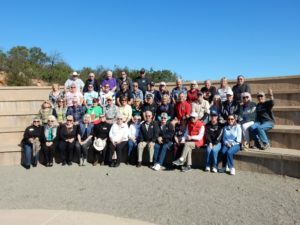 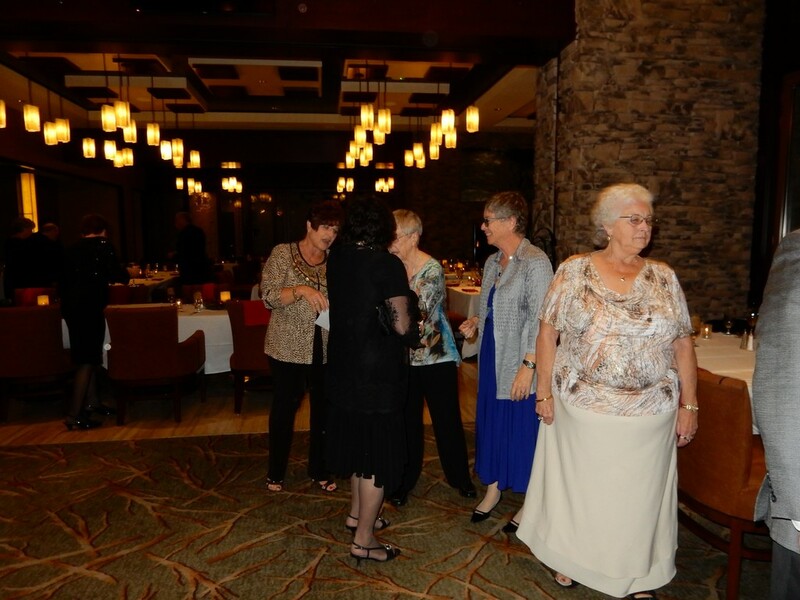 For the third year in a row, we met at the Clubhouse at Journey, the Pechanga golf course. 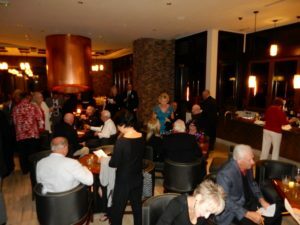 This location has been most successful as it has ample parking, a large area for pre-dinner mingling both inside and outside, fireplaces throughout and luxurious seating for a large group. 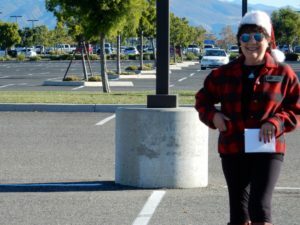 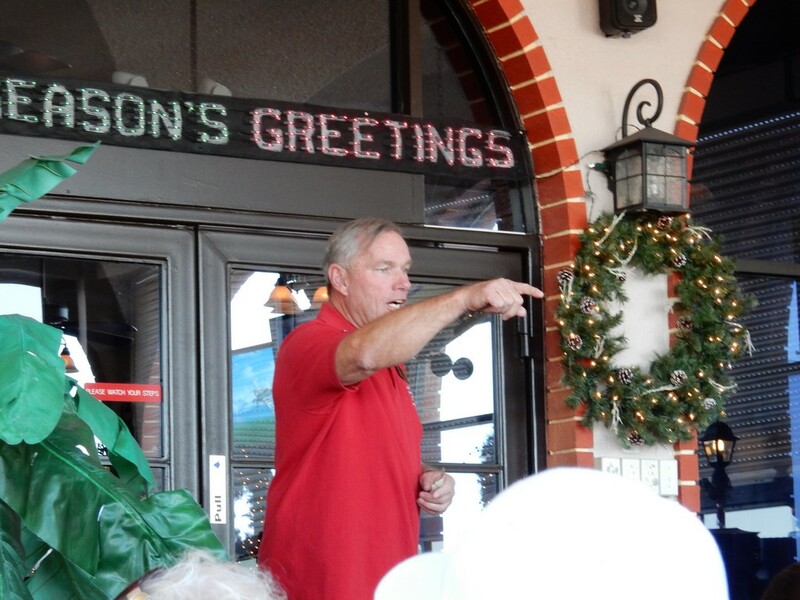 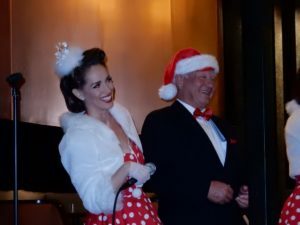 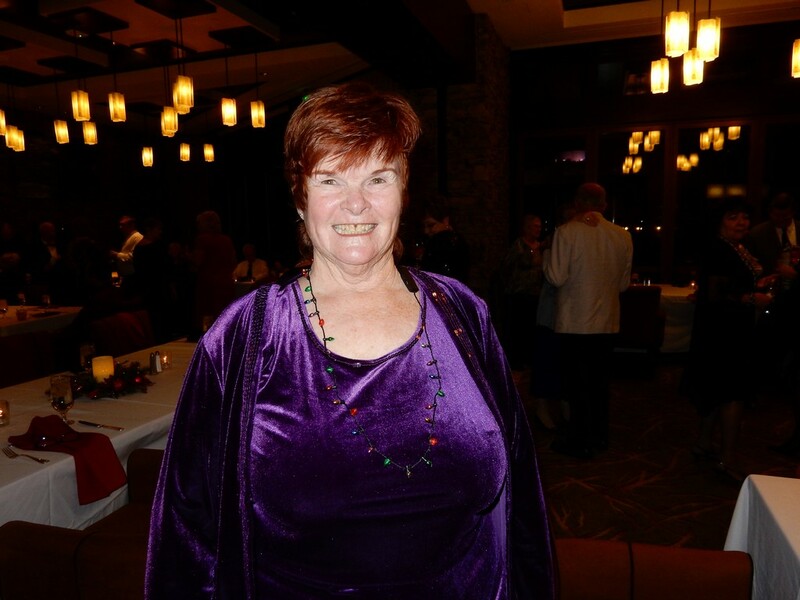 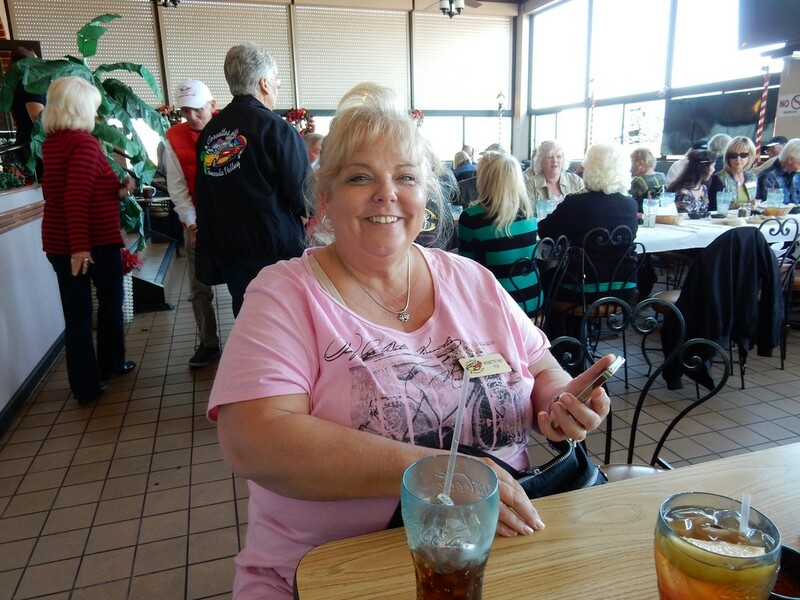 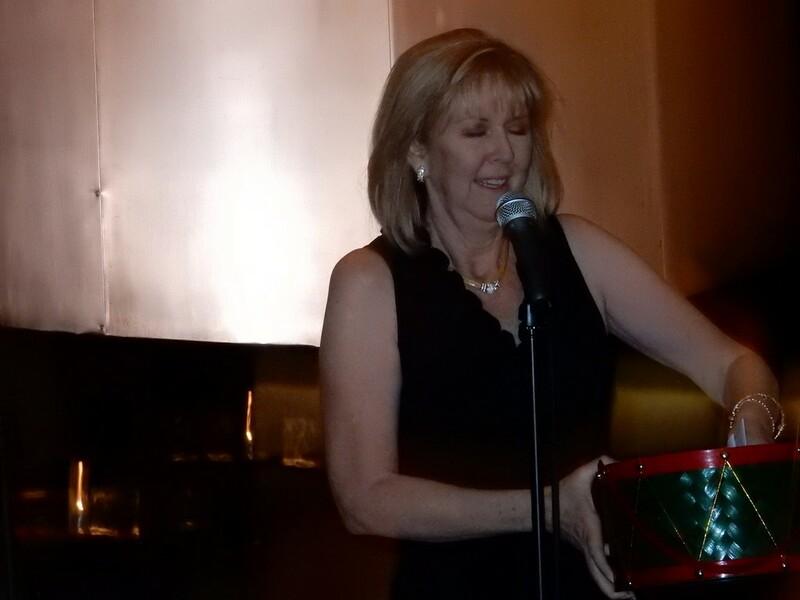 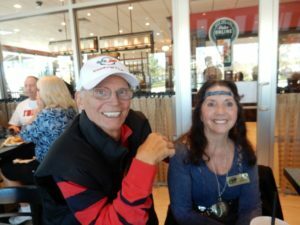 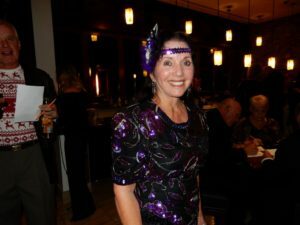 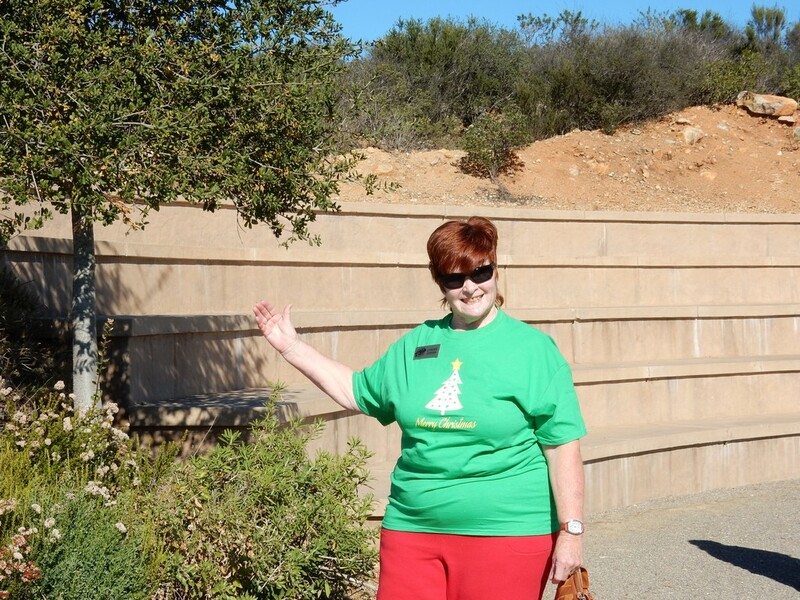 Vickie, in her last hurrah as COTV Activities Director for 2015 – and what a great hurrah it was – welcomed everyone with a “mingle game” where you had to ask everyone around you to respond to a series of holiday-oriented questions. 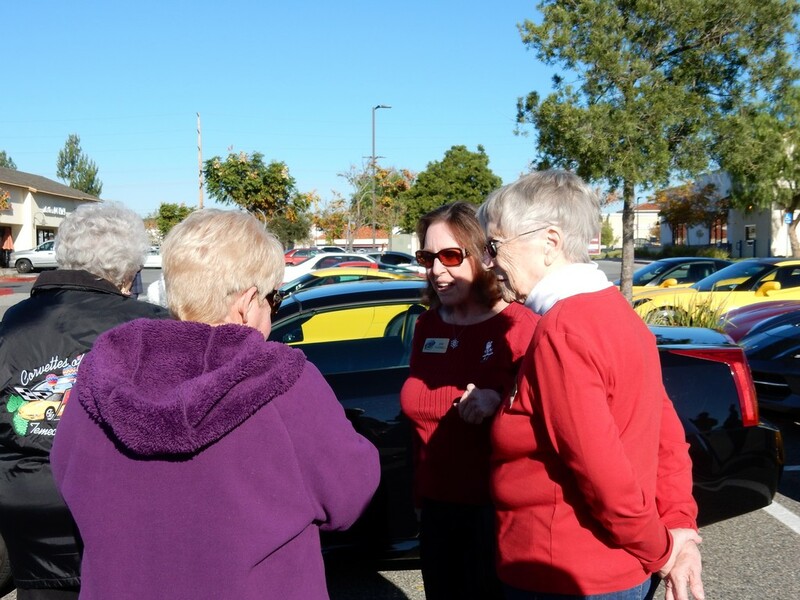 It turned out later that the answers weren’t important, it was the questions to get to know more about your fellow Corvette aficionados. 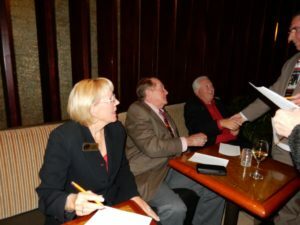 As soon as the word was given, there was a mad dash to grab a place at one of the many festive tables and then Vickie had Hans (the outgoing President), Glenn (the incoming President), and Lana (next year’s party chairman) draw three of the questionnaires which determined the order tables could head to the buffet. 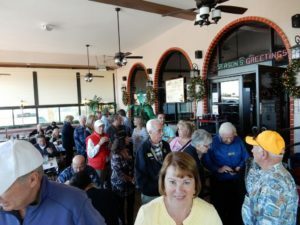 As orderly as the plan was, the line immediately became a mile long and we kept the staff busy replenishing the multiple salads, vegetables, cheesy whipped potatoes, turkey, prime rib and salmon, as well as the lobster bisque. Suddenly the room became much quieter as everyone headed back to the tables with very large plates loaded with goodies and tucked into their holiday meal. 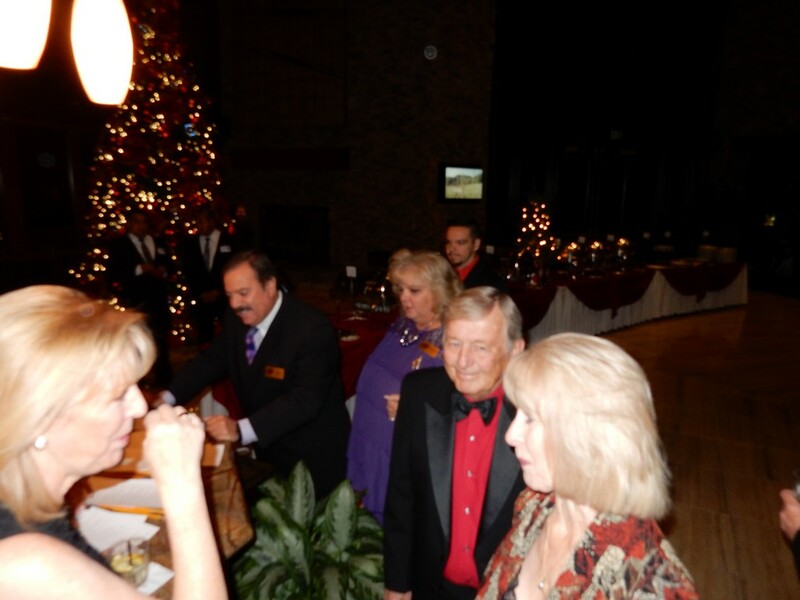 After the main courses, a dessert table was available and coffee was served to those who wanted it. 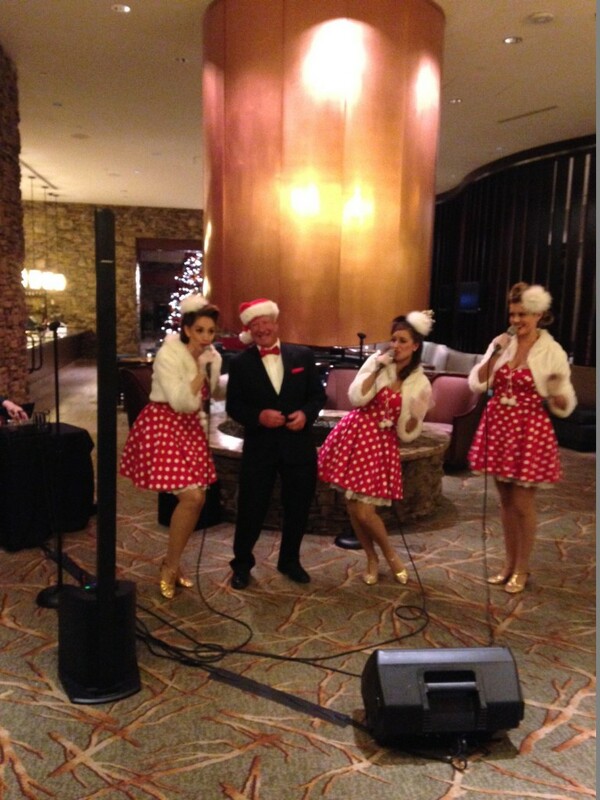 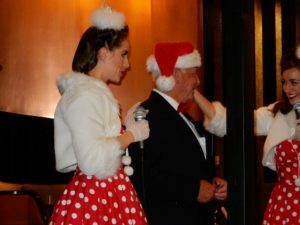 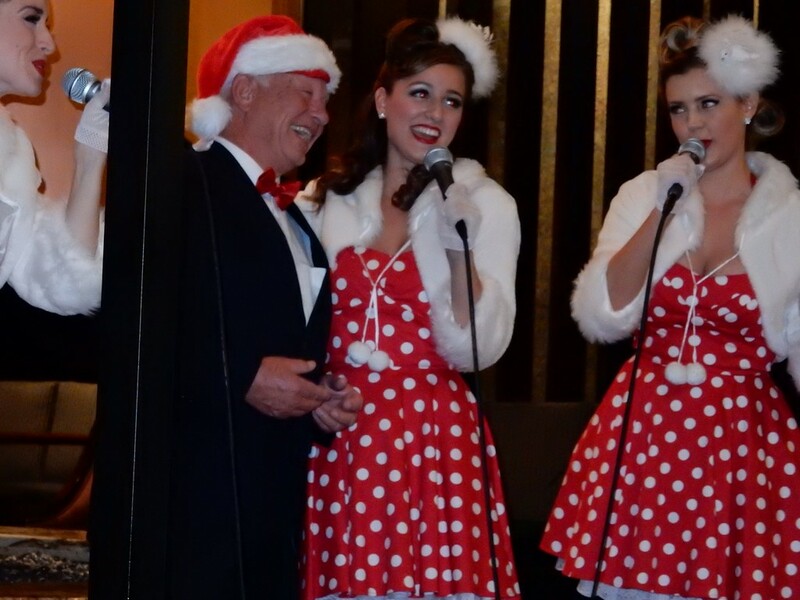 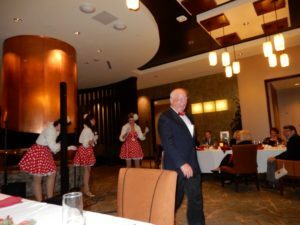 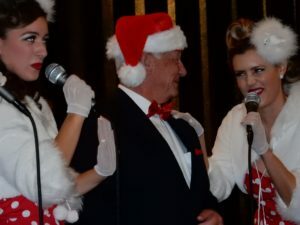 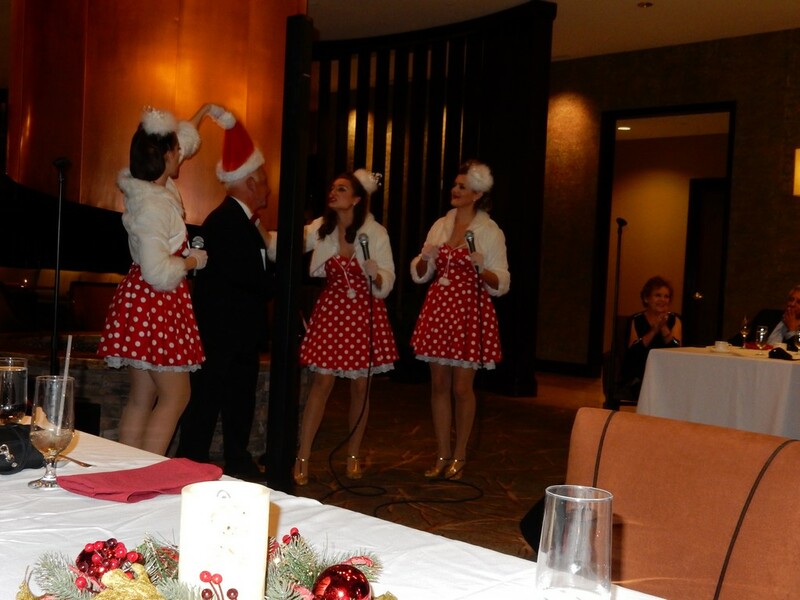 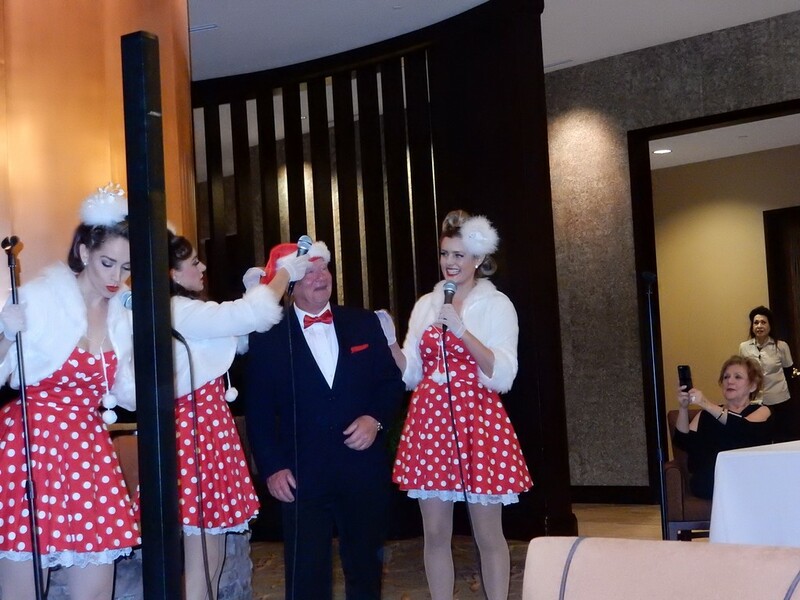 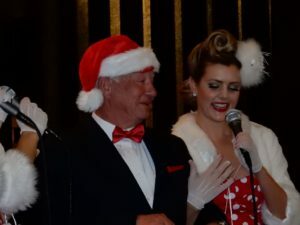 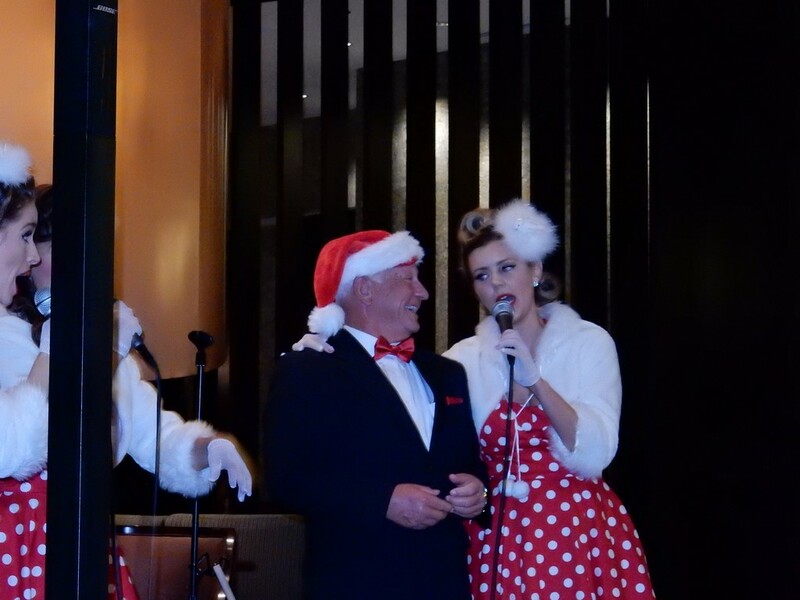 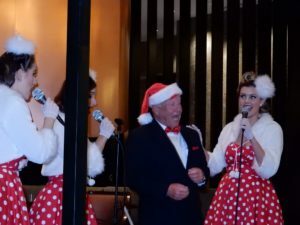 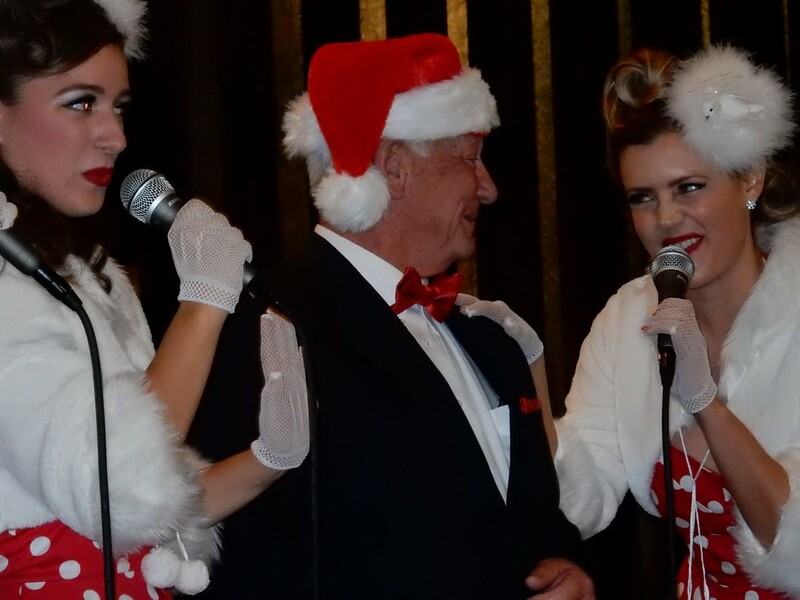 After adequate time to fill our tummies with holiday goodies, we were ready for the evening’s entertainment, the Beverly Belles, a trio of lady singers in holiday attire who sang a medley of Christmas tunes. 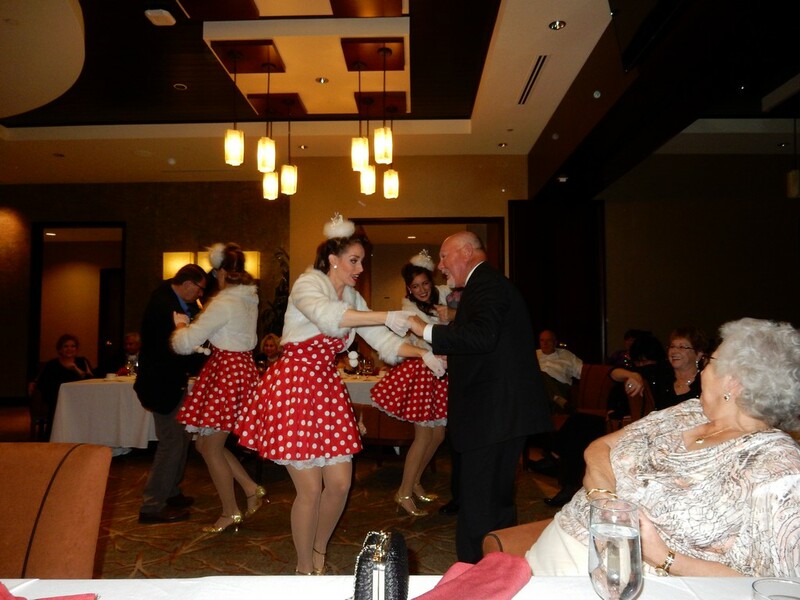 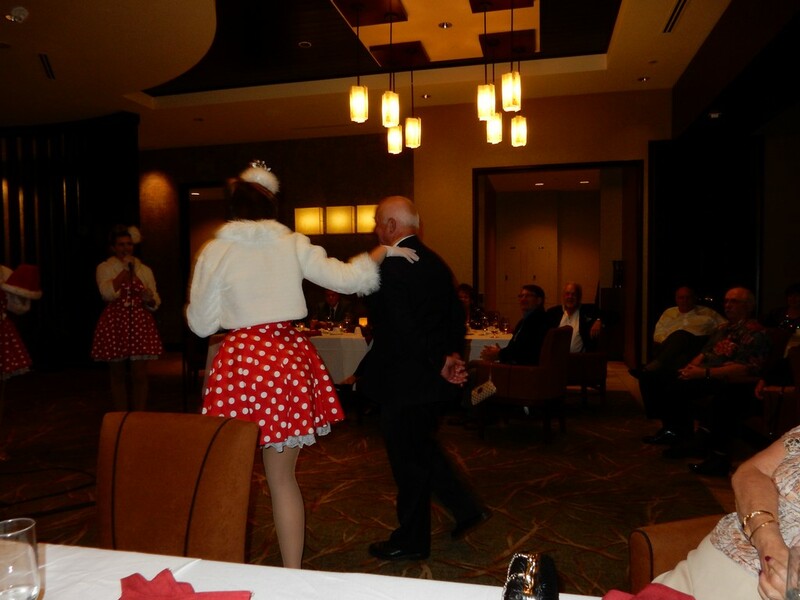 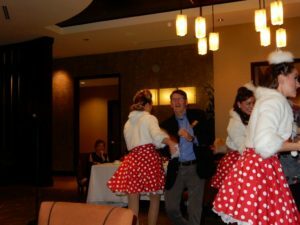 They had several occasions to get some audience participation as they pulled Steve Page, Mike Grayson and Bill Steed from their chairs to dance. 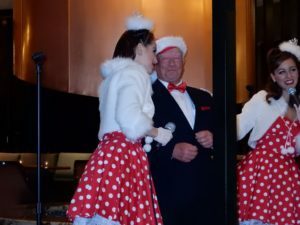 They had less success with getting Glenn up to the microphone, but Hans was a willing participant for a tuneful “Santa Baby” or “Hansi Baby.” After a musical hour, the evening had drawn to a close. 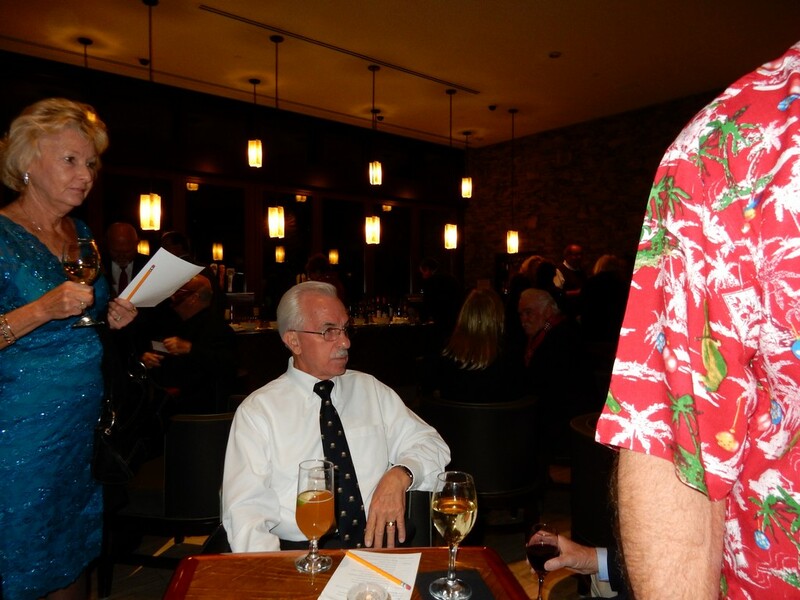 Next year’s COTV calendars were distributed and fond farewells were made for those we won’t see until 2016. 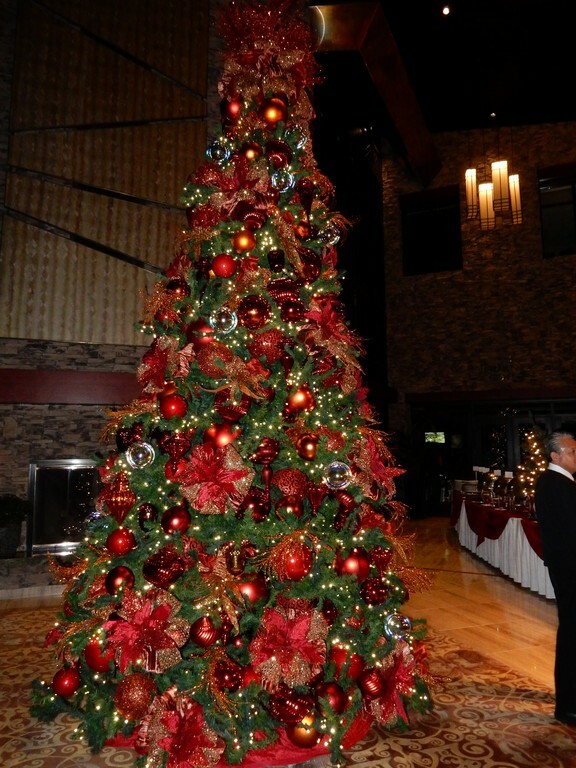 We all wish the very best to everyone in the Club for a very happy and healthy holiday season with your loved ones and friends. 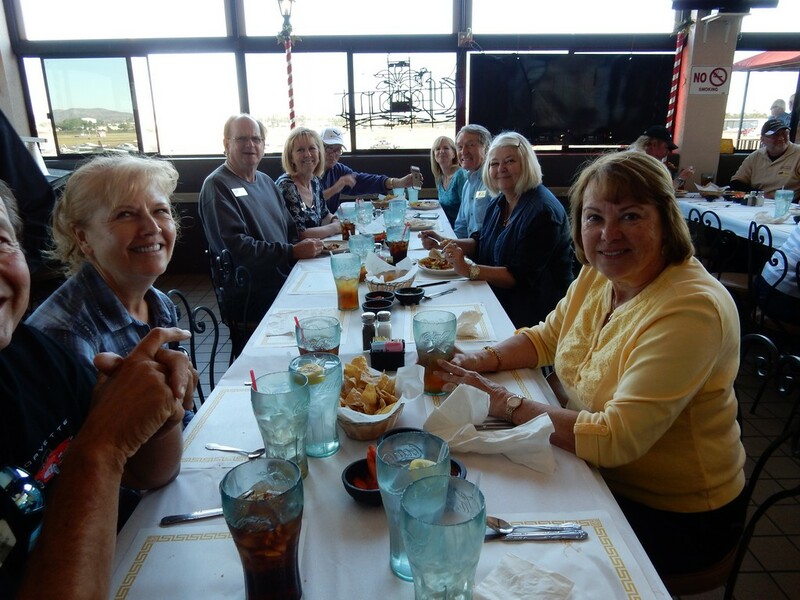 We look forward with much anticipation to 2016 when our Leadership Team will have lots of fun things planned to do together. 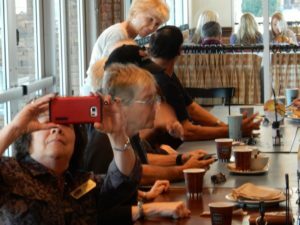 Keep your eyes on your e-mail and your COTV website calendar so you don’t miss anything we have planned. 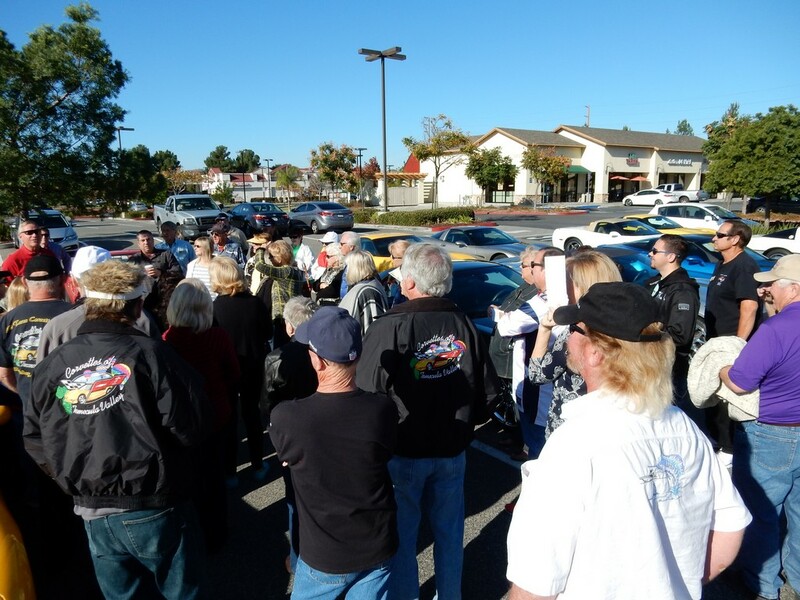 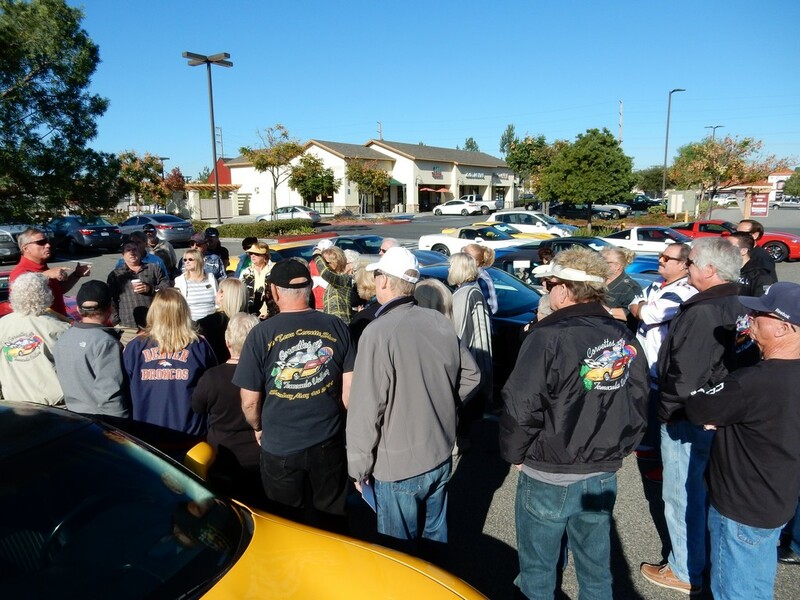 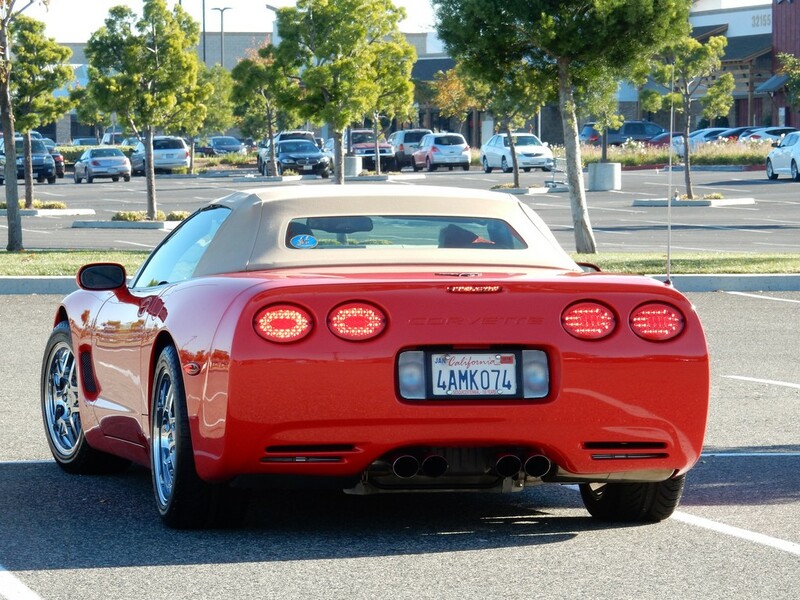 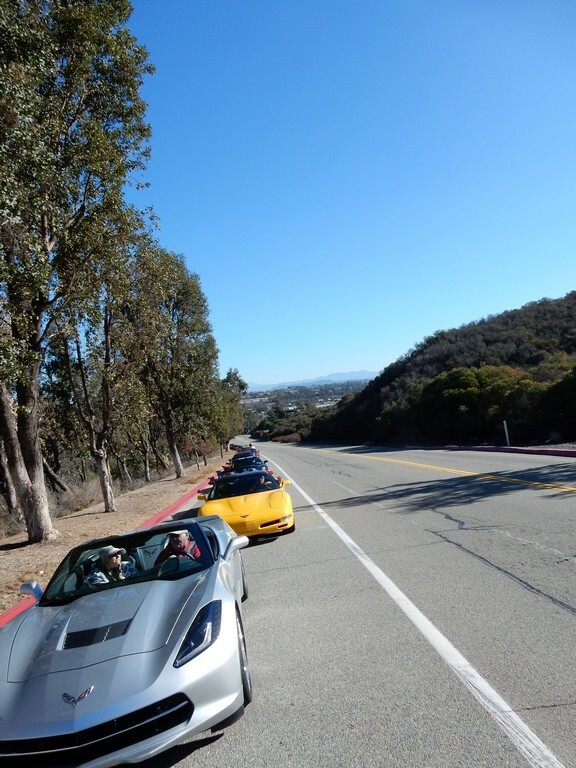 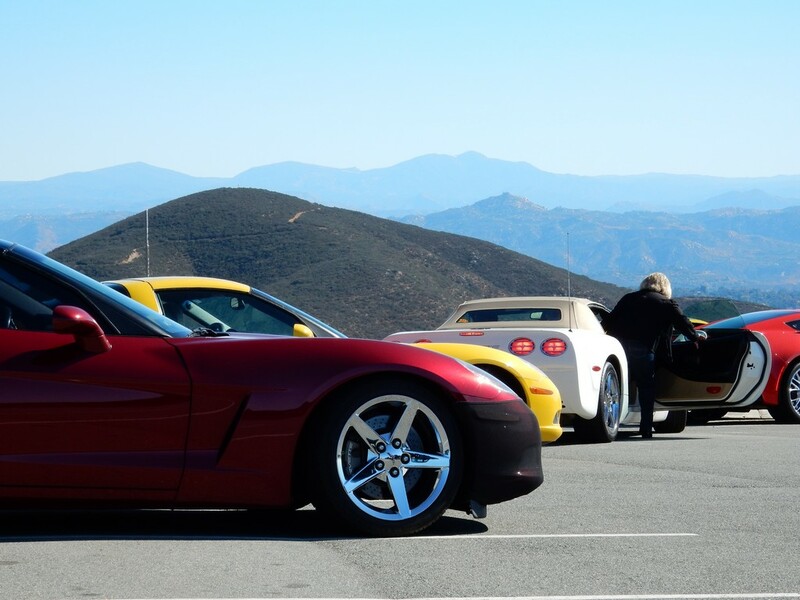 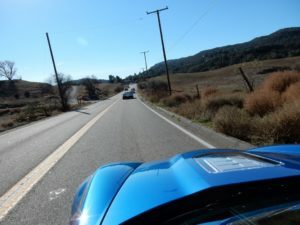 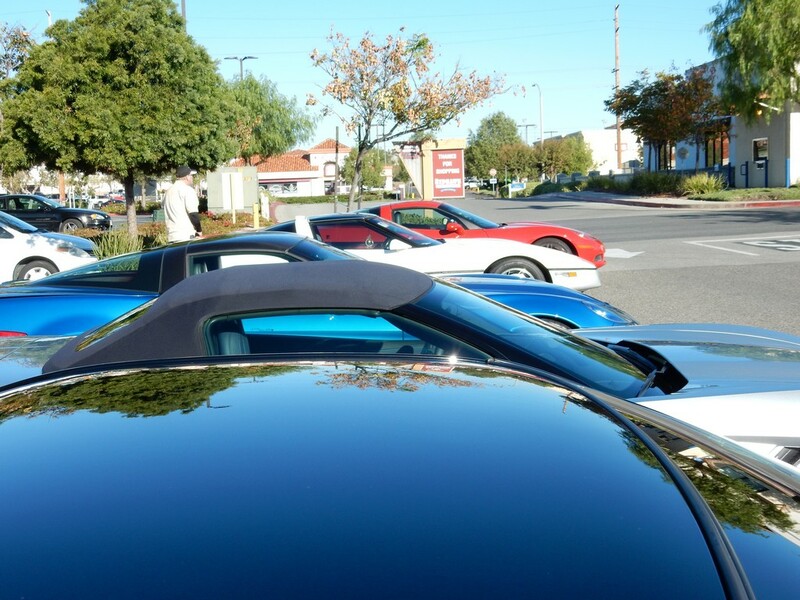 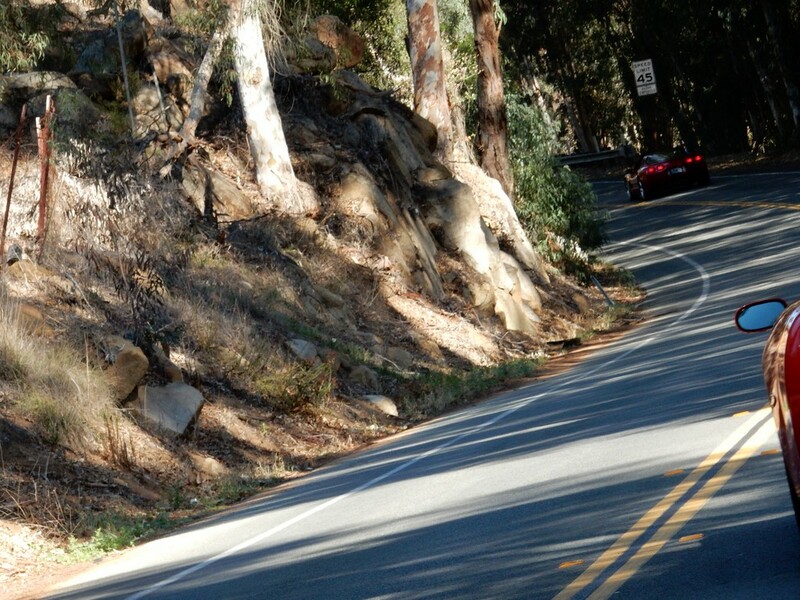 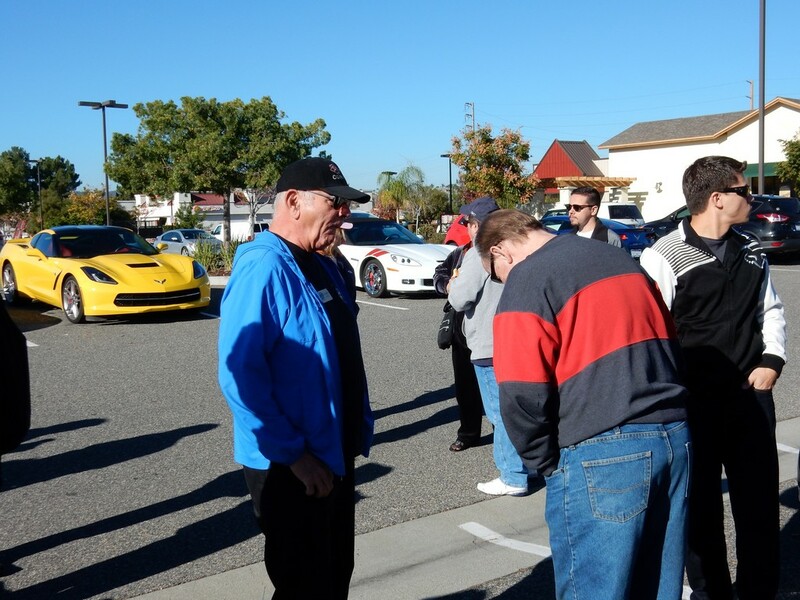 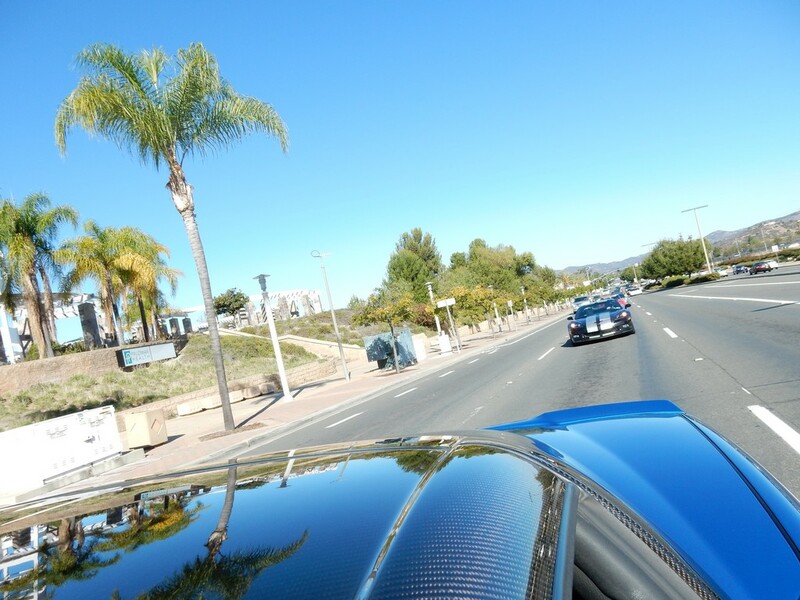 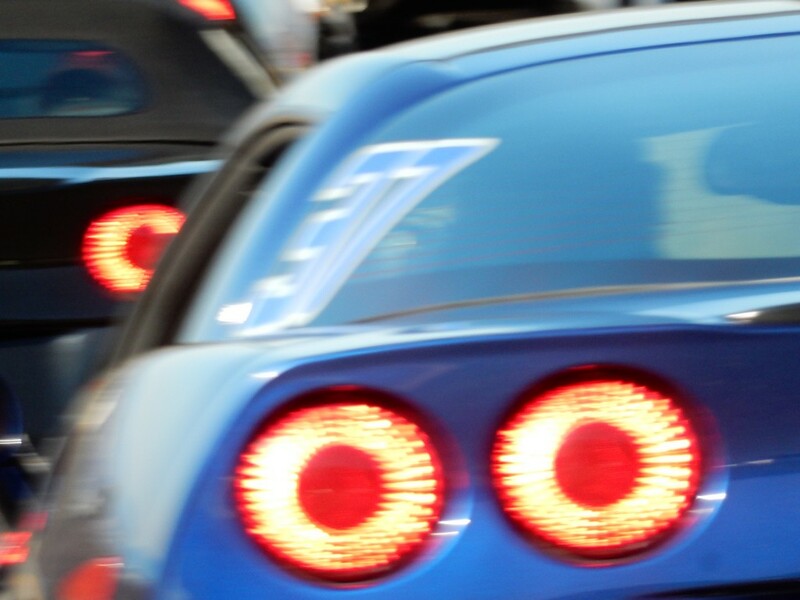 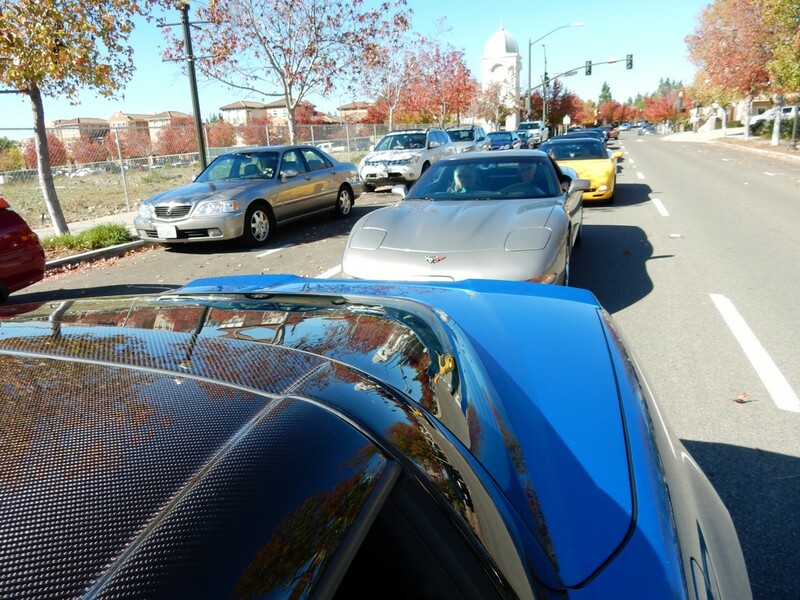 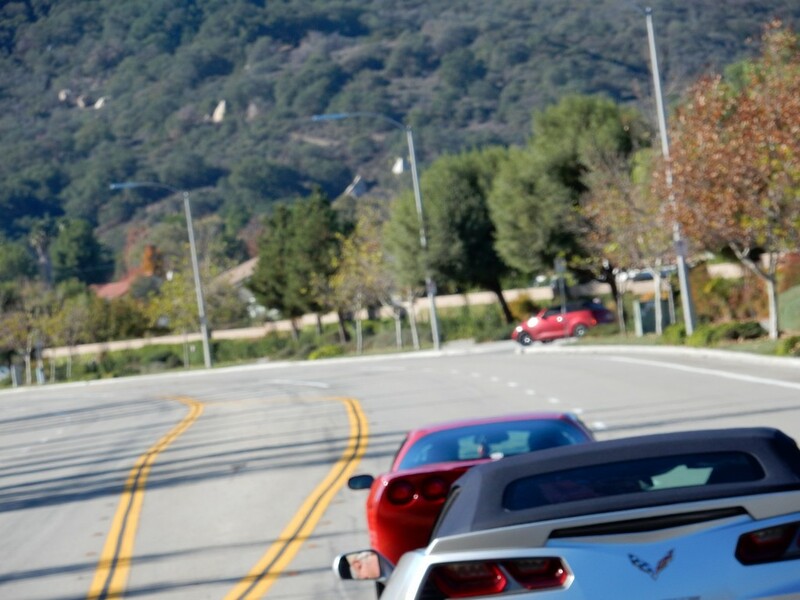 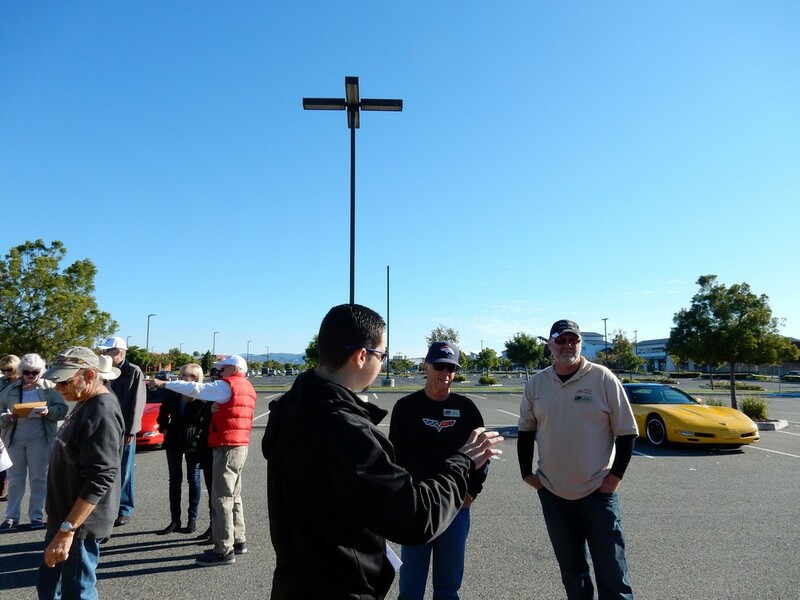 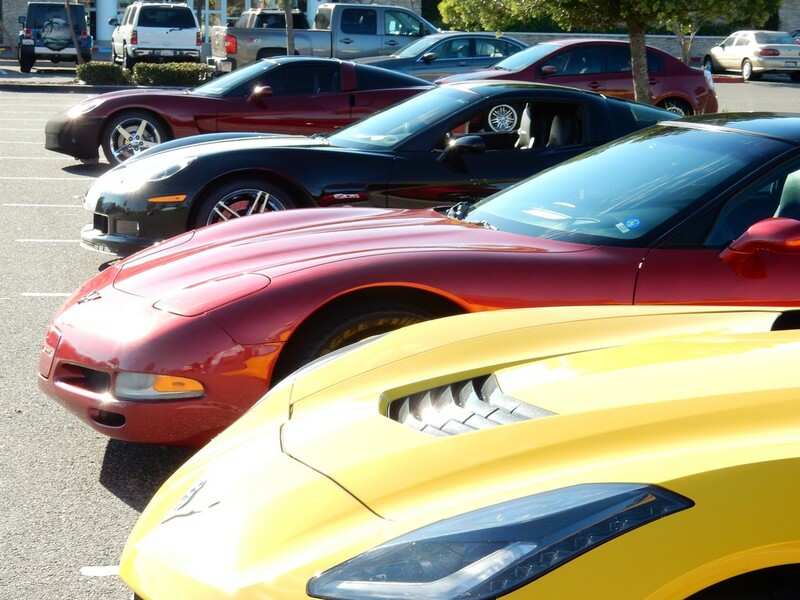 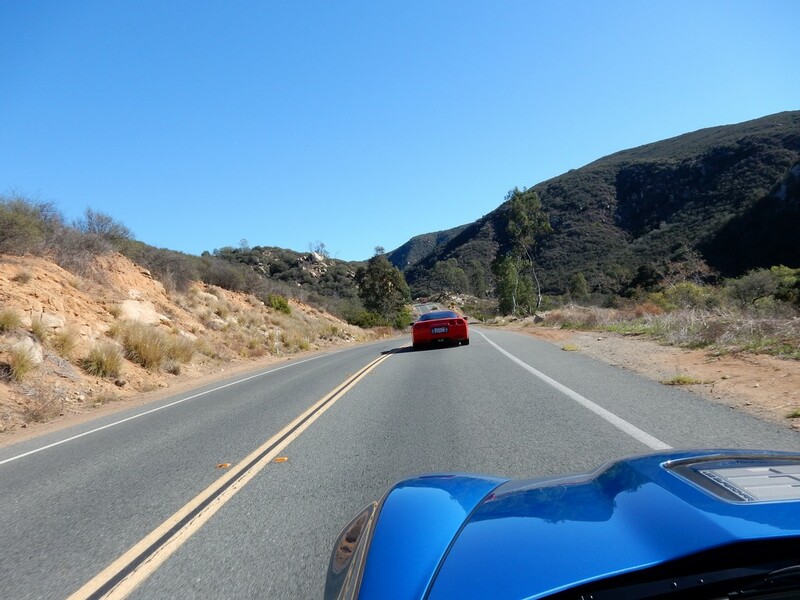 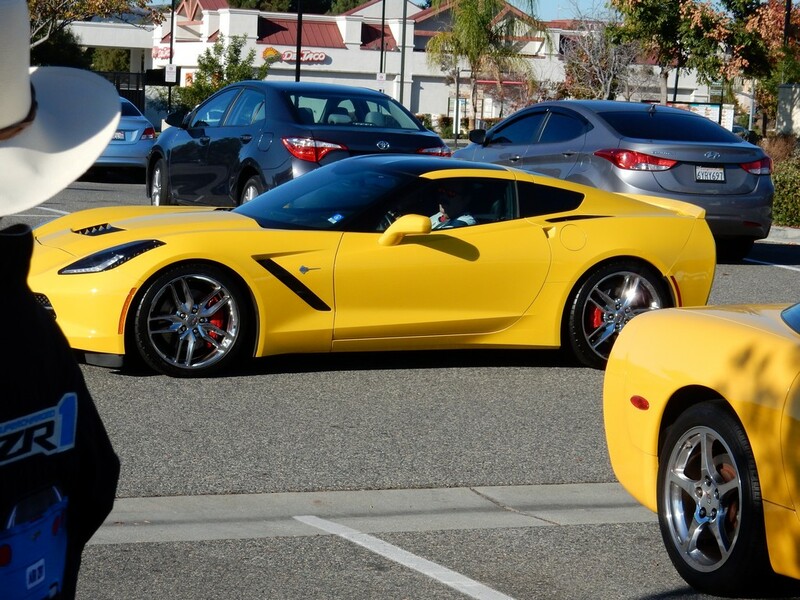 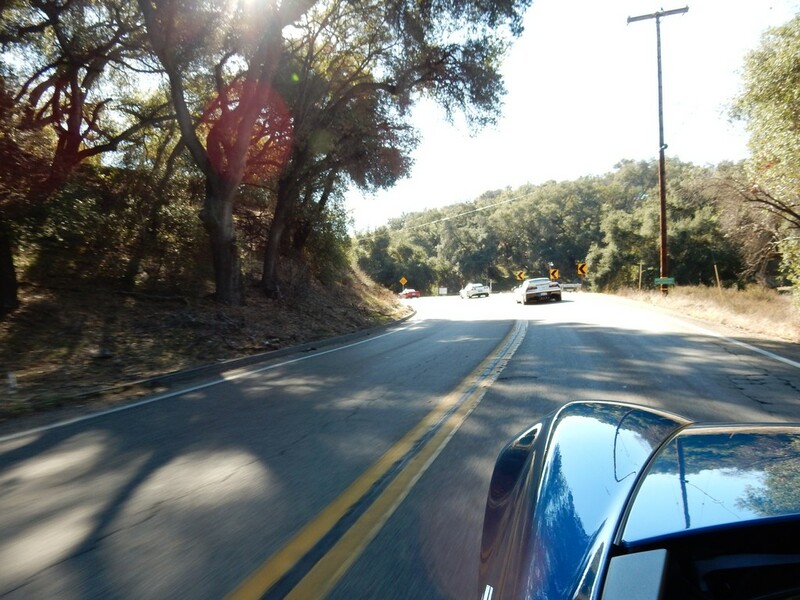 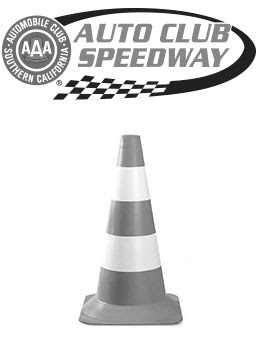 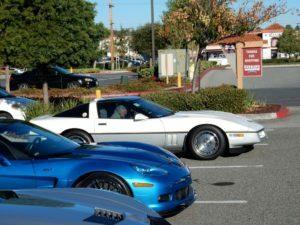 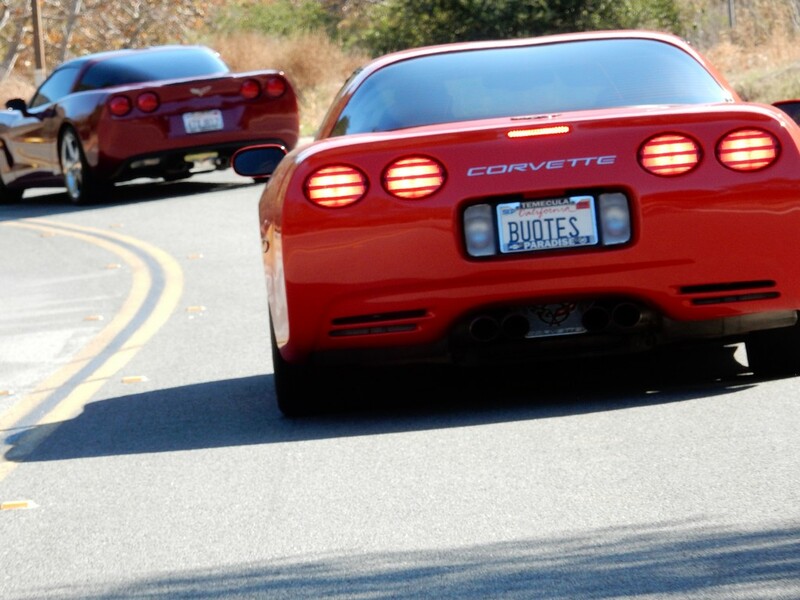 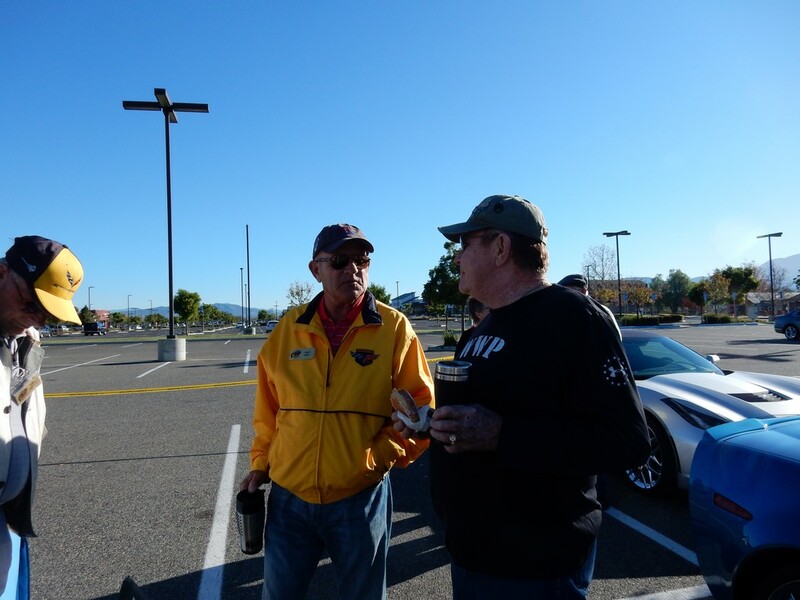 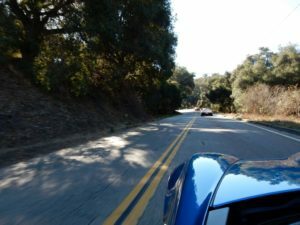 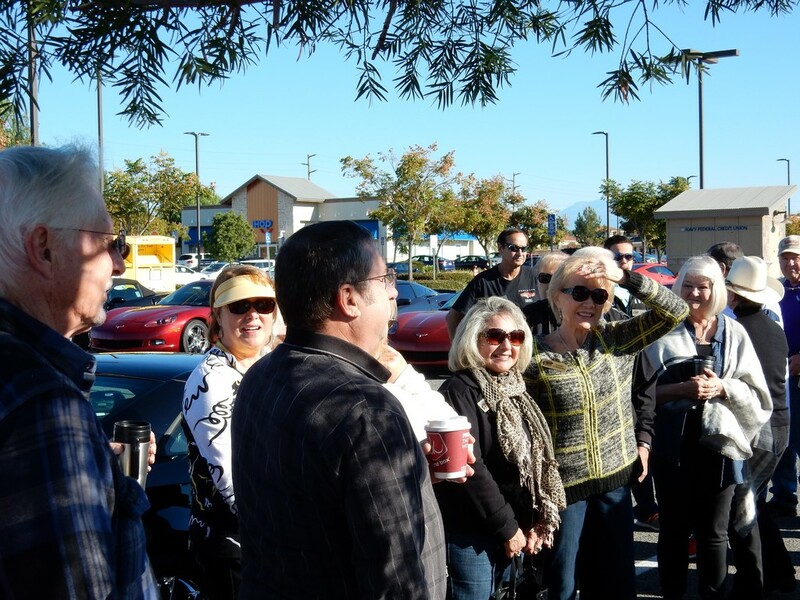 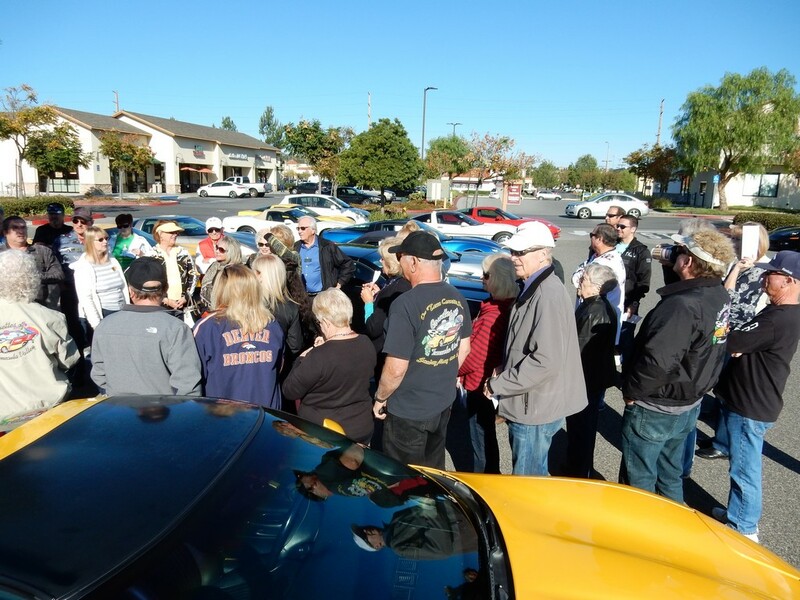 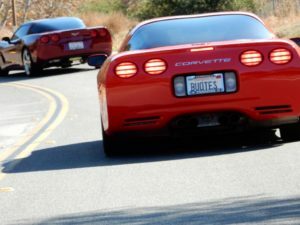 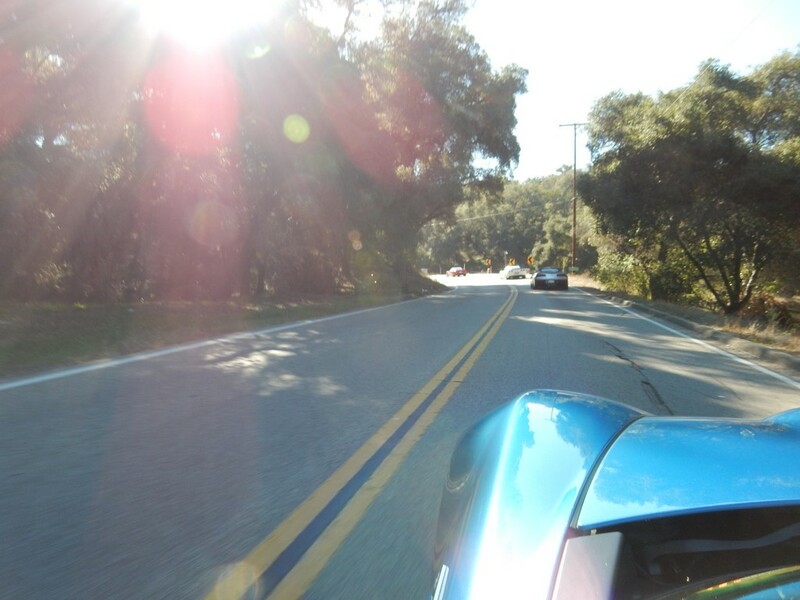 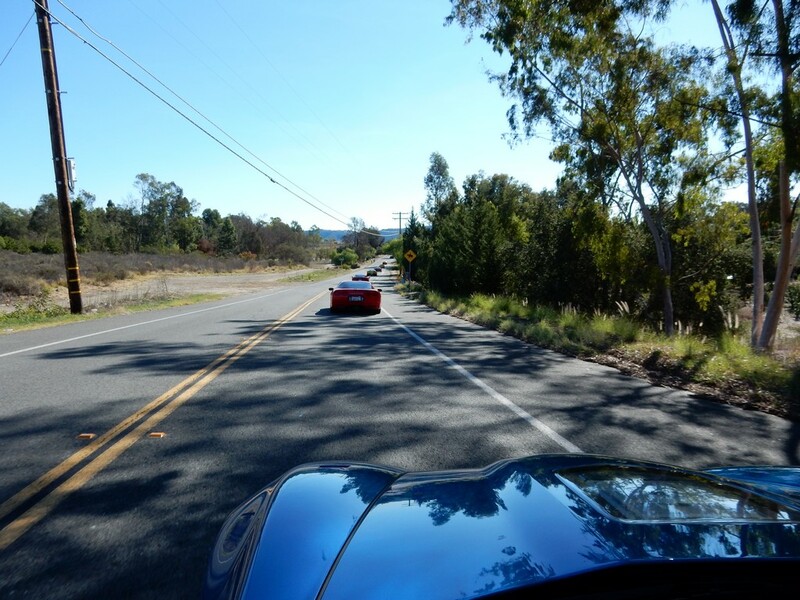 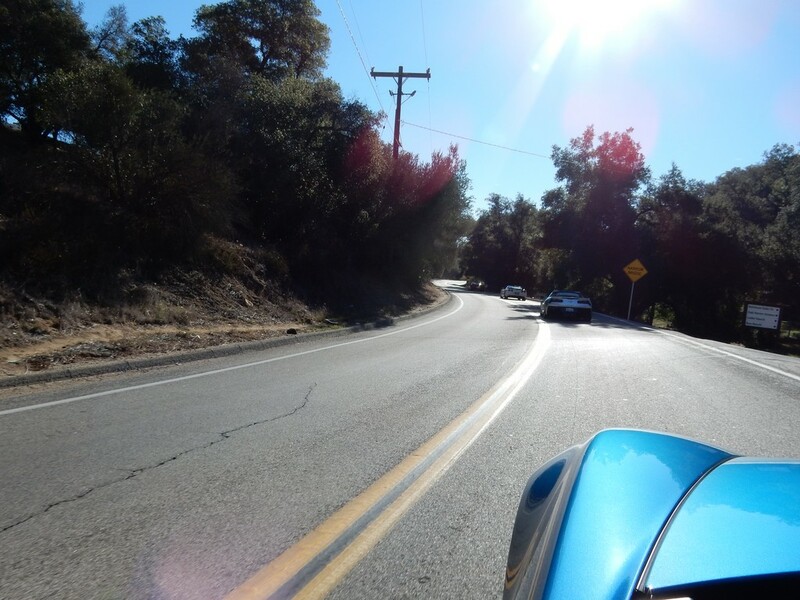 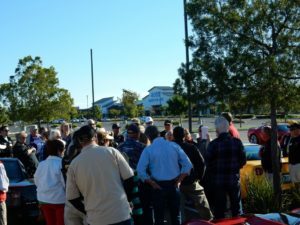 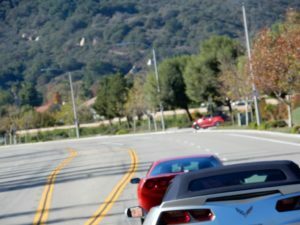 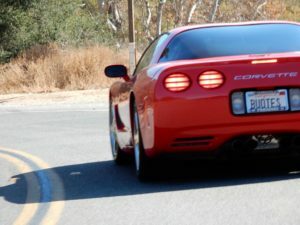 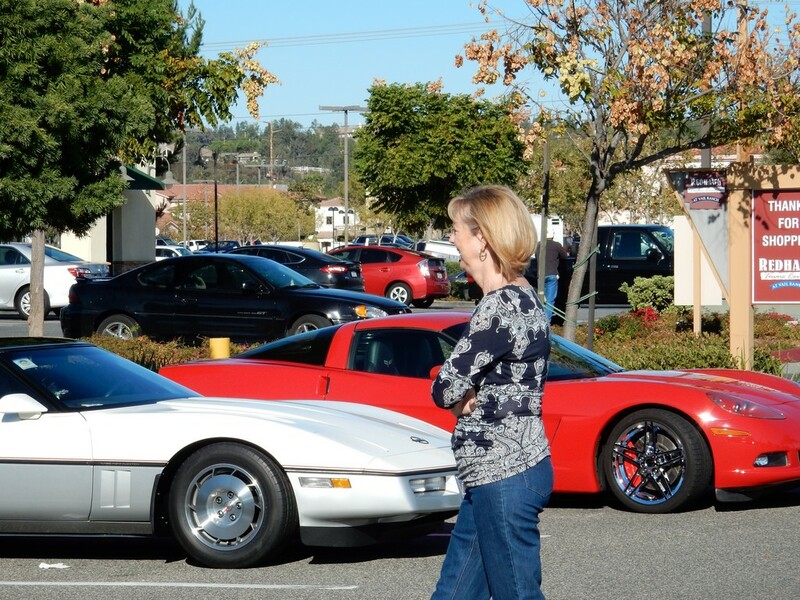 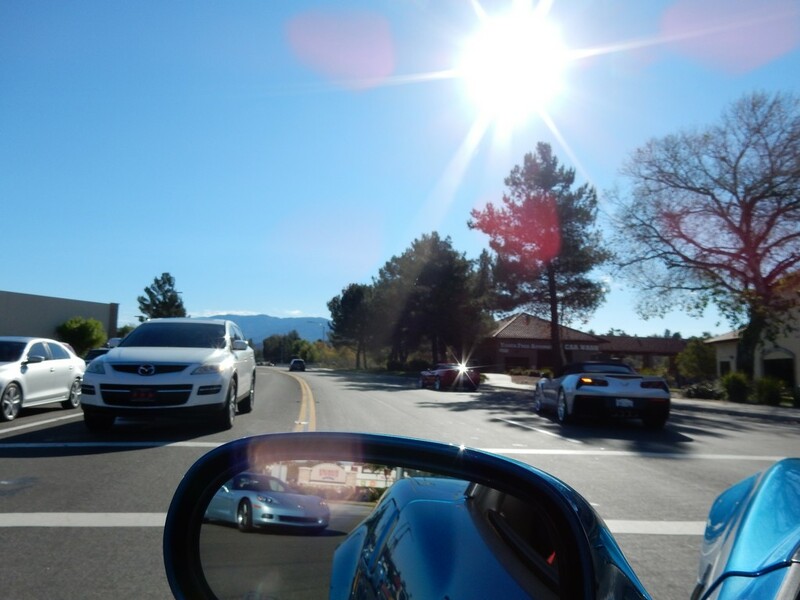 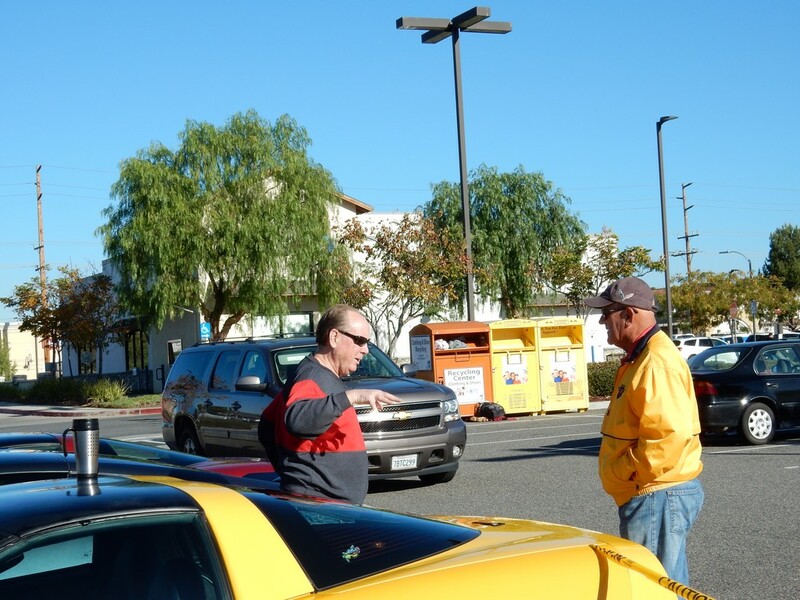 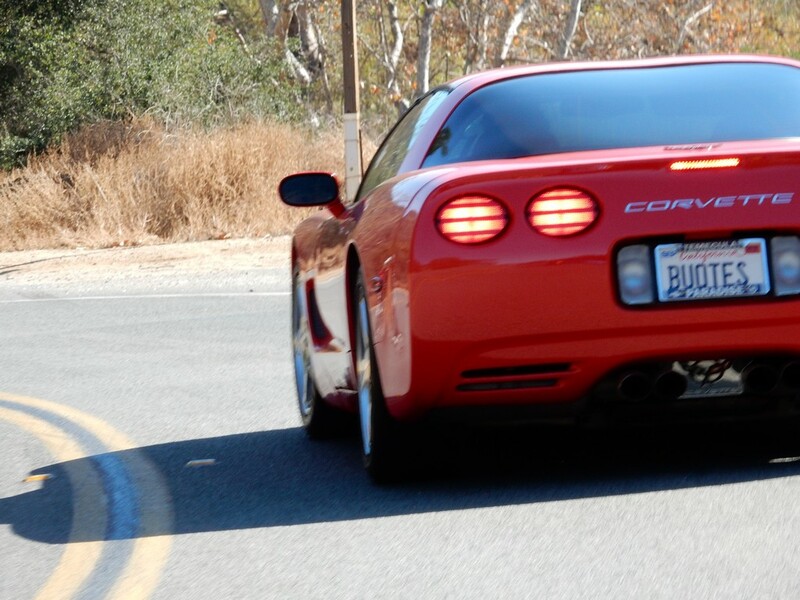 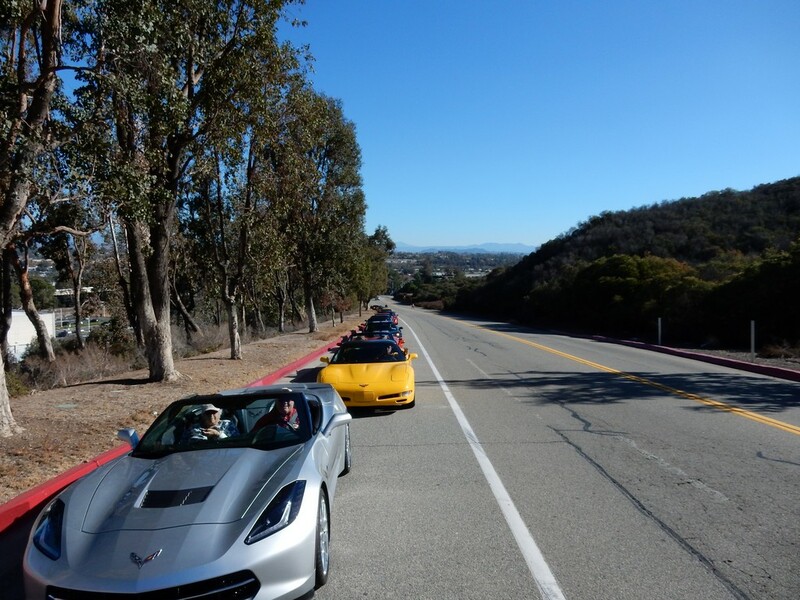 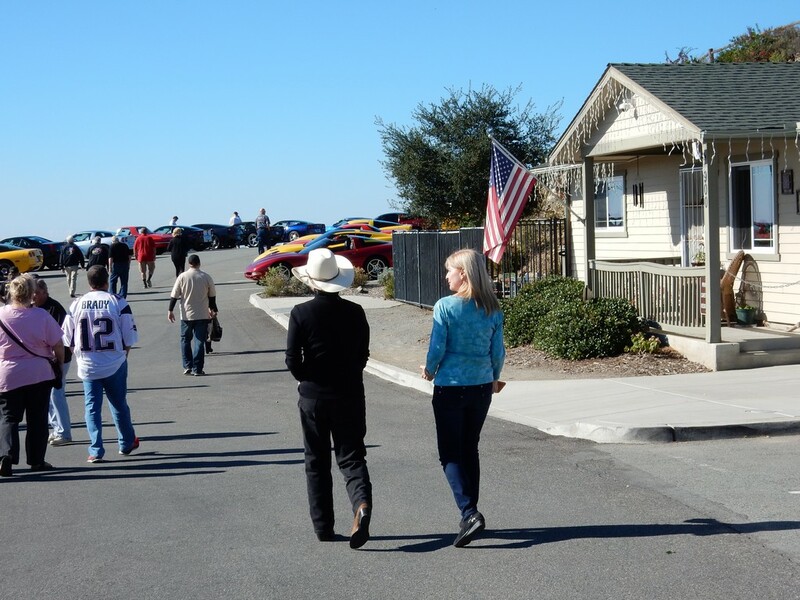 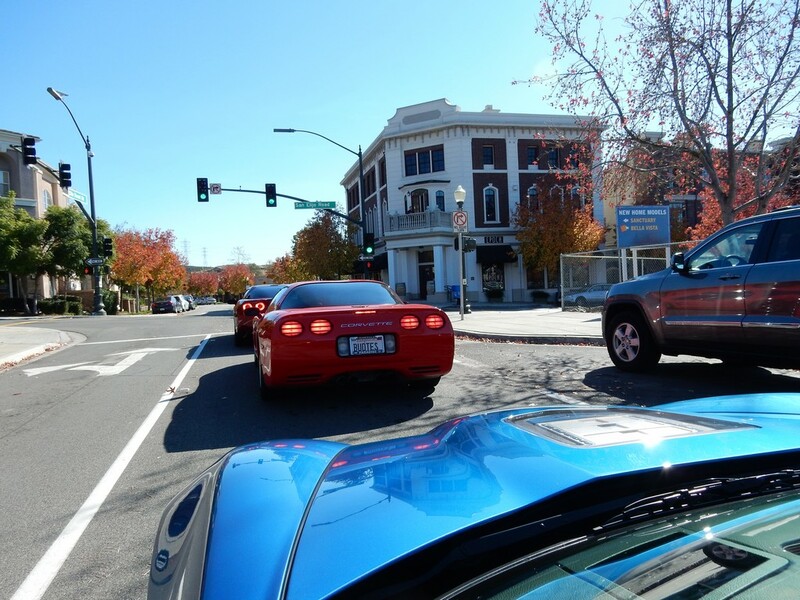 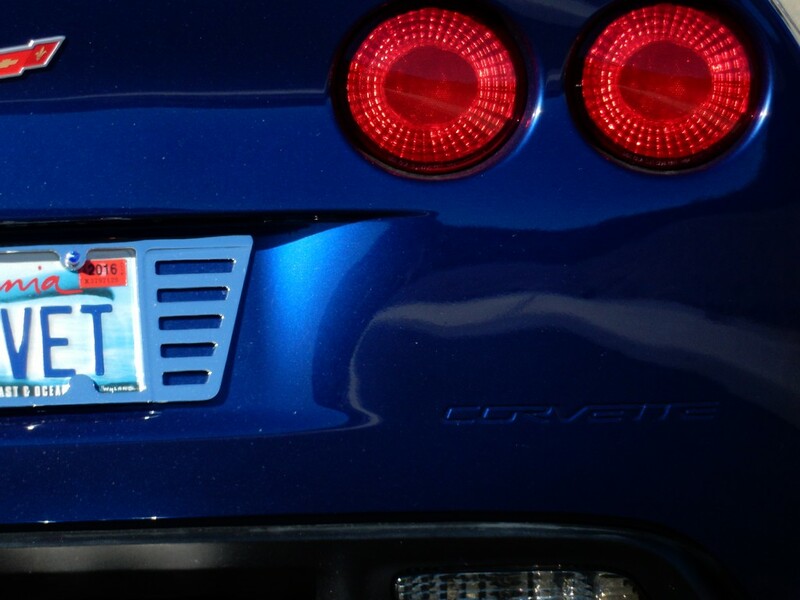 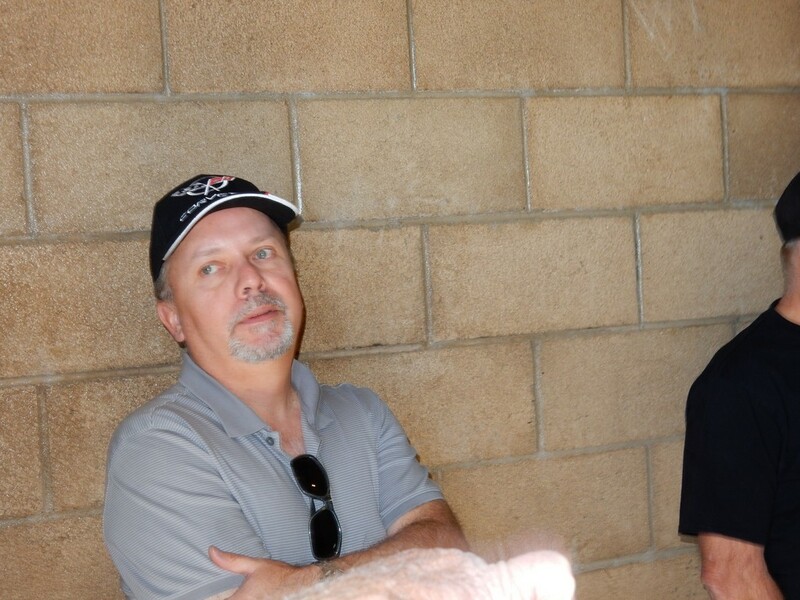 January’s general meeting will set us on the road to Corvette fun for the next year , so make sure to be there! 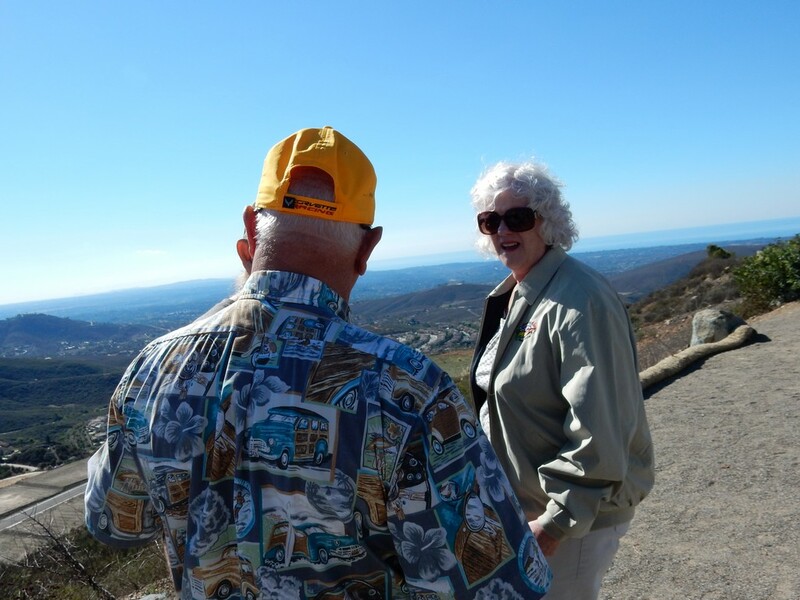 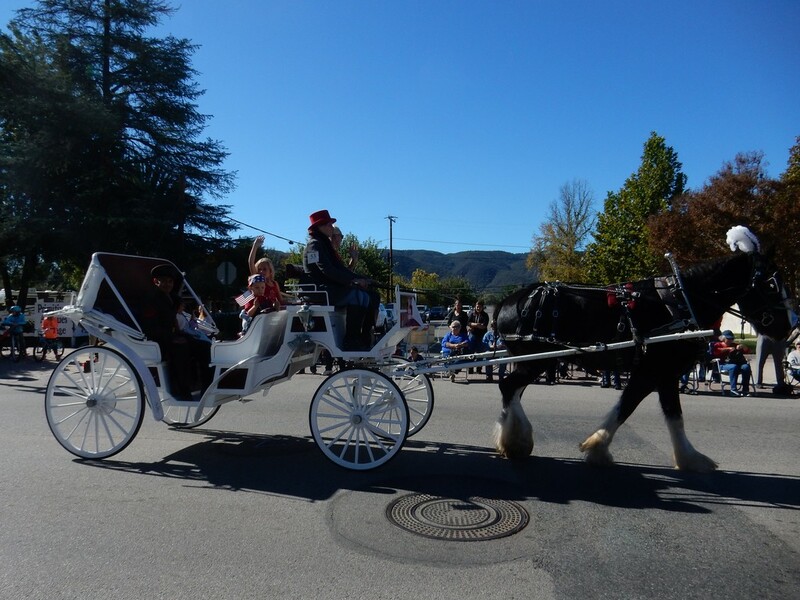 Hats off to Ray and Judy McIntosh and Curt and Darlena Stevens for taking us on a ride! 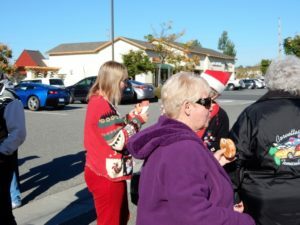 The pumpkins have been carved and then turned into pumpkin pie as we moved from the short Halloween Run to the slightly longer Thanksgiving Run. 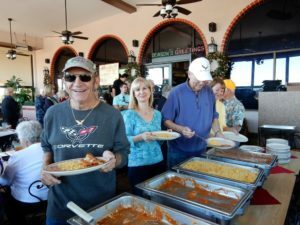 After The Priebes and Clarks outdid themselves with a long drive in September, the McIntoshes and Stevens tried to beat their record. Never say “we never go on long lunch runs” again! 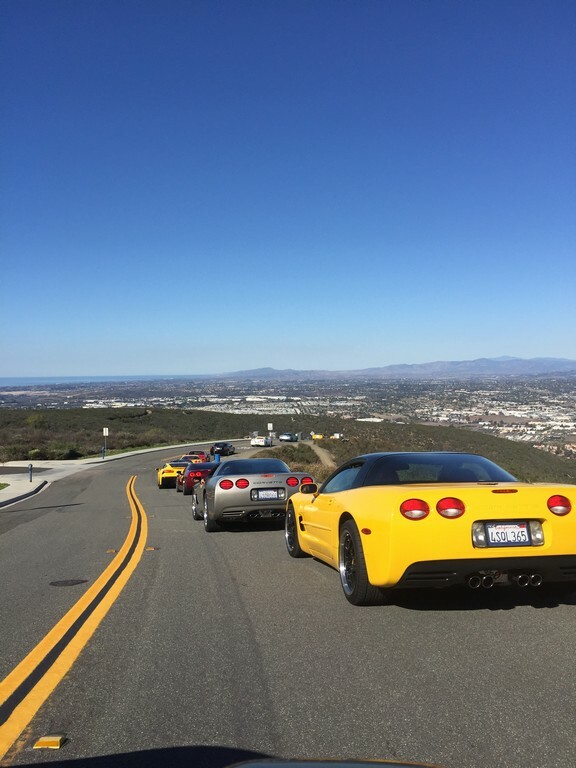 It is always an iffy proposition to plan a lunch run over a long holiday weekend. 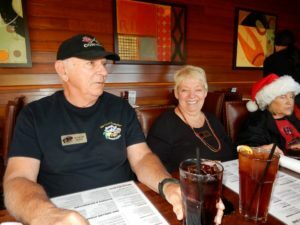 This was not Ray and Judy’s first time at bat for this duty, but with Curt and Darlena’s aid they pulled off another success. 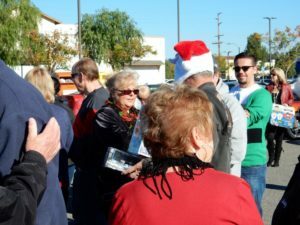 First of all, you can never tell how many people will be available and able to attend with everyone’s extended families to juggle. 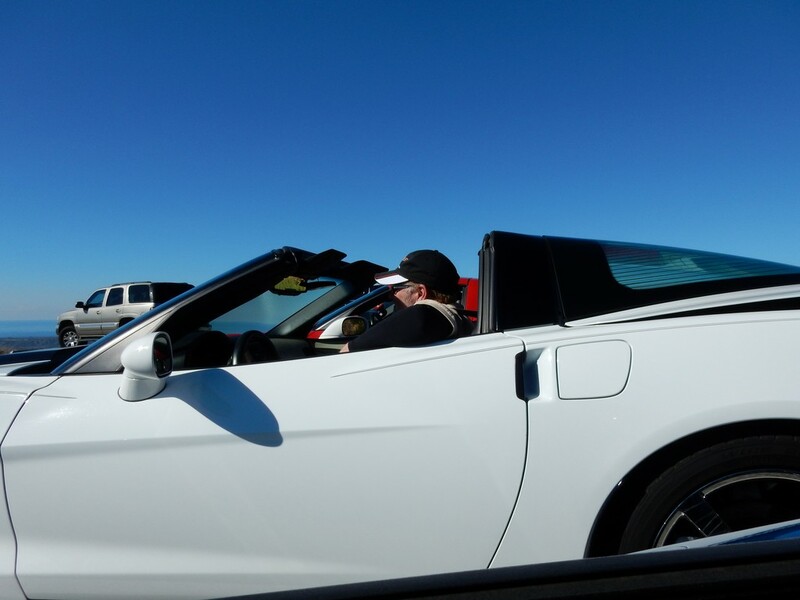 Then, you can never count on the weather. 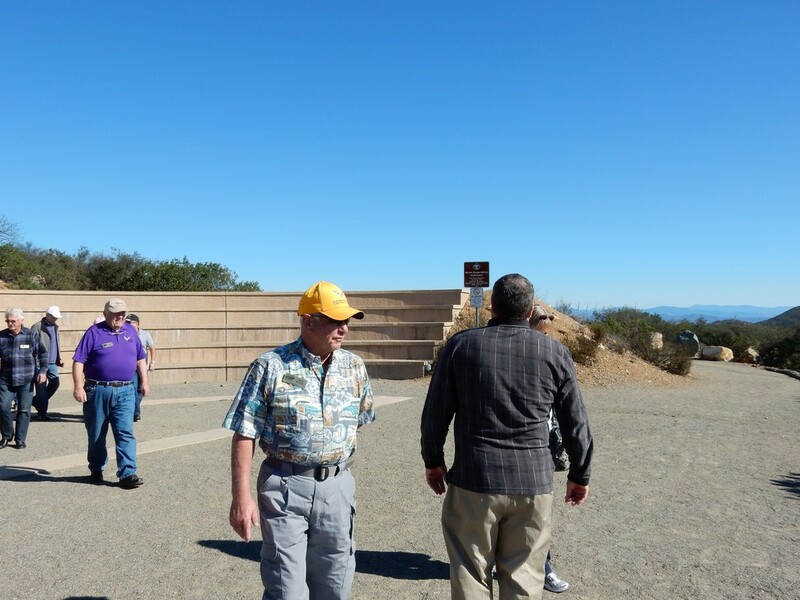 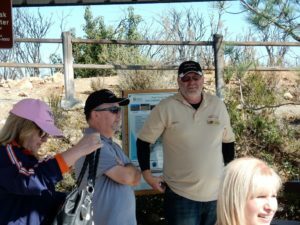 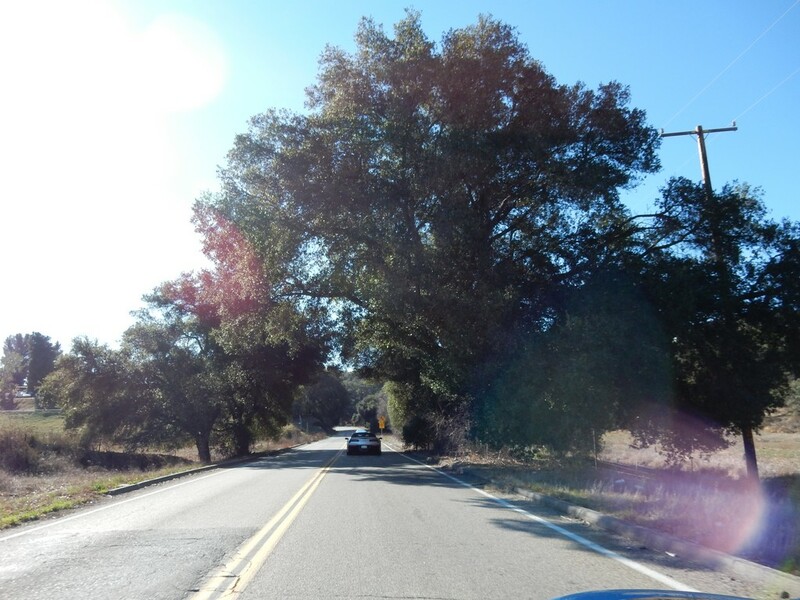 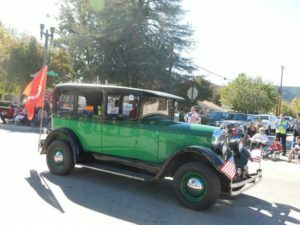 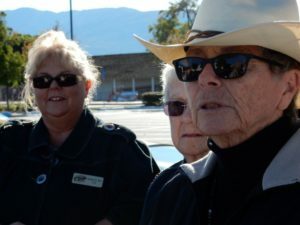 One year we ended up in ice and snow on Mount Palomar and Al Hackworth had his moment of fame on the television newscast as we tried to push cars off the ice and up the road. 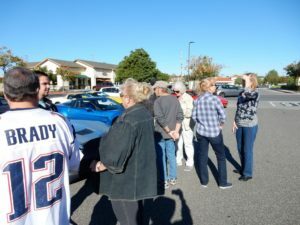 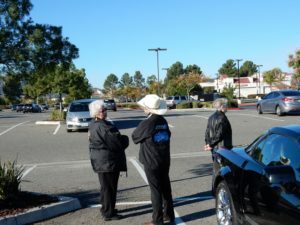 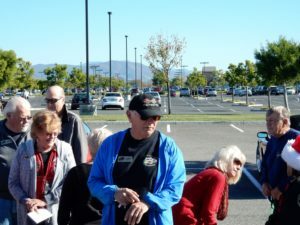 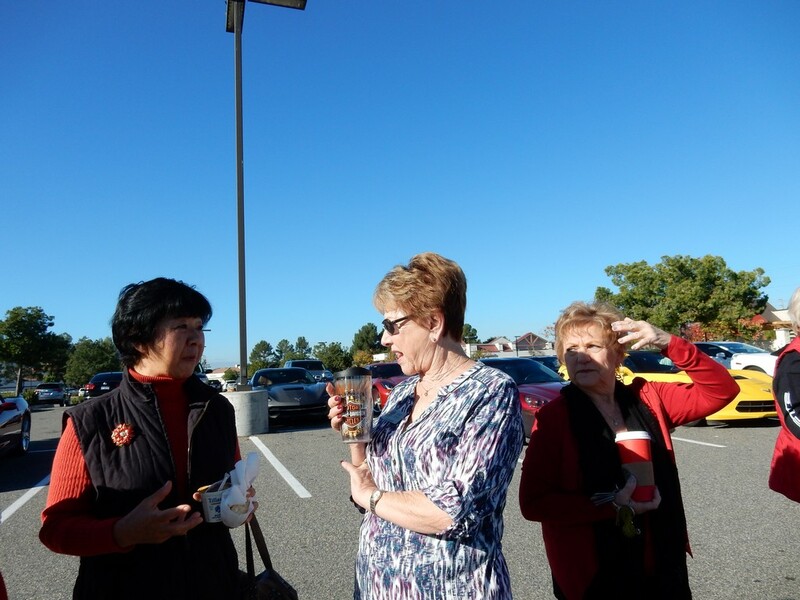 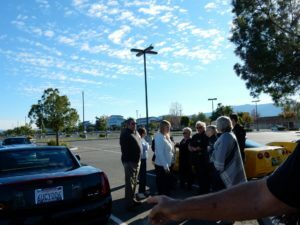 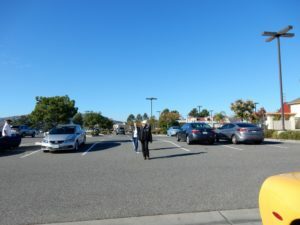 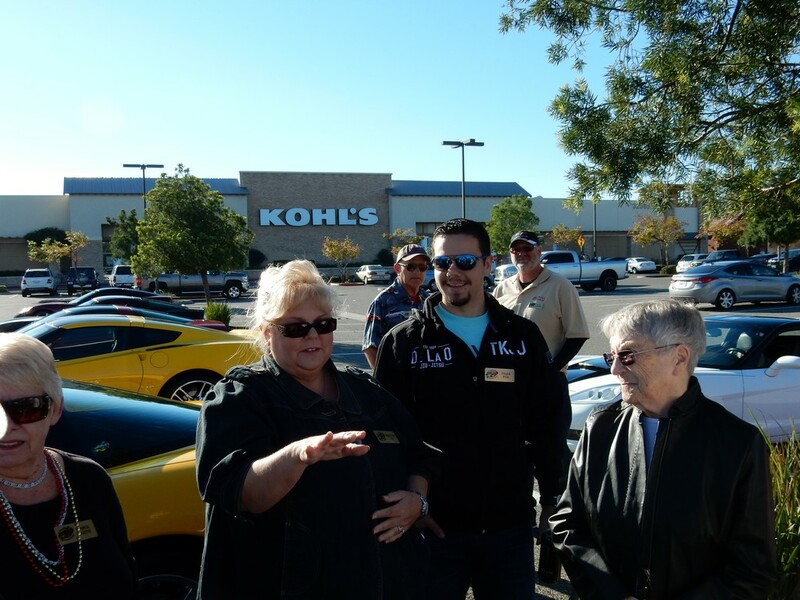 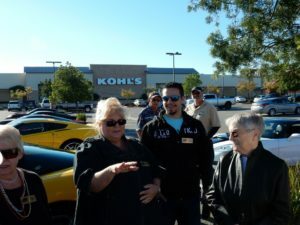 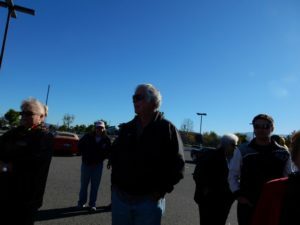 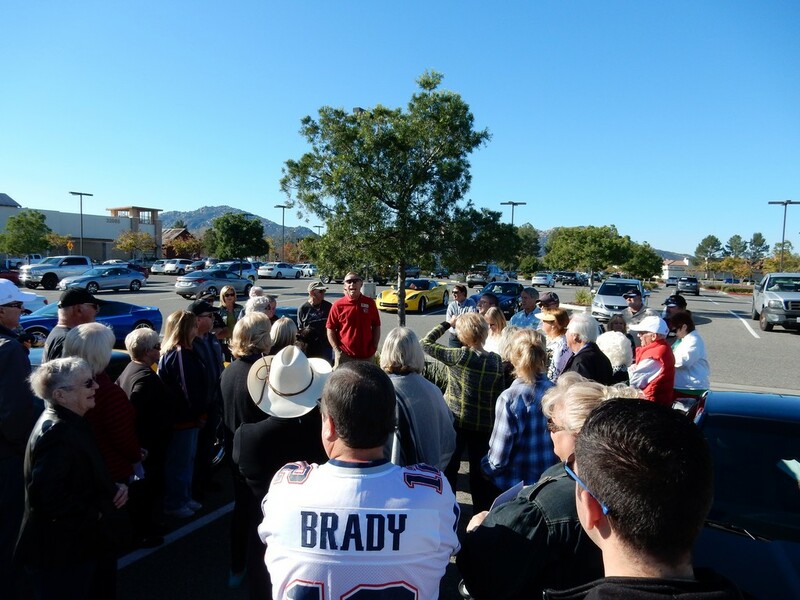 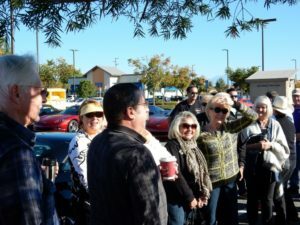 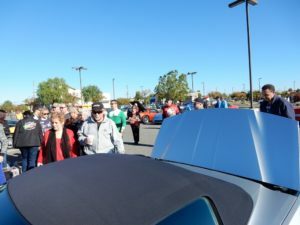 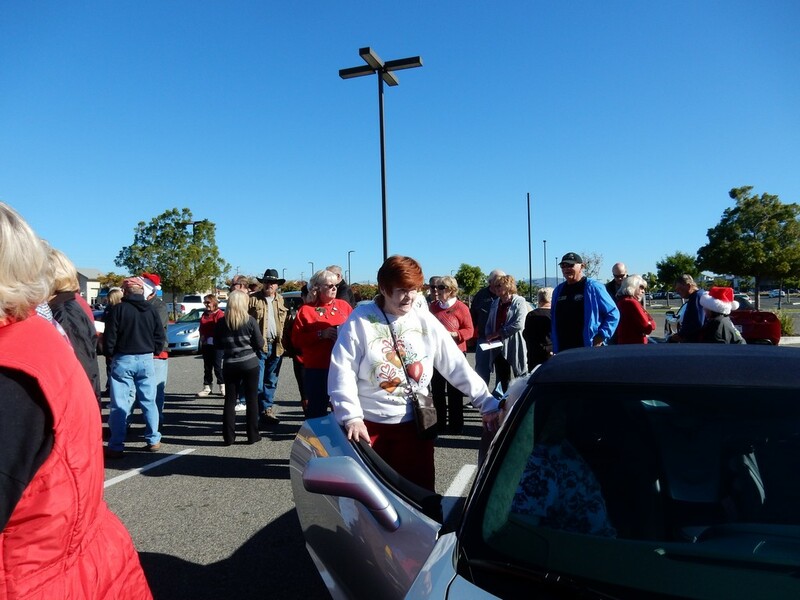 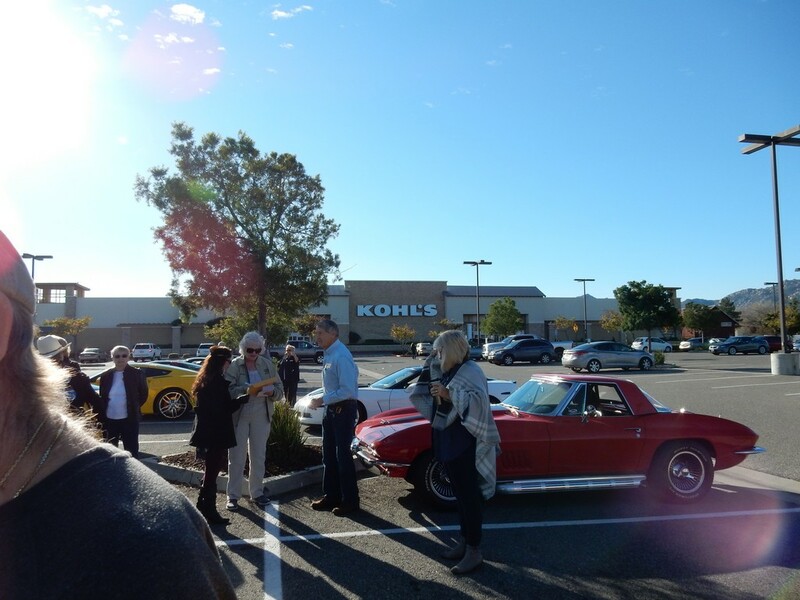 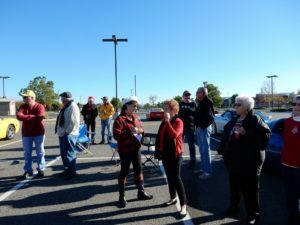 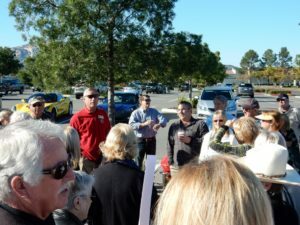 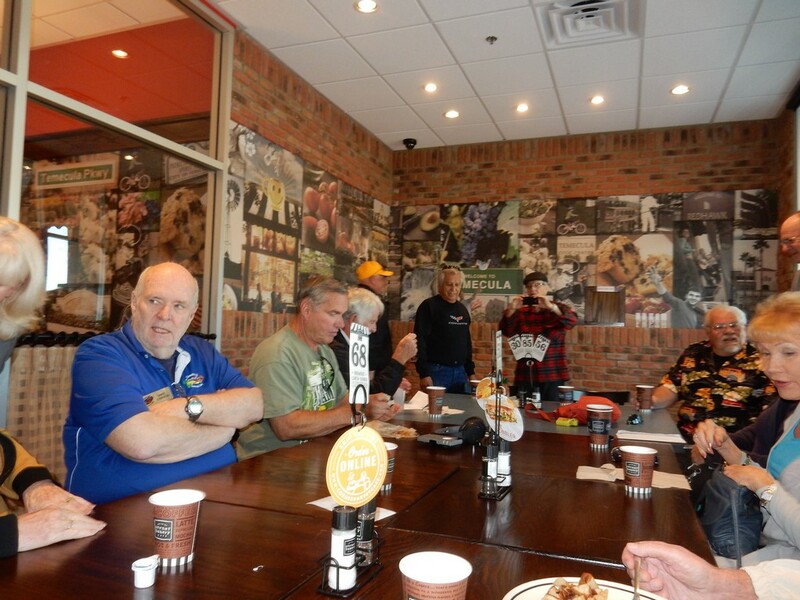 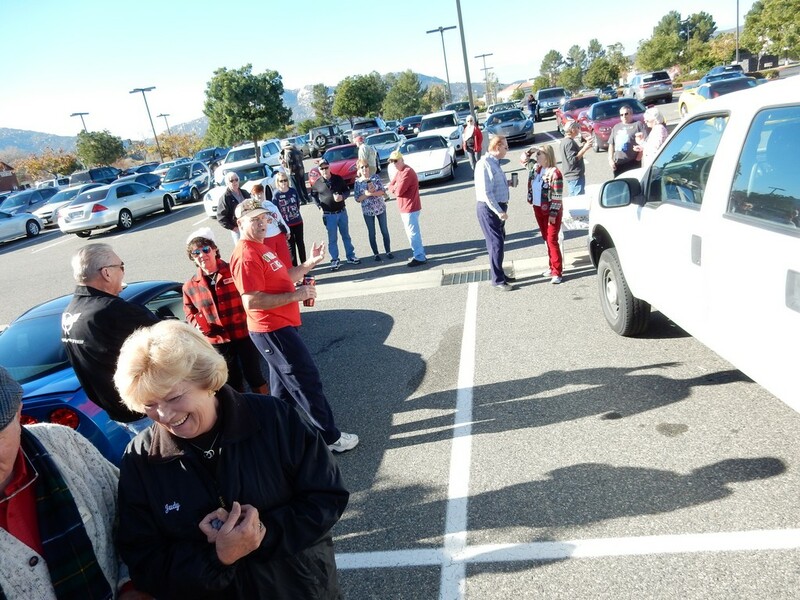 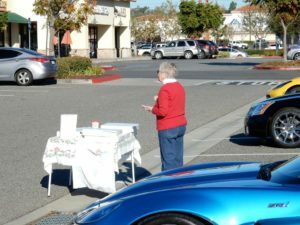 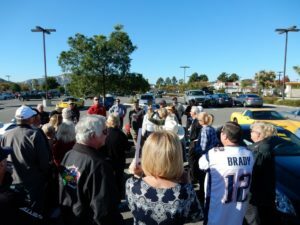 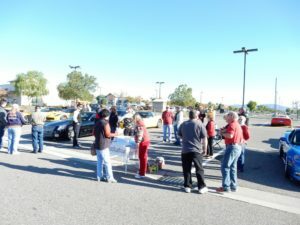 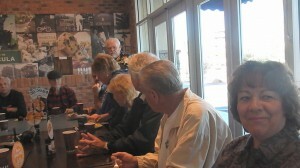 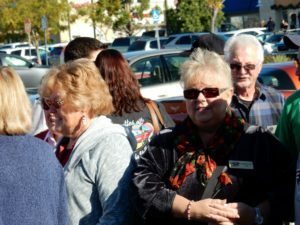 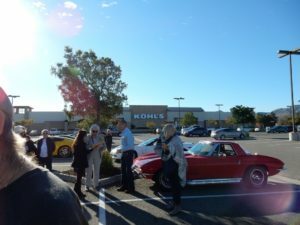 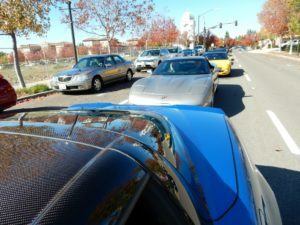 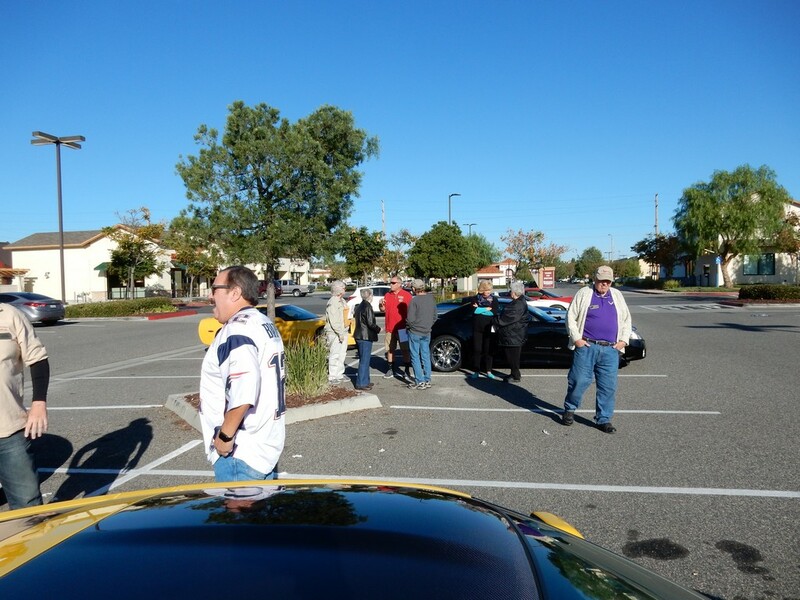 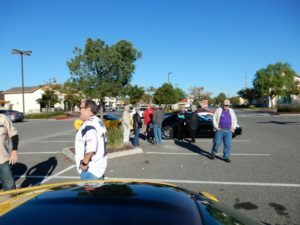 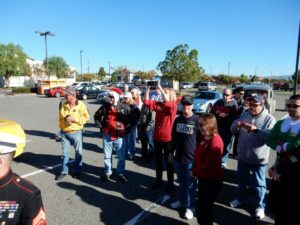 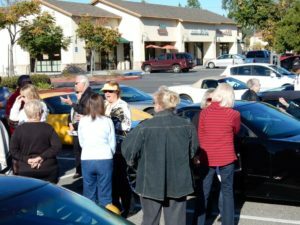 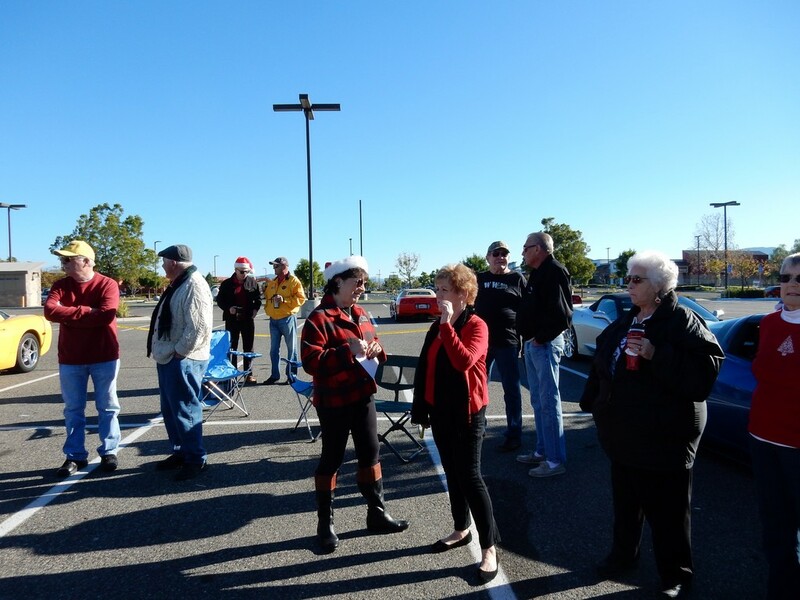 We had 30 cars and 54 drivers and navigators leaving the Kohl’s meeting place at 9:30am. 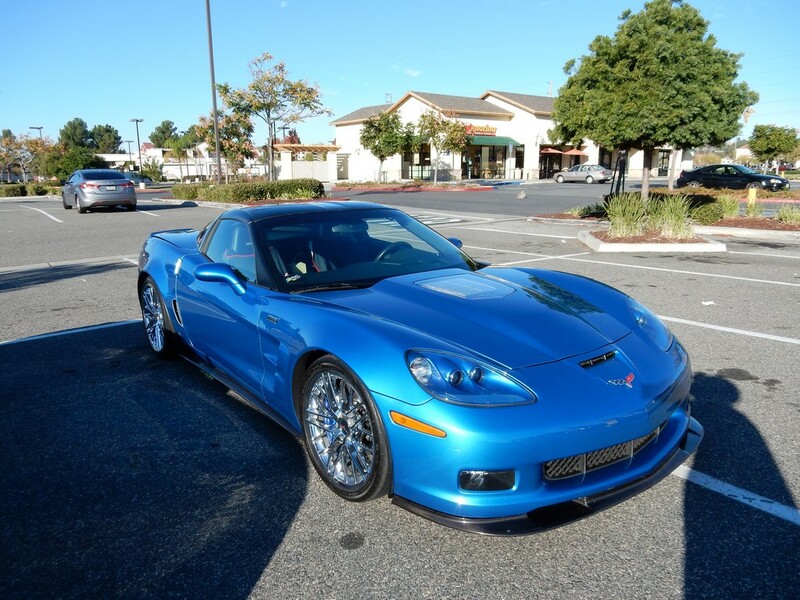 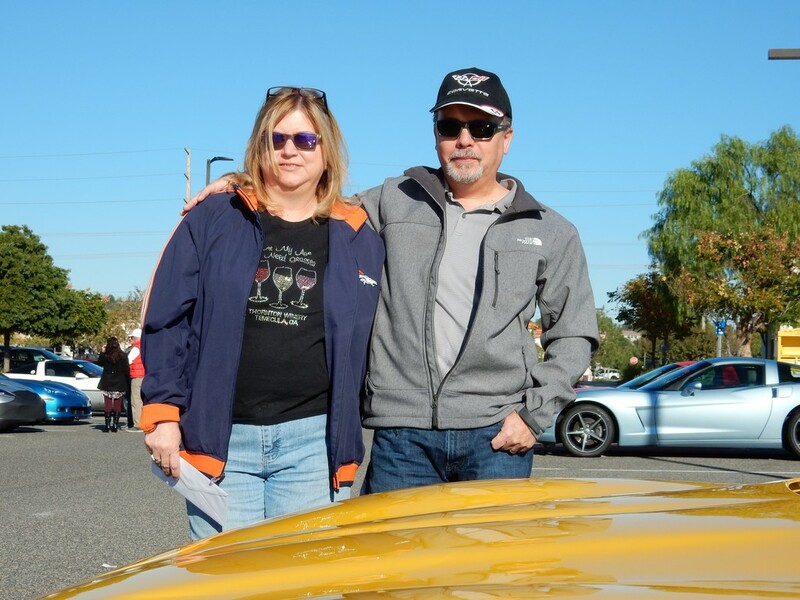 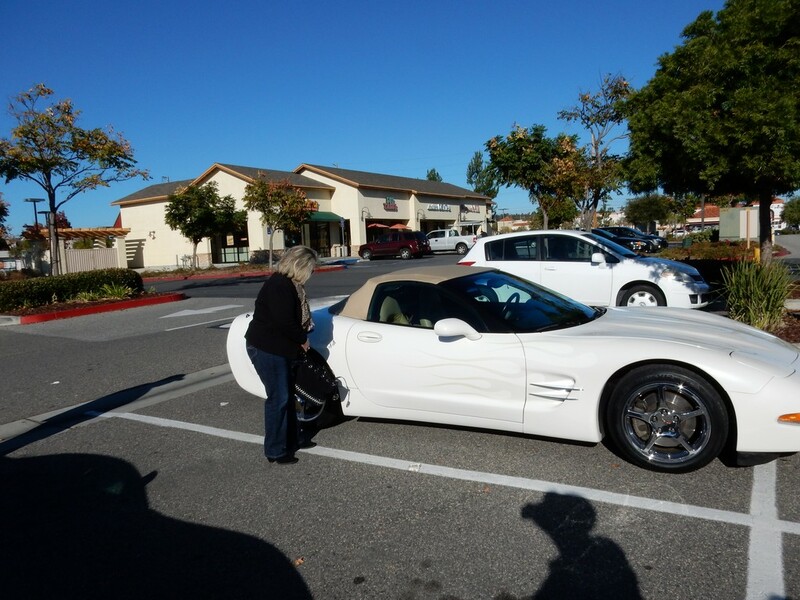 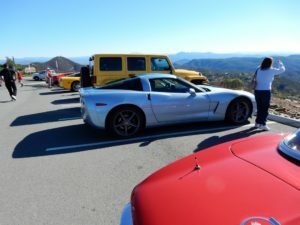 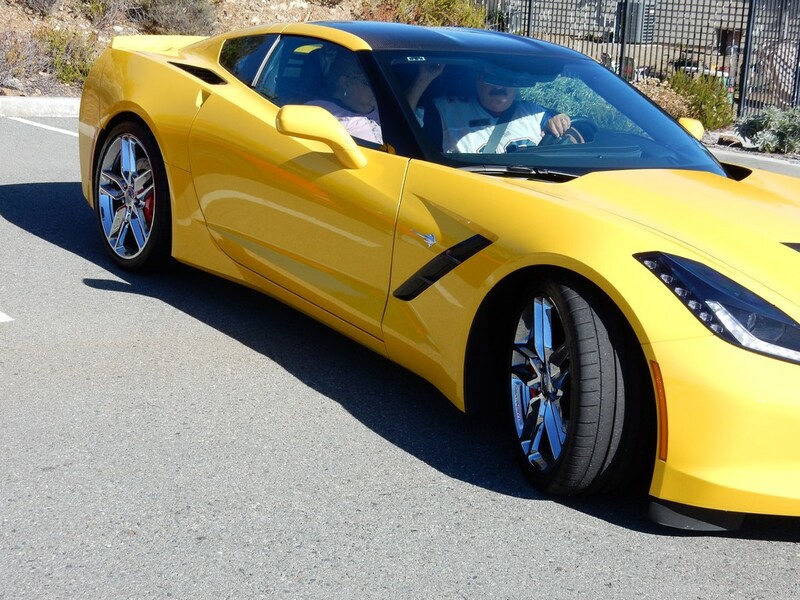 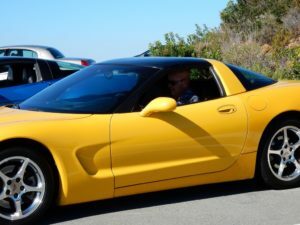 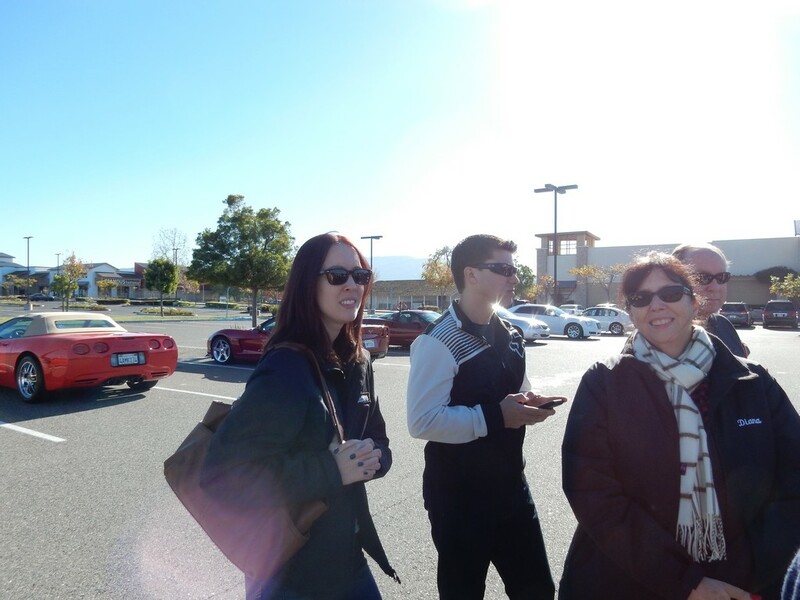 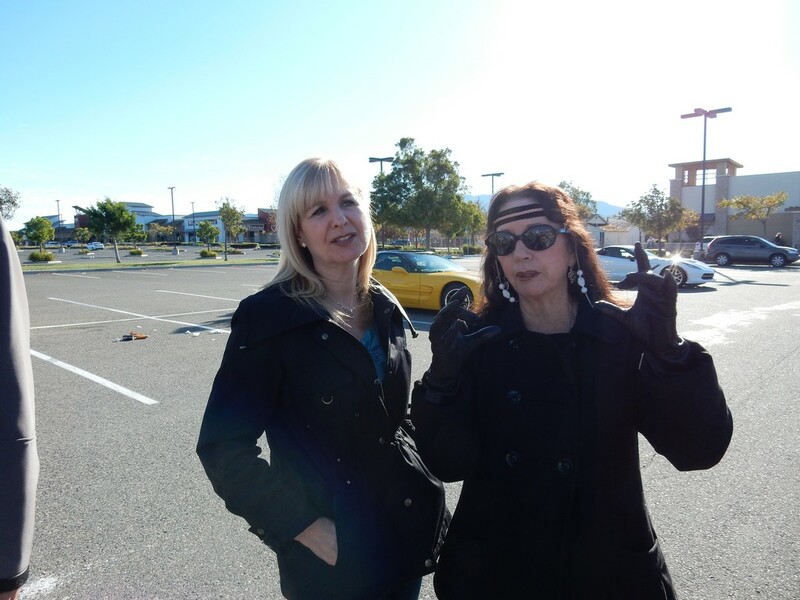 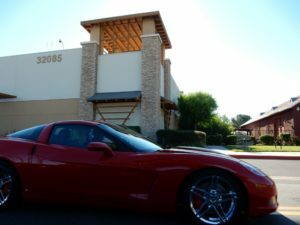 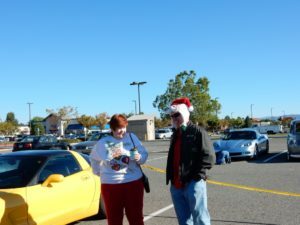 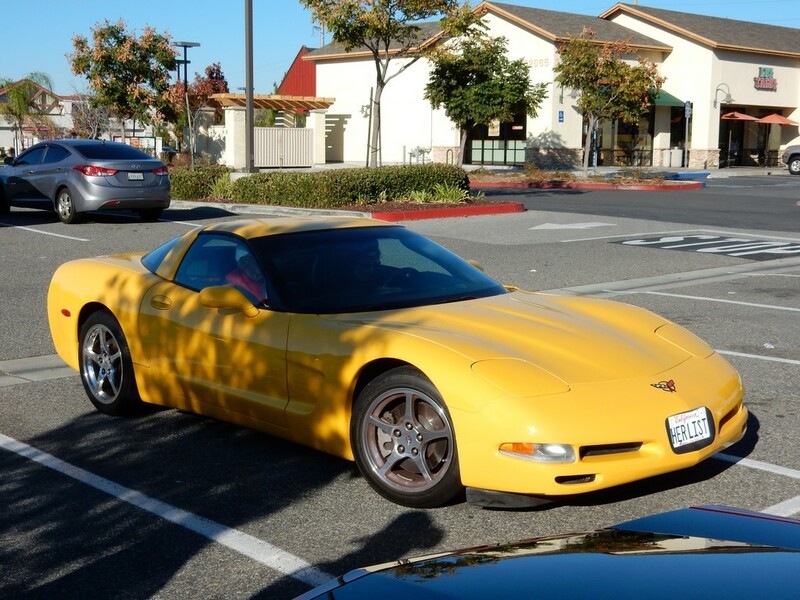 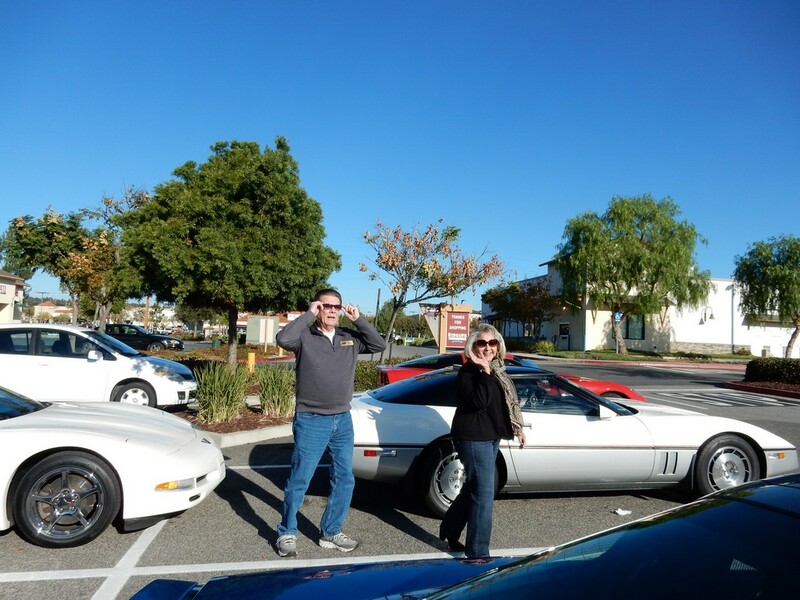 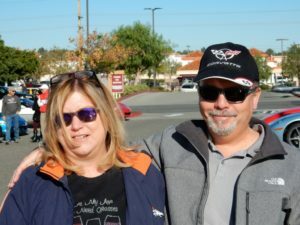 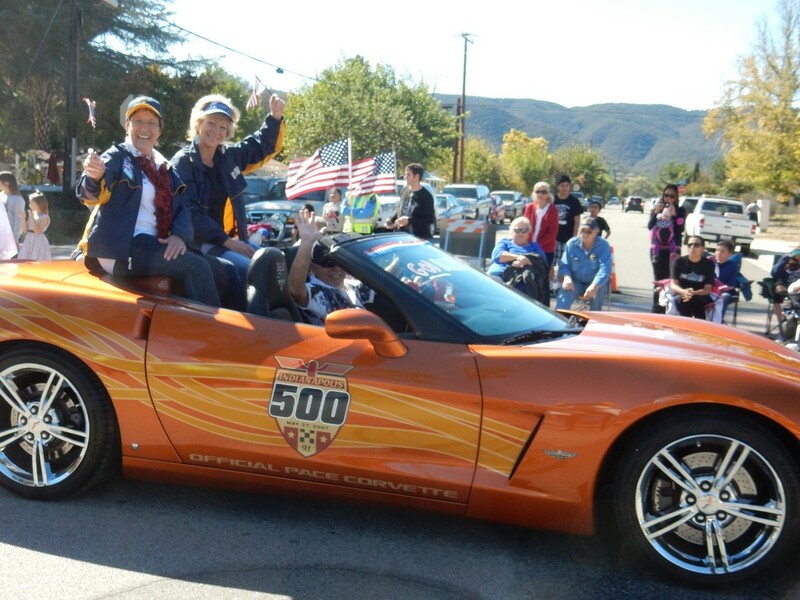 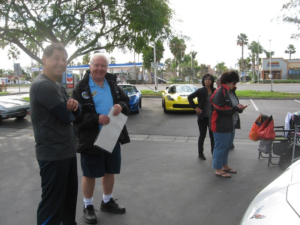 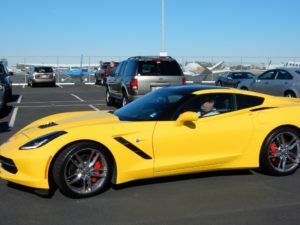 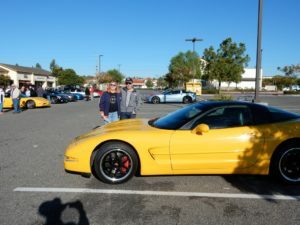 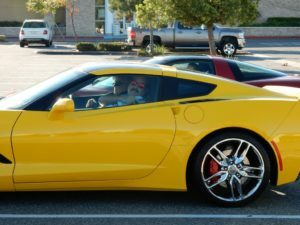 Tony and Corina found us on the website and joined the fun in her dream car, a yellow Corvette. 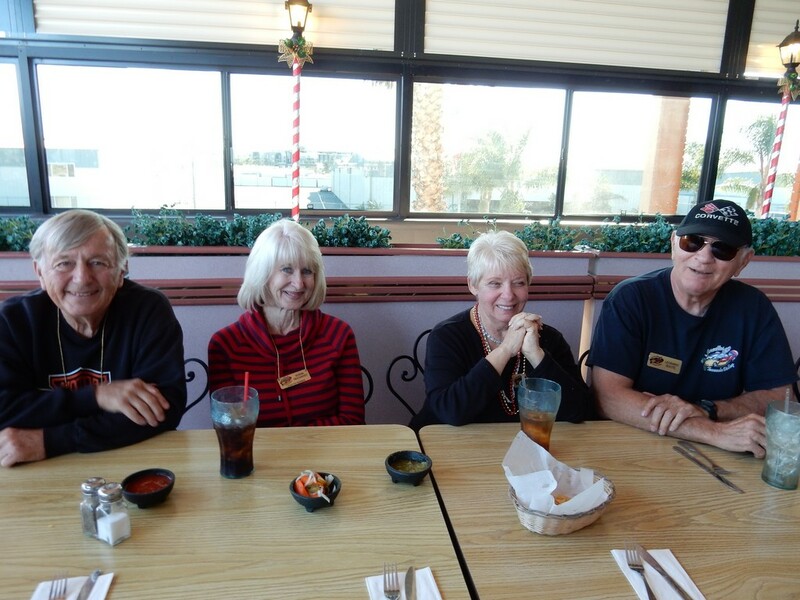 We hope they will be new members for the new year. Dave Wilensky, a new member who brought his brand new car in October, brought his wife, Ellie, as well this time and we look forward to seeing her lots in the future. 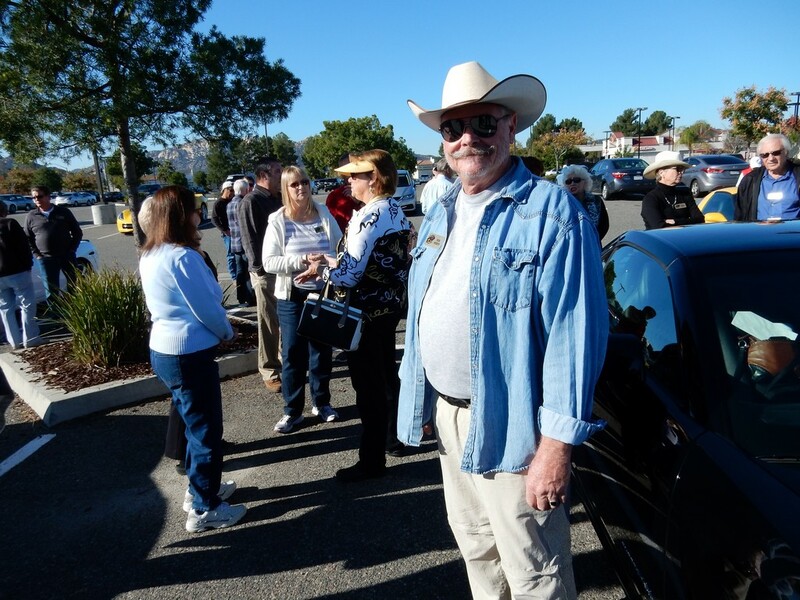 Rick and Donna DeMarco who joined COTV at our November meeting and come from the San Diego Club brought their 2001 Pewter Coupe. 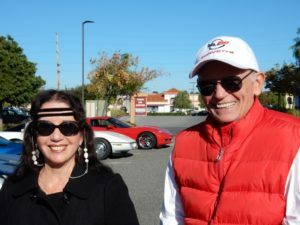 Fred and Tyler Fox brought Mo along for her first MLR – how lucky for her it was such a long ride with so many tight curves. 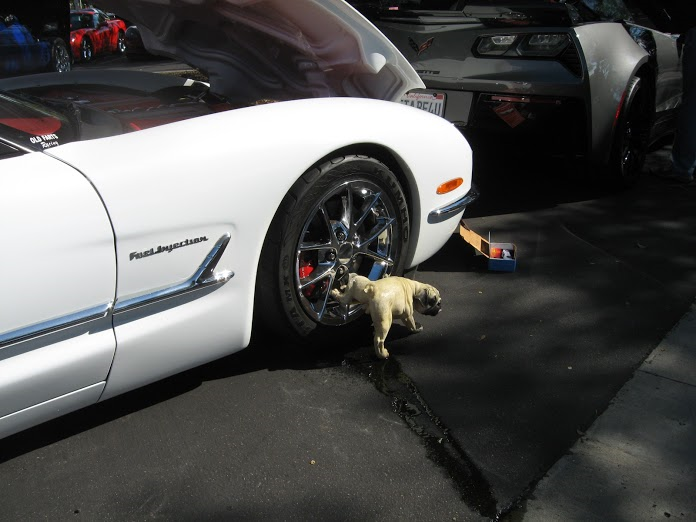 We hope it didn’t deter her from joining us next time. 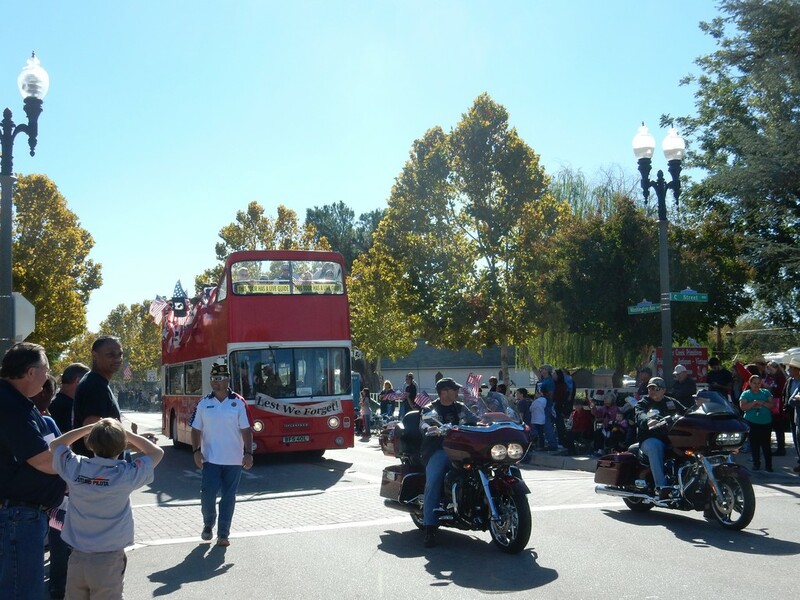 We promise that not all the rides are that tricky! 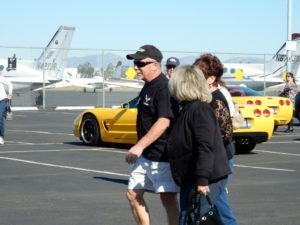 Skip Hipp and Terry Converse came solo as their wives had other plans. Steve Glenore was also a single. Norm Craig put in his winter appearance as boating season comes to an end. 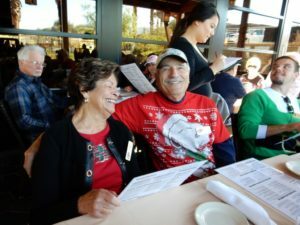 The Webers were a family of three as Joan Crawley, Daryl’s Mom and COTV’s senior member, is here for 6 weeks for the holidays. 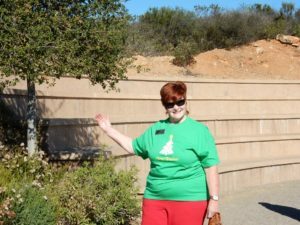 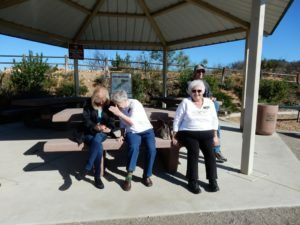 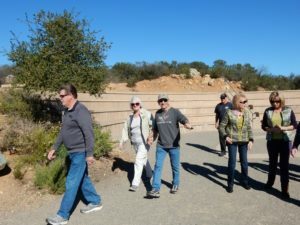 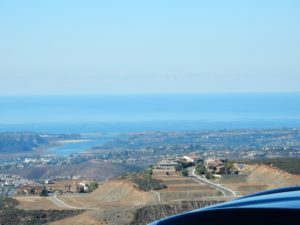 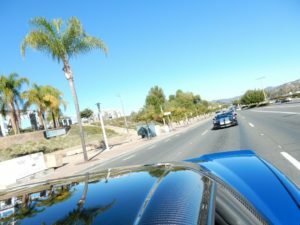 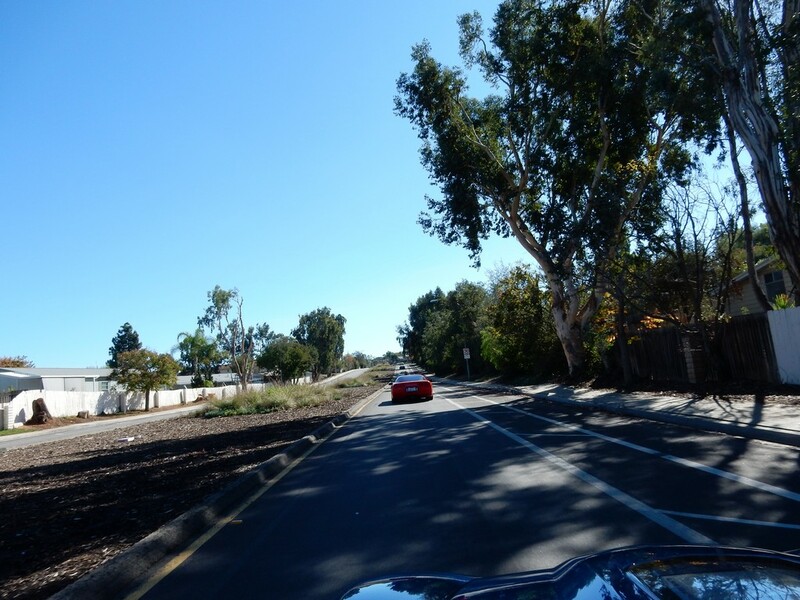 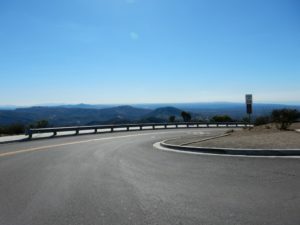 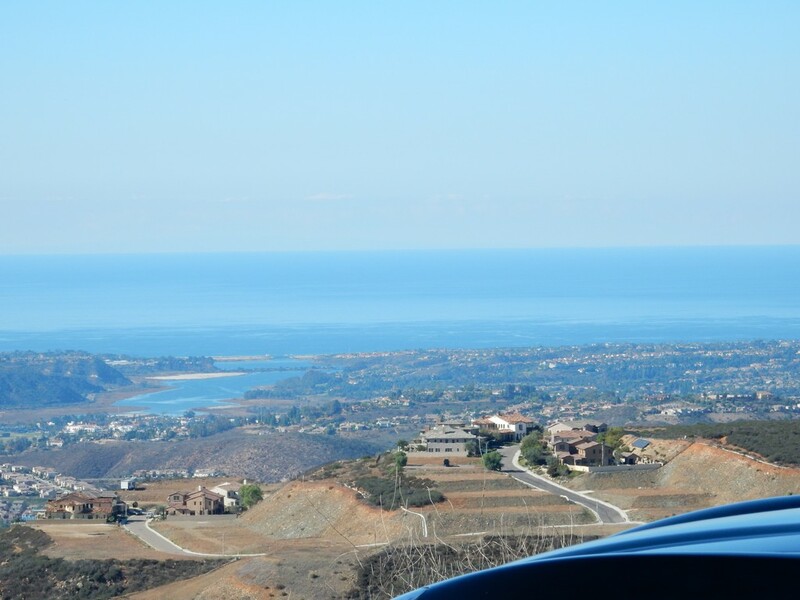 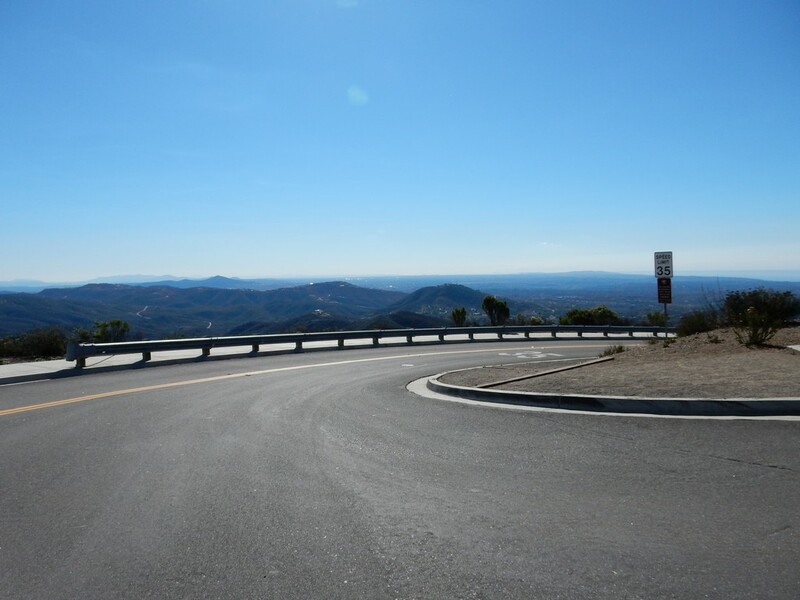 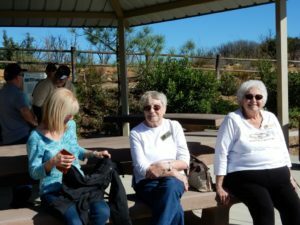 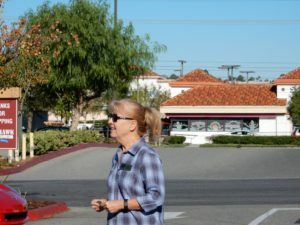 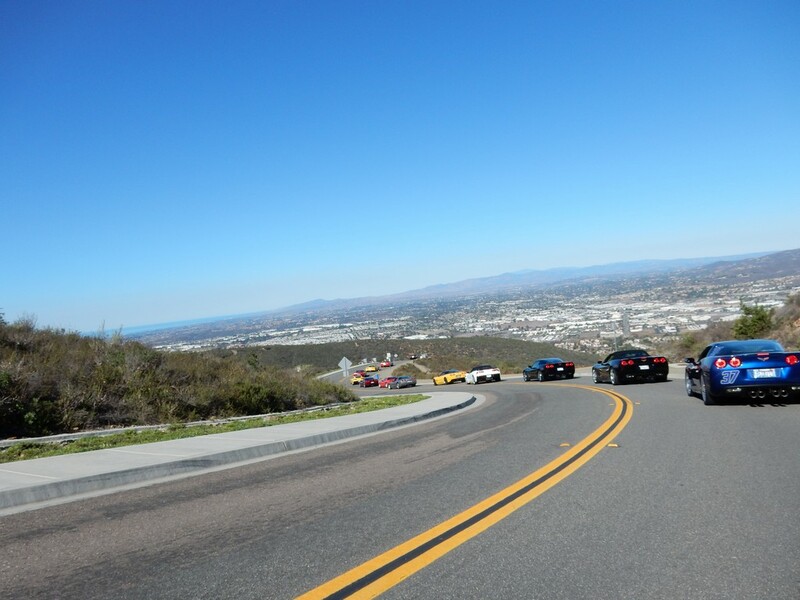 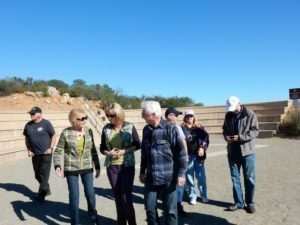 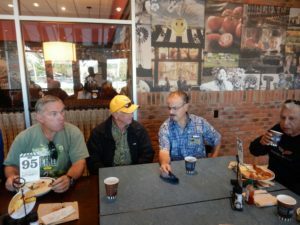 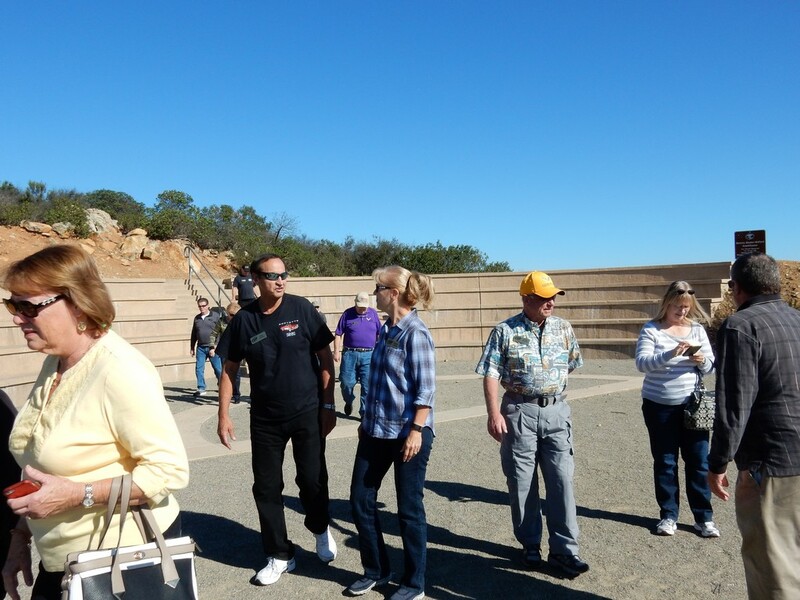 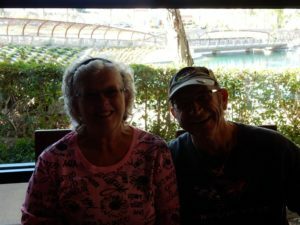 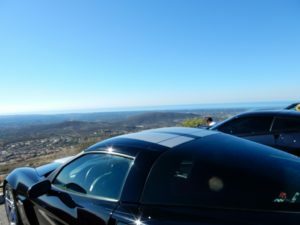 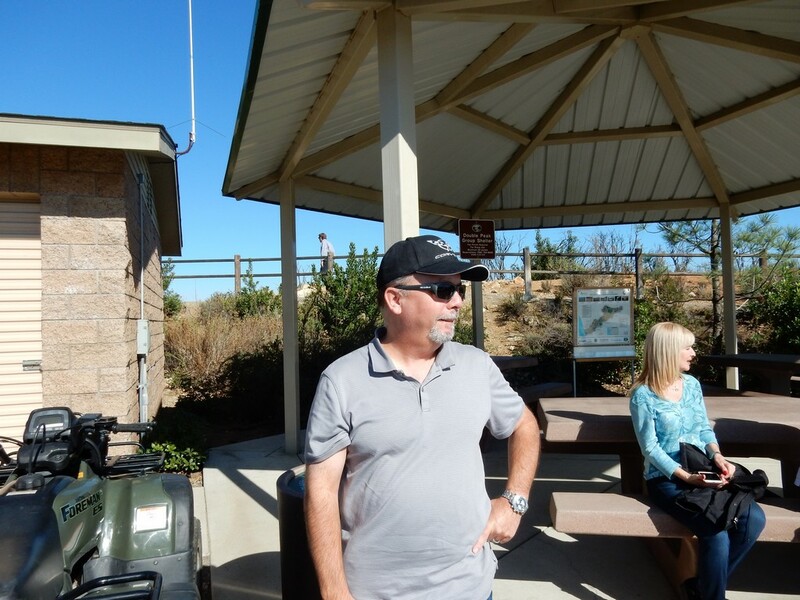 The route for the ride was convoluted to say the least as we wound through Pechanga and Pala, Rice Canyon, past the Lawrence Welk resort, through southern Riverside county and into northern San Diego county. We thought we might have been headed to Bob and Monica Clark’s for lunch, but she didn’t sound like she had prepared for 54 hungry folk. Our mid-run potty break was at the Double Peak Park in San Marcos, with unbelievable views out over the hillsides all the way to the ocean. 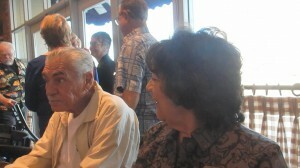 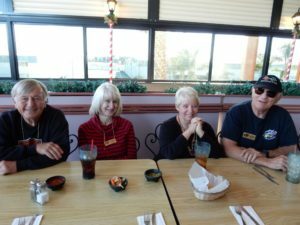 It was the first time there for possibly everyone but Ray and Judy. 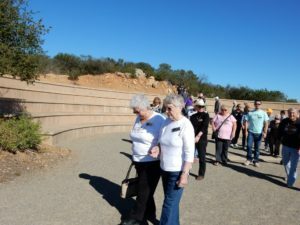 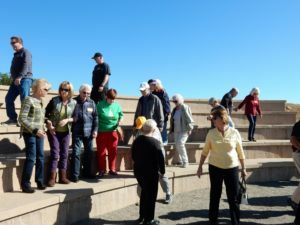 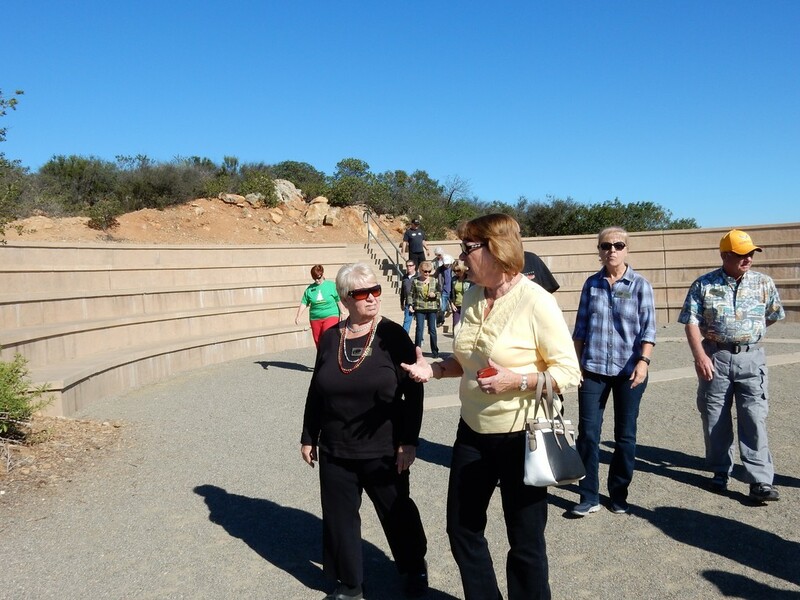 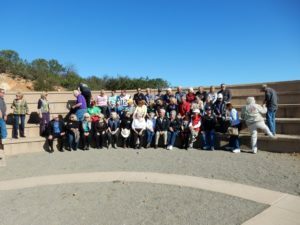 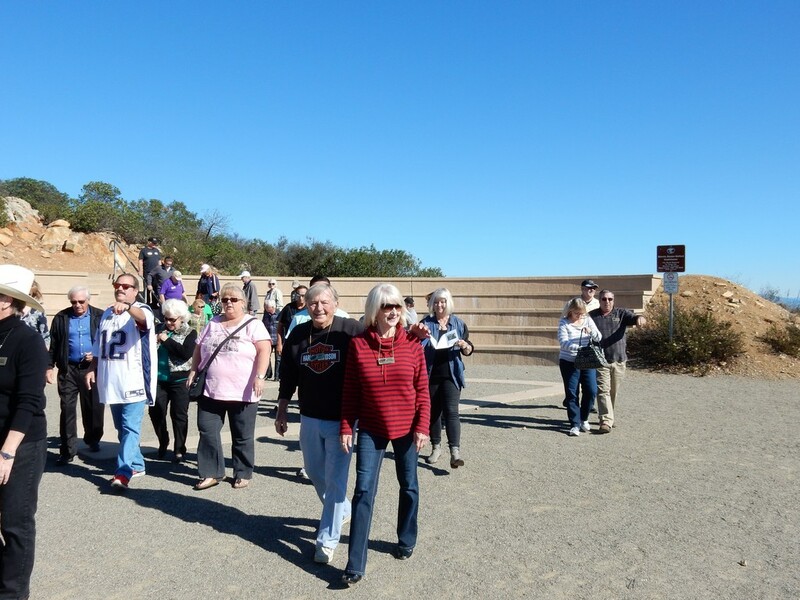 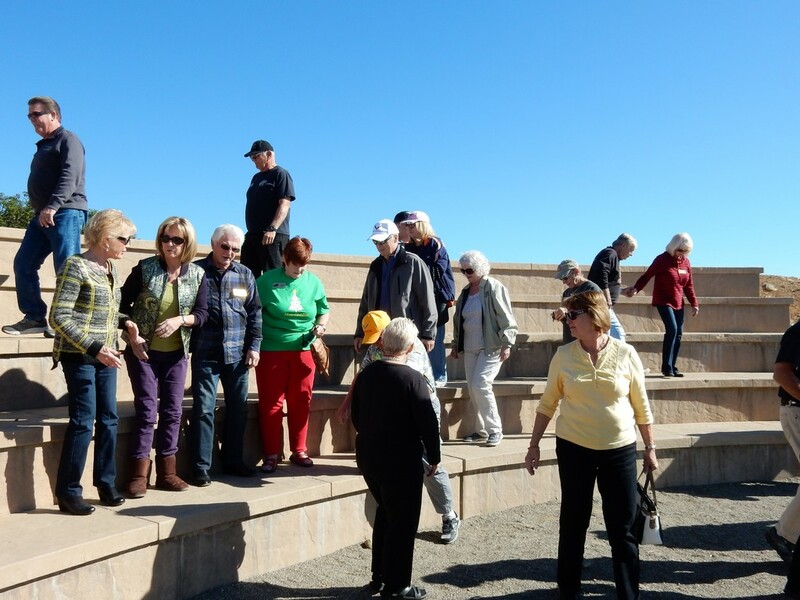 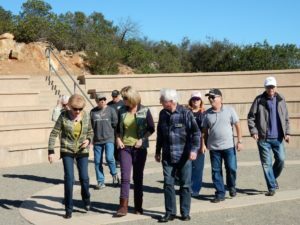 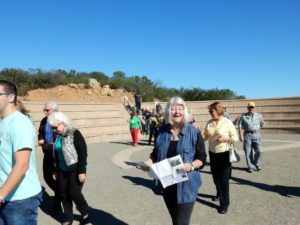 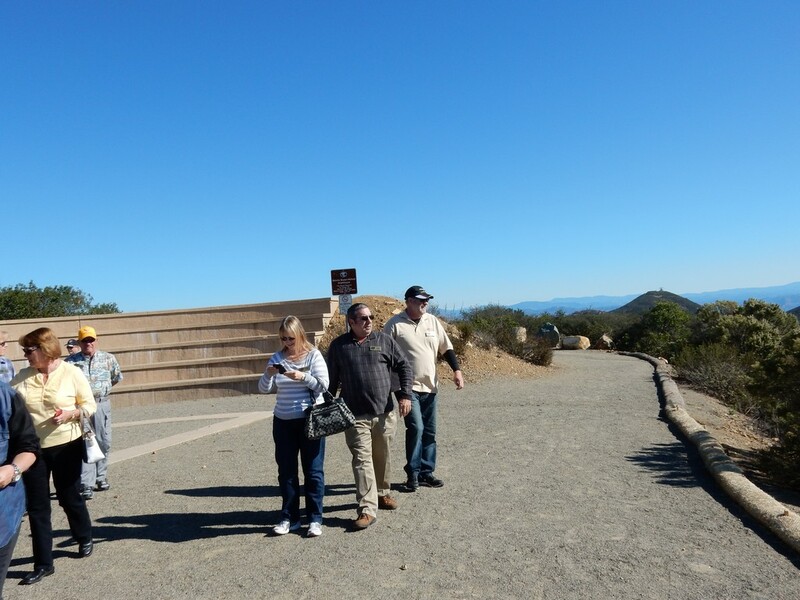 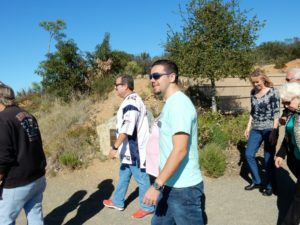 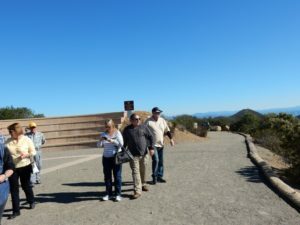 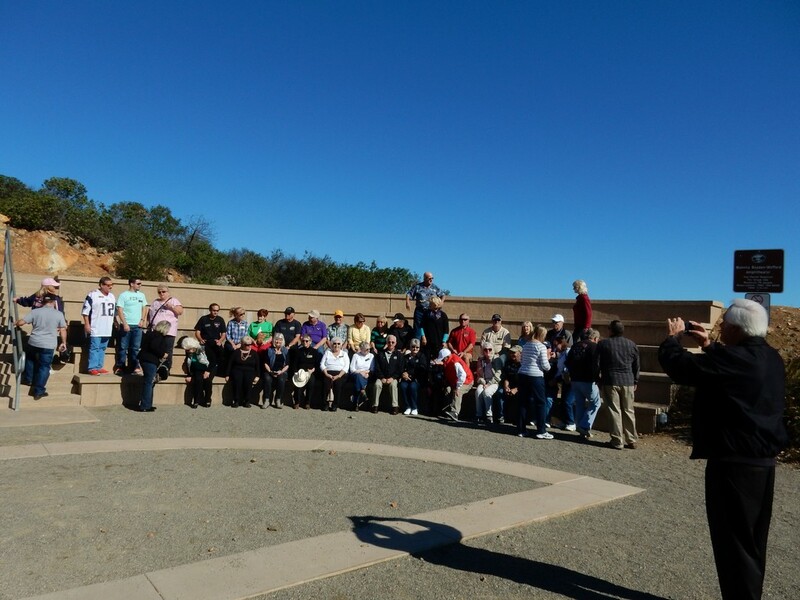 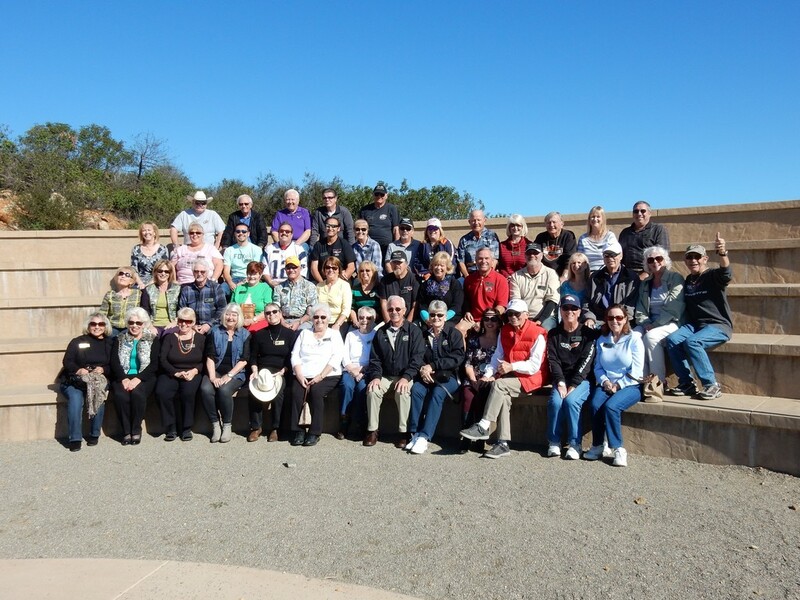 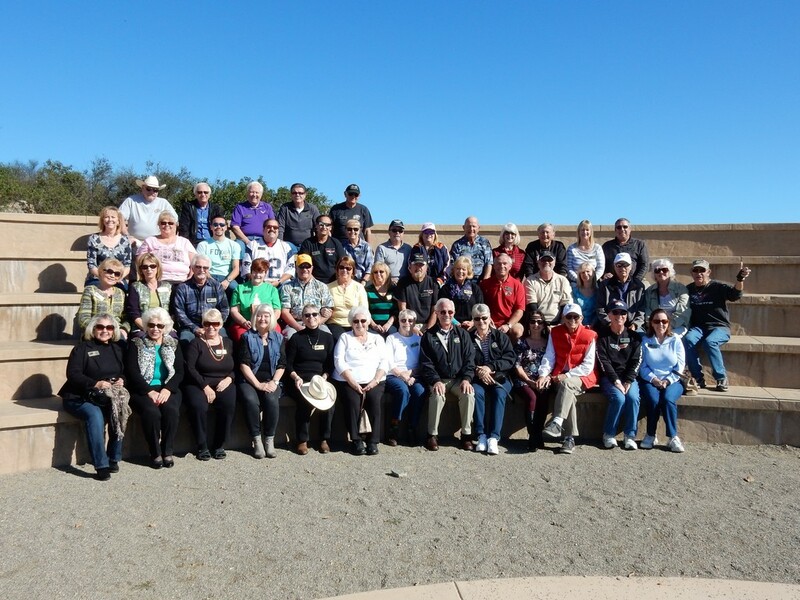 After a group photo at the Park’s amphitheater, we headed out through the Elfin Forest (how romantic does that sound!) 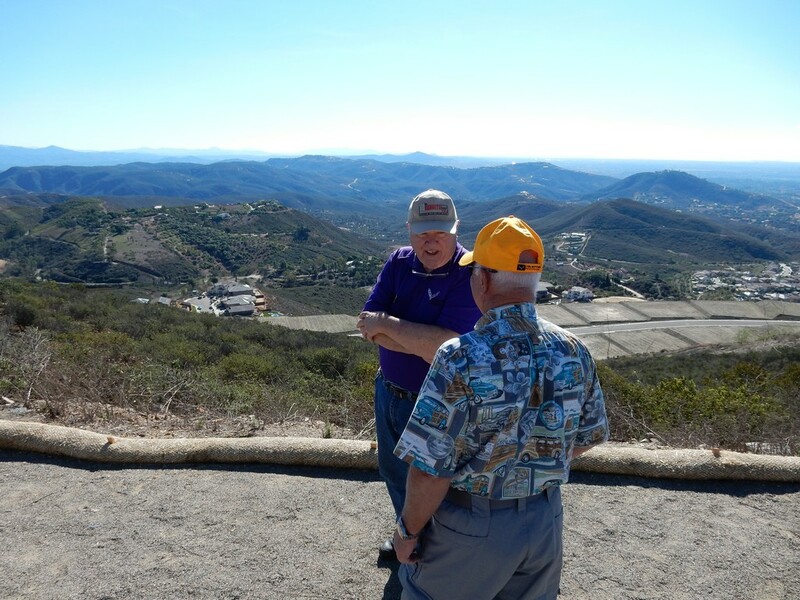 and on into San Diego territory. We took a slight detour on the 15 Fwy southbound, but then got back off onto surface roads, seeing freeway only in the distance. 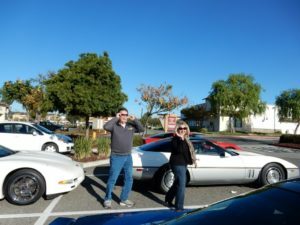 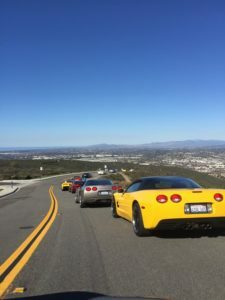 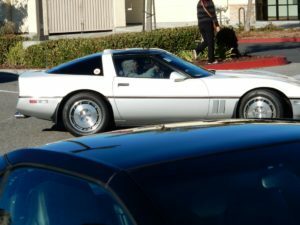 Some of the route was difficult to negotiate with 29 Corvettes and Daryl’s not-a-Corvette, so we had several stops to regroup after we lost formation through lights and stop signs. 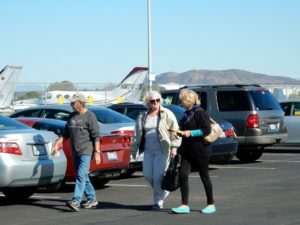 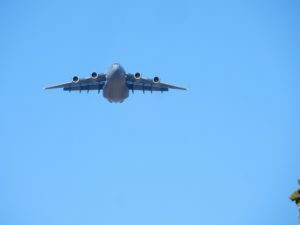 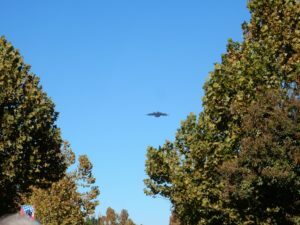 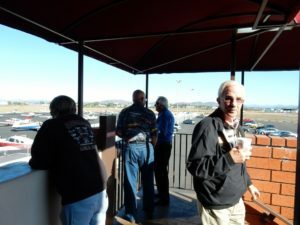 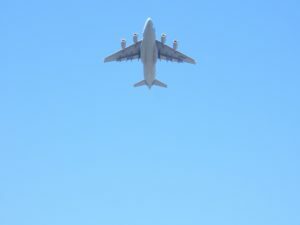 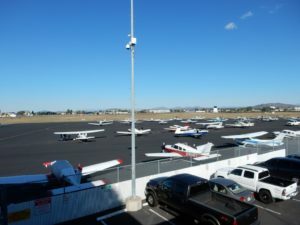 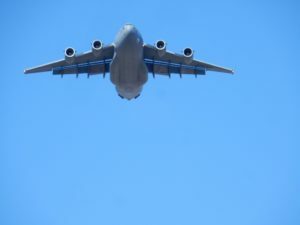 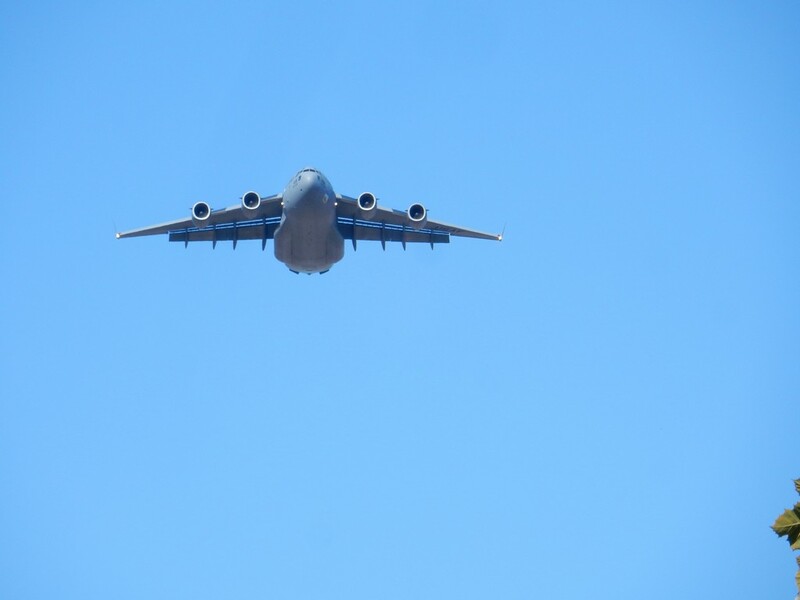 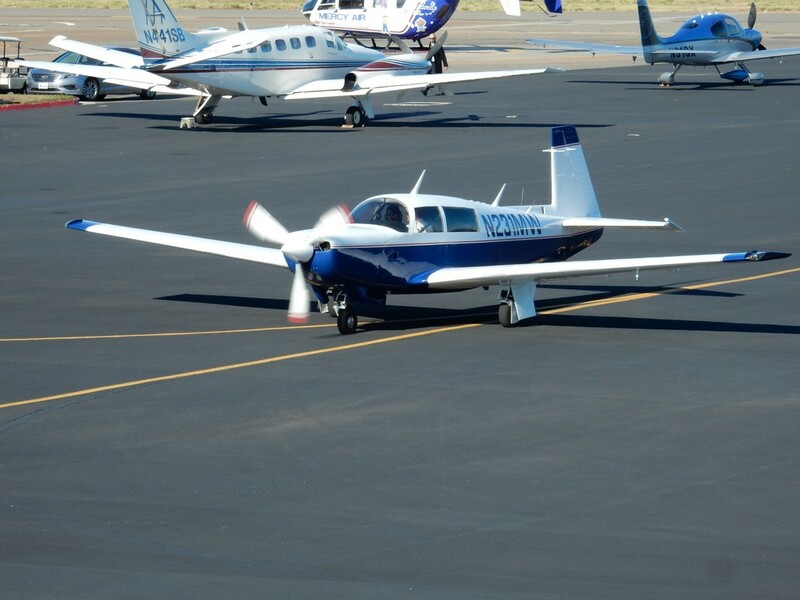 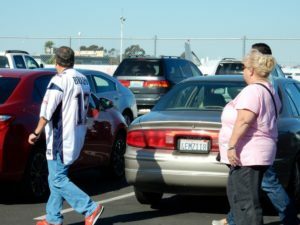 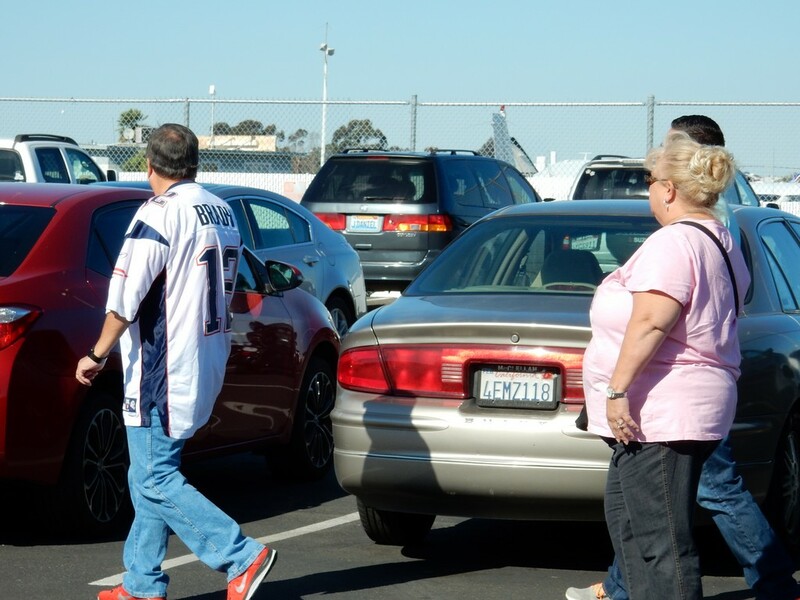 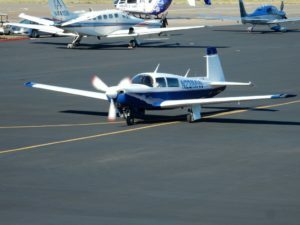 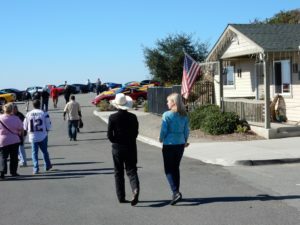 Finally, with stomachs growling fiercely, we made the last turn at the last signal and pulled into the parking lot at San Diego’s Montgomery Field. 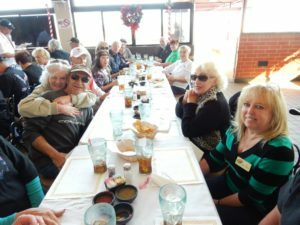 Our group took over the patio at the Mexican Bar and Grill for a Mexican buffet of rice, beans, cheese enchiladas, the makings for beef/chicken combo fajitas, flautas, and very good guacamole. 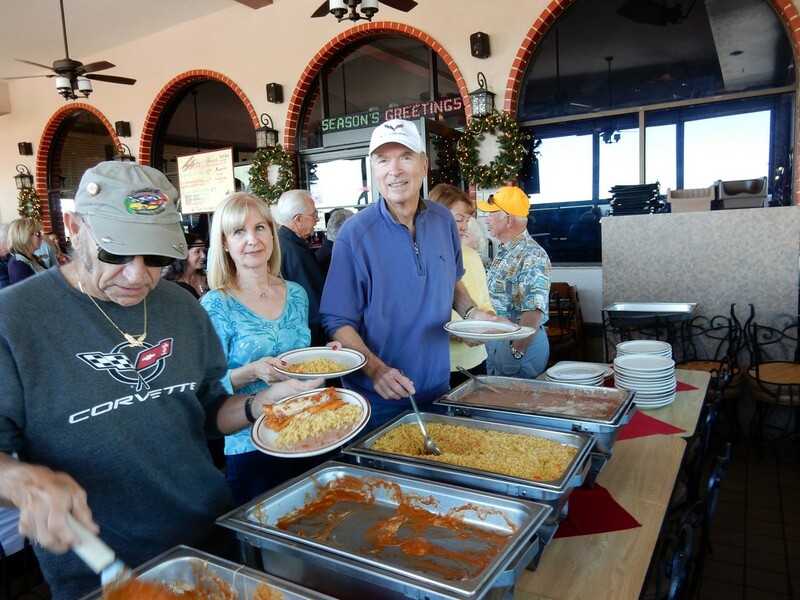 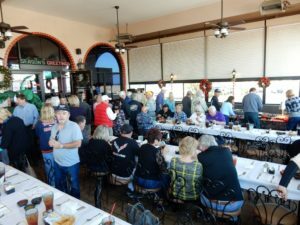 Looking around the many tables, we didn’t see anyone going hungry and boy, COTV knows how to eat, whether it be Mexican, breakfast brunches, or just about any meal. 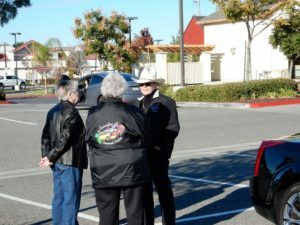 We all headed our own ways home after the meal and many goodbyes and promises to see each other at the Christmas Party next Sunday and the Toy Run on the following Sunday. 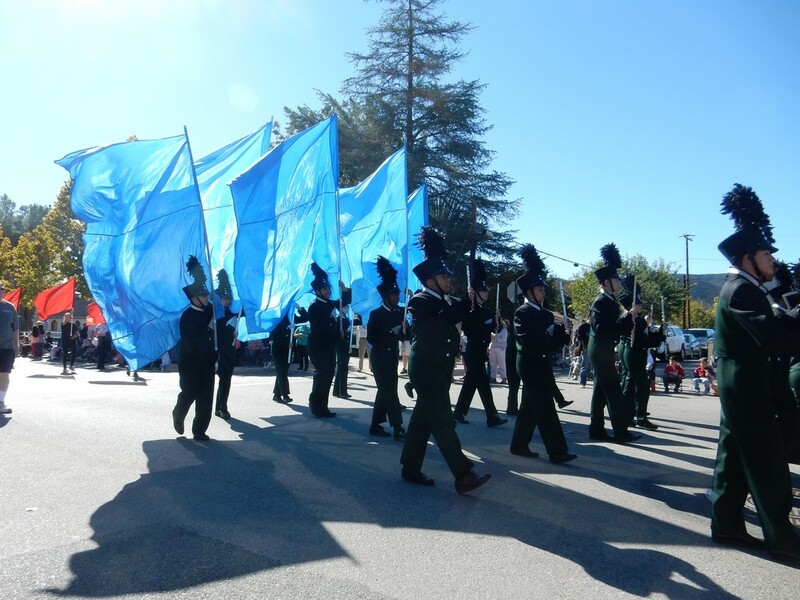 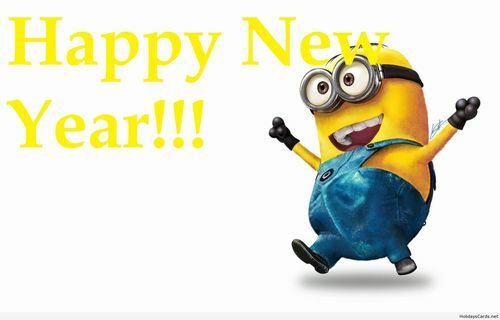 It is almost the end of 2015, so we hope to see all of you some more and then we get to plan for 2016! Reserve your spot by calling 805-385-5400. Let Jim Sommars know you made a reservation. 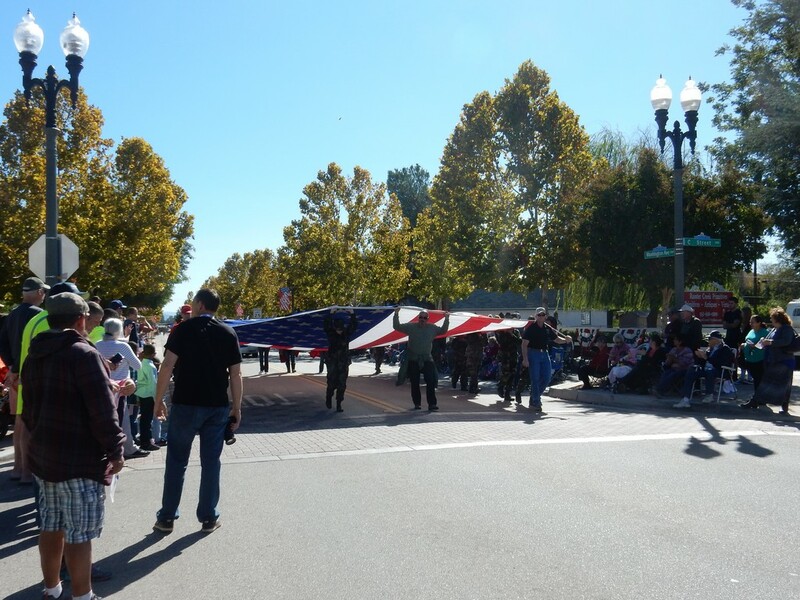 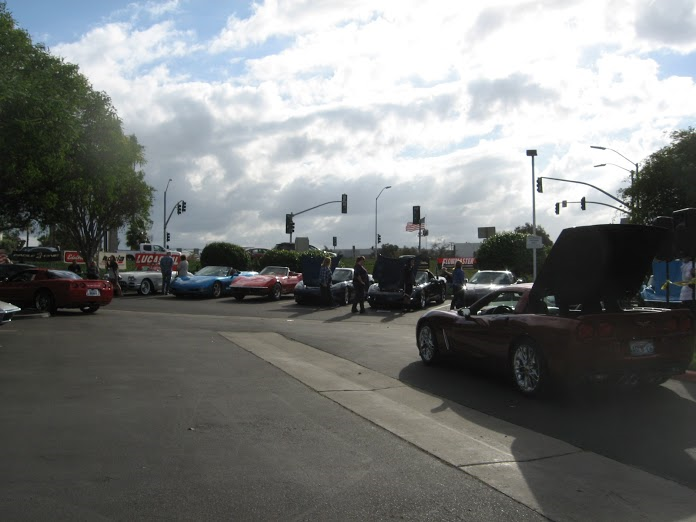 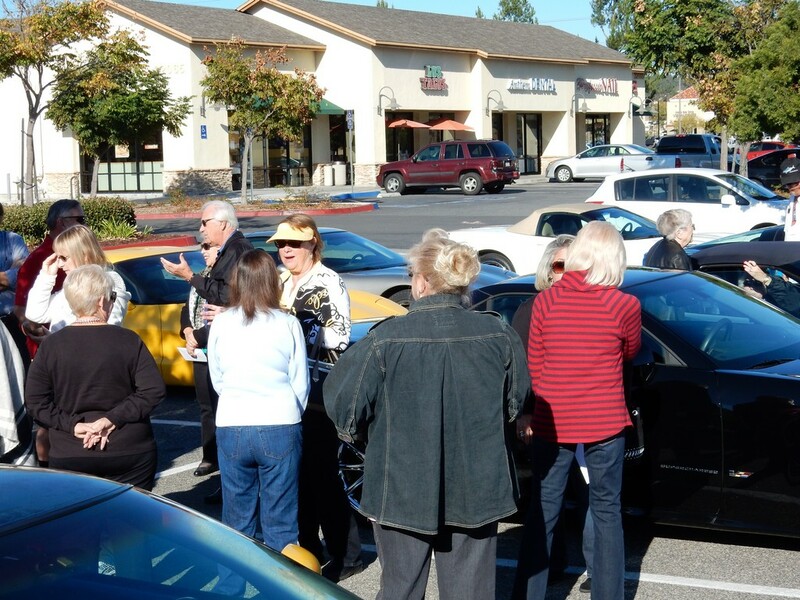 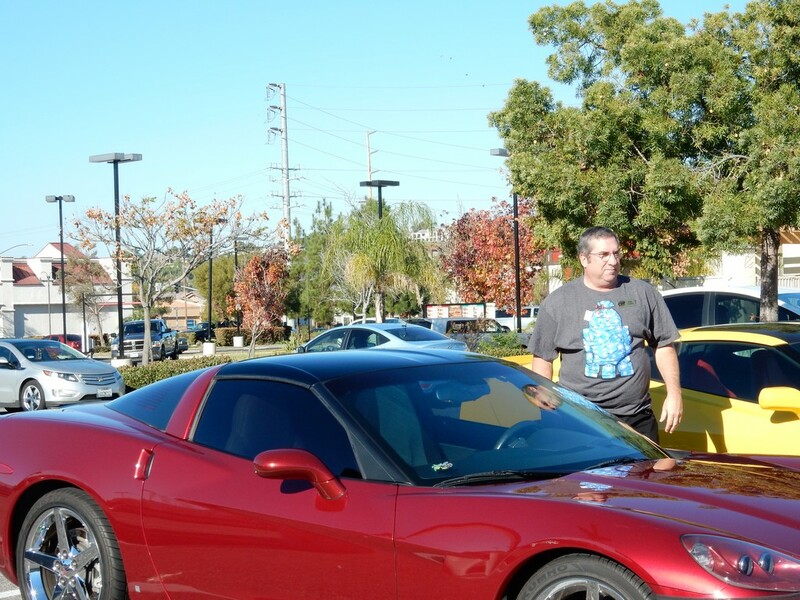 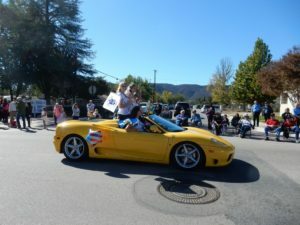 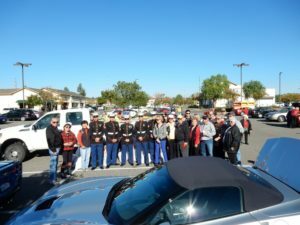 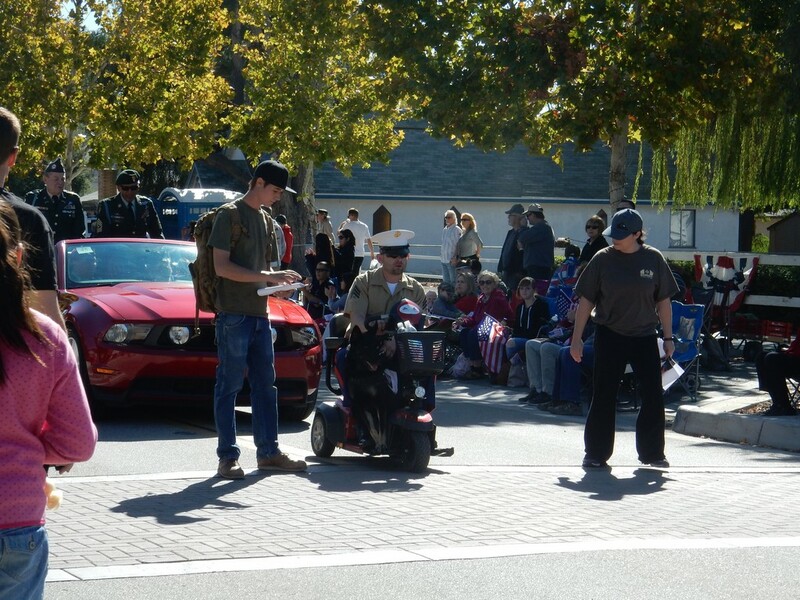 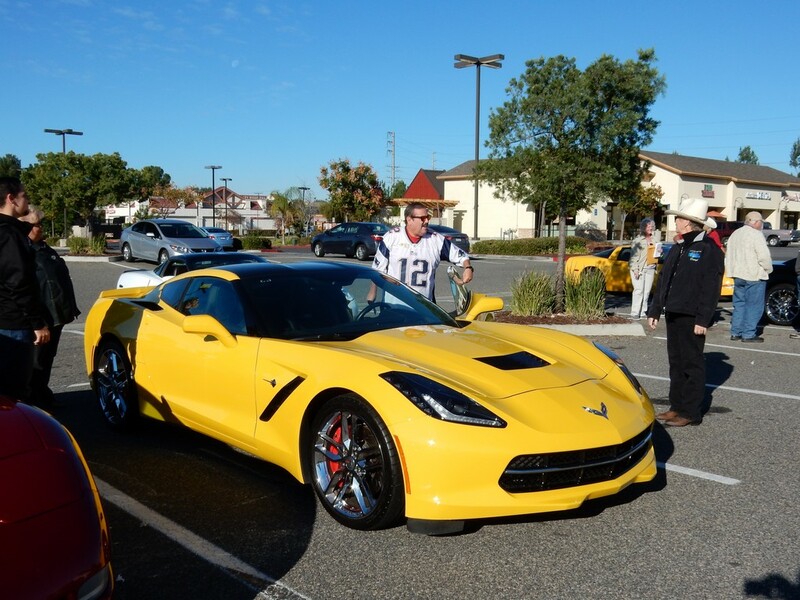 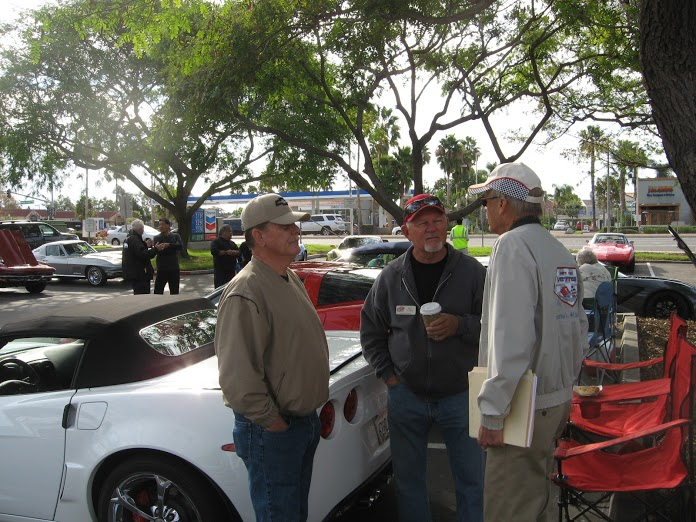 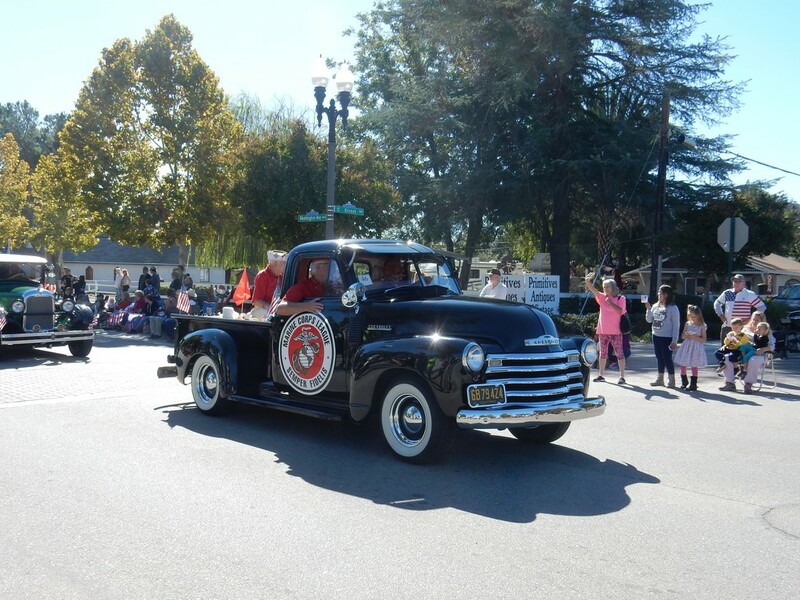 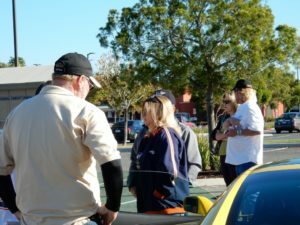 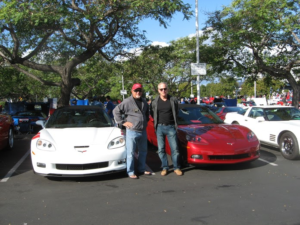 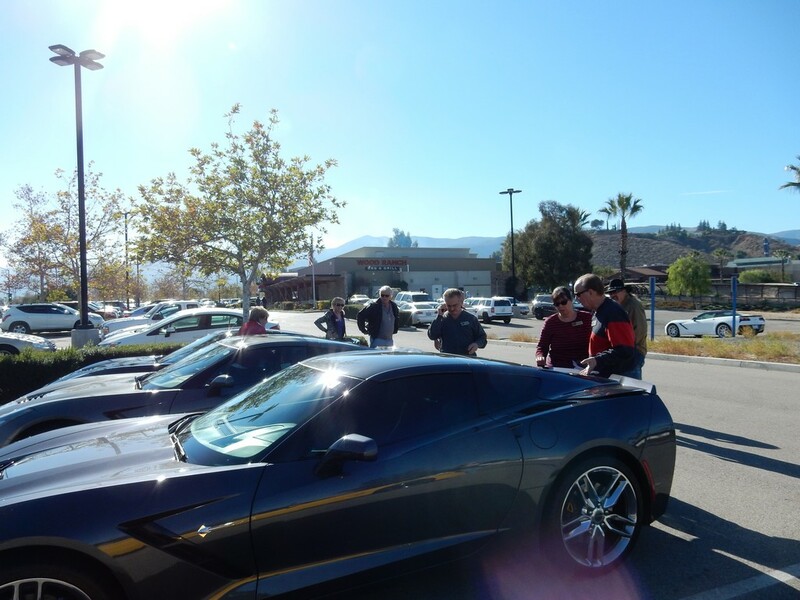 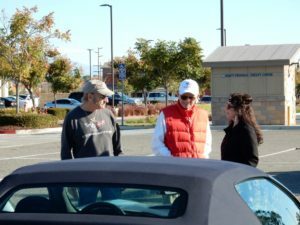 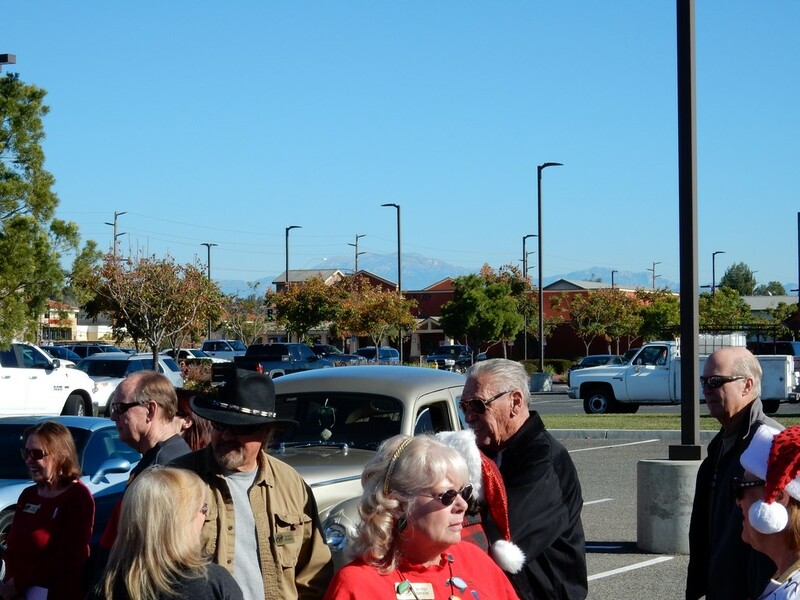 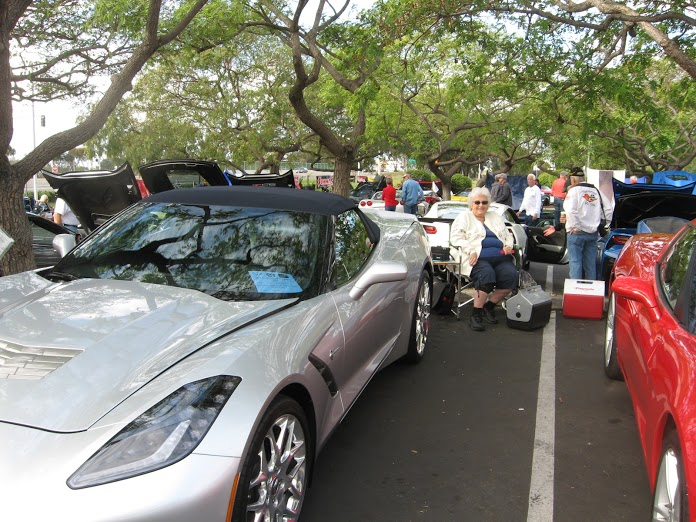 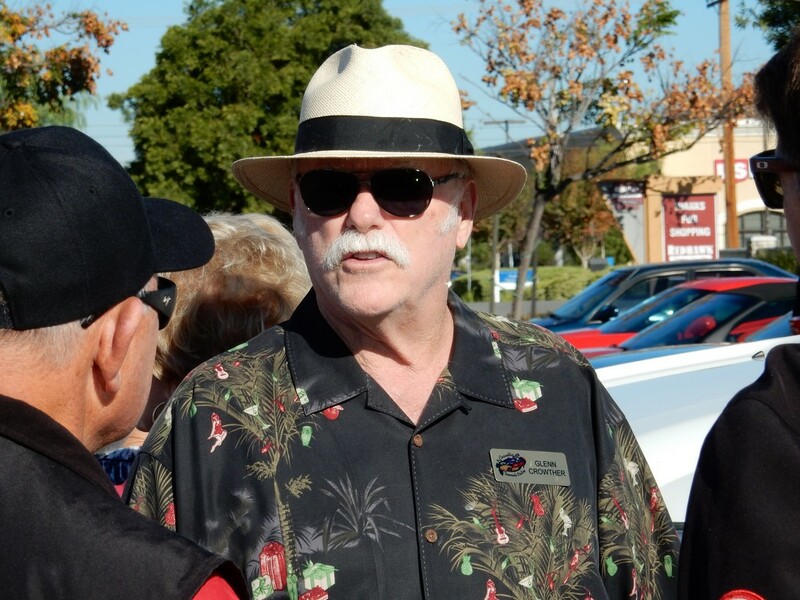 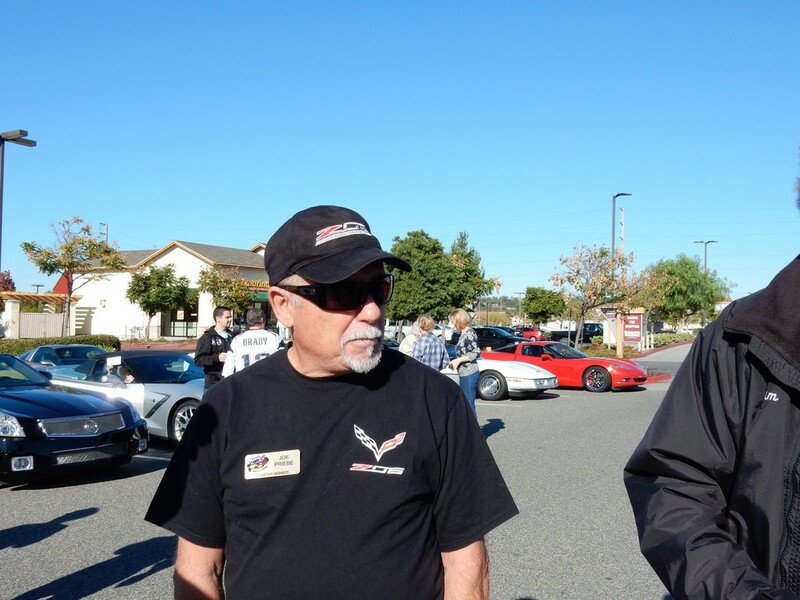 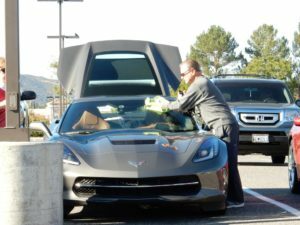 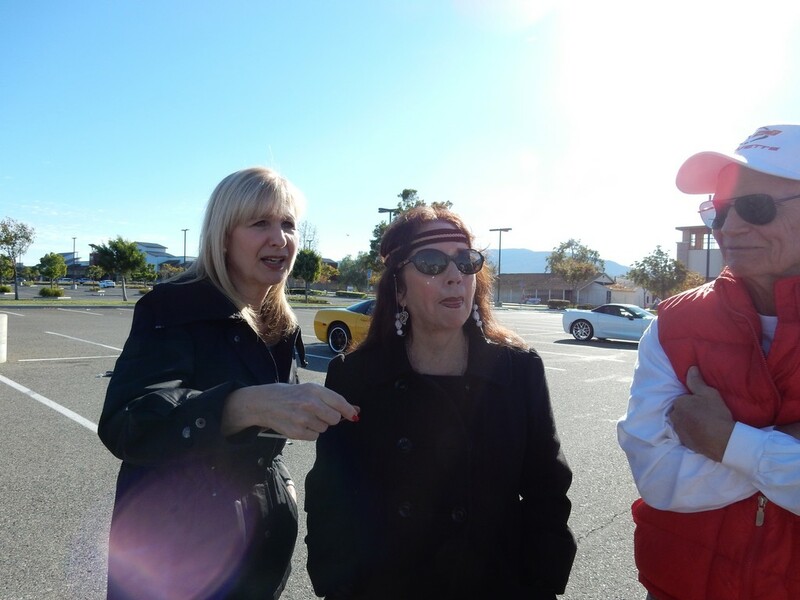 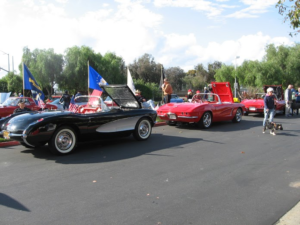 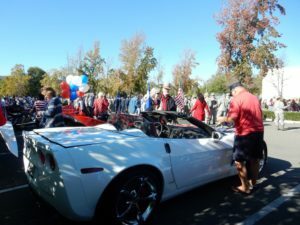 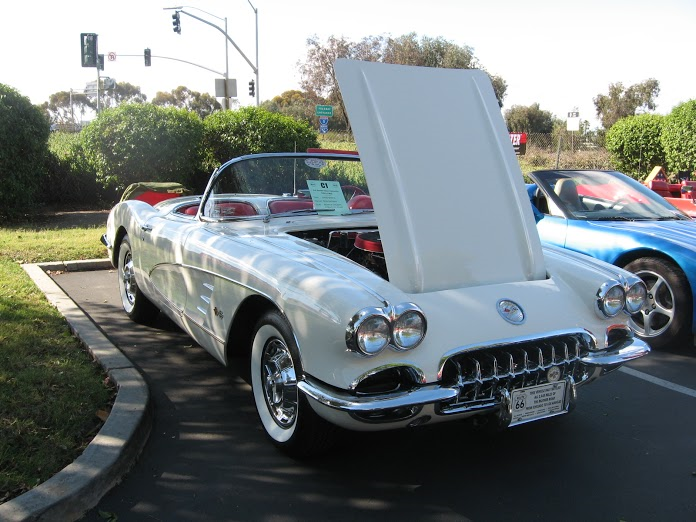 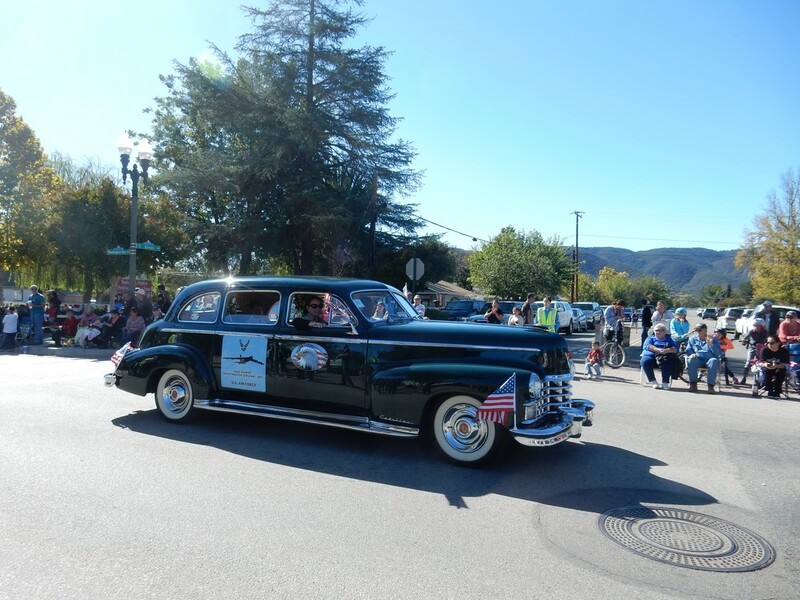 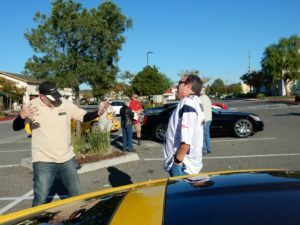 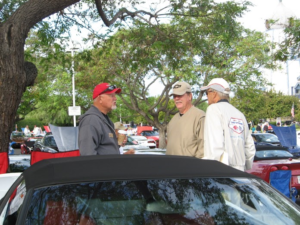 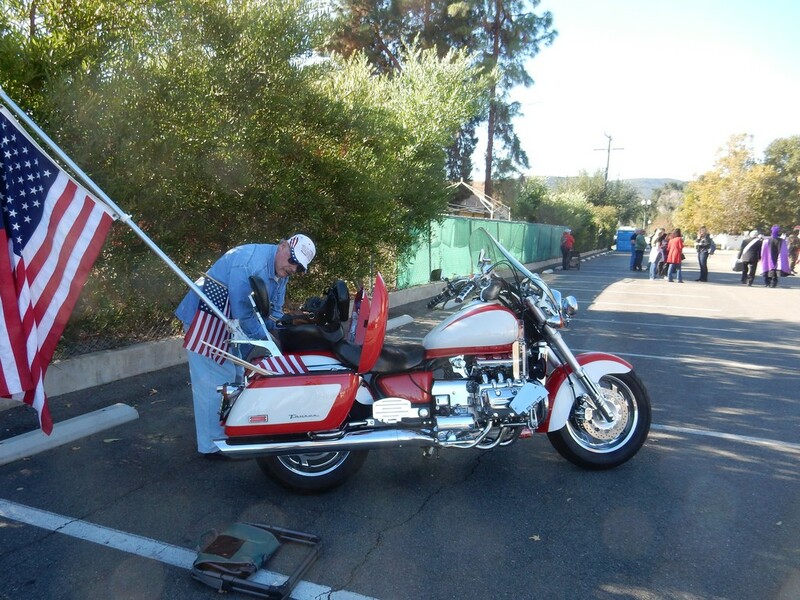 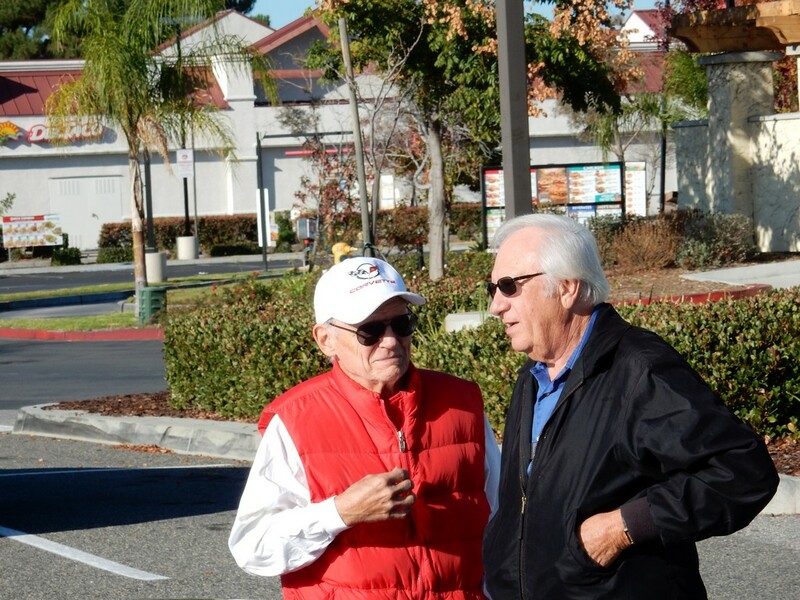 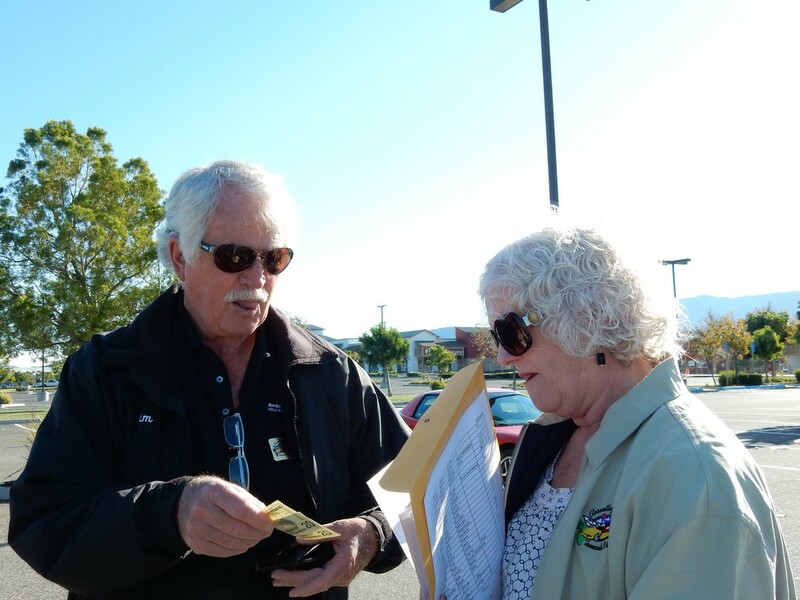 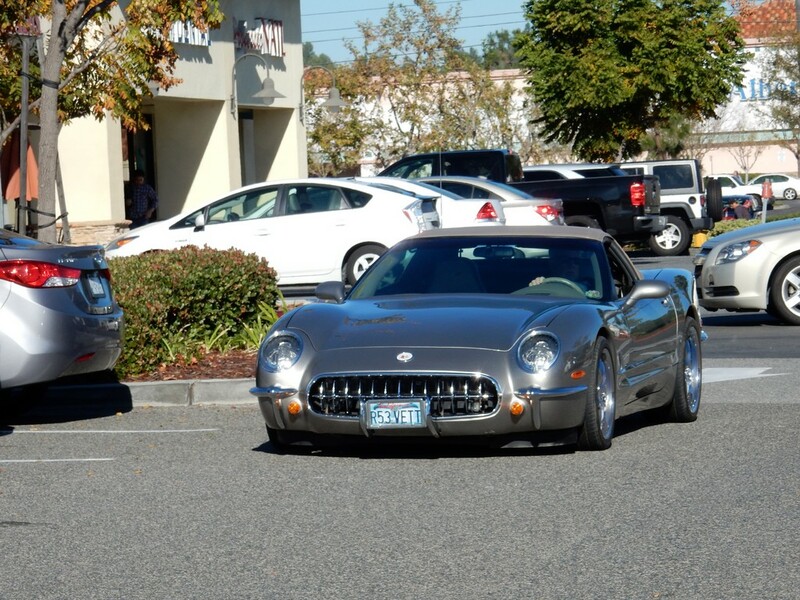 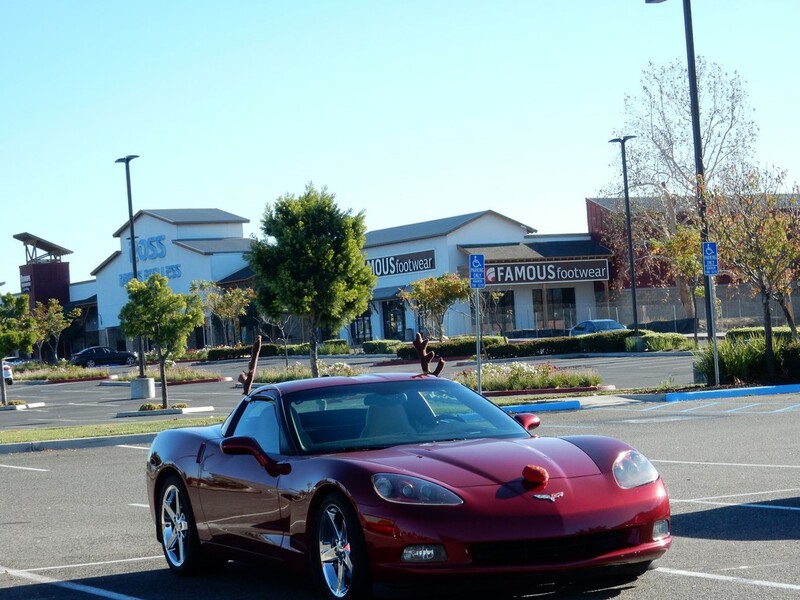 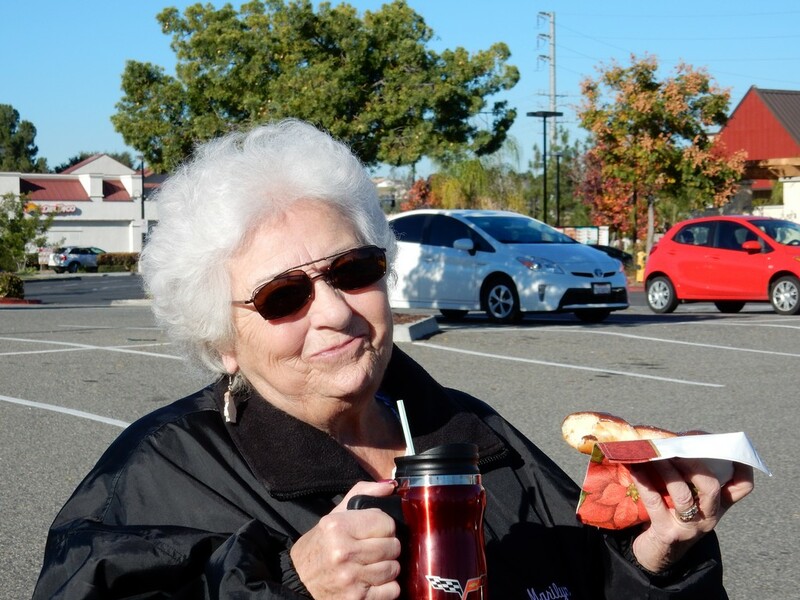 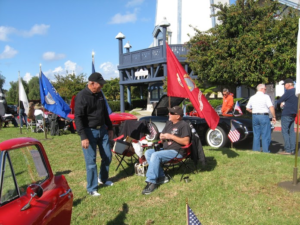 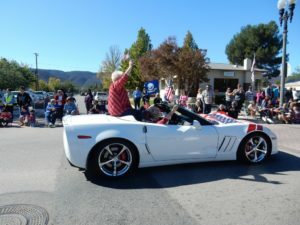 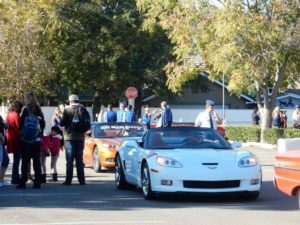 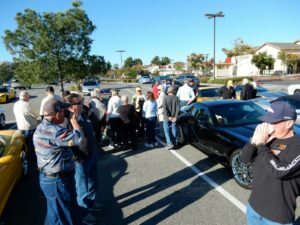 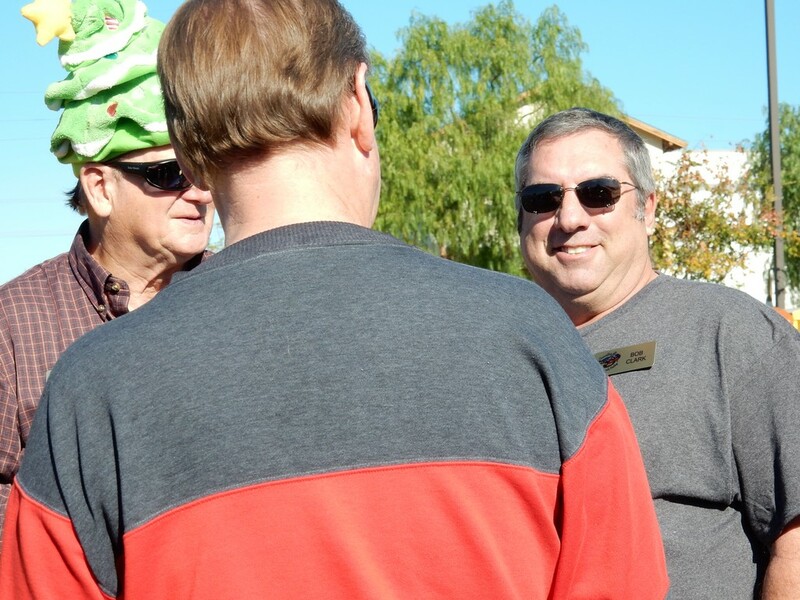 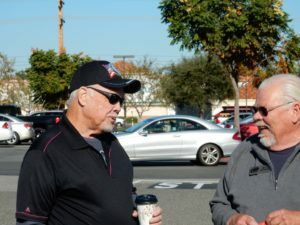 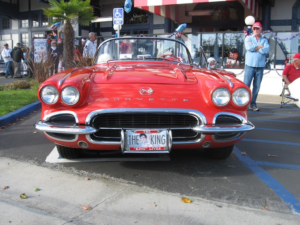 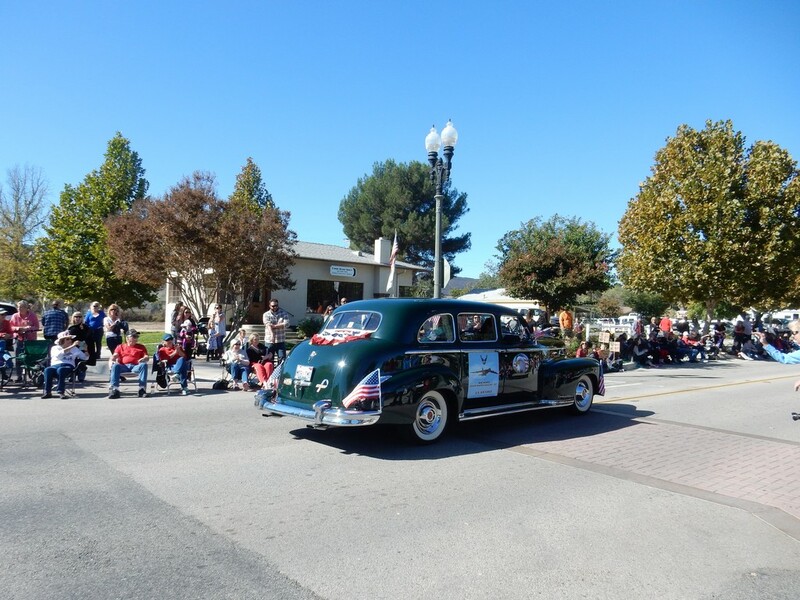 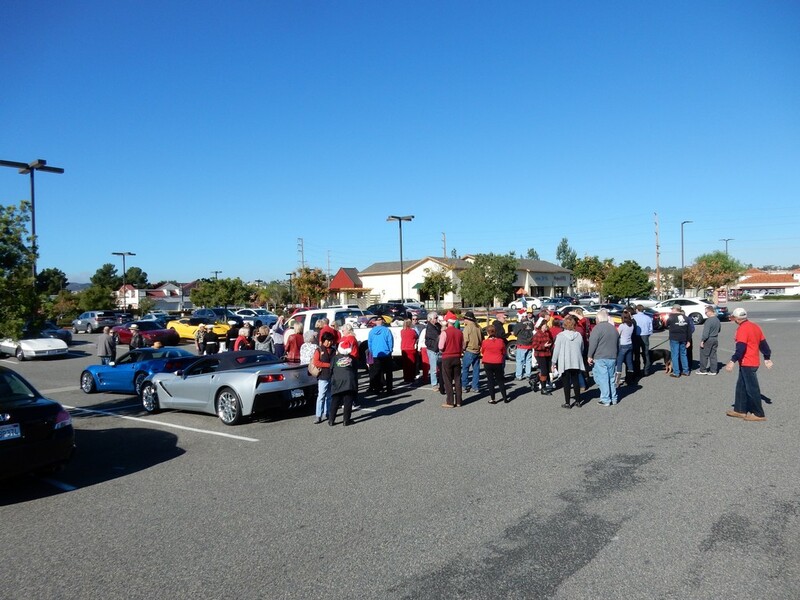 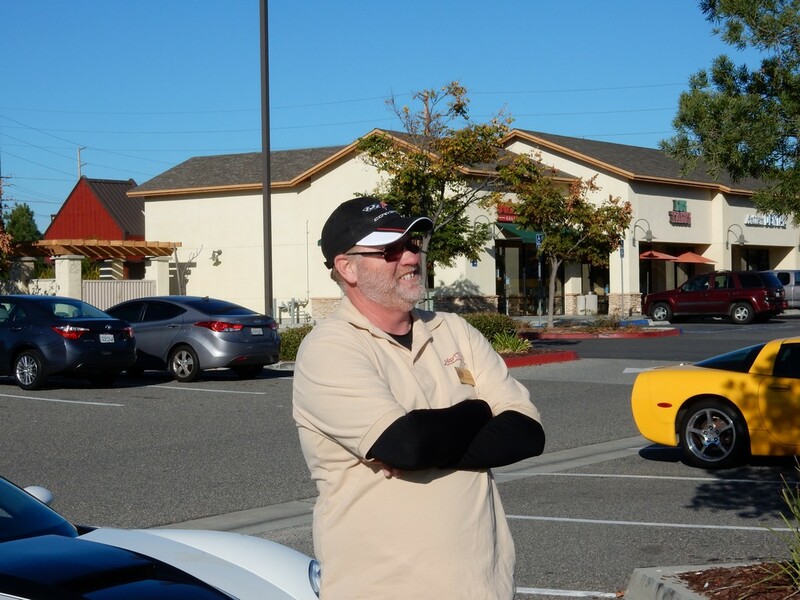 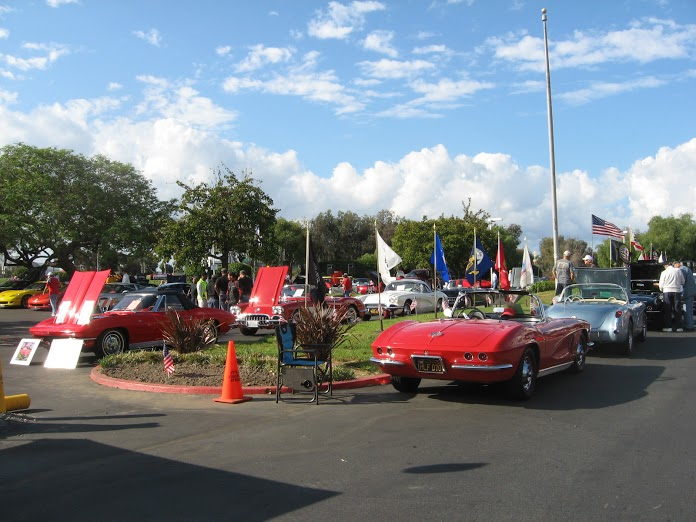 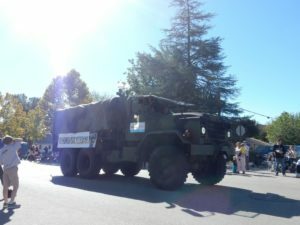 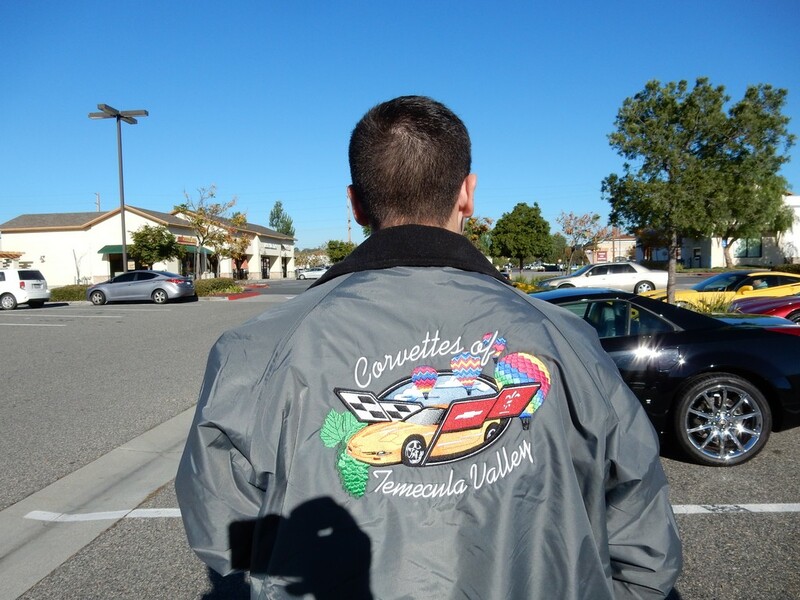 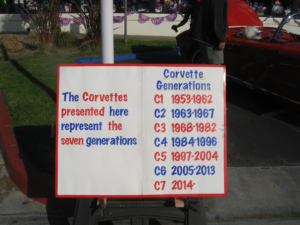 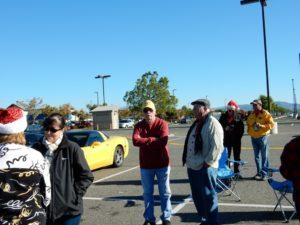 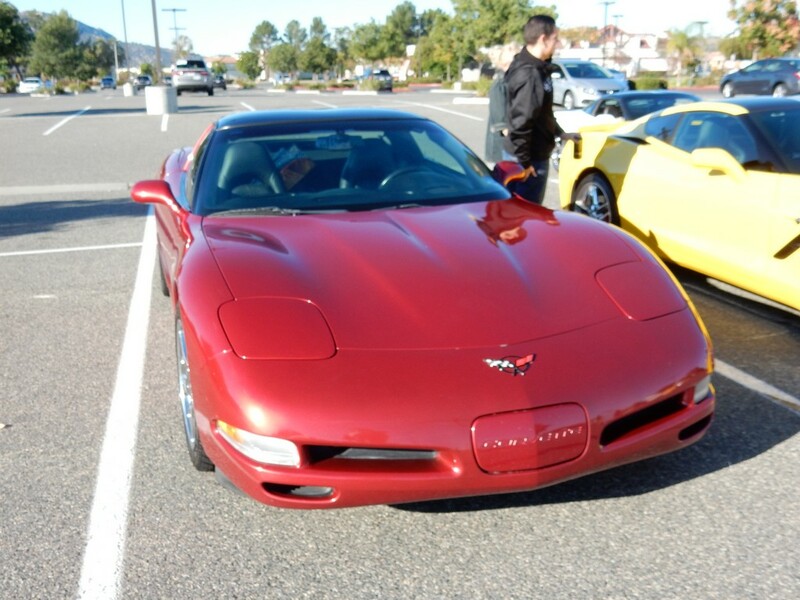 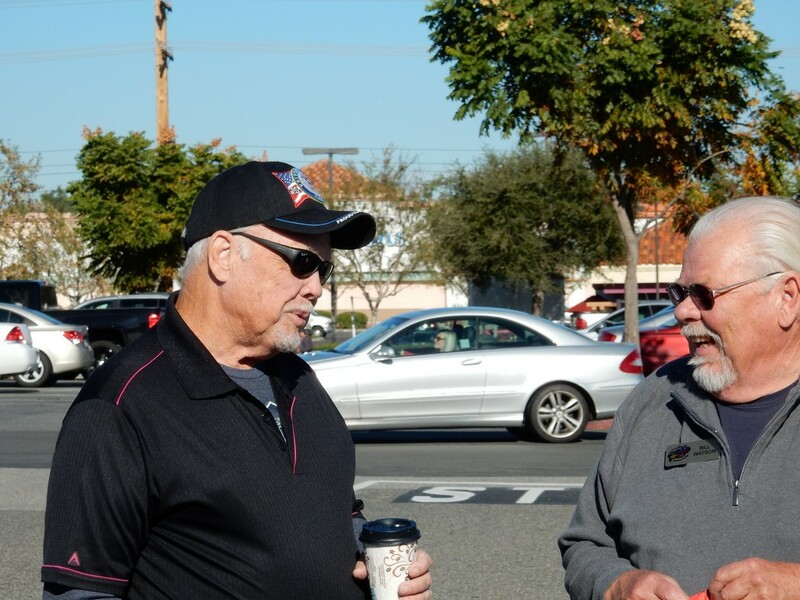 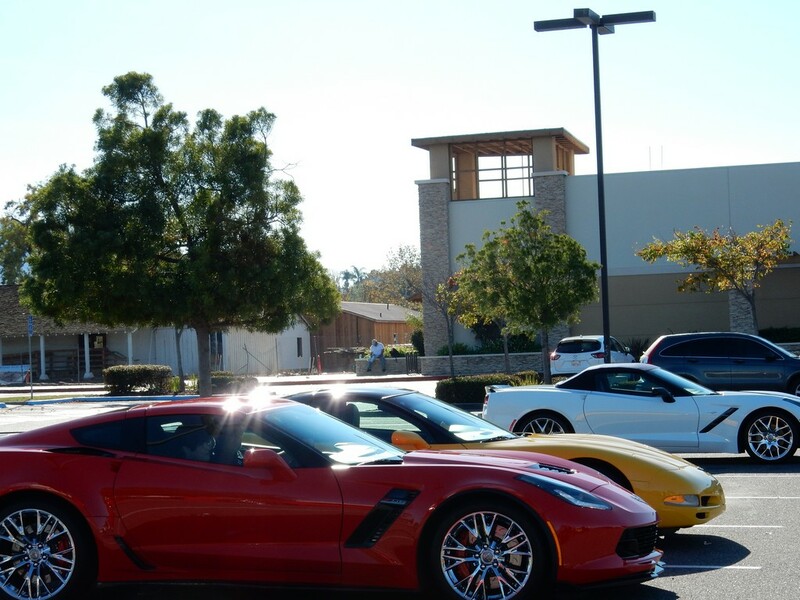 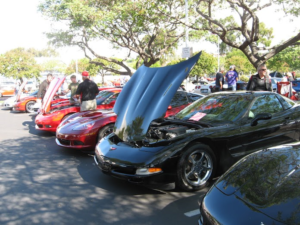 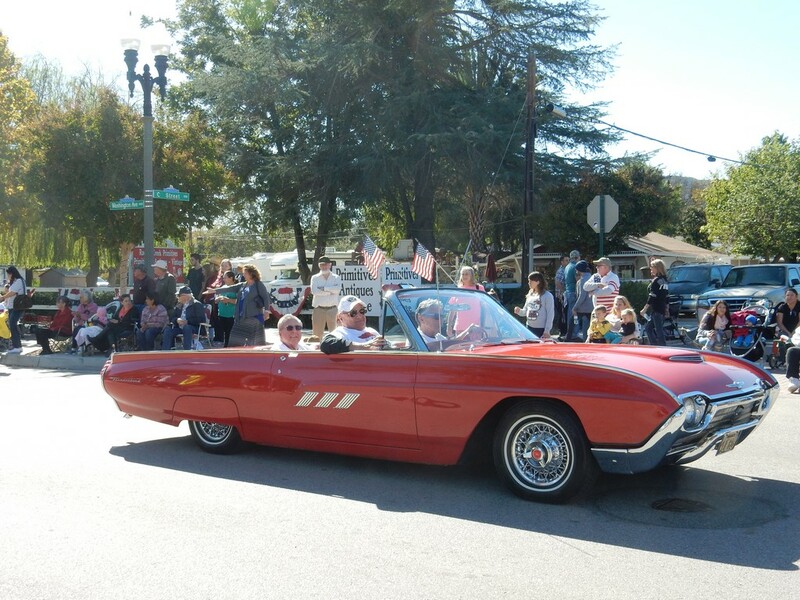 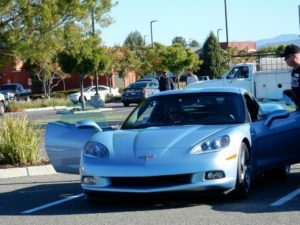 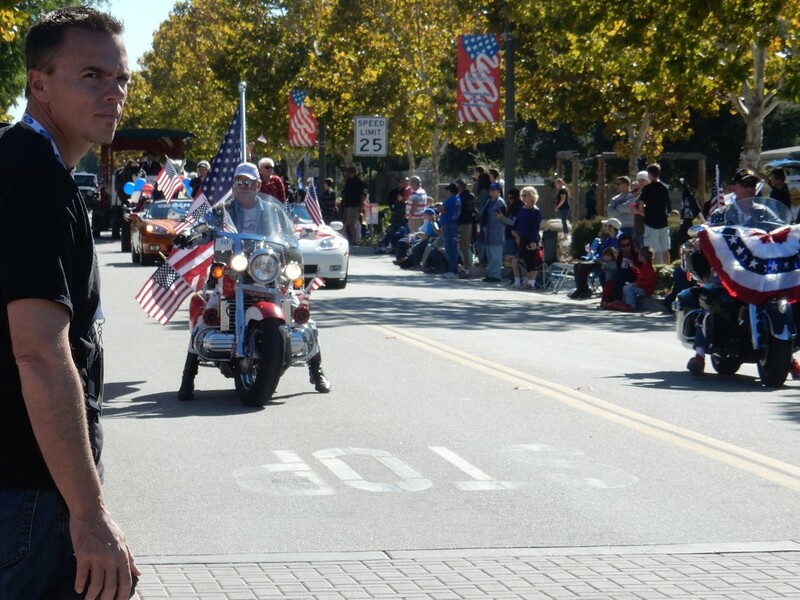 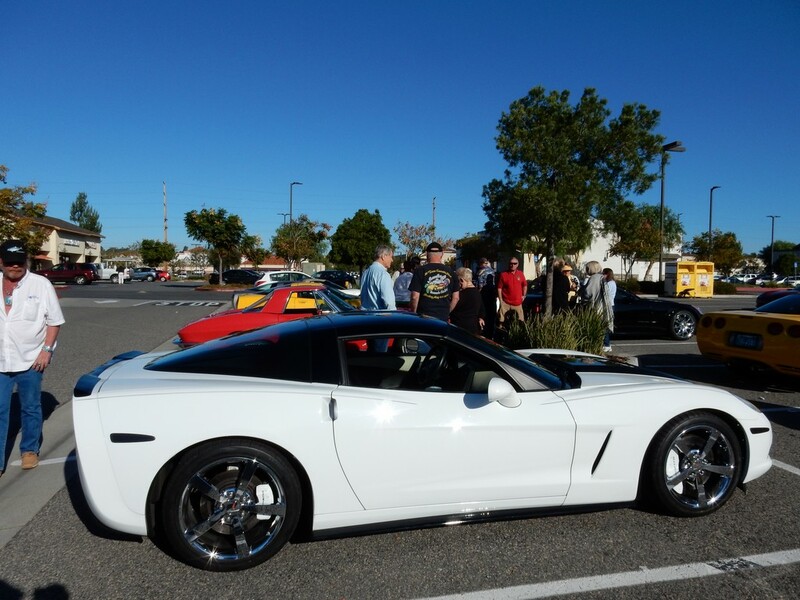 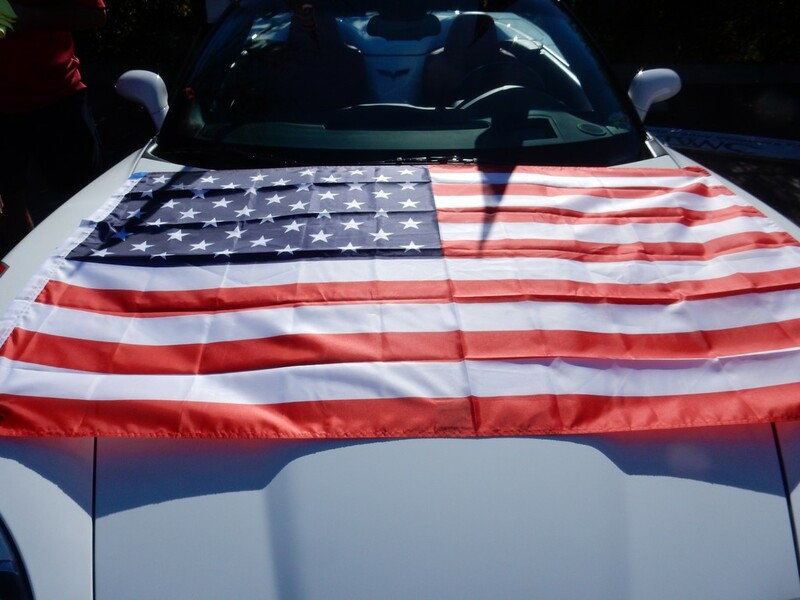 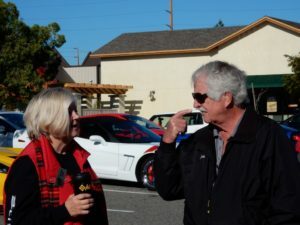 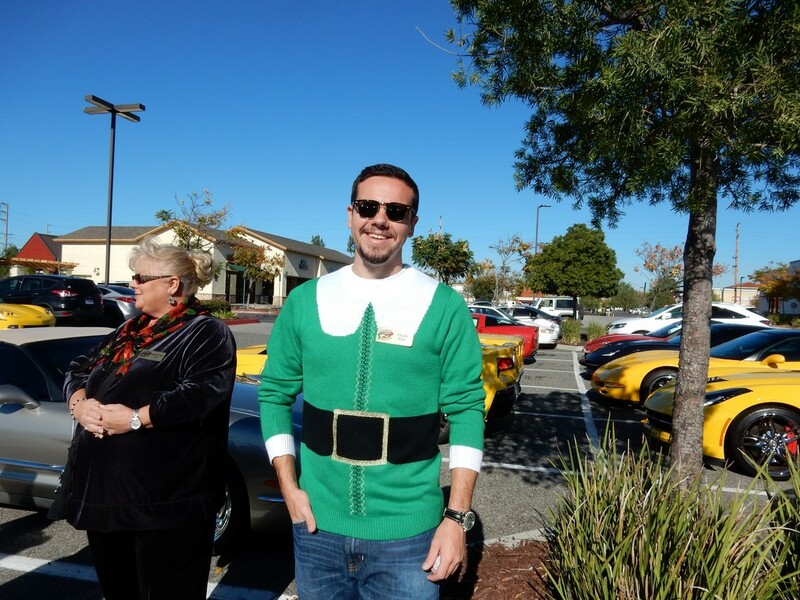 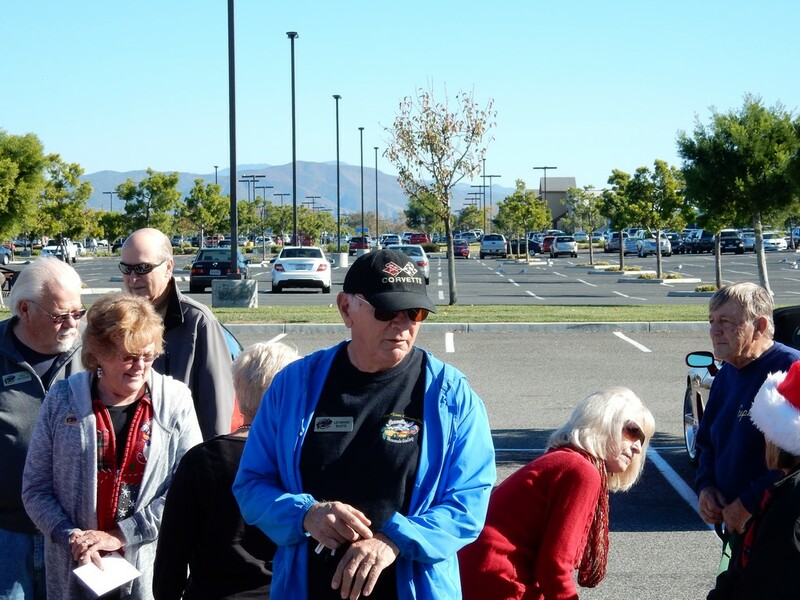 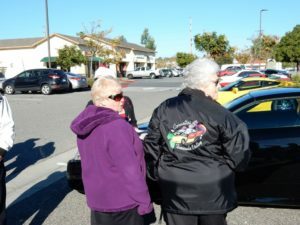 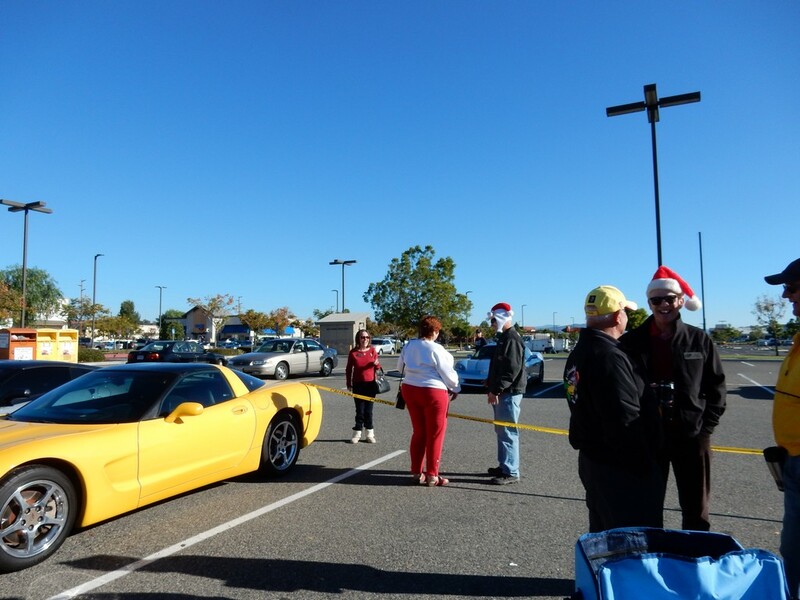 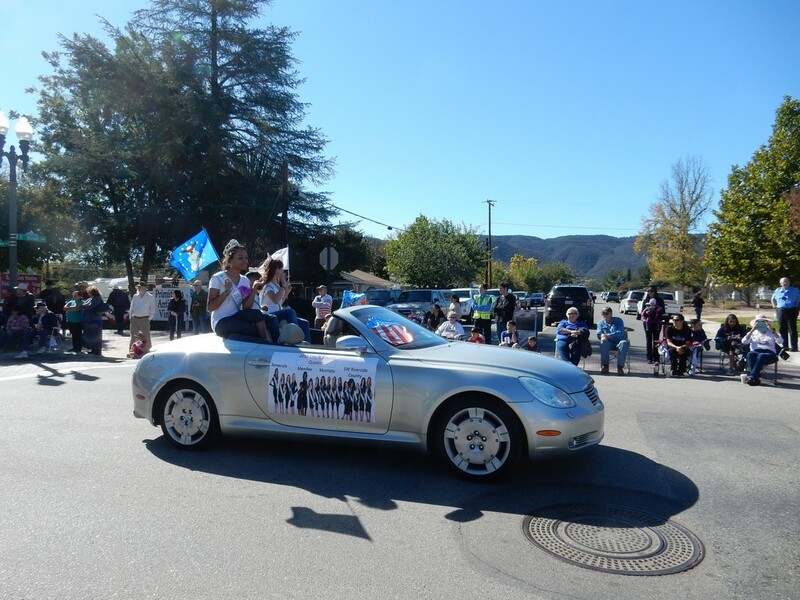 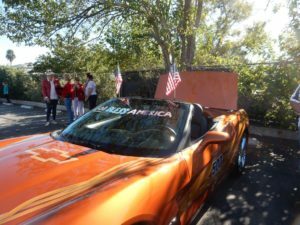 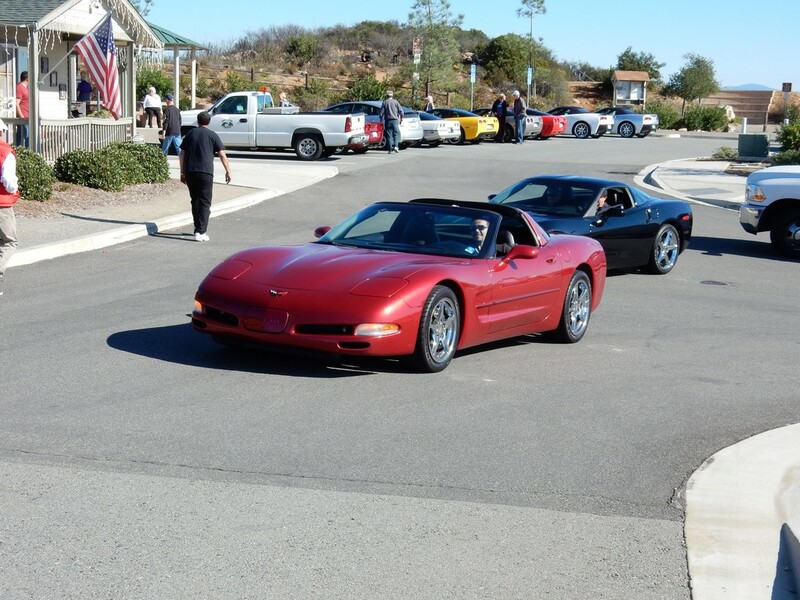 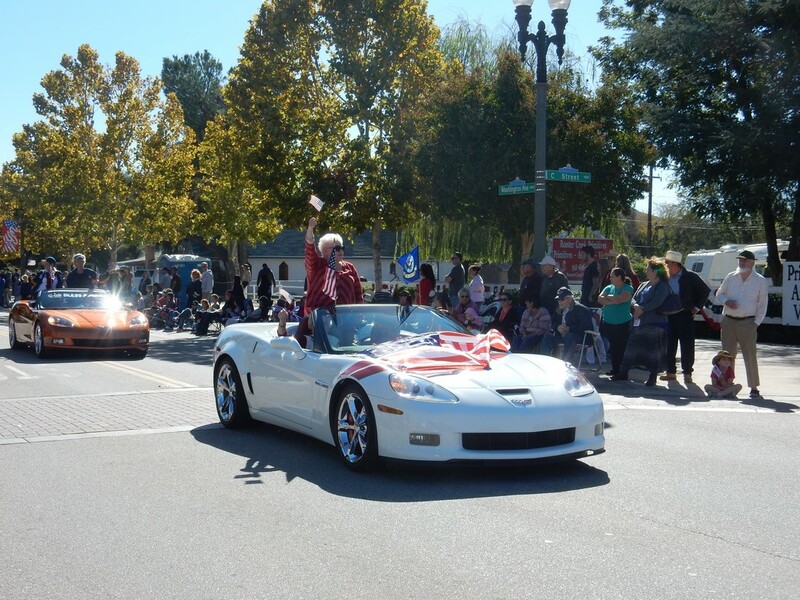 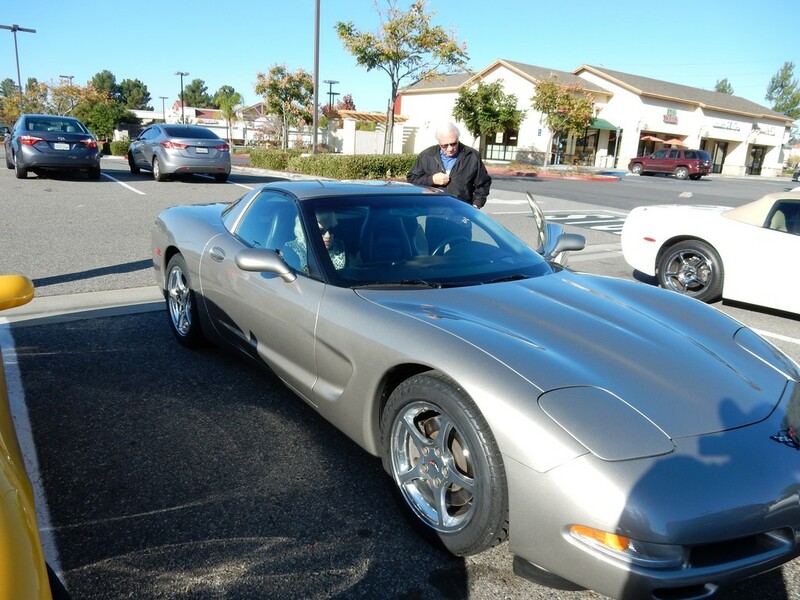 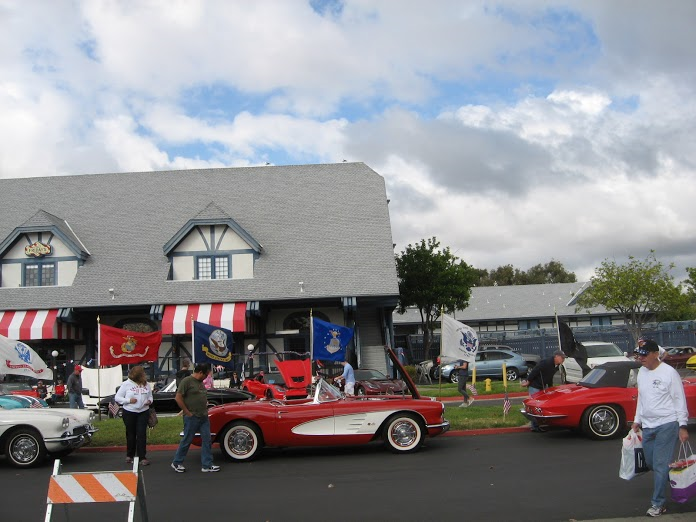 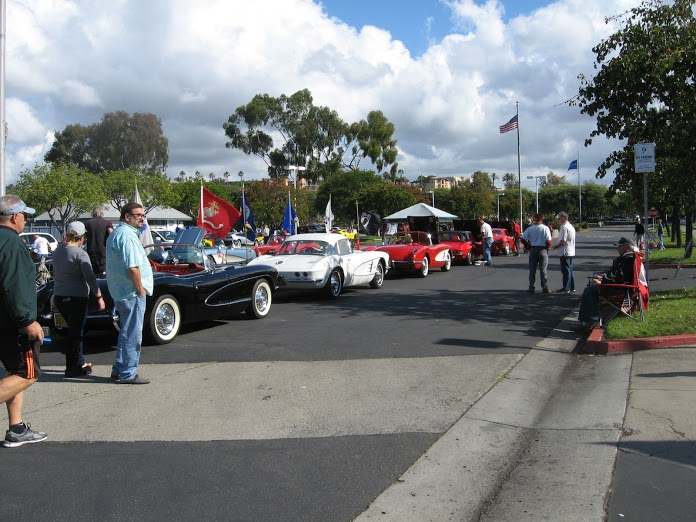 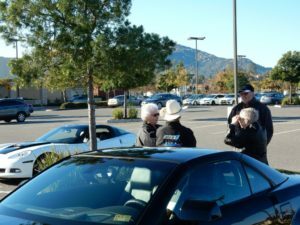 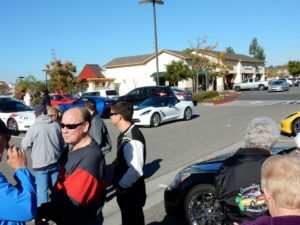 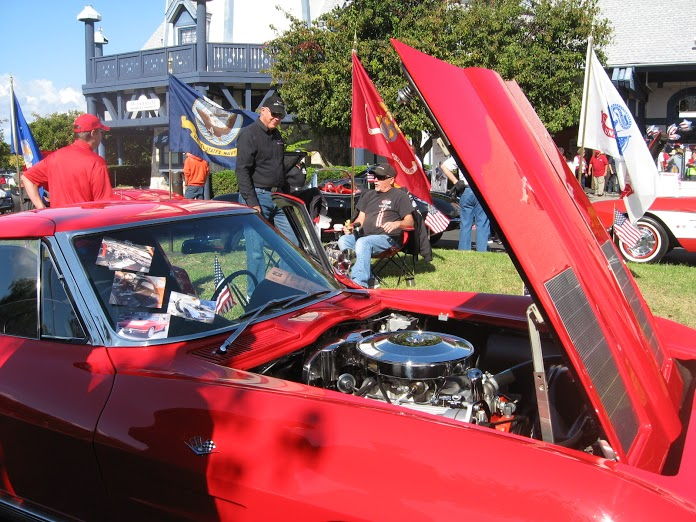 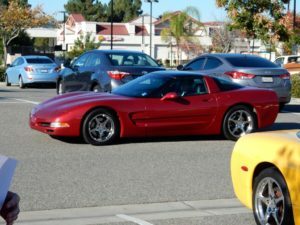 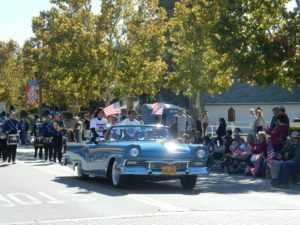 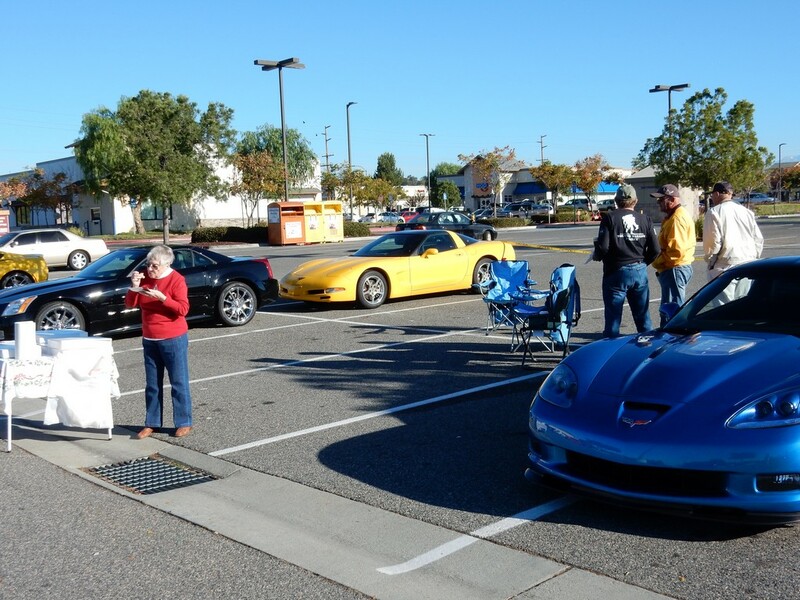 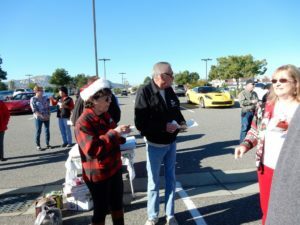 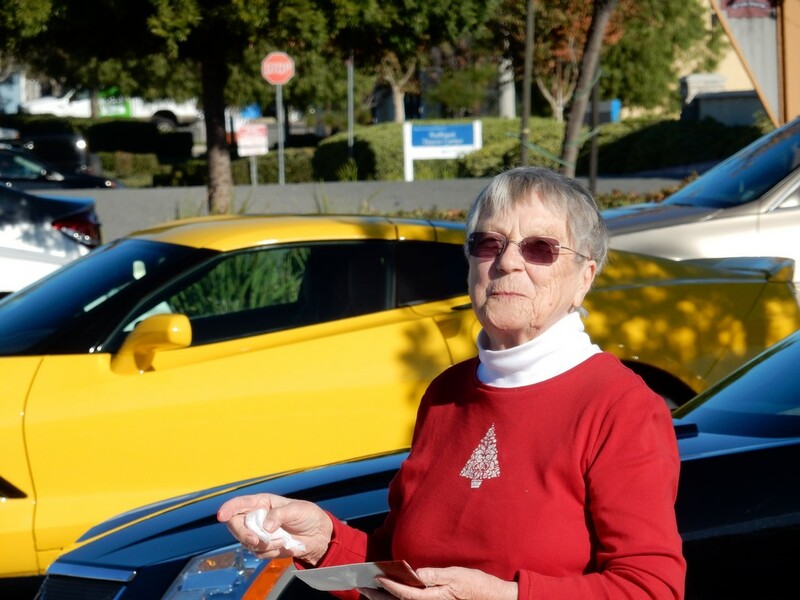 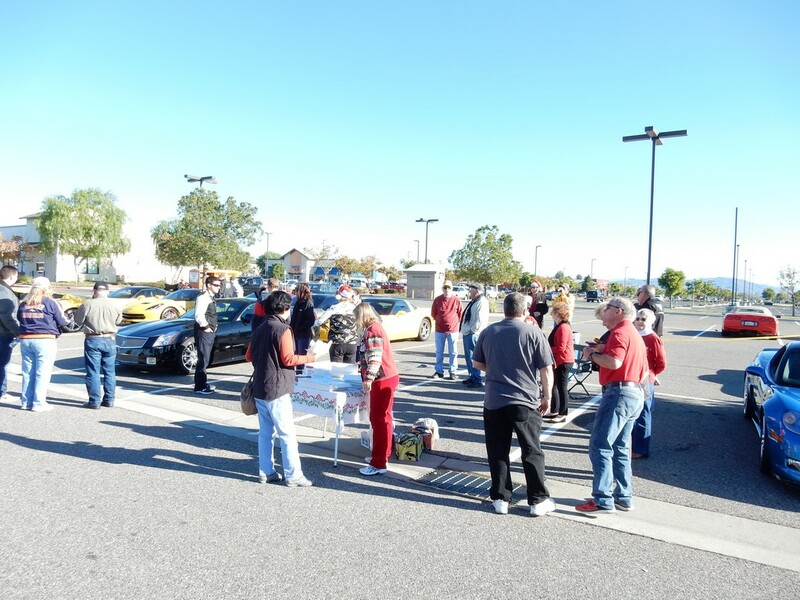 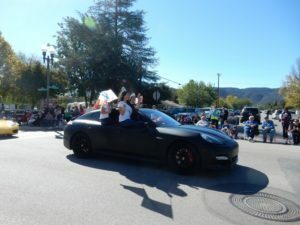 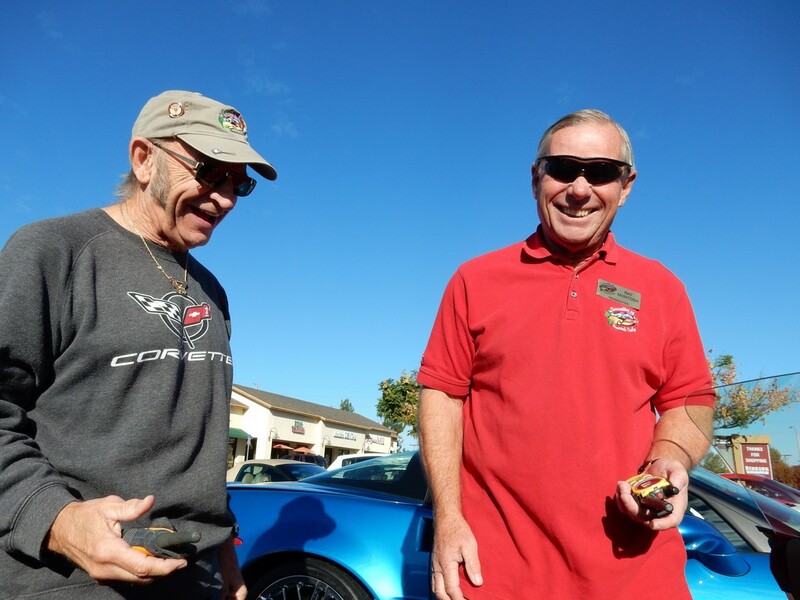 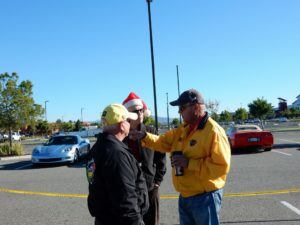 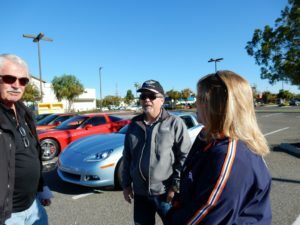 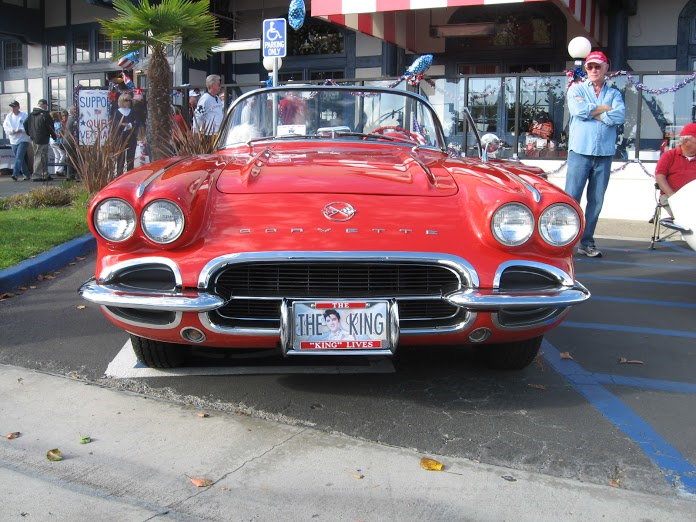 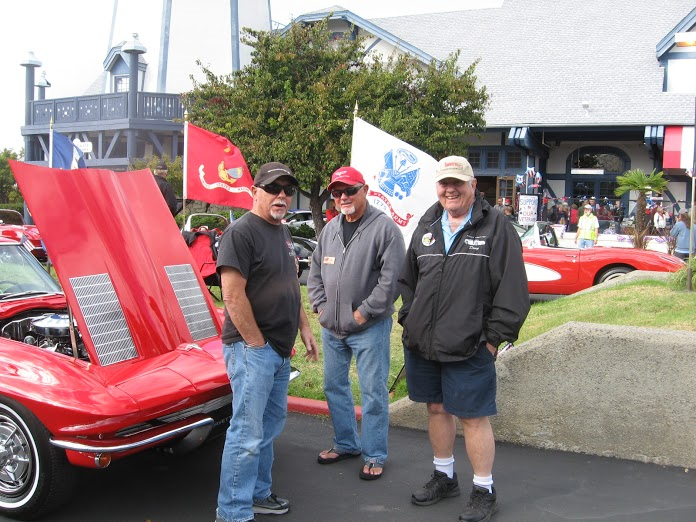 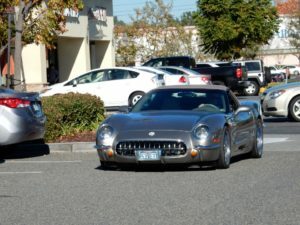 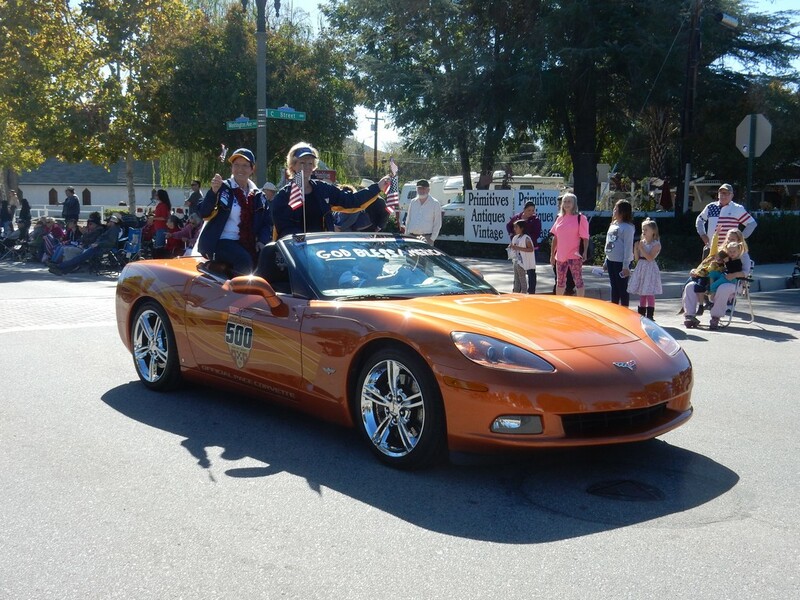 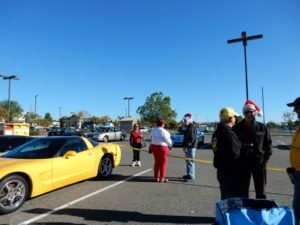 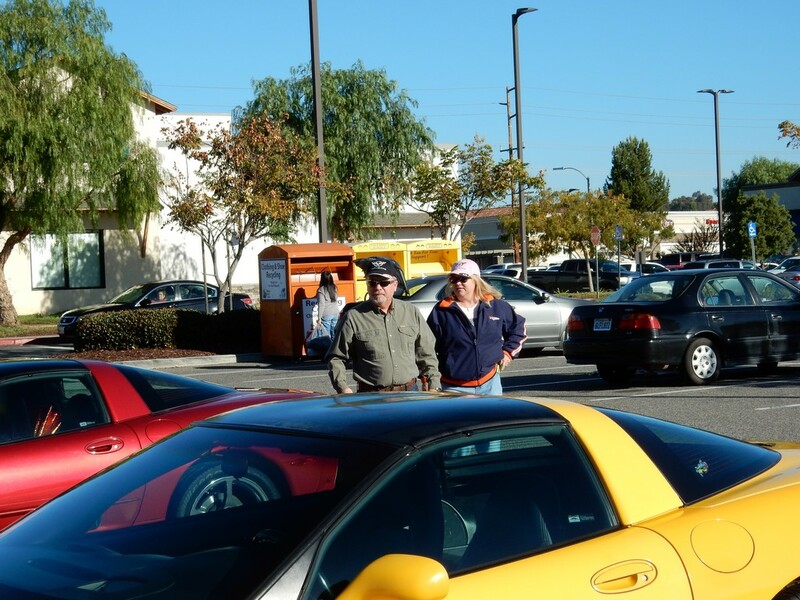 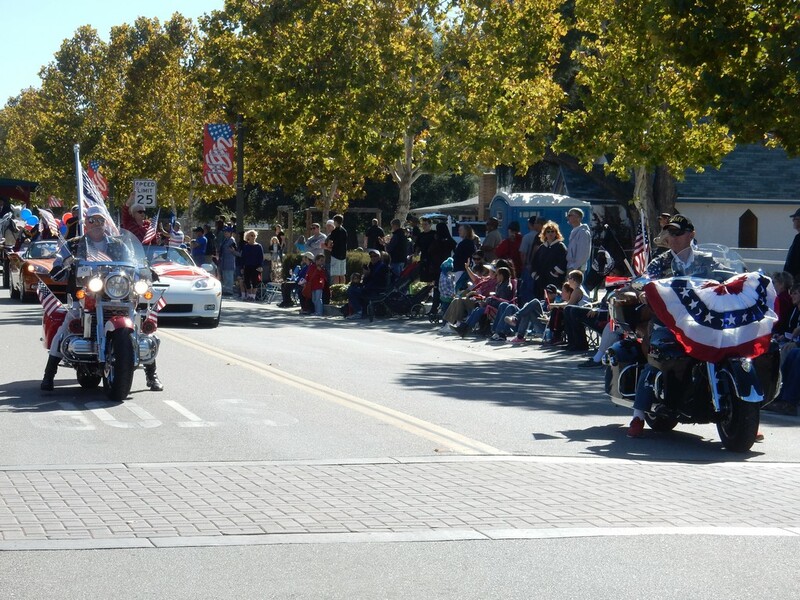 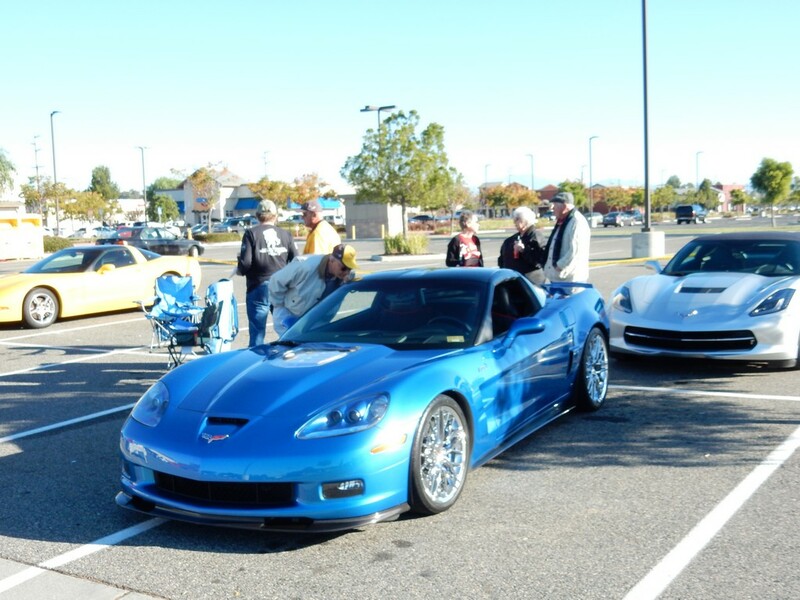 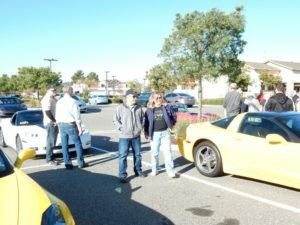 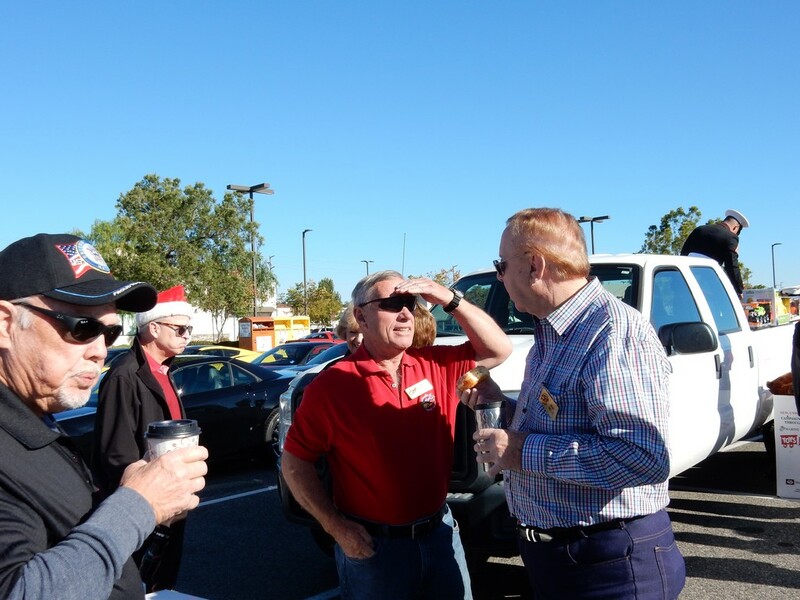 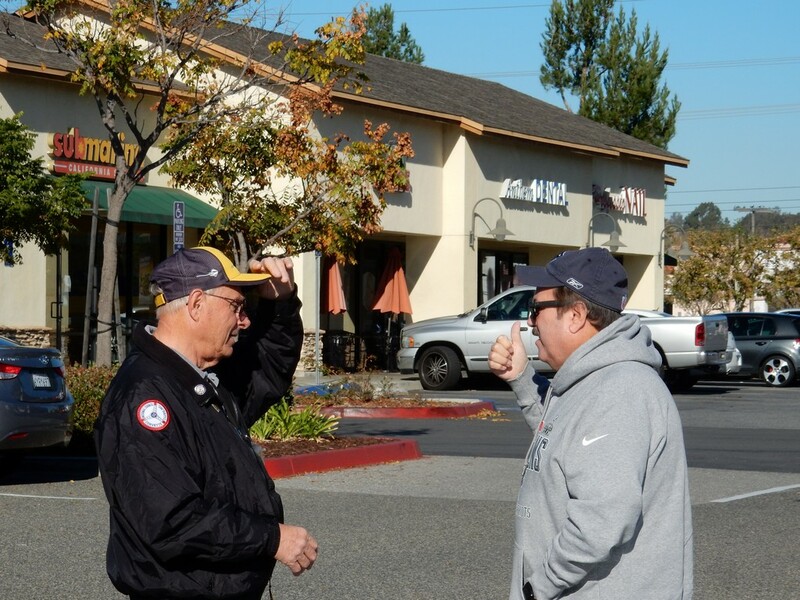 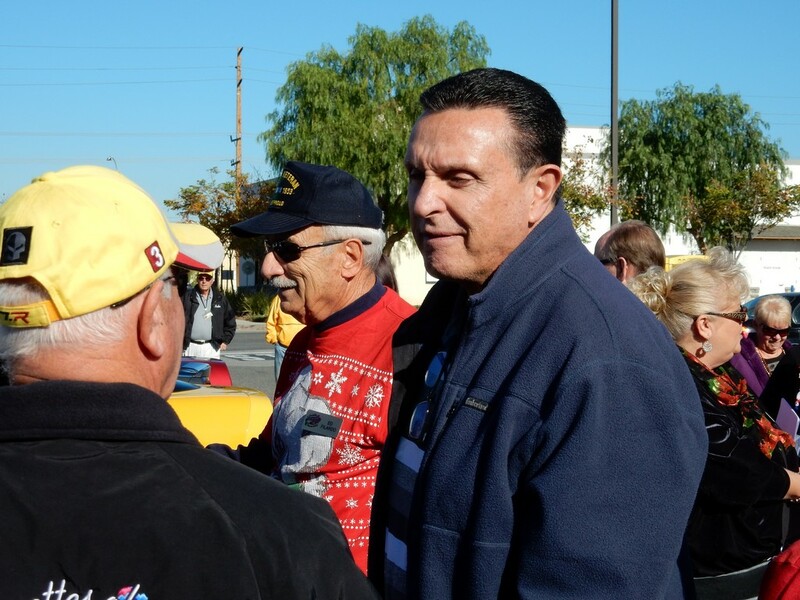 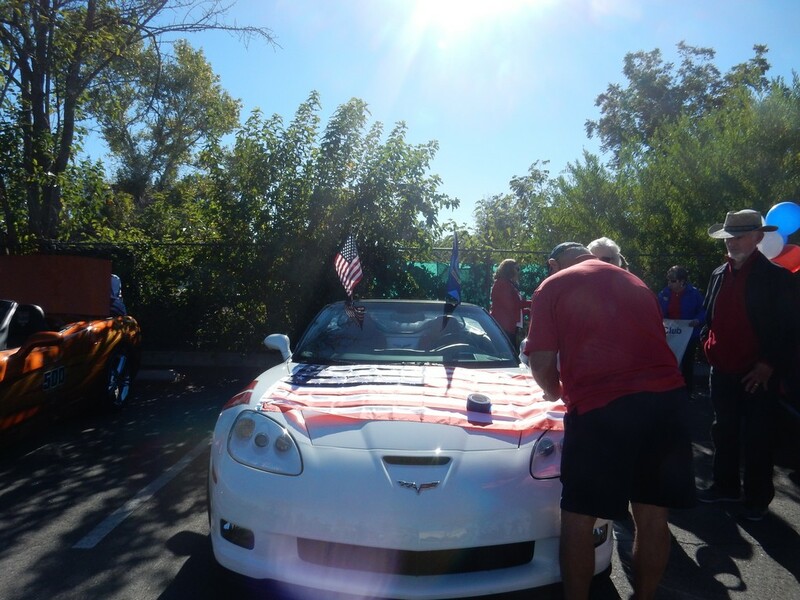 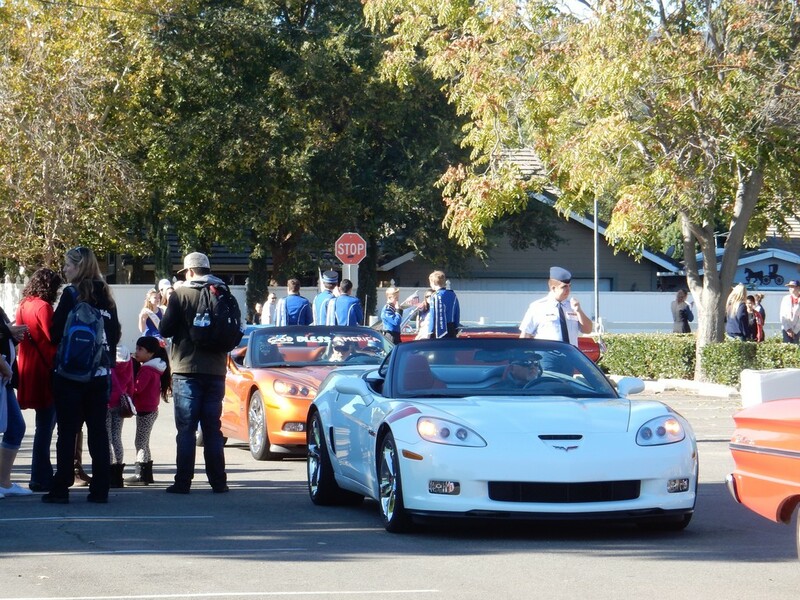 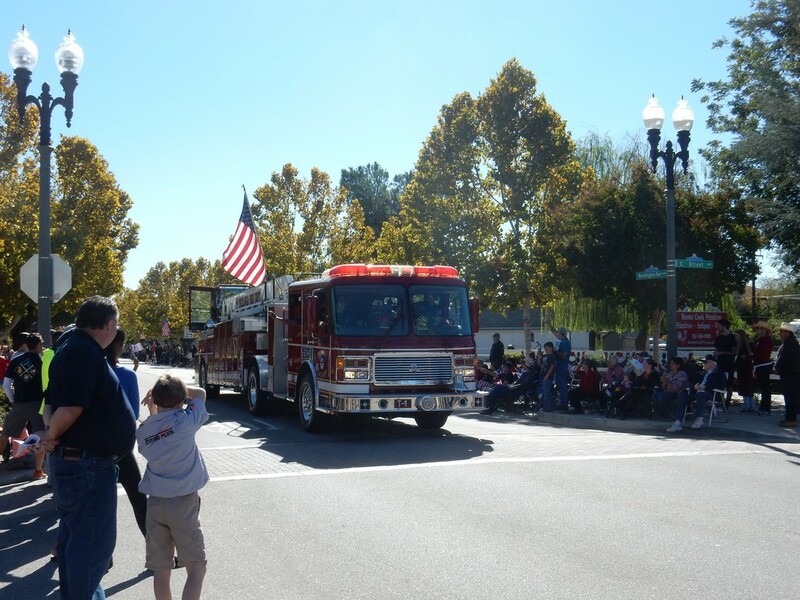 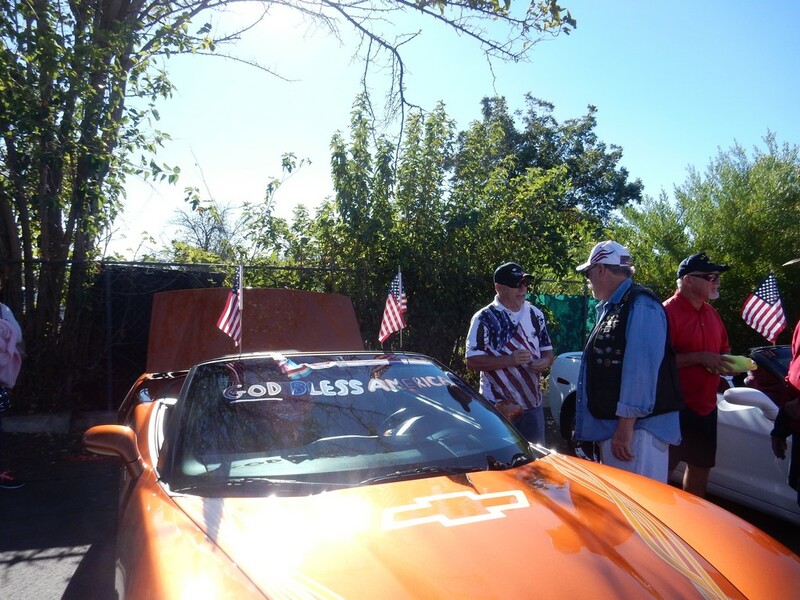 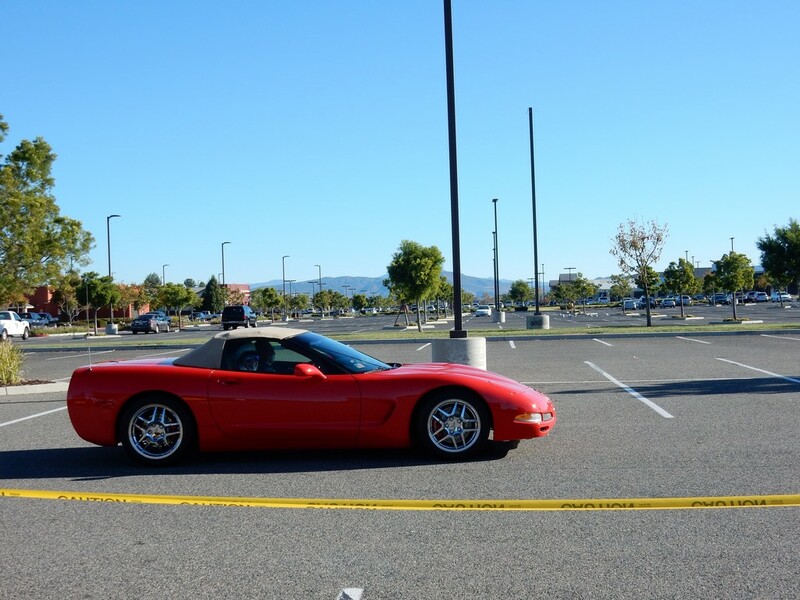 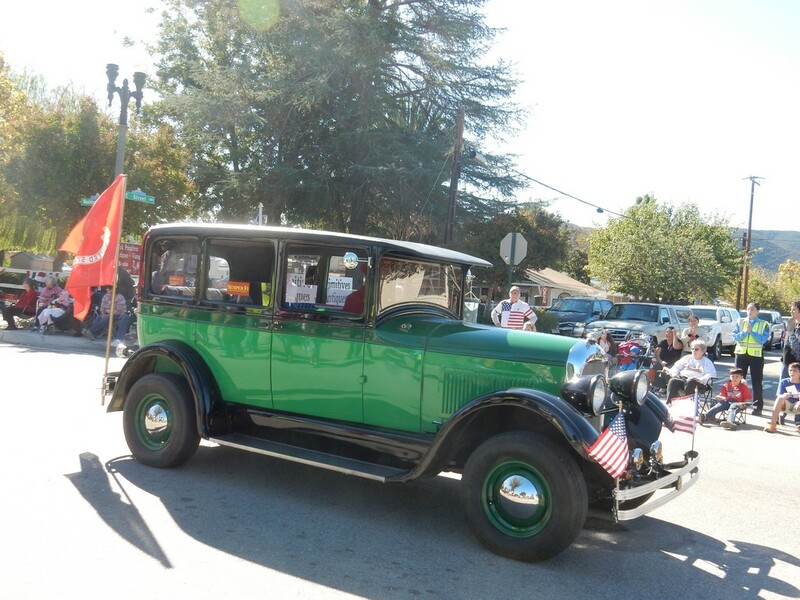 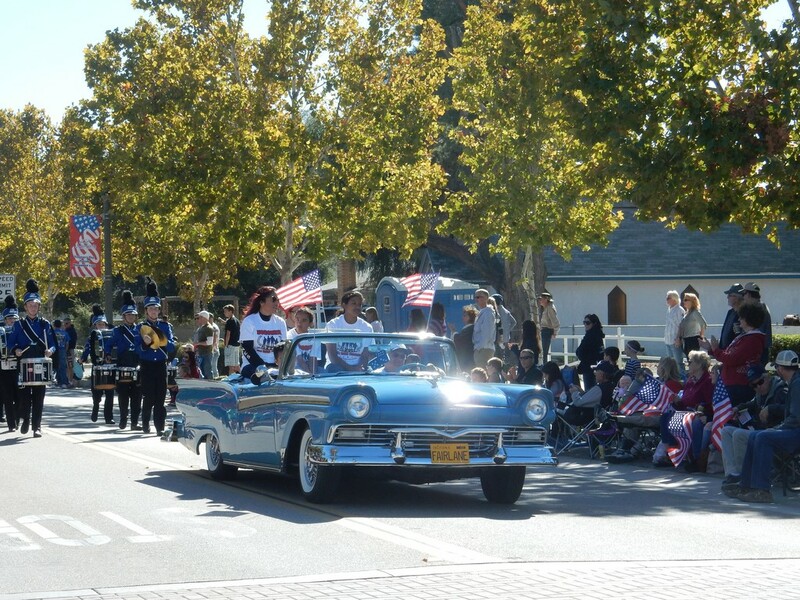 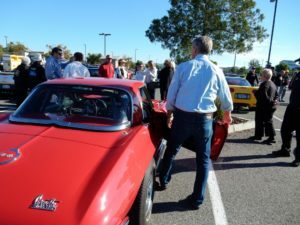 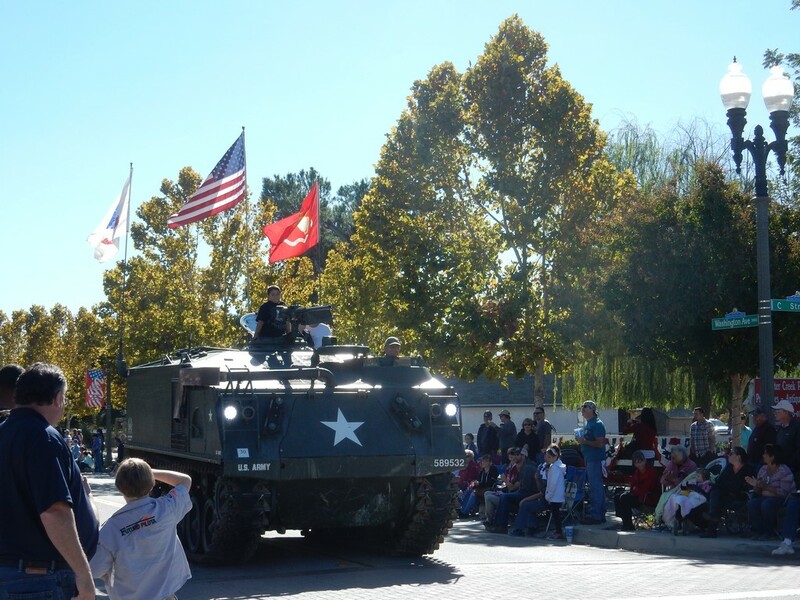 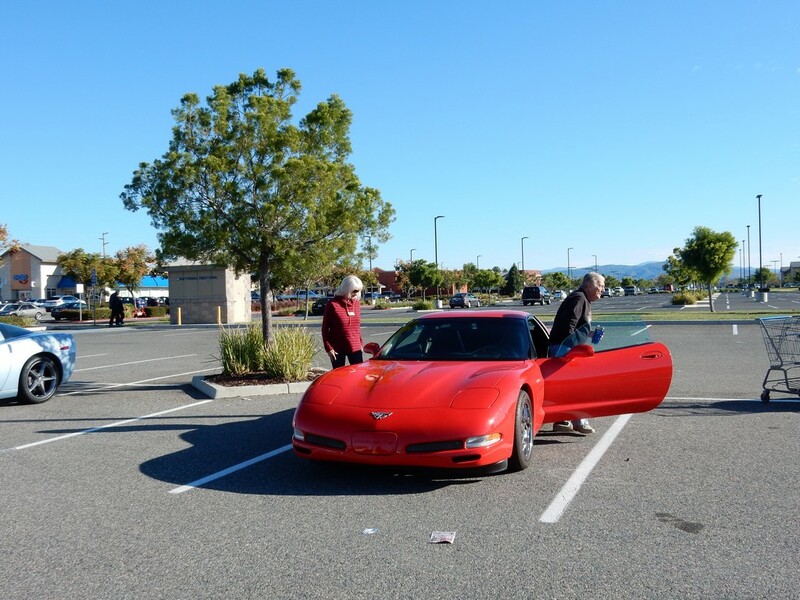 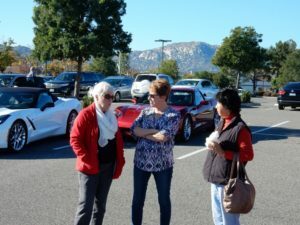 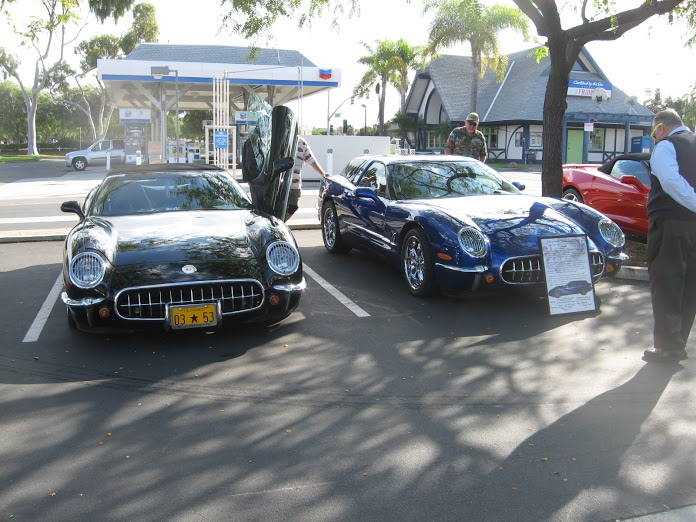 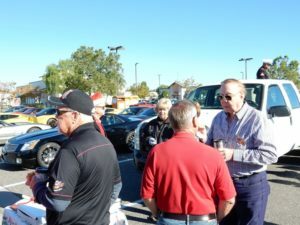 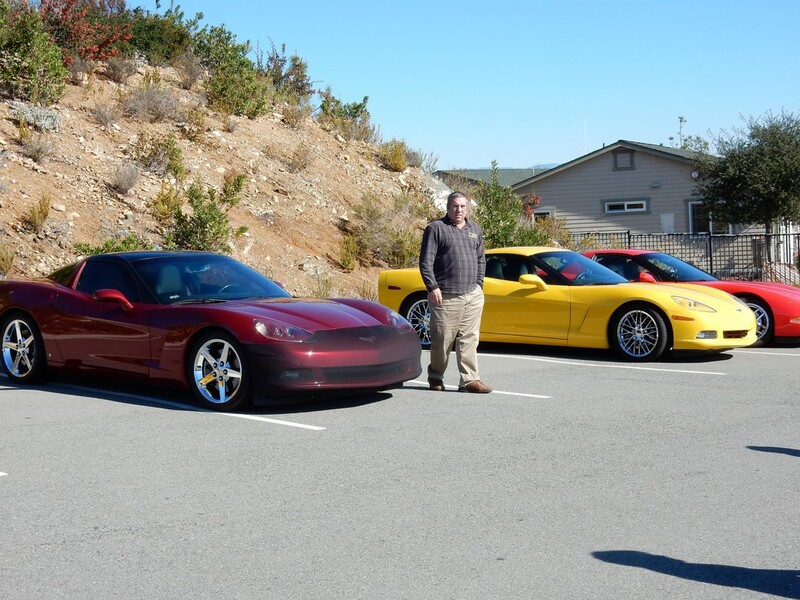 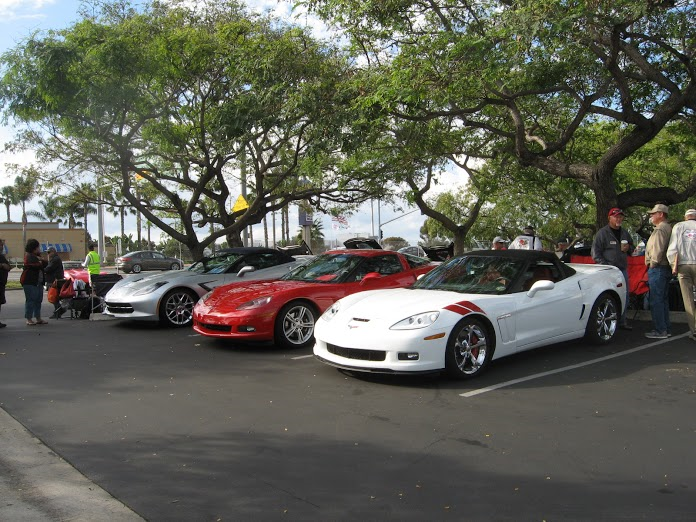 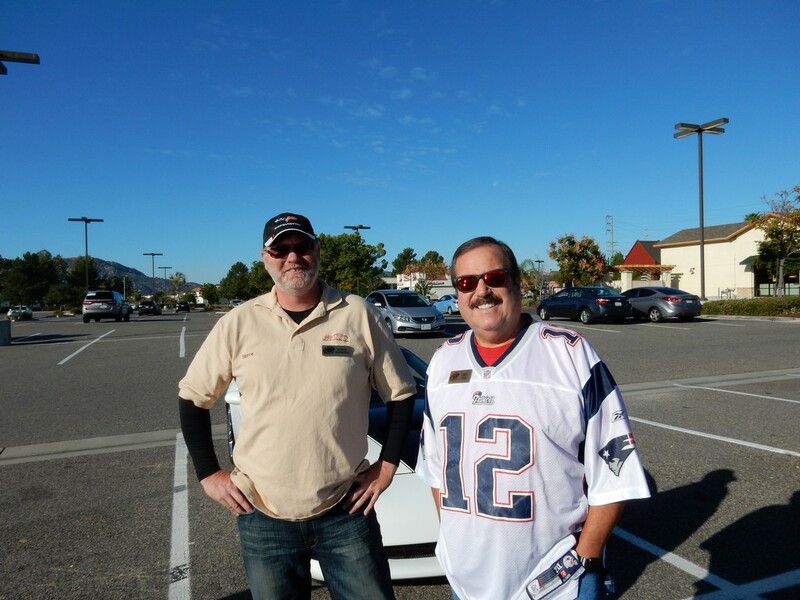 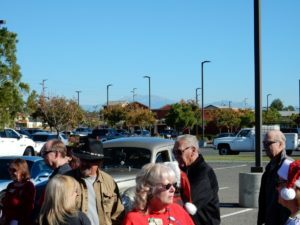 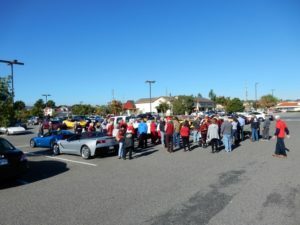 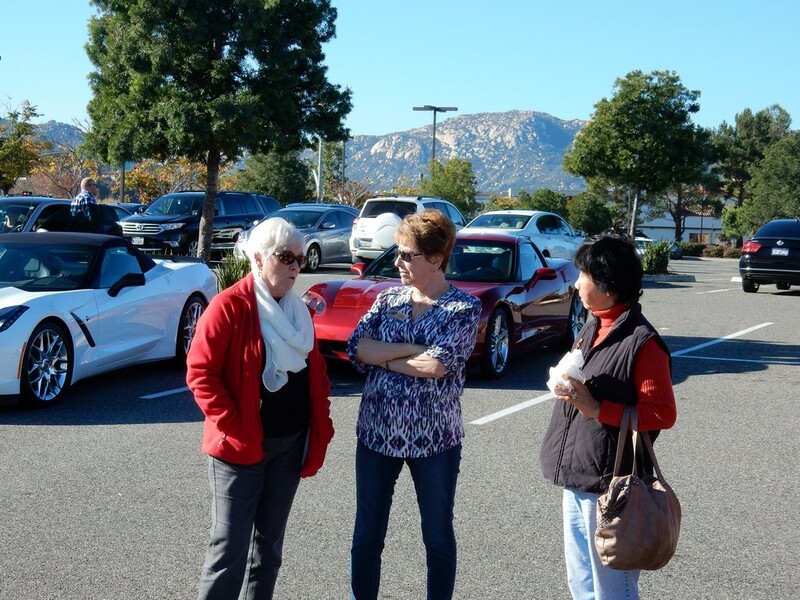 COTV was well represented at the “Vettes For Veterans” car show staged by North Coast Vettes on Sunday, November 15. 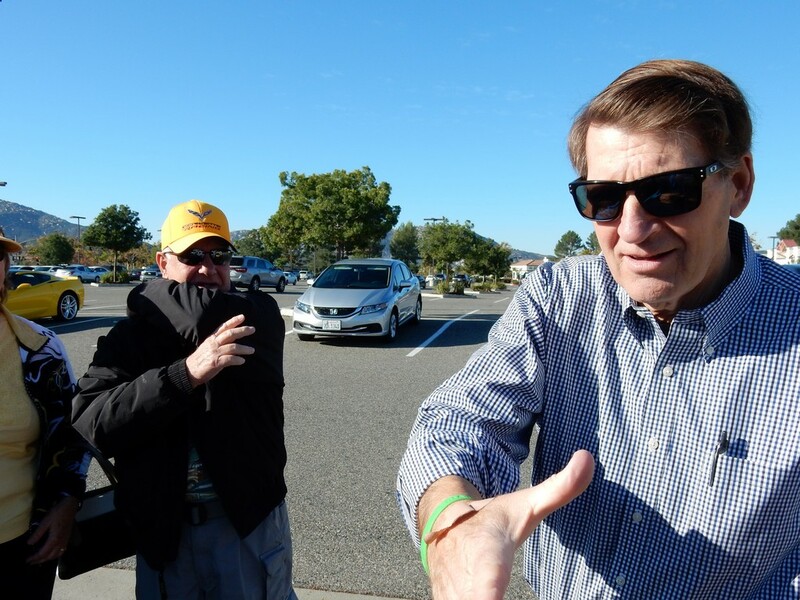 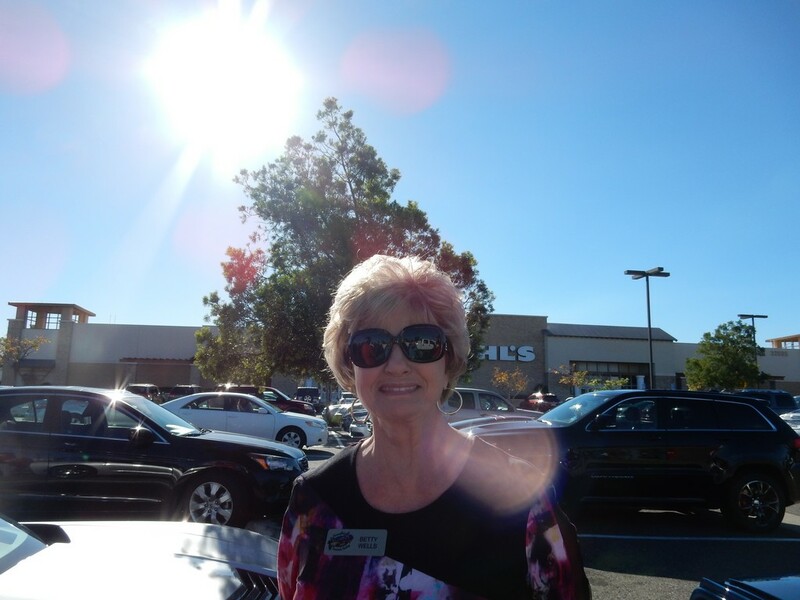 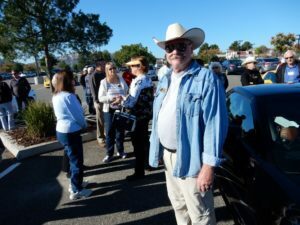 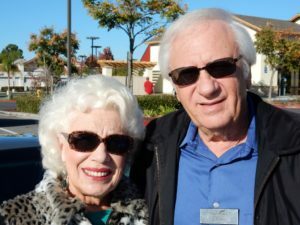 The show took place in the large parking lot at T.G.I.Fridays in Carlsbad and although the forecast was for rain showers none fell. Karma. 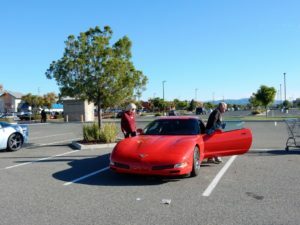 North Coast Vettes was really well organized with dedicated parking areas for each club and a central area where a red, a white, and a blue Corvette from each C-generation were parked next to each other. 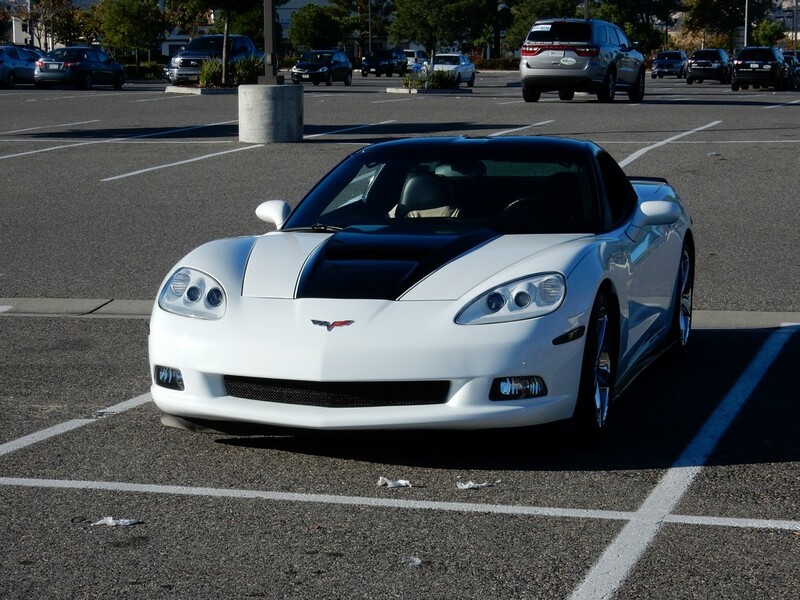 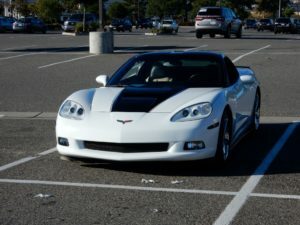 Steve Rose’s C5 was the white car for that generation. 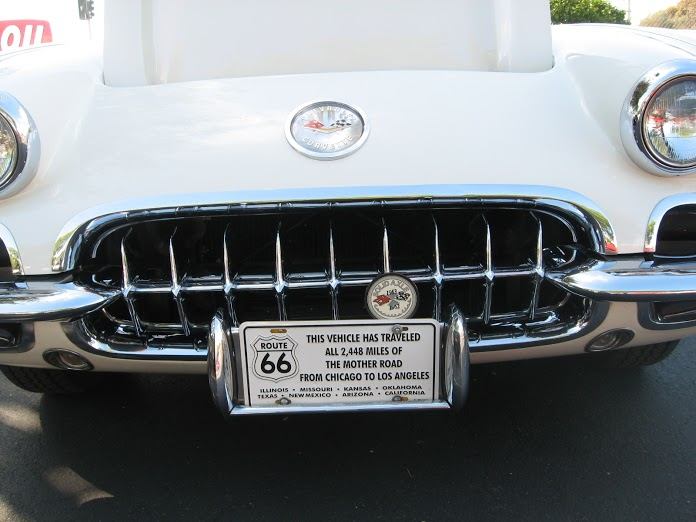 Joe Priebe’s ’63 Split Window also had a place of honor at the front of the show. 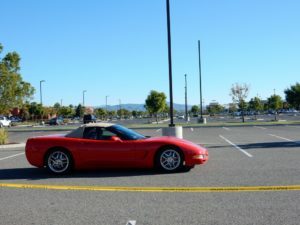 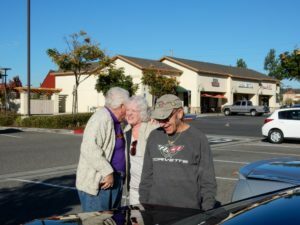 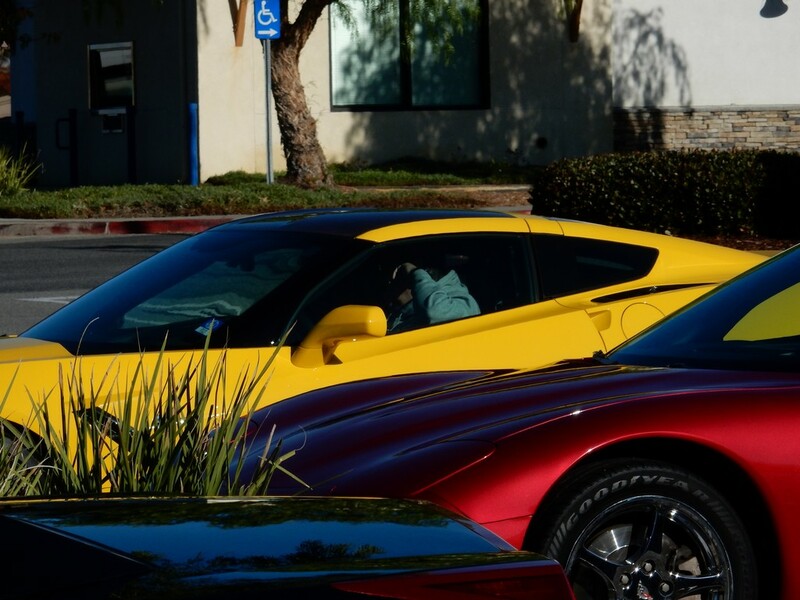 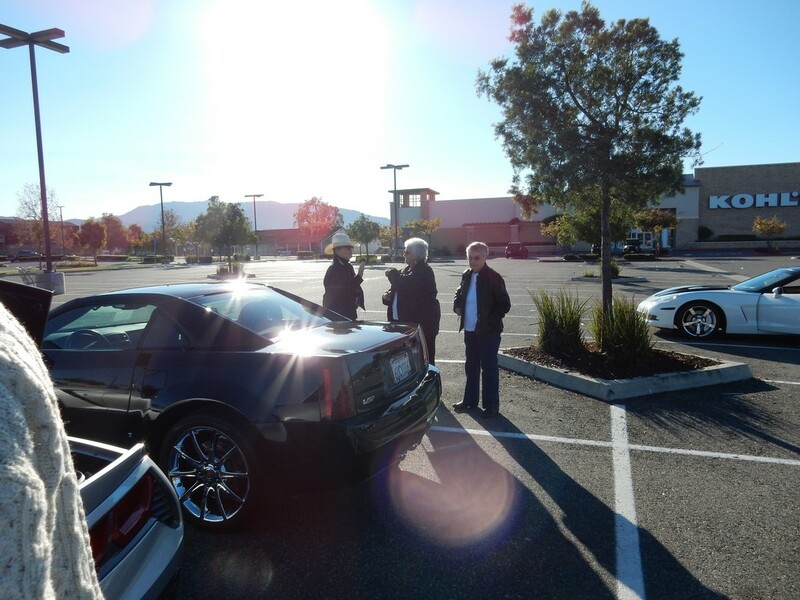 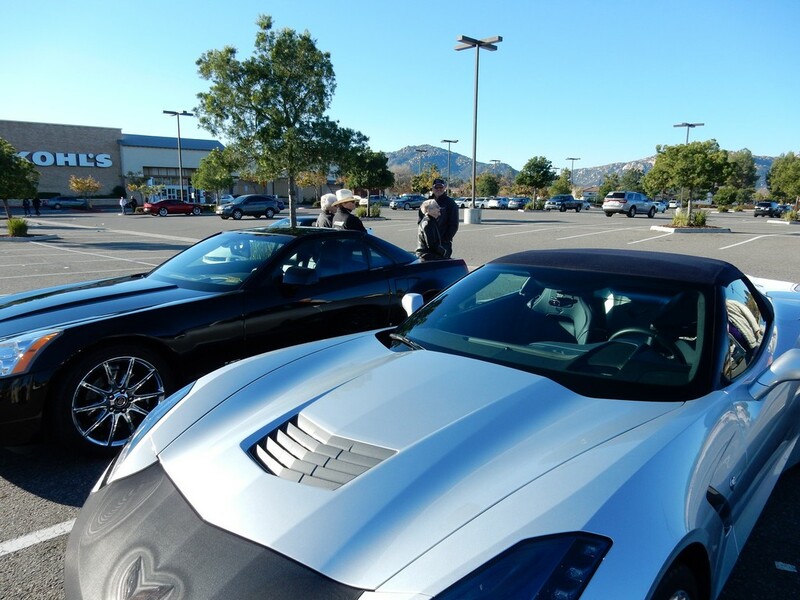 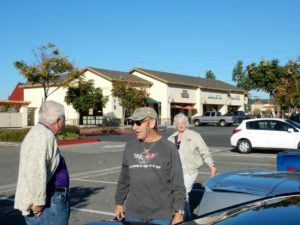 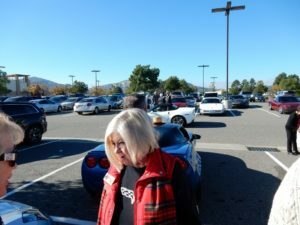 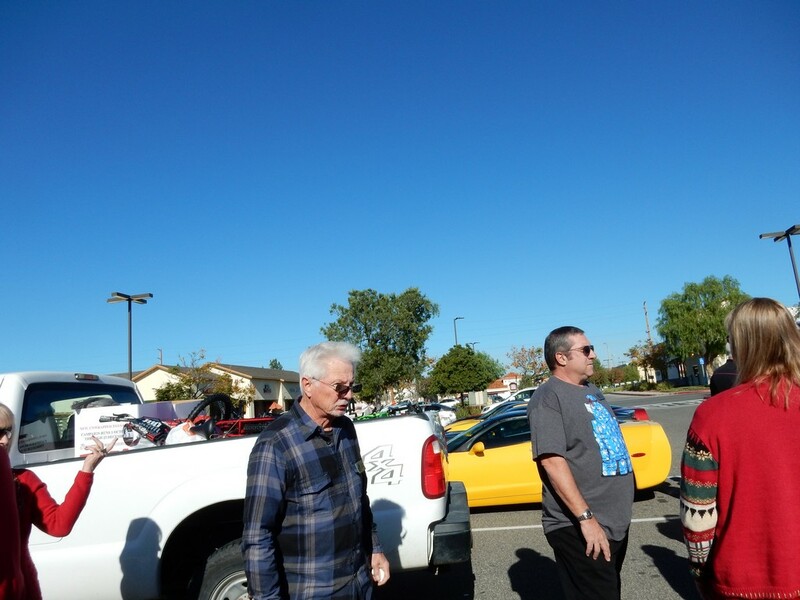 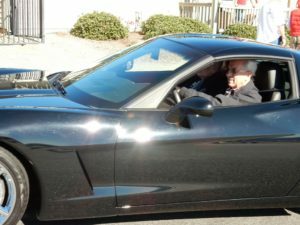 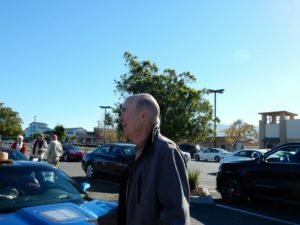 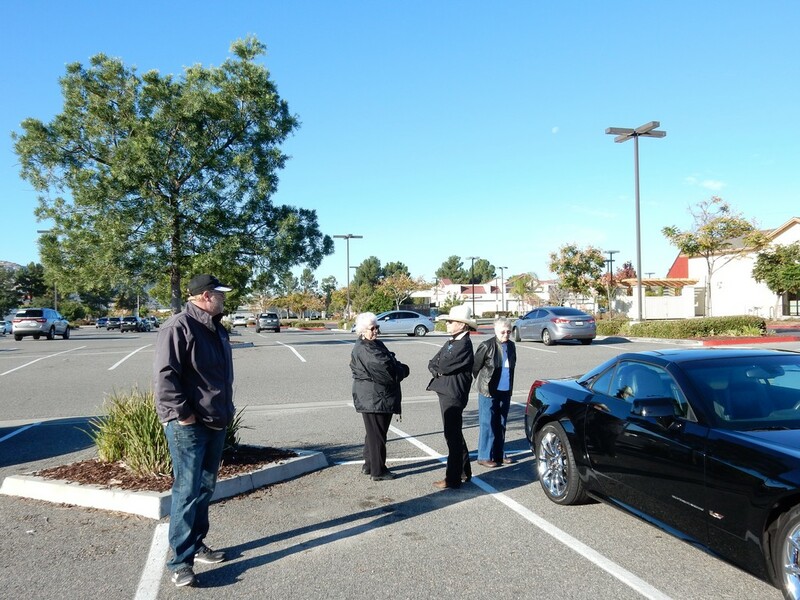 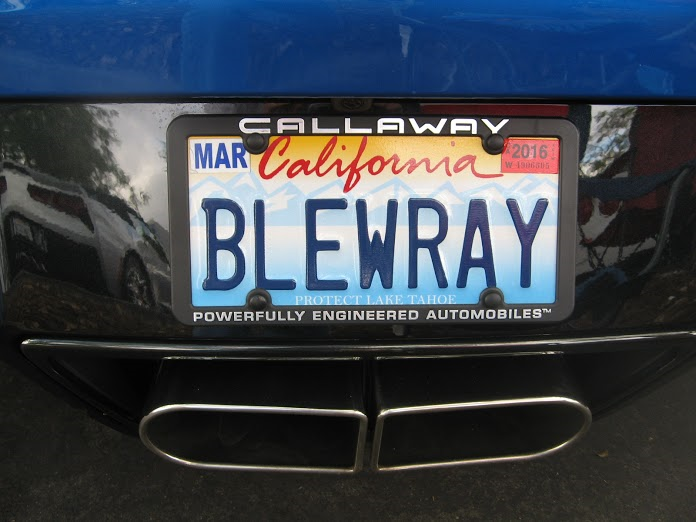 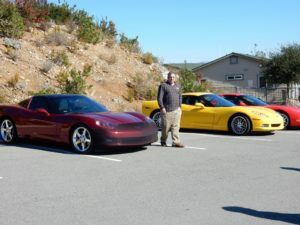 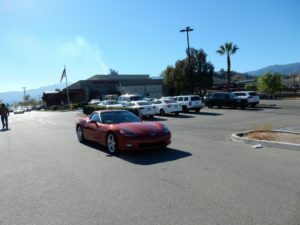 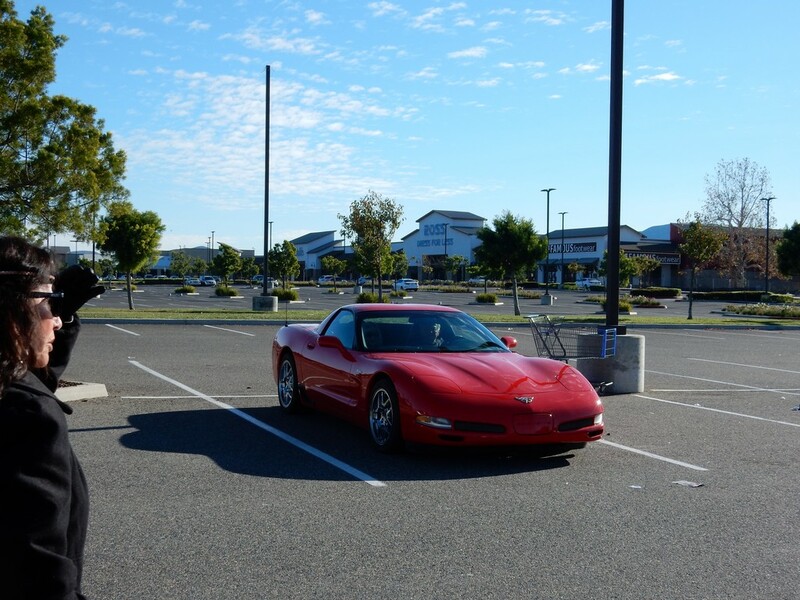 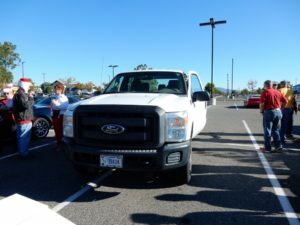 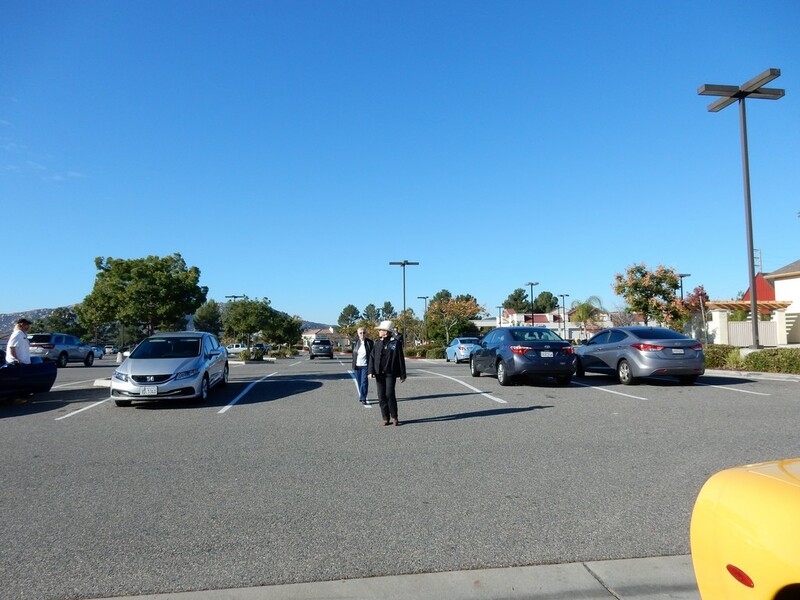 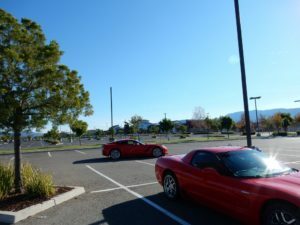 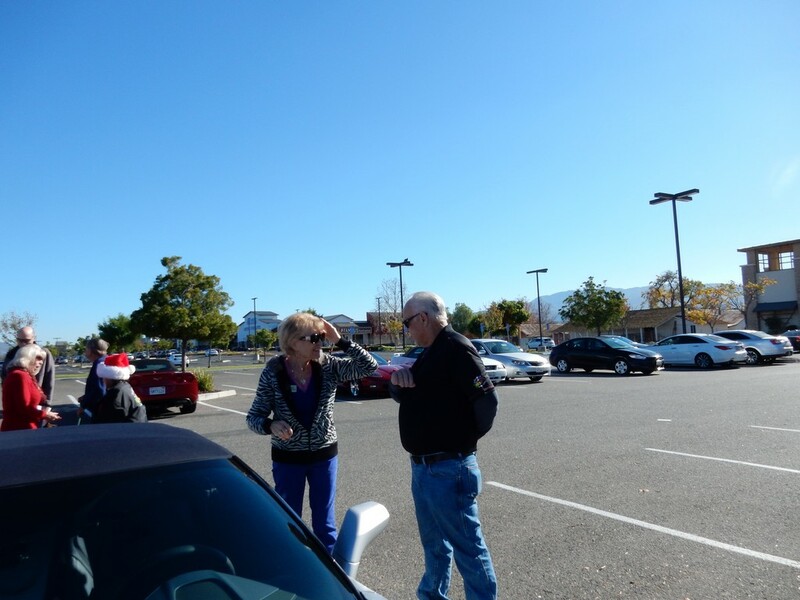 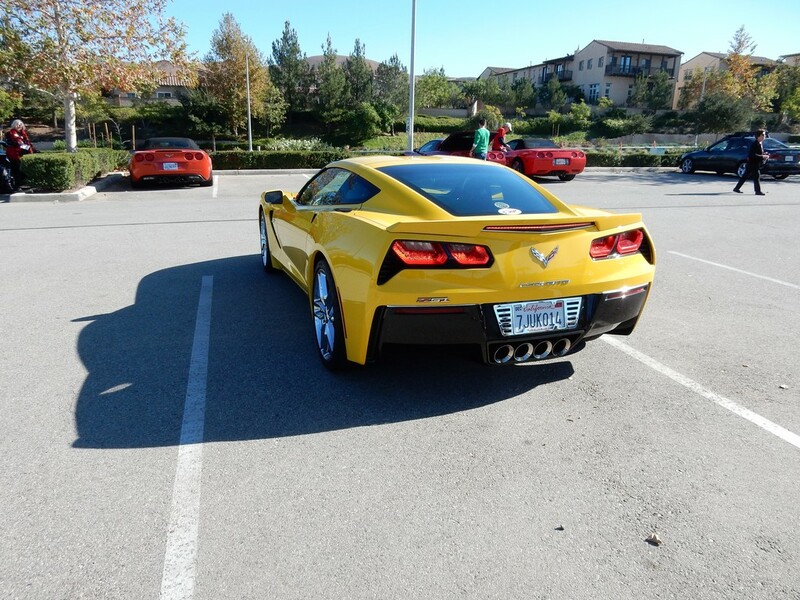 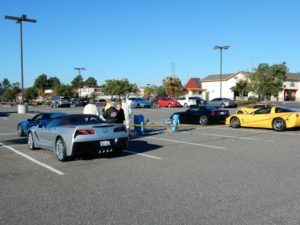 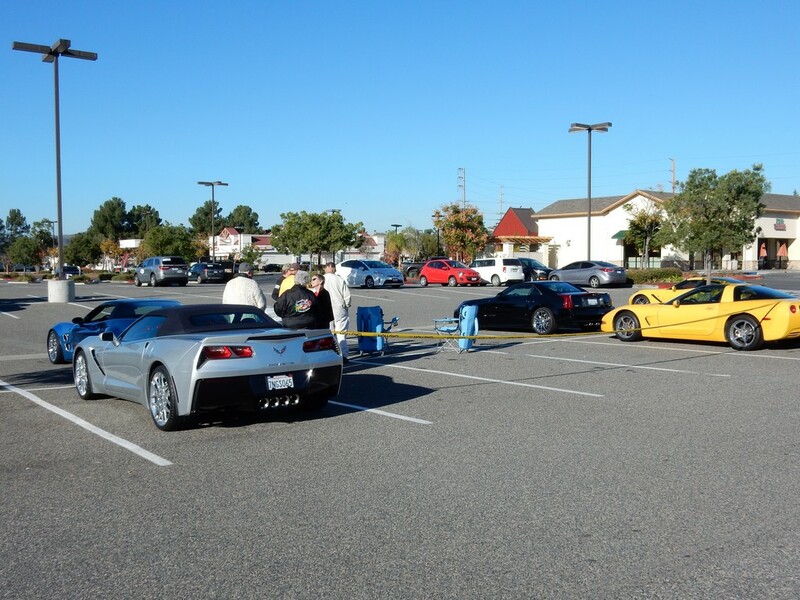 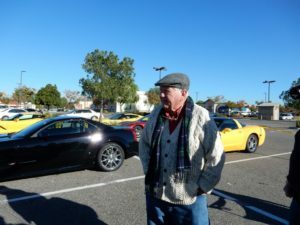 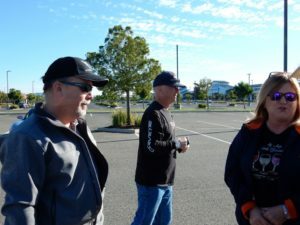 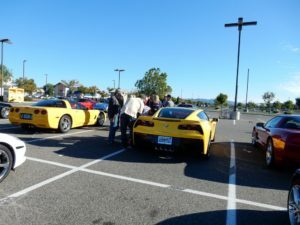 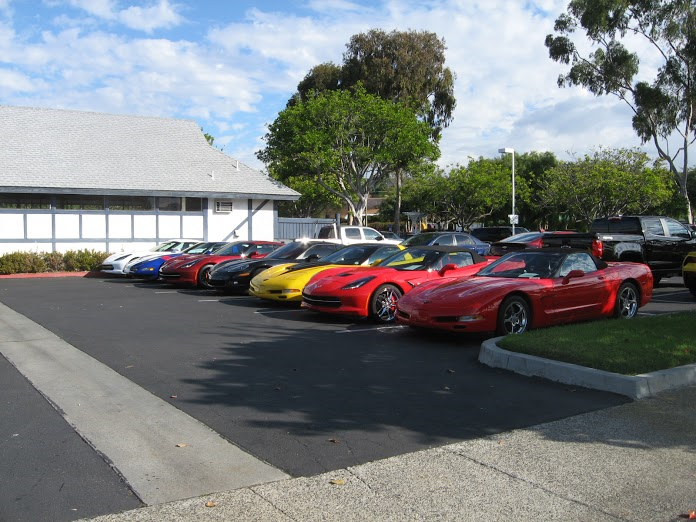 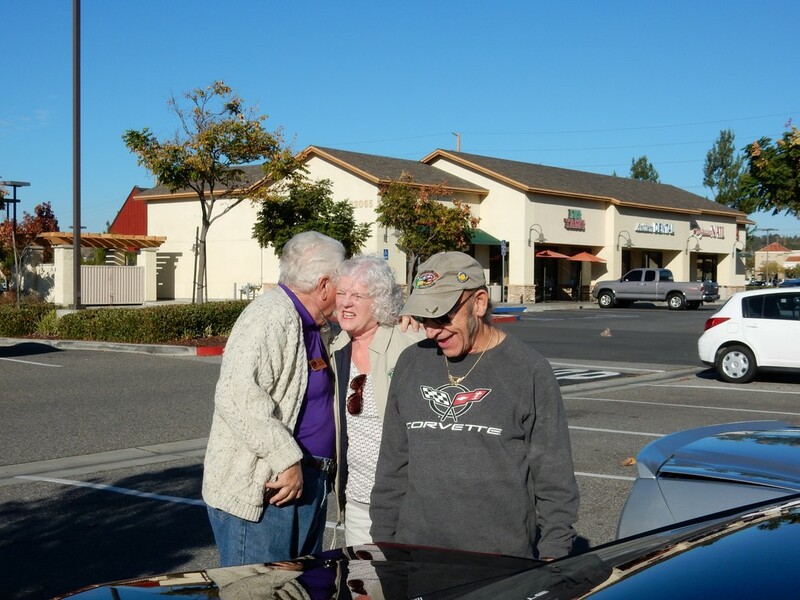 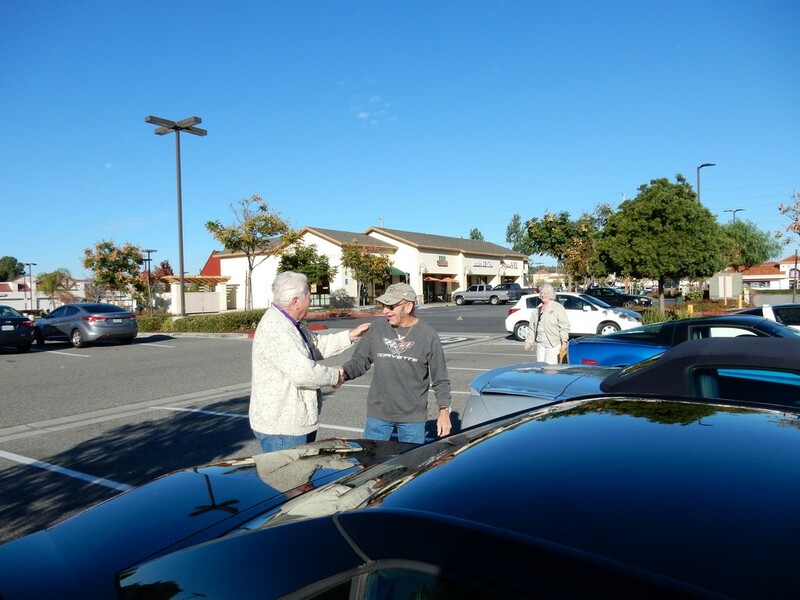 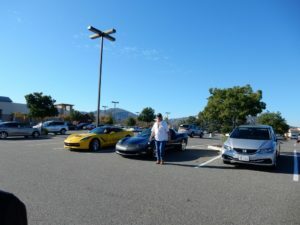 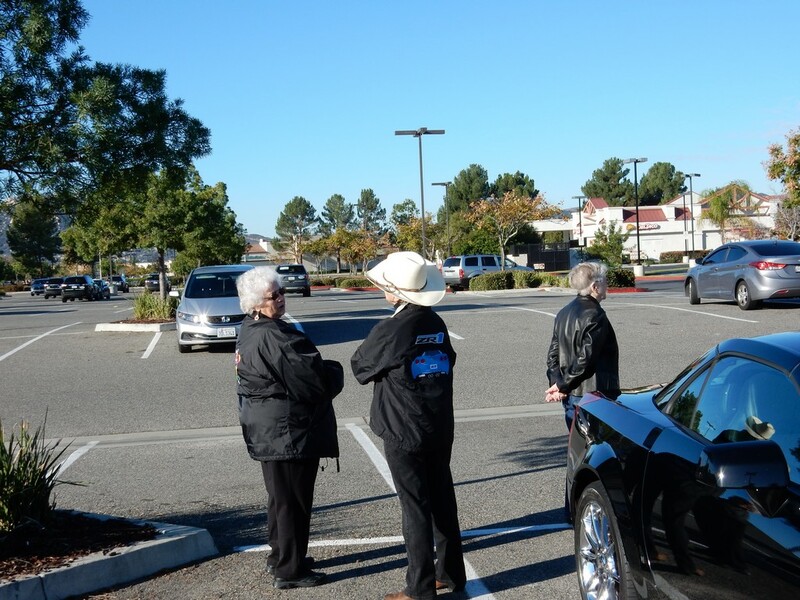 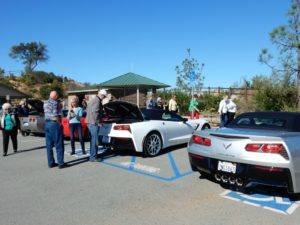 Other members who parked in the COTV area were Marilyn and Doug Glenore with their sparkling new C7, and Bill Steed, Dave Hellman, and Bill Stedfield with their C6s. Jerry Roubos also was in attendance though he did not enter his car in the show. 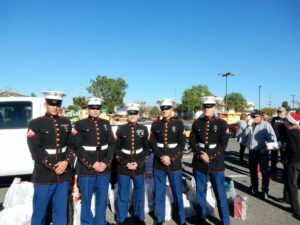 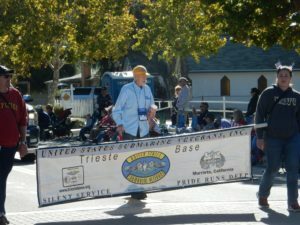 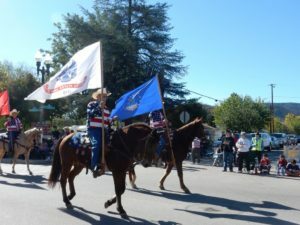 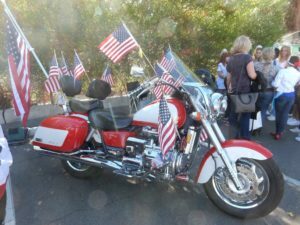 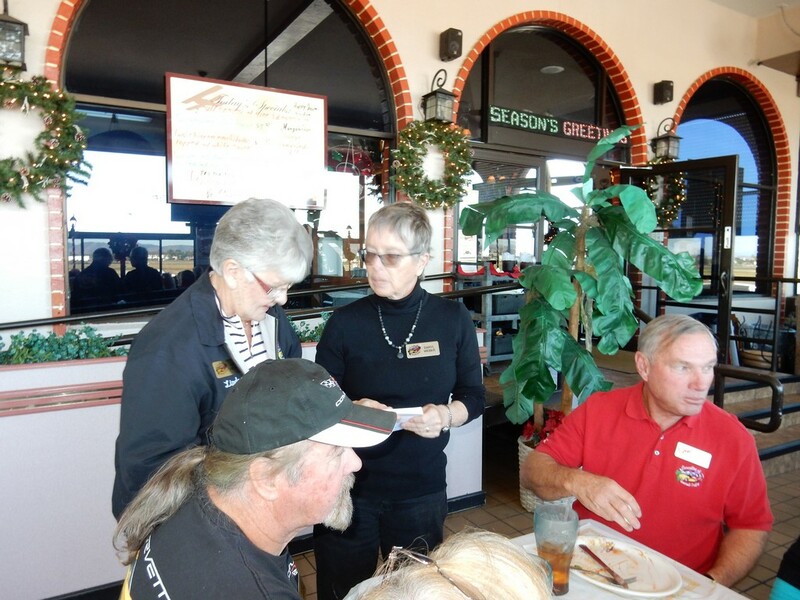 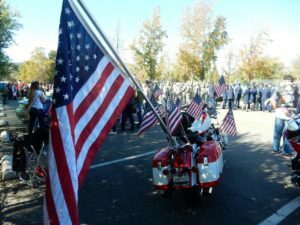 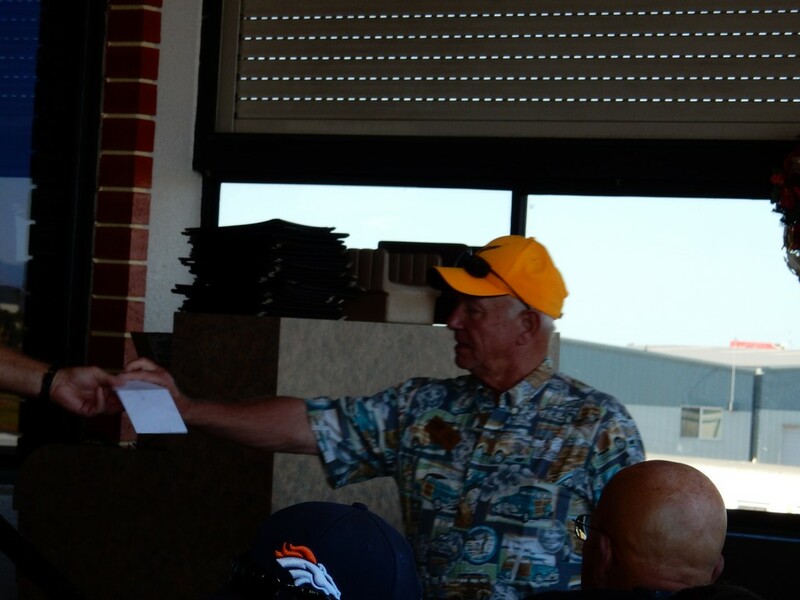 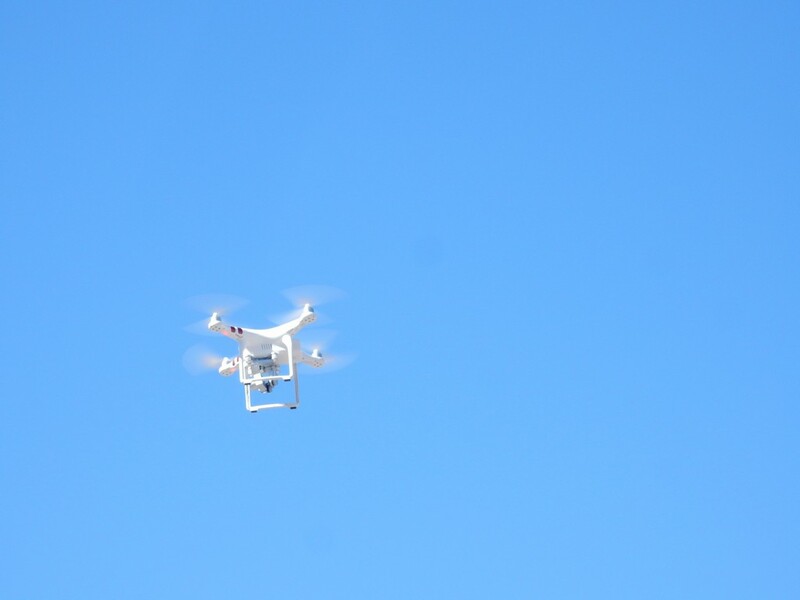 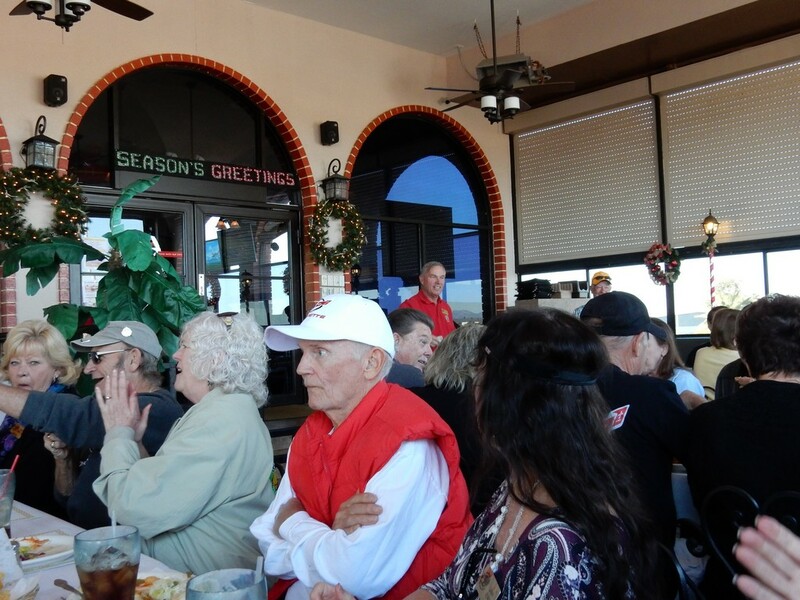 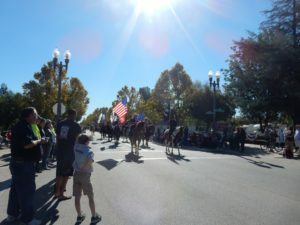 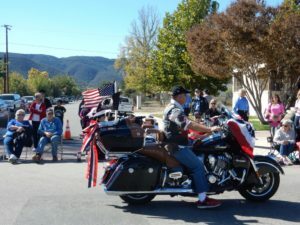 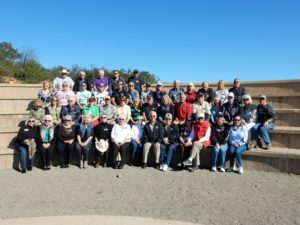 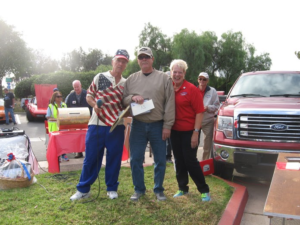 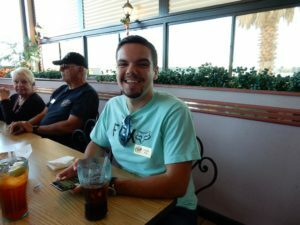 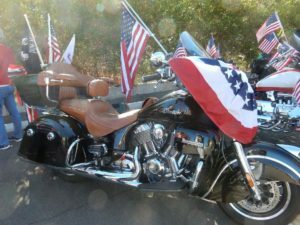 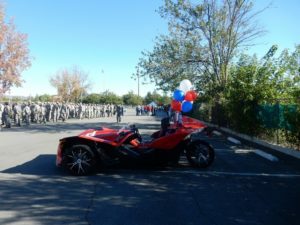 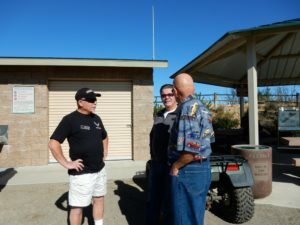 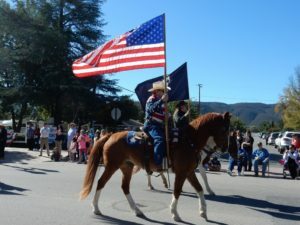 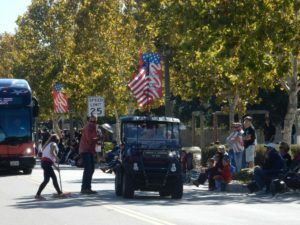 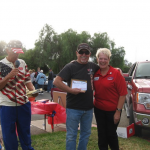 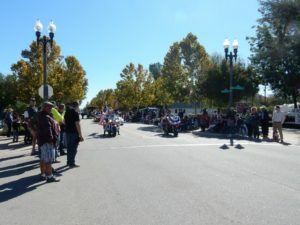 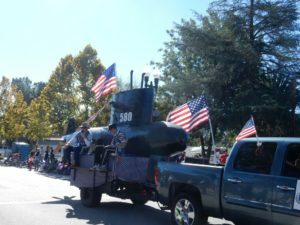 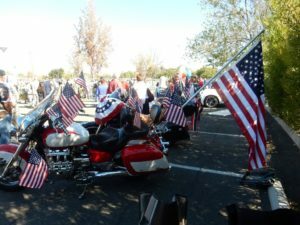 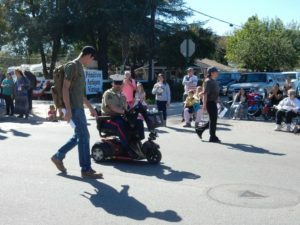 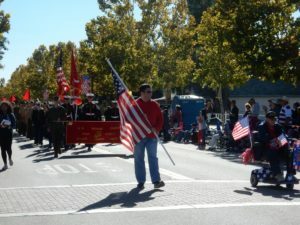 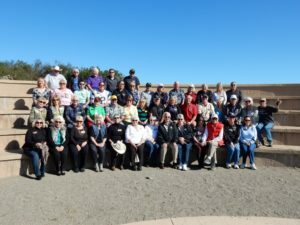 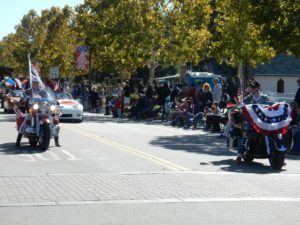 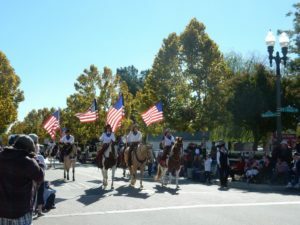 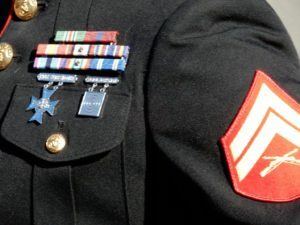 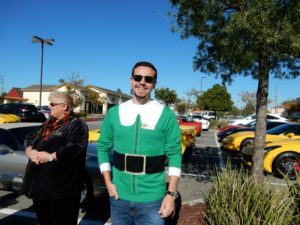 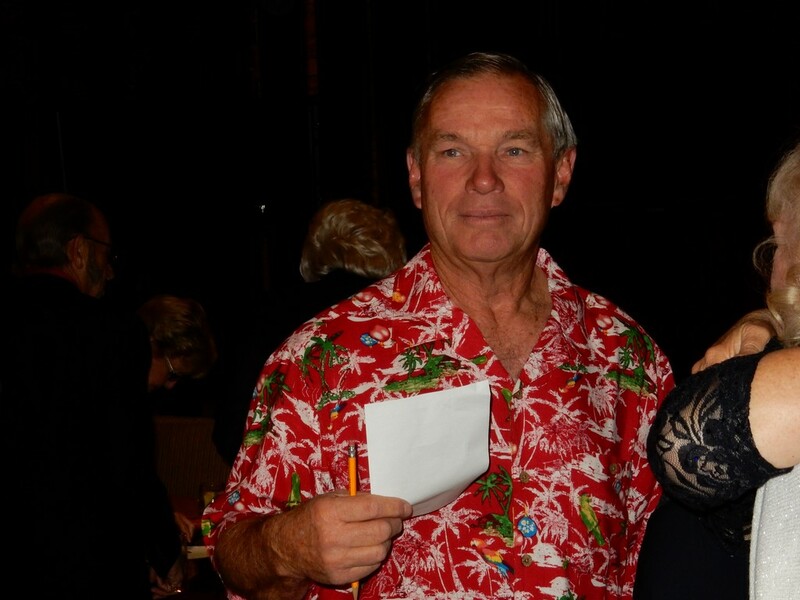 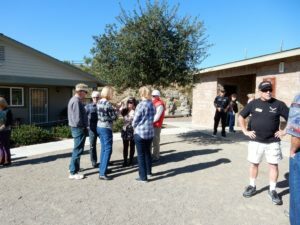 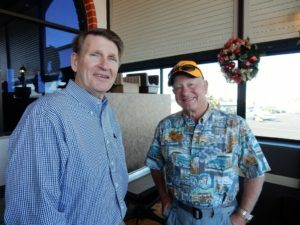 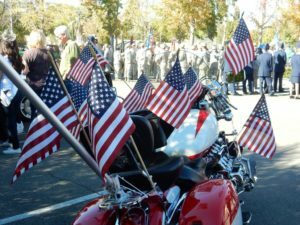 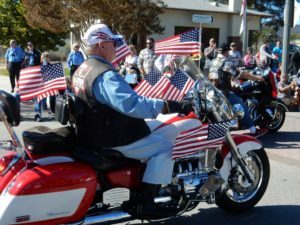 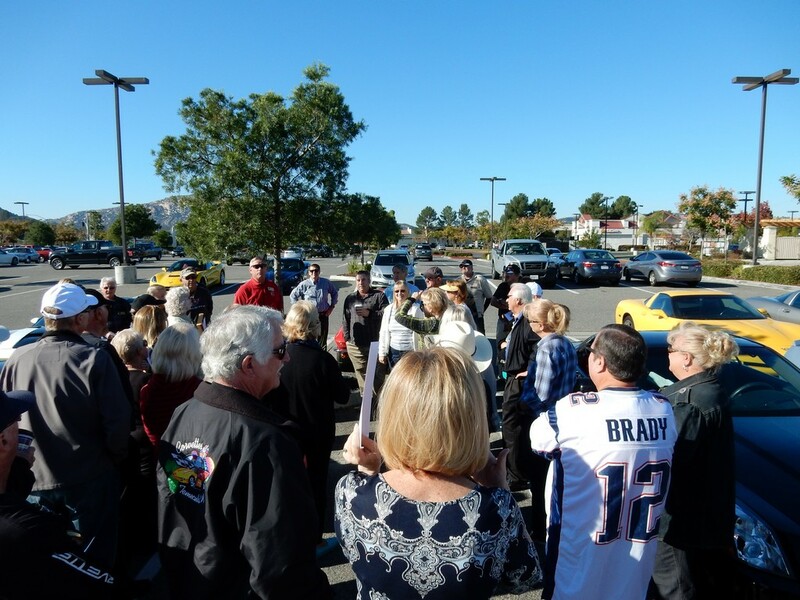 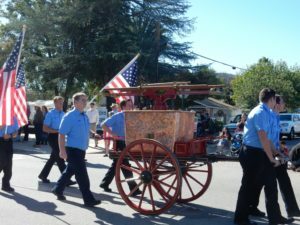 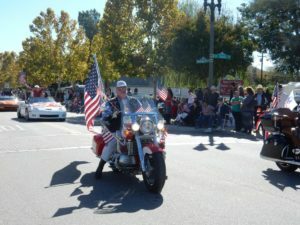 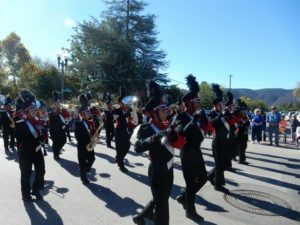 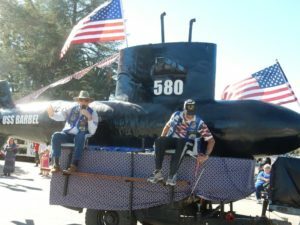 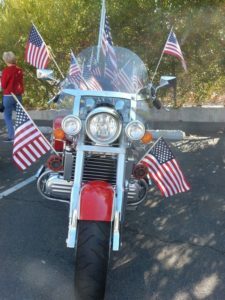 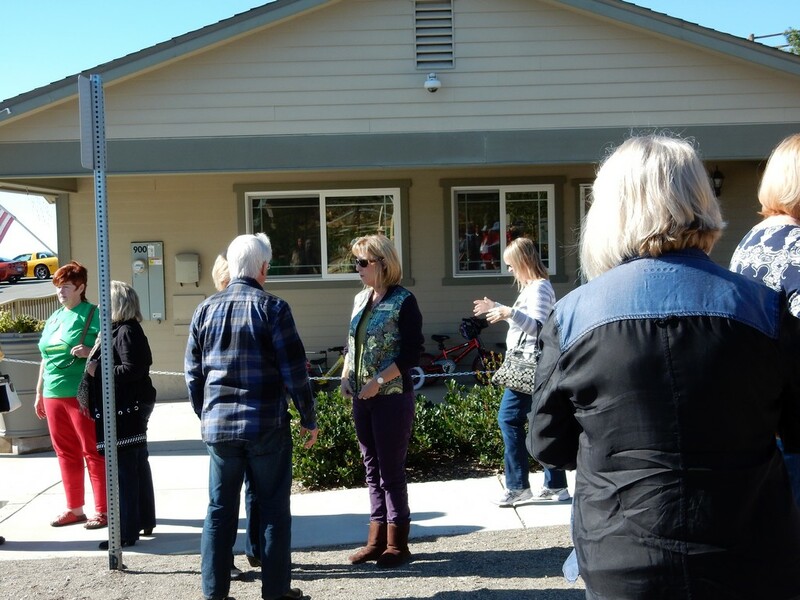 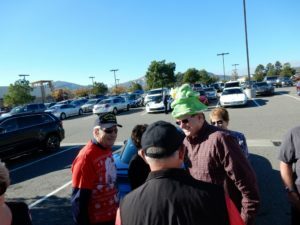 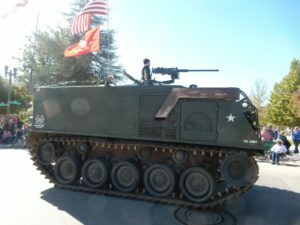 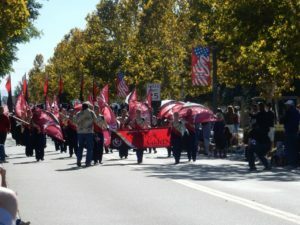 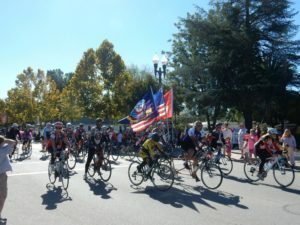 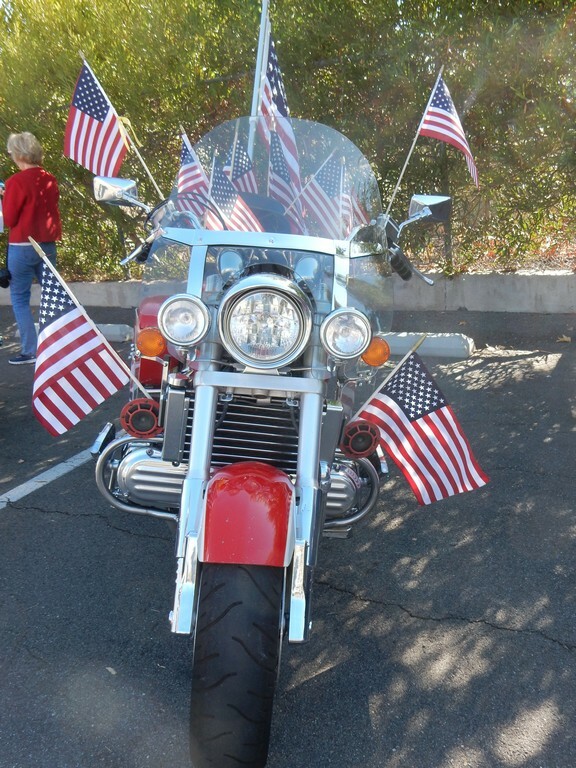 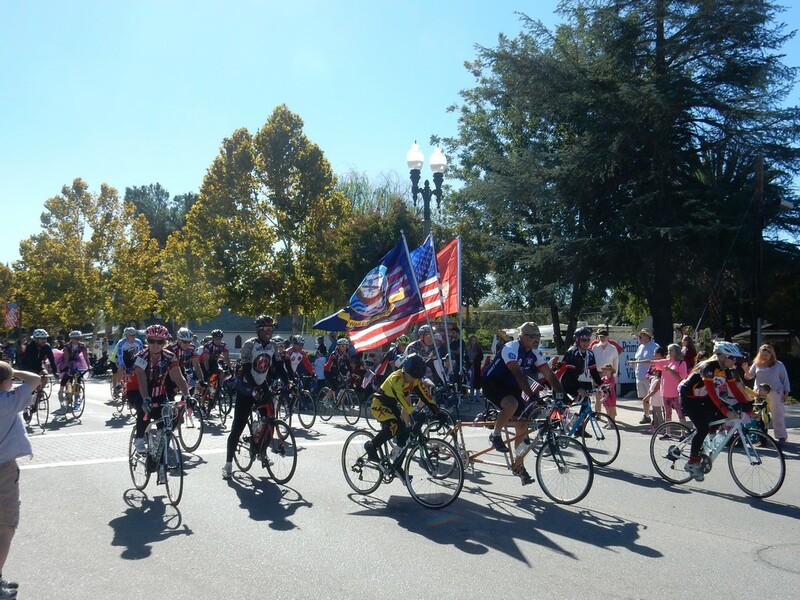 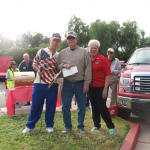 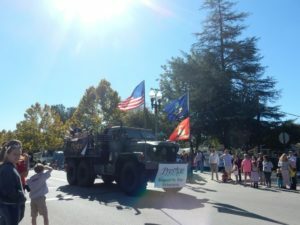 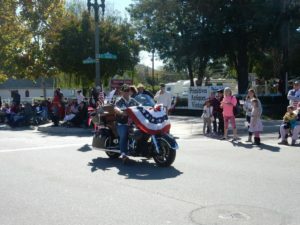 All proceeds, including entry fees, raffle tickets, and silent auction items, went to two charities, “The Semper-Fi Fund of San Diego” and “Paralyzed Veterans of America”, Cal-Diego Chapter. 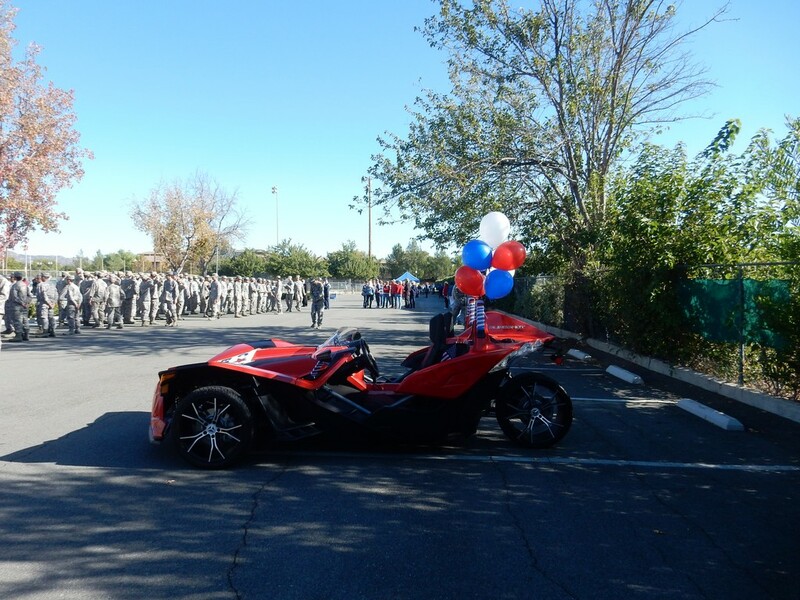 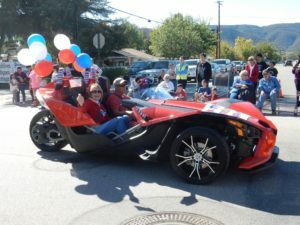 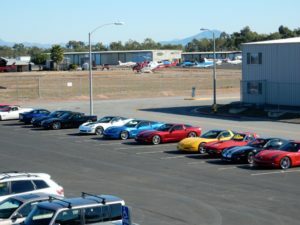 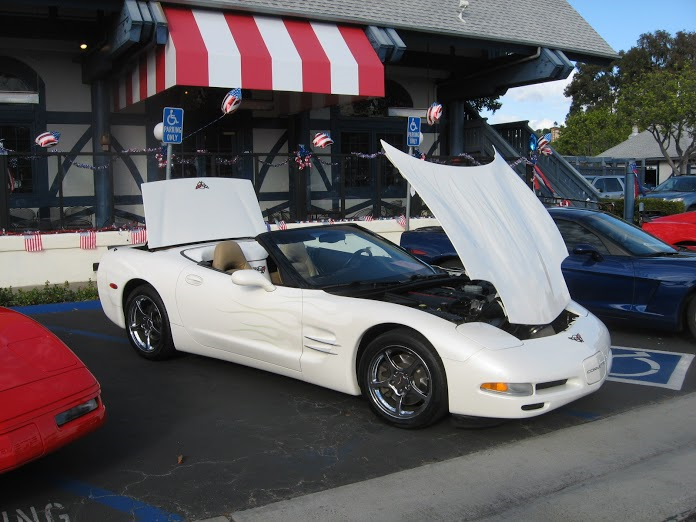 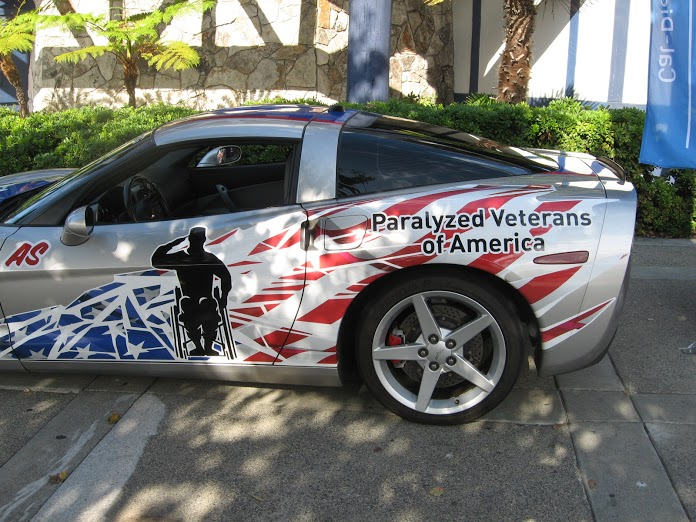 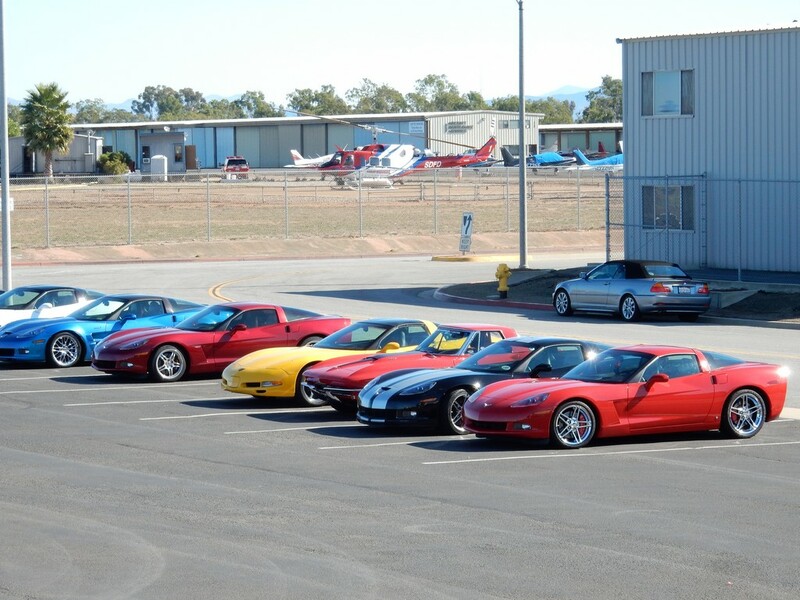 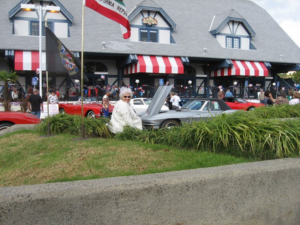 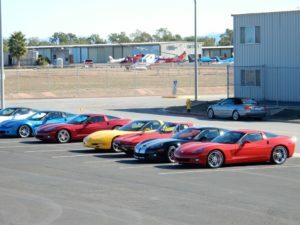 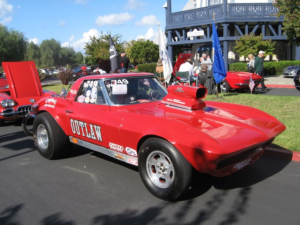 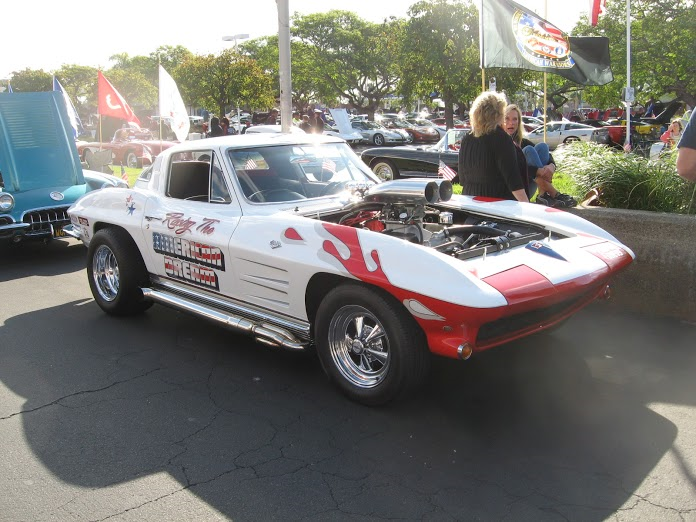 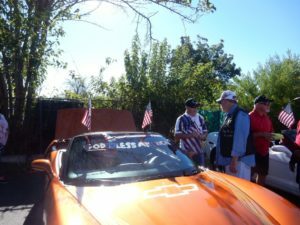 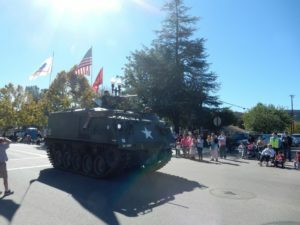 This was the fourth year of Vettes For Veterans and in excess of $40,000 had been raised from previous shows. 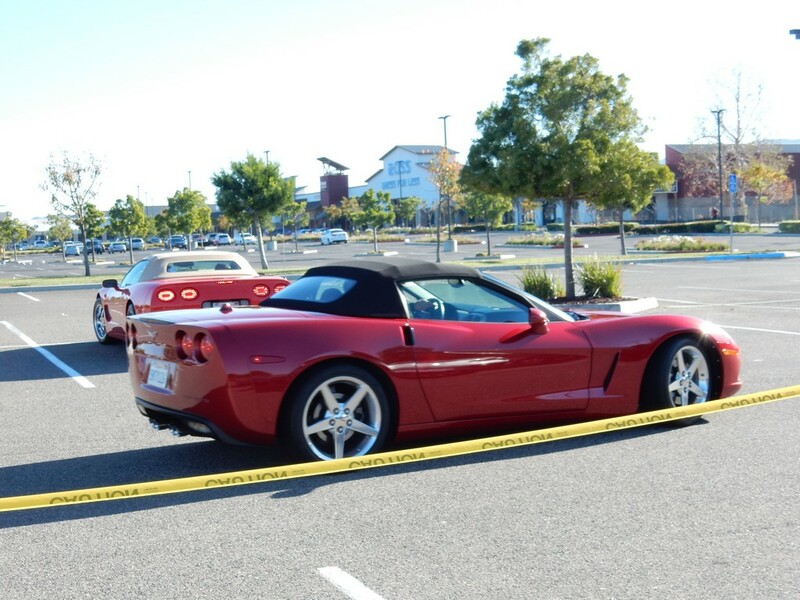 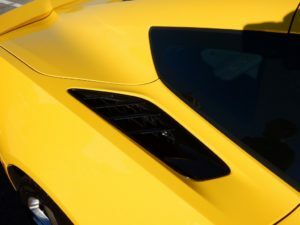 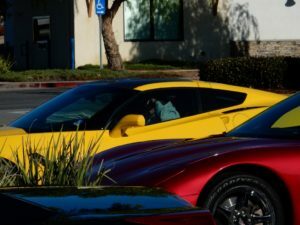 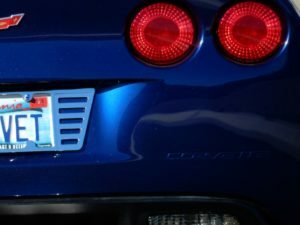 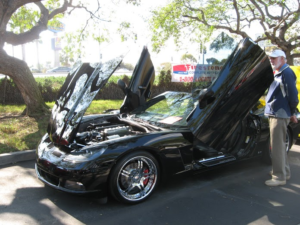 The unofficial estimate was that more than 160 Corvettes were entered. 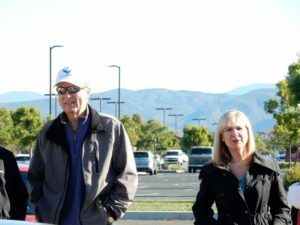 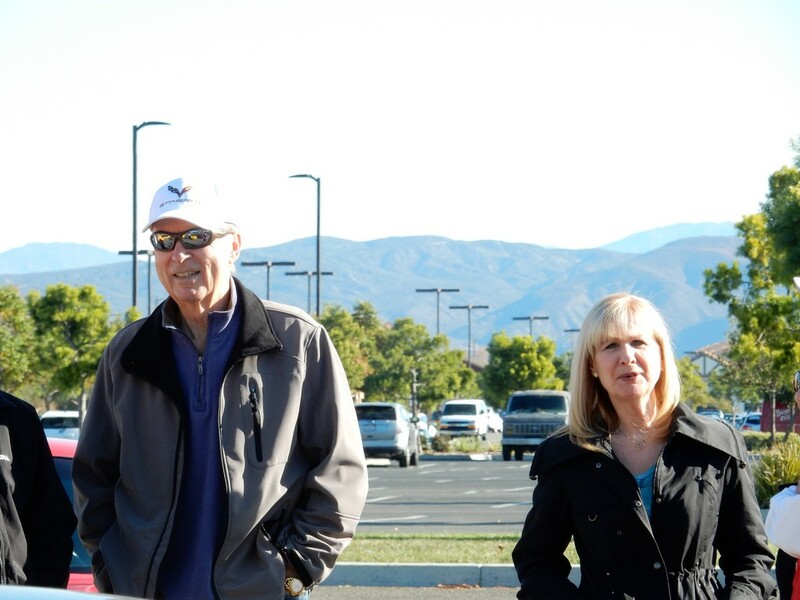 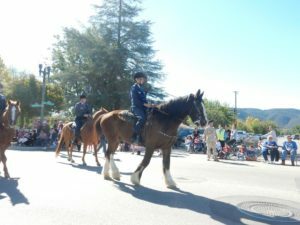 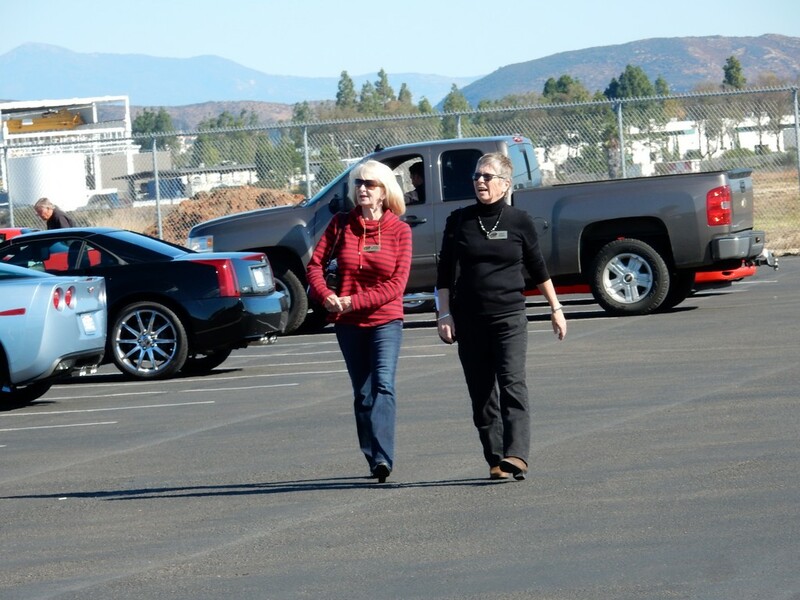 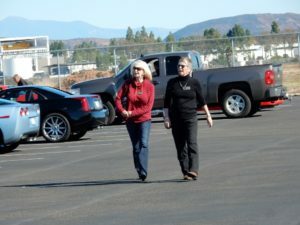 Judging was done by representatives from The Semper-Fi Fund. Steve Rose won 3rd Place for the C5 class. 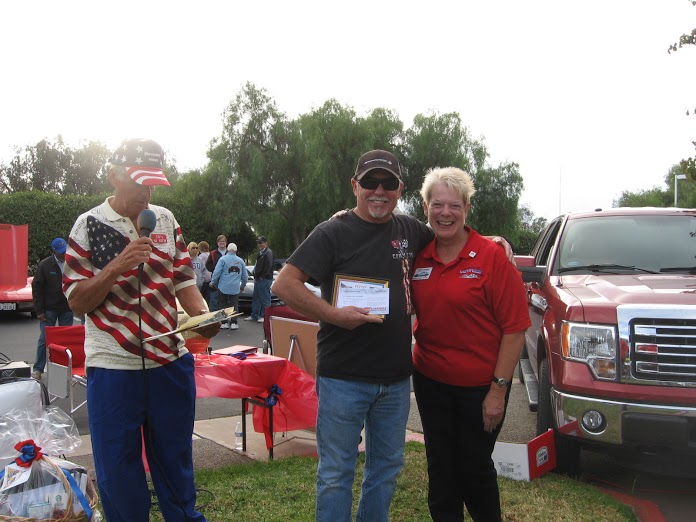 Joe won Best in Show! 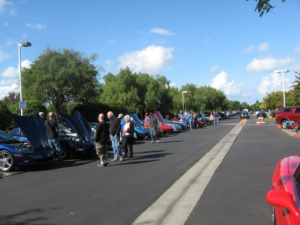 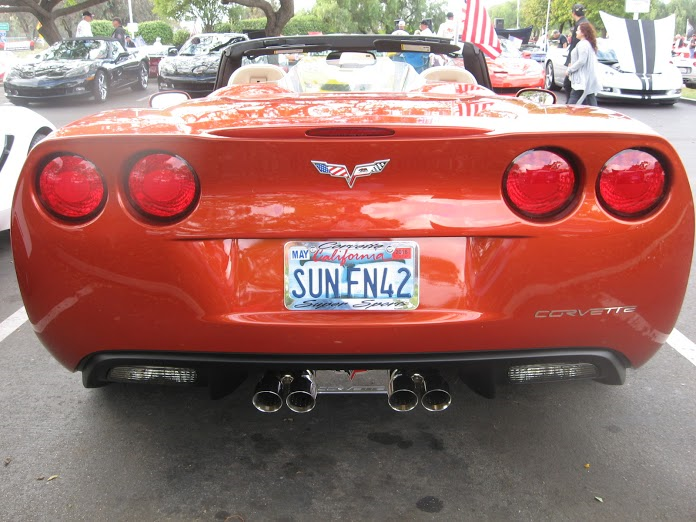 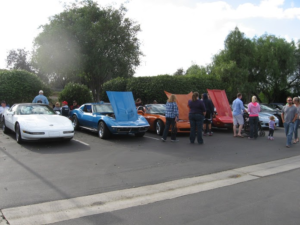 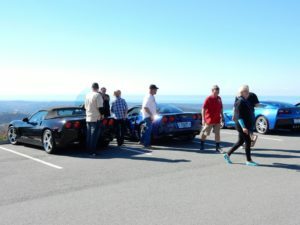 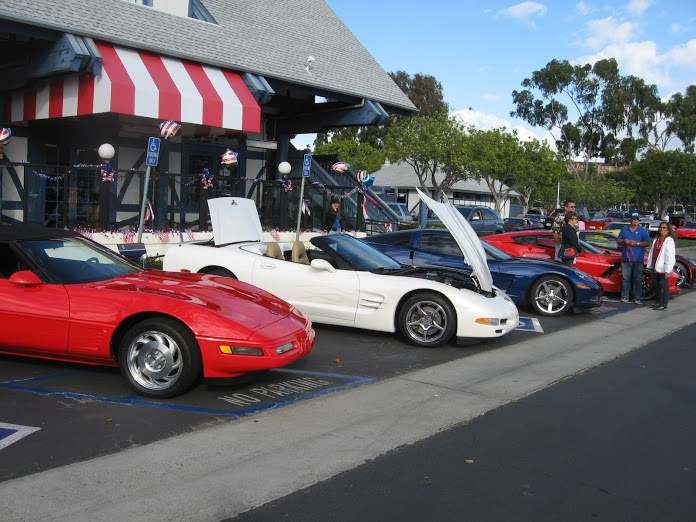 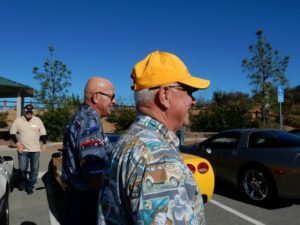 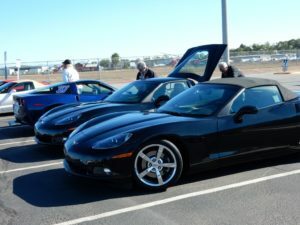 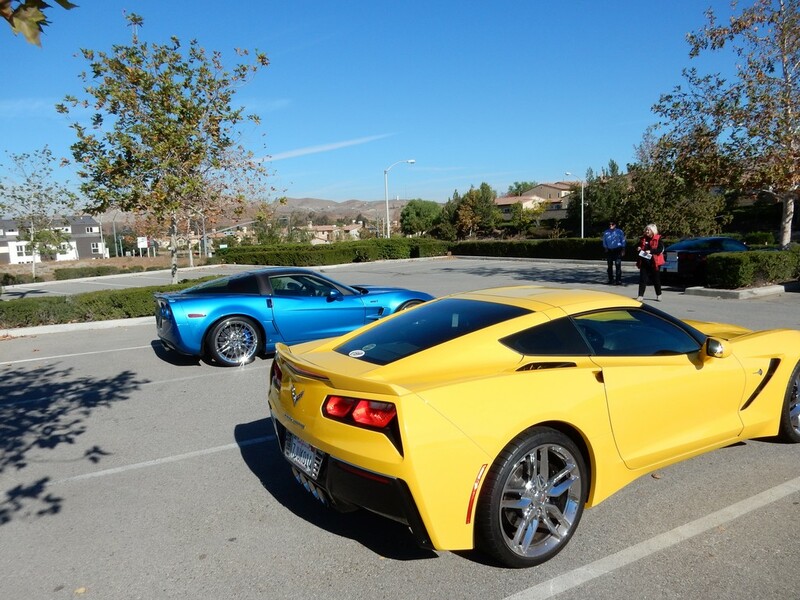 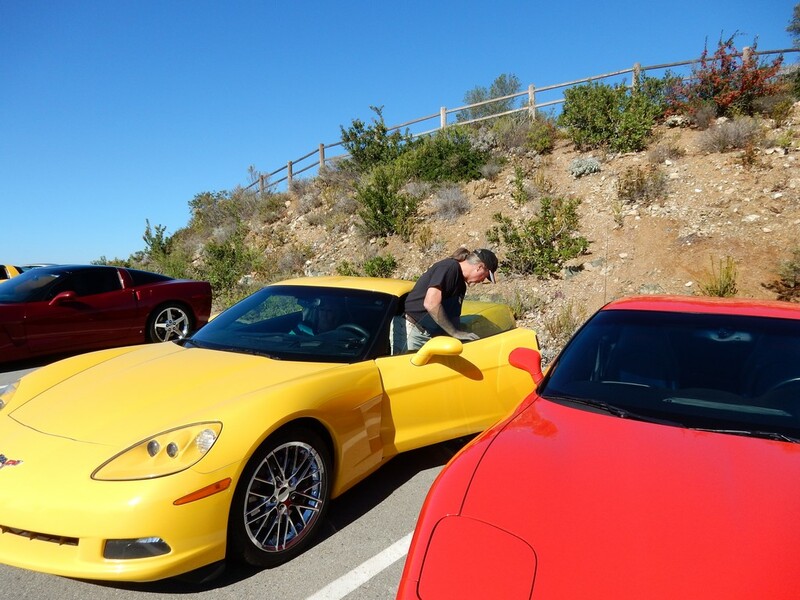 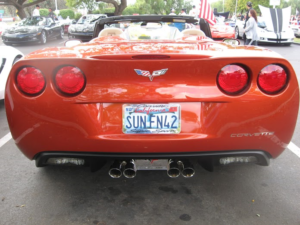 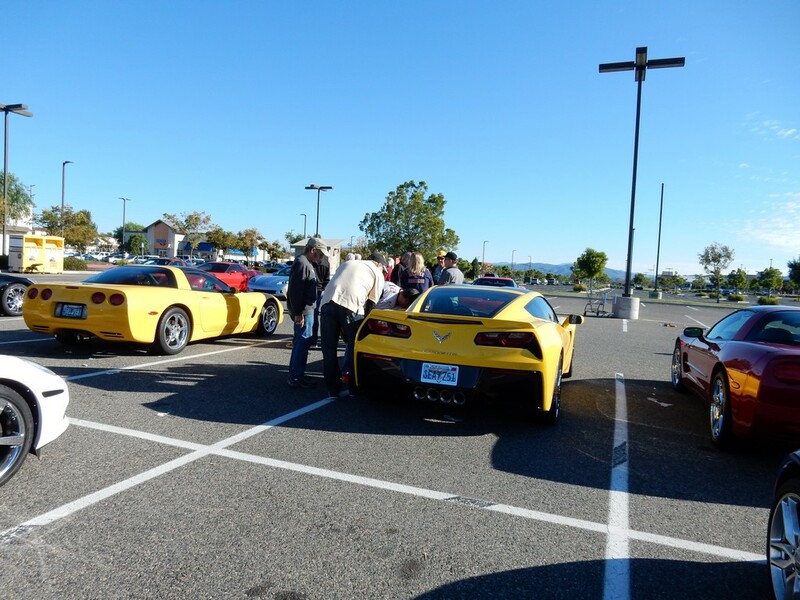 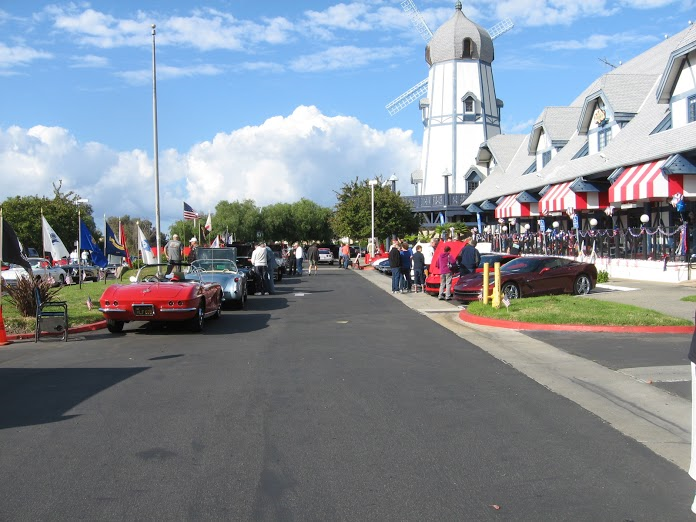 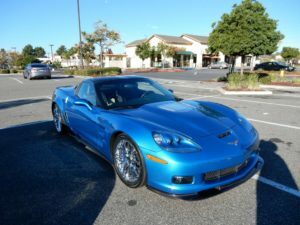 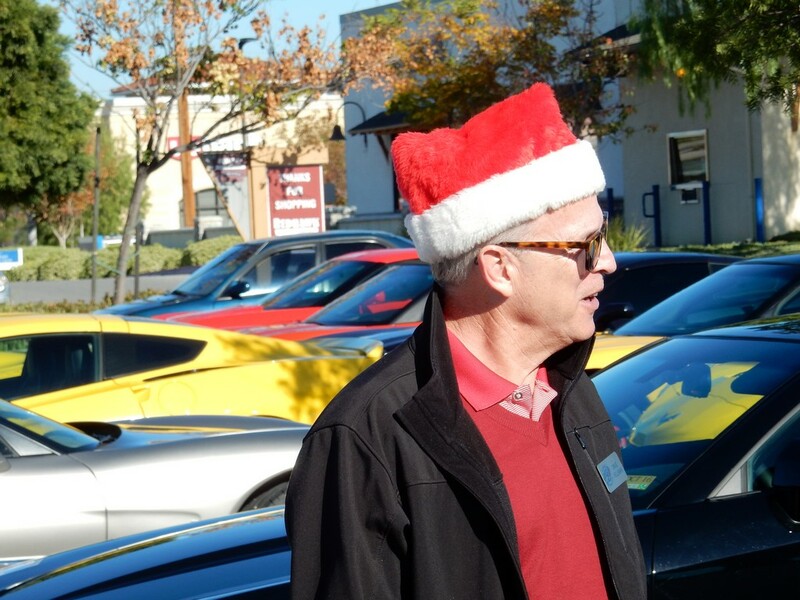 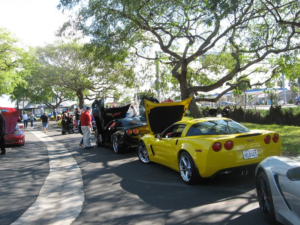 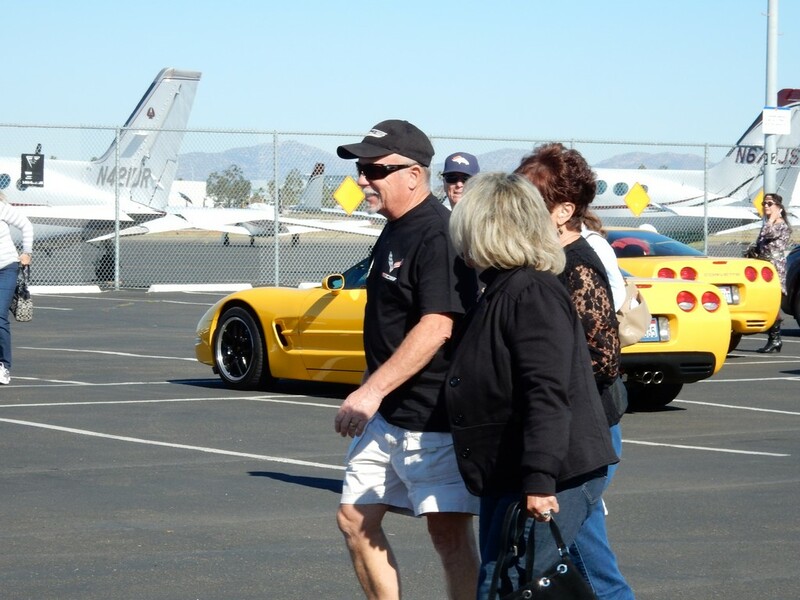 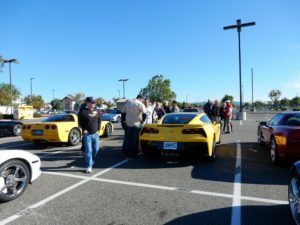 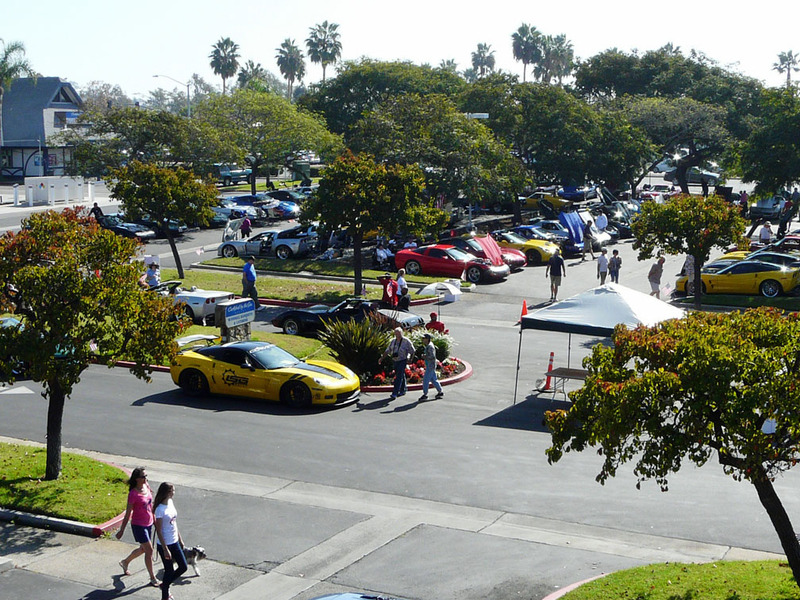 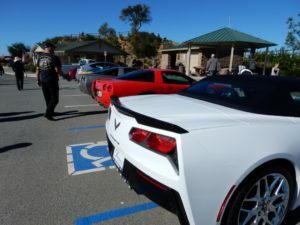 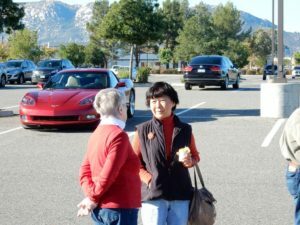 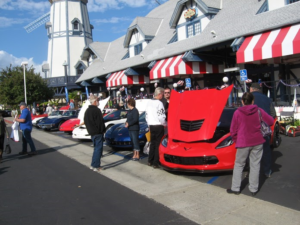 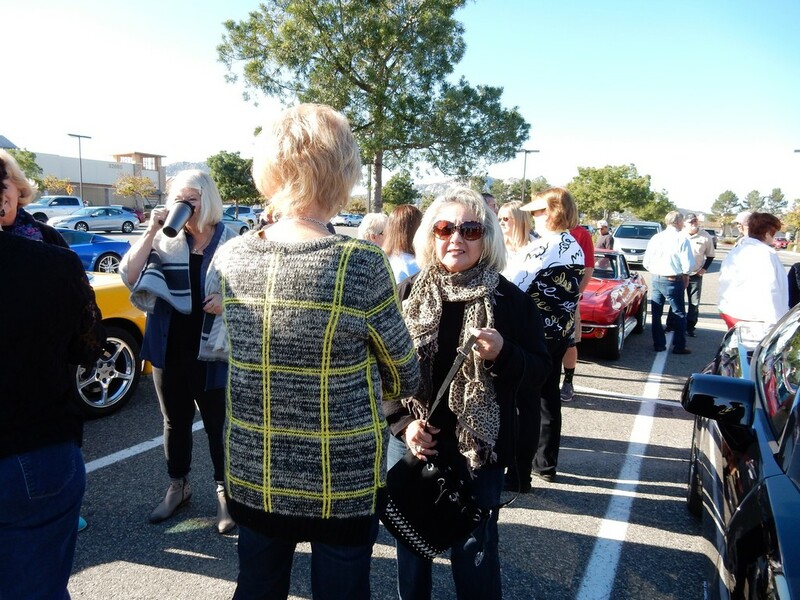 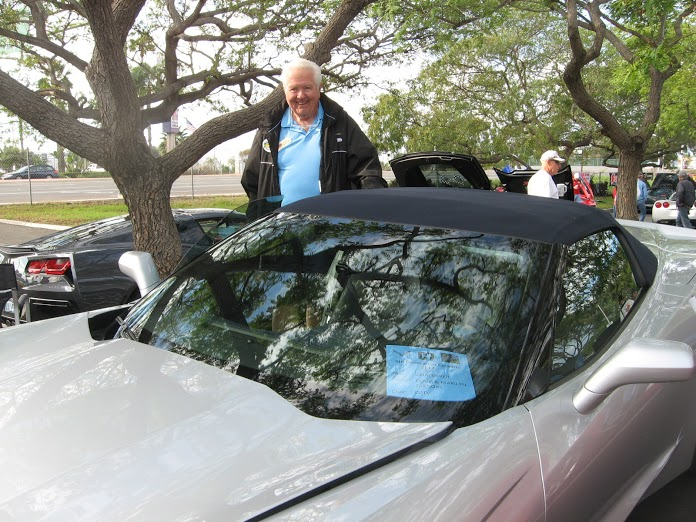 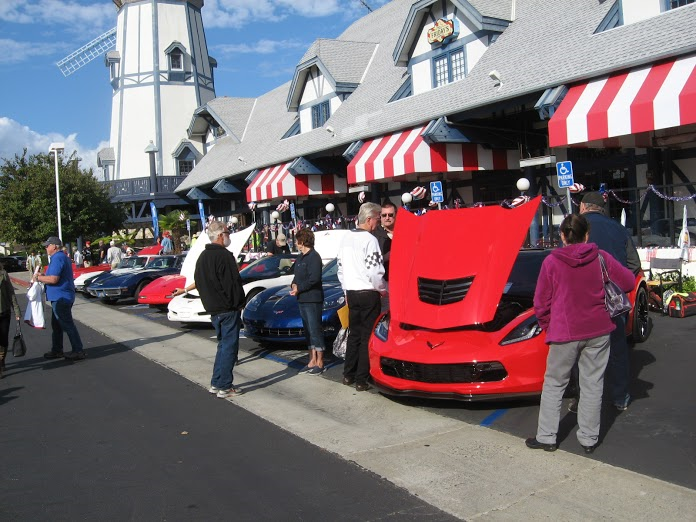 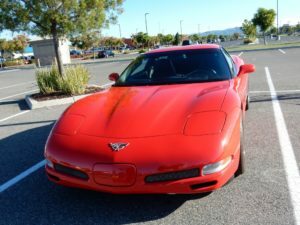 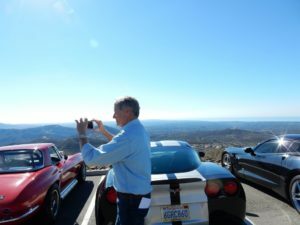 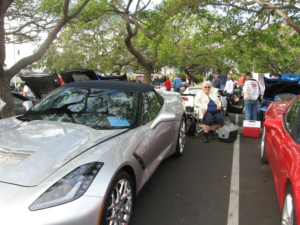 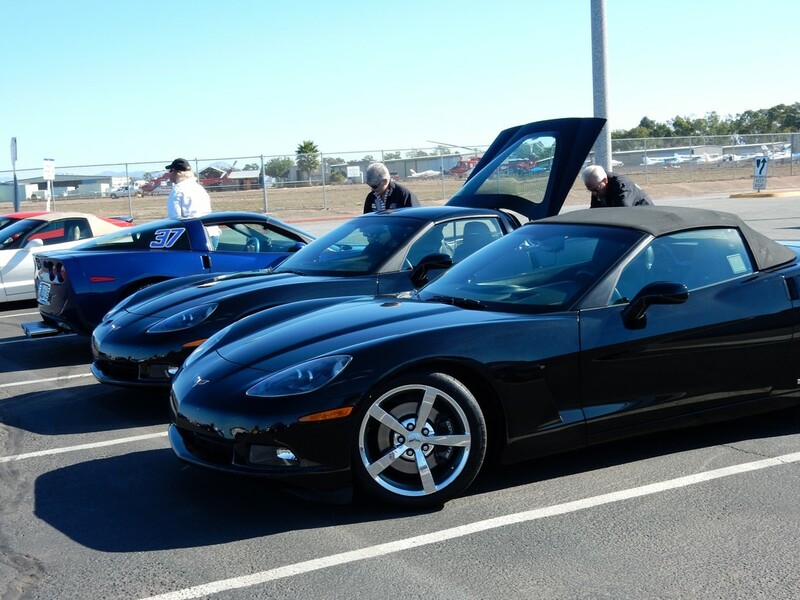 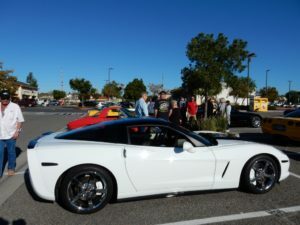 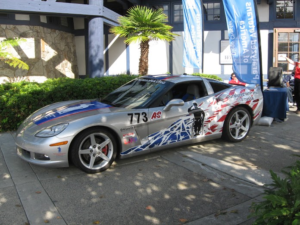 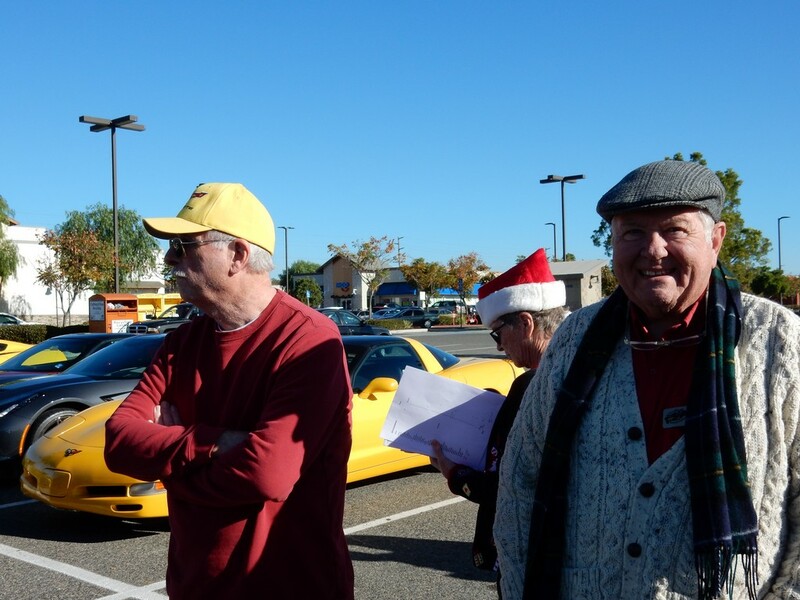 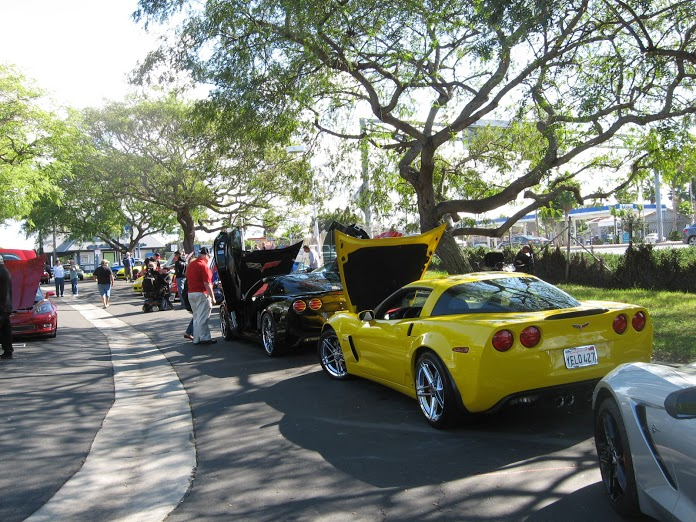 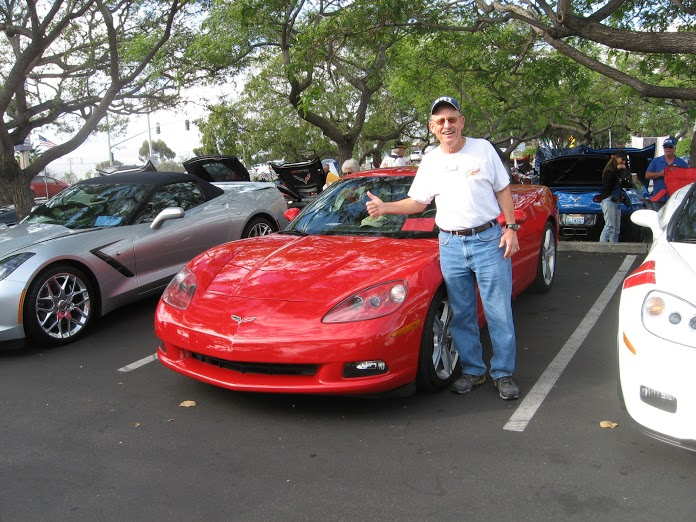 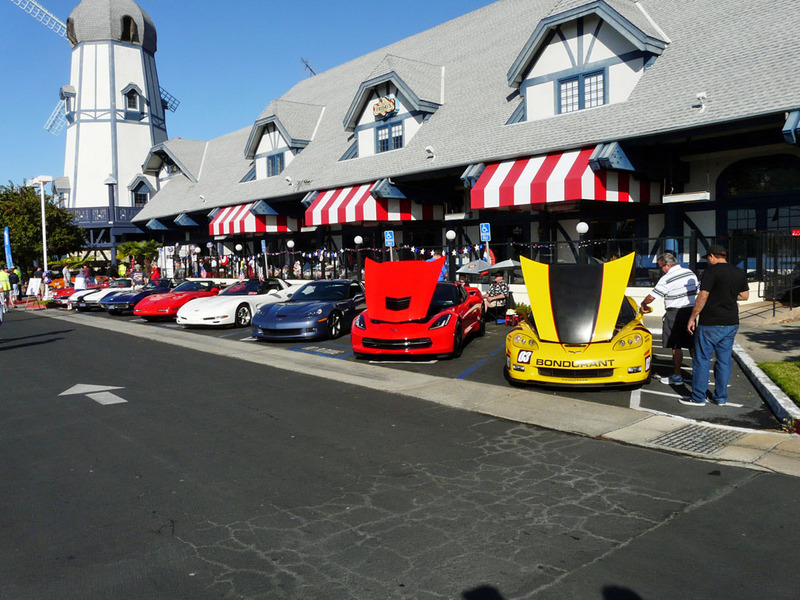 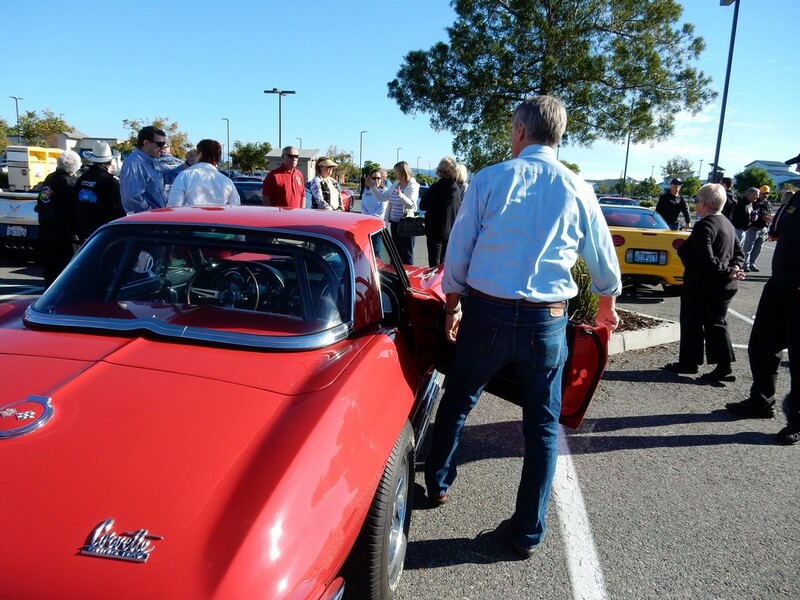 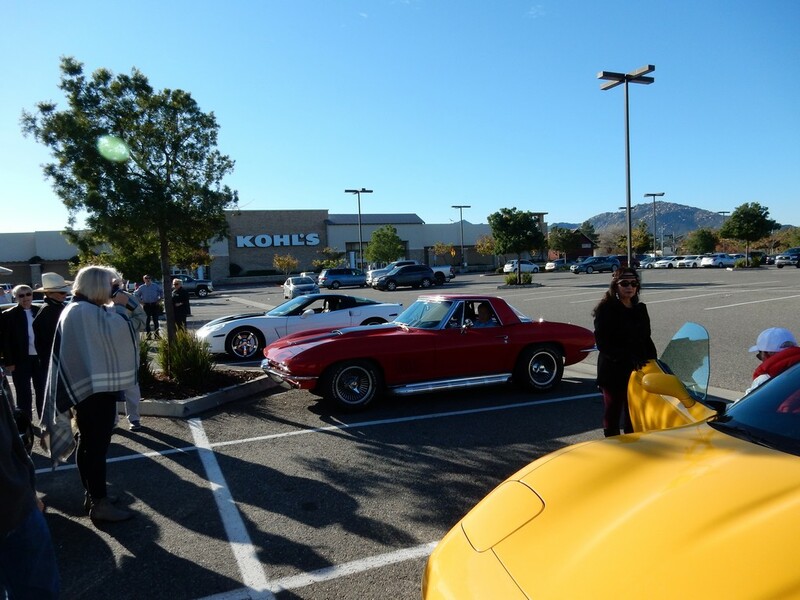 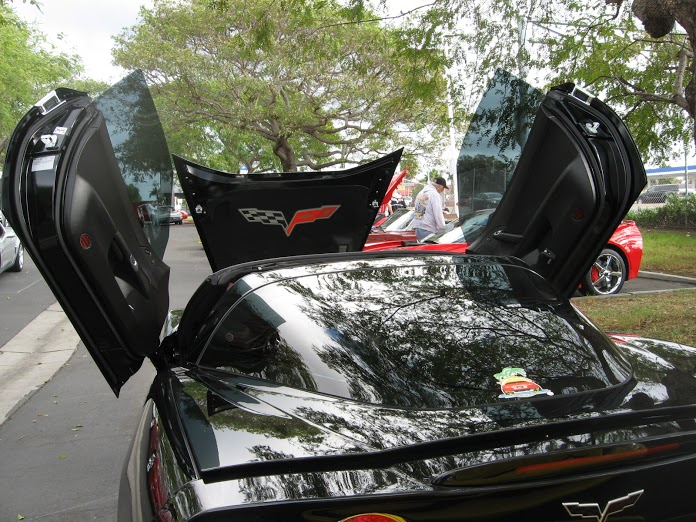 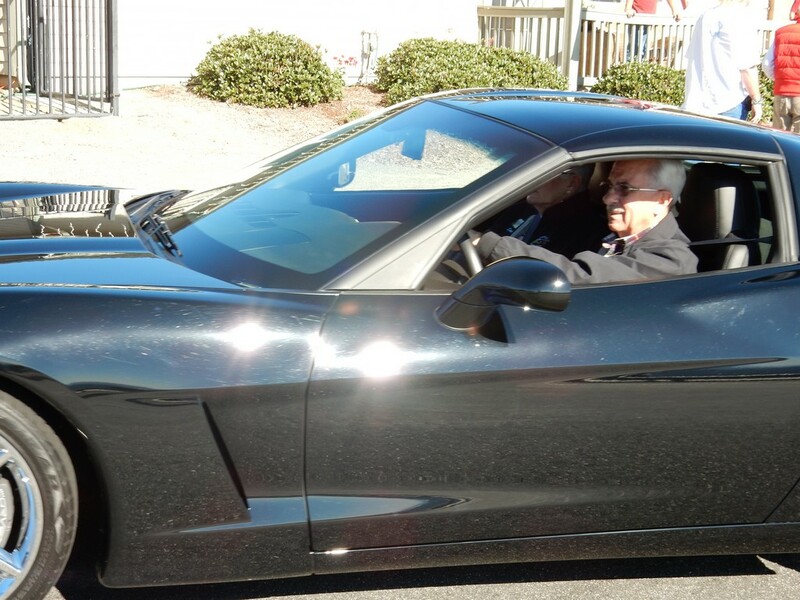 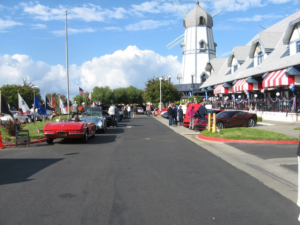 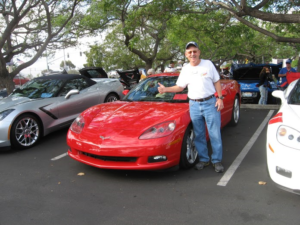 A terrific cause, good weather, many beautiful Corvettes, and success for COTV. 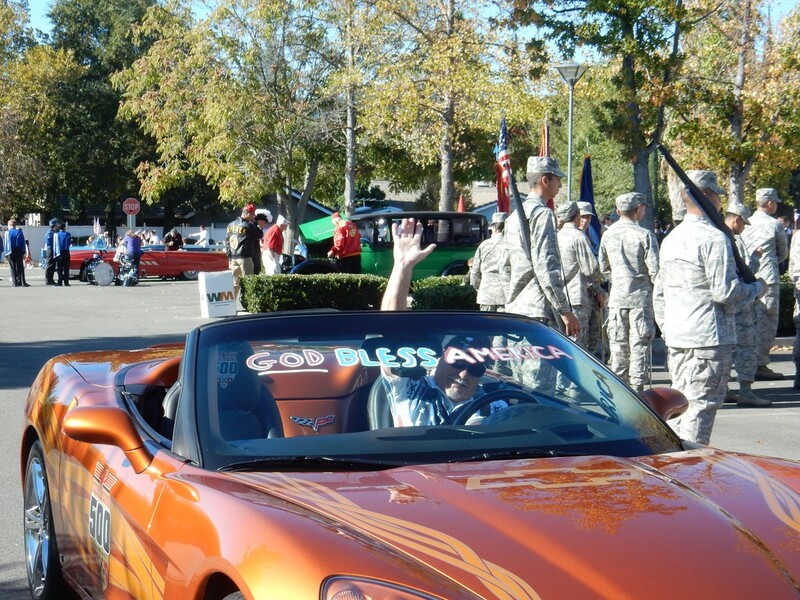 Vettes For Veterans was an excellent show. and into Town Square Park. 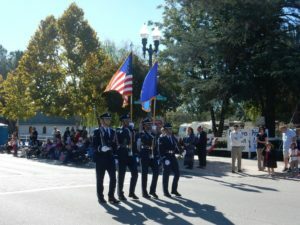 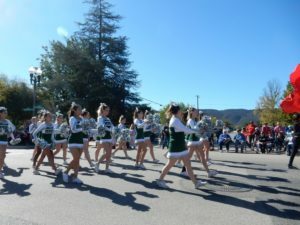 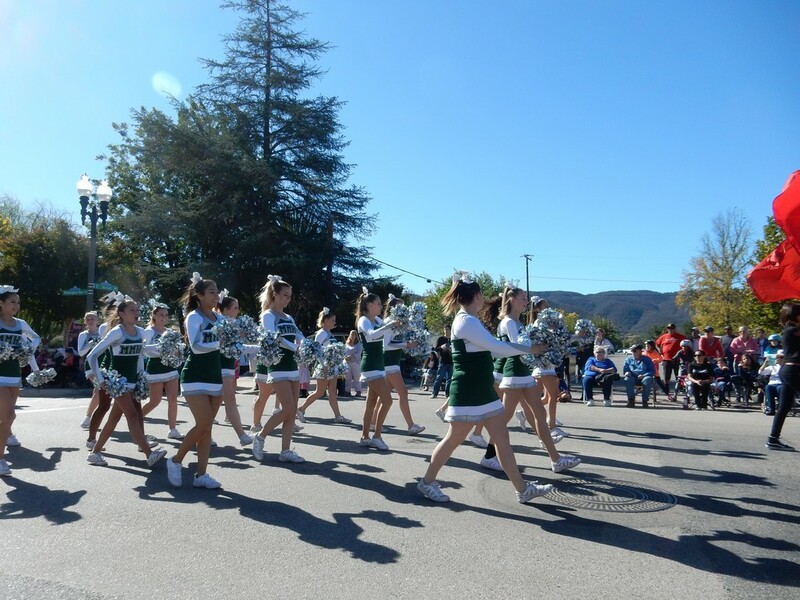 The day started cool, with frost on roof tops and sweaters on participants, but the sun came out for the start of the parade a little after 10am. 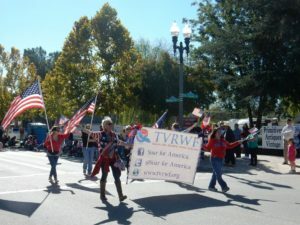 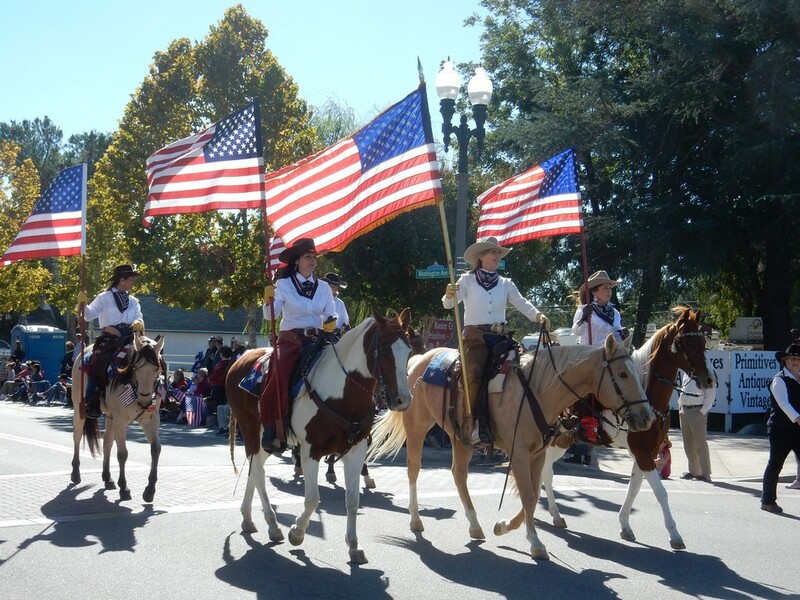 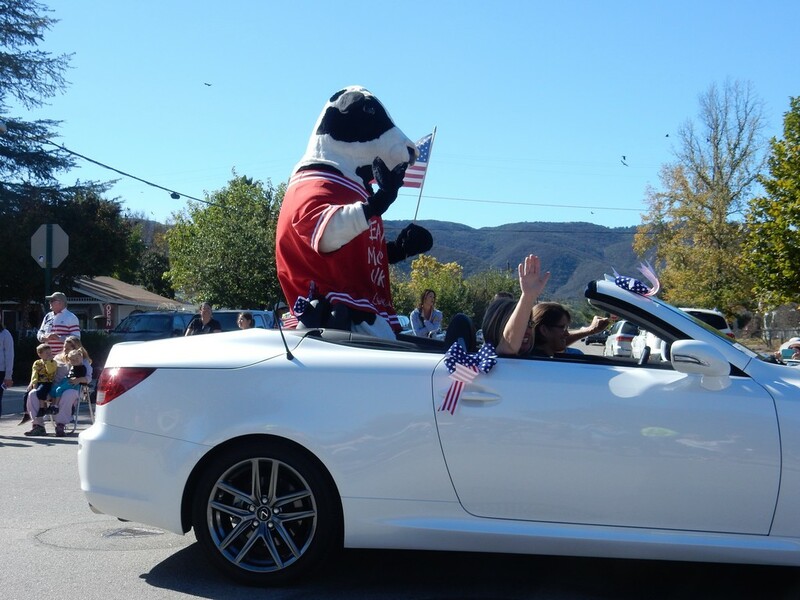 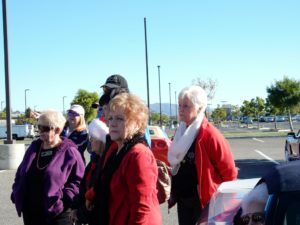 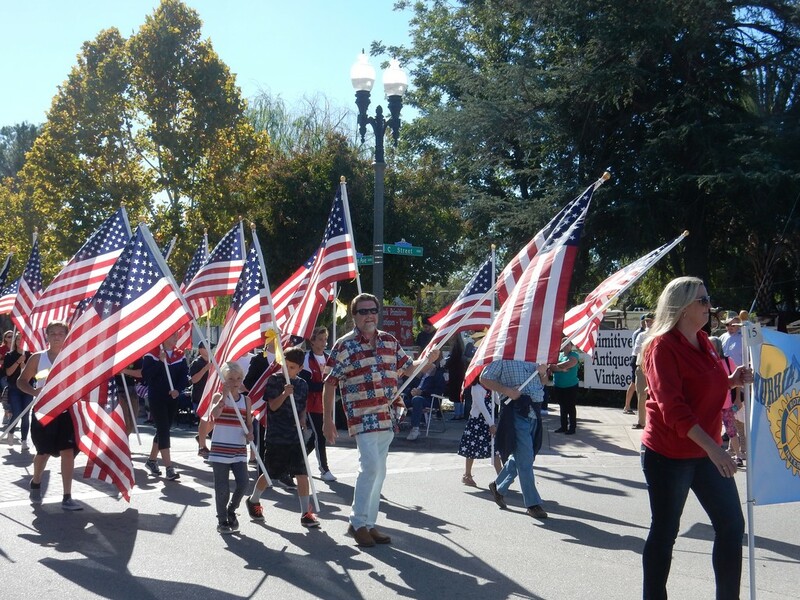 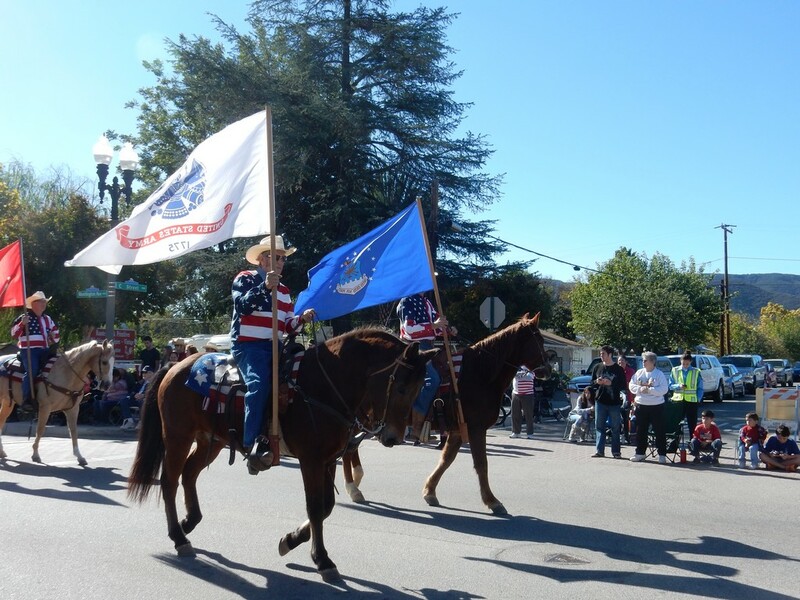 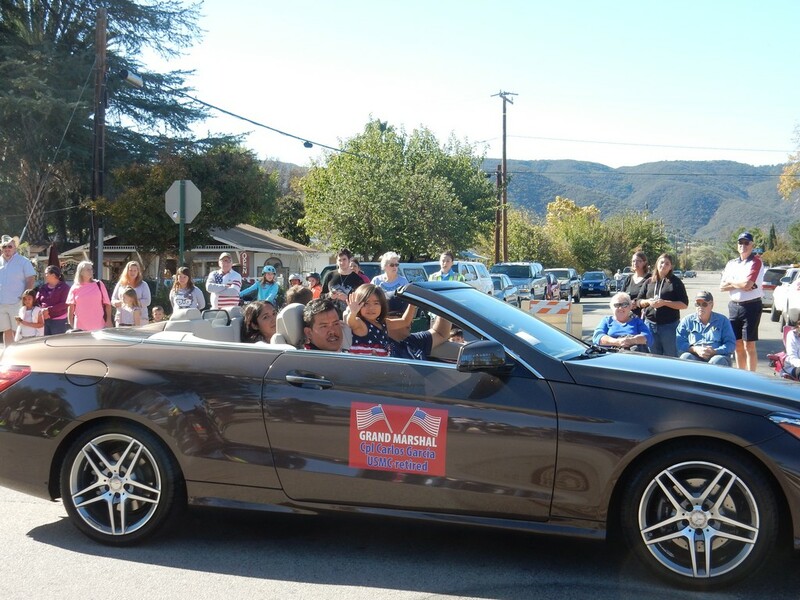 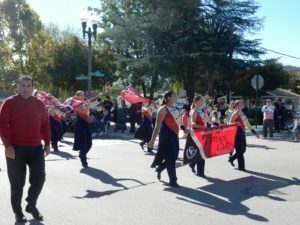 As in years past, some COTV members participated with members of the Temecula Women’s Club to show our all-American pride. Judy McIntosh, her son and her soon-to-be in the army granddaughter and her Marine spouse, as well as Daryl Weber, were viewers and photographers along the route and Dave and Betsy Crook were at the finish line to greet the slow driving vehicles. 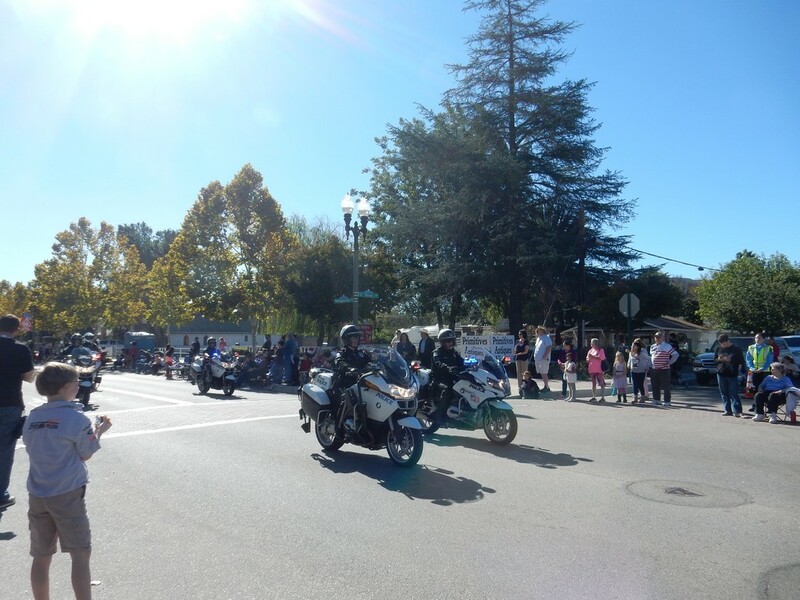 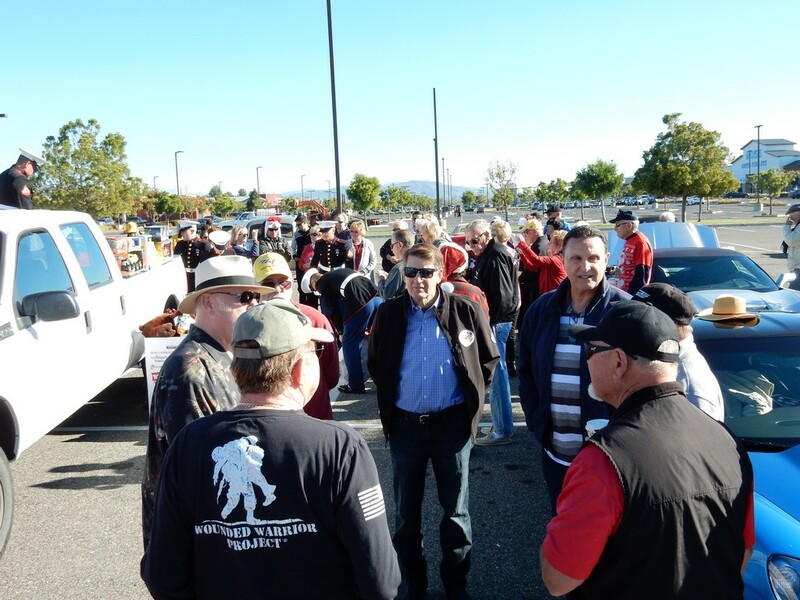 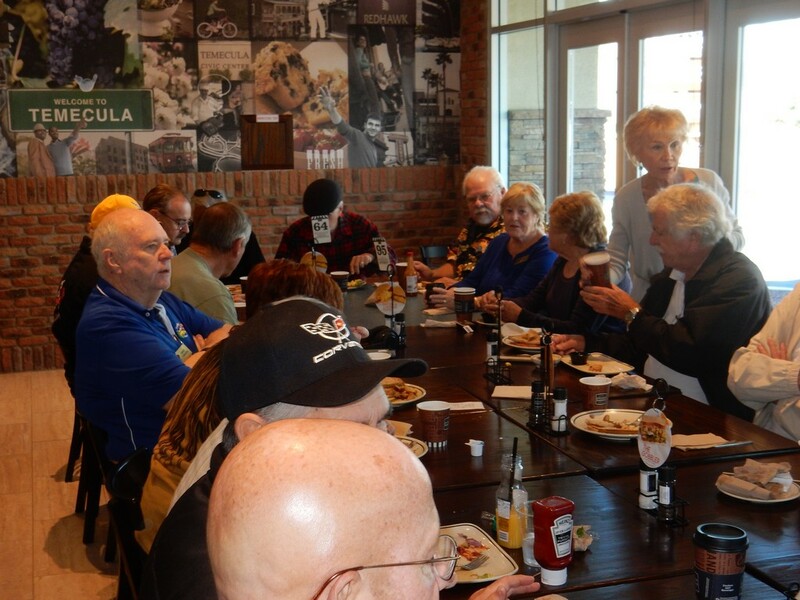 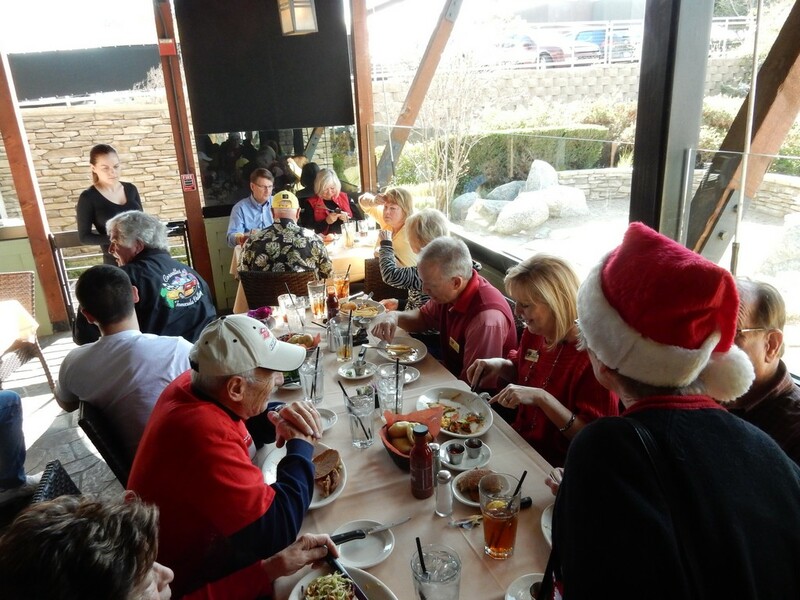 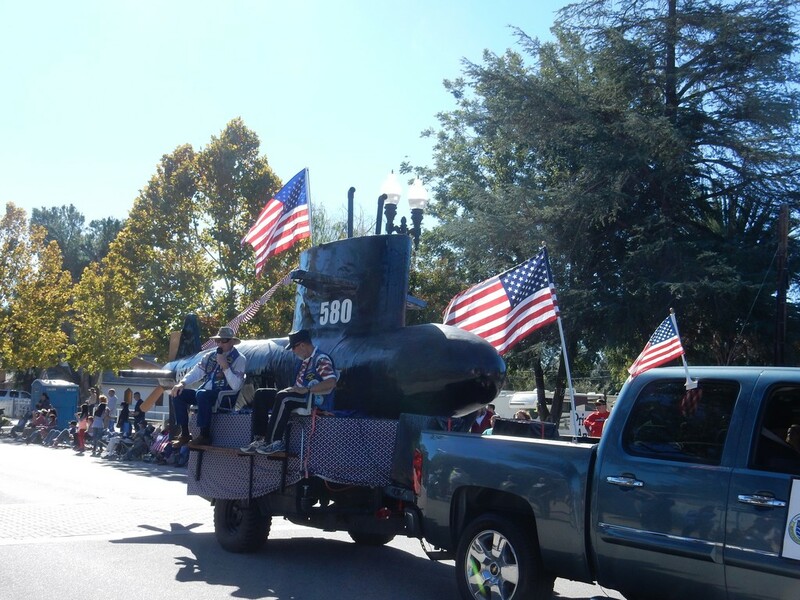 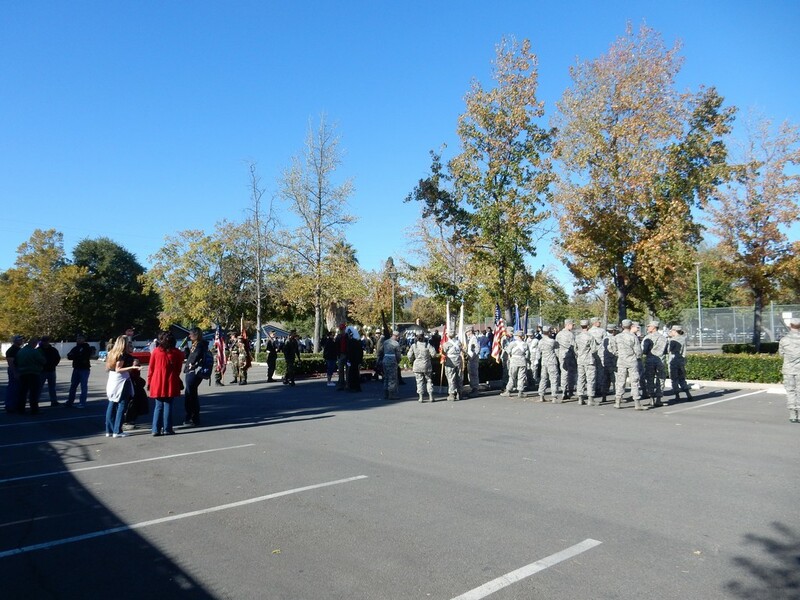 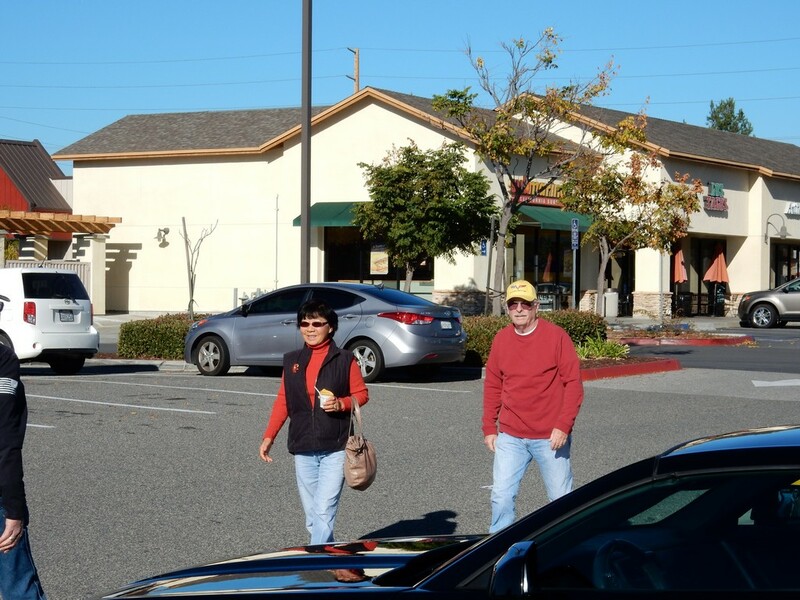 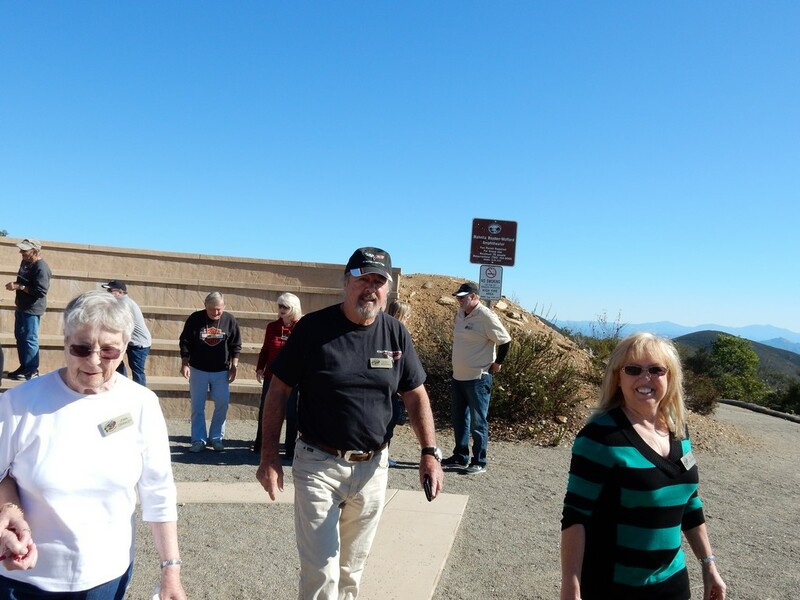 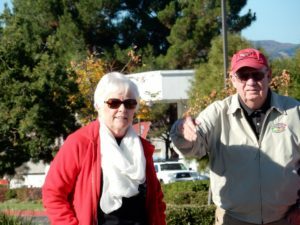 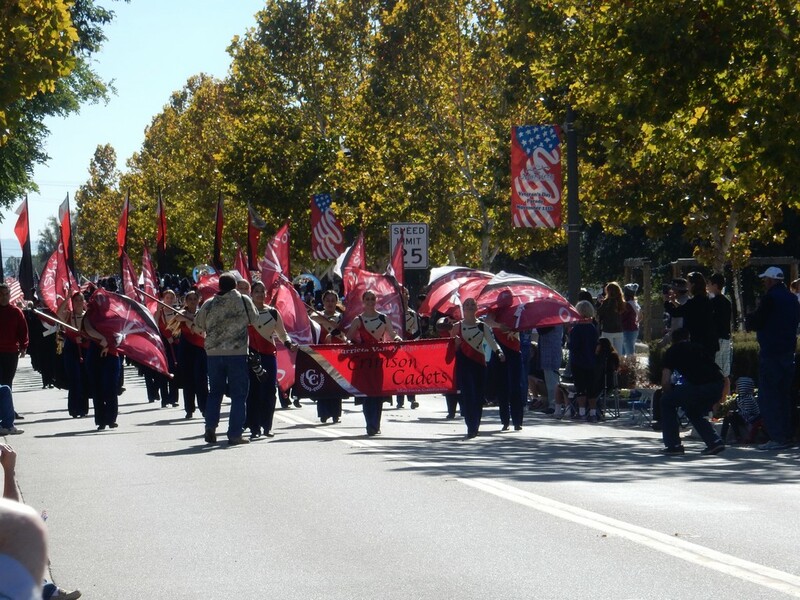 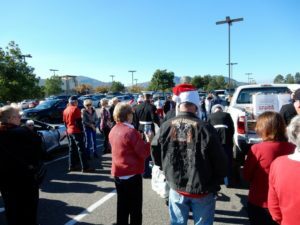 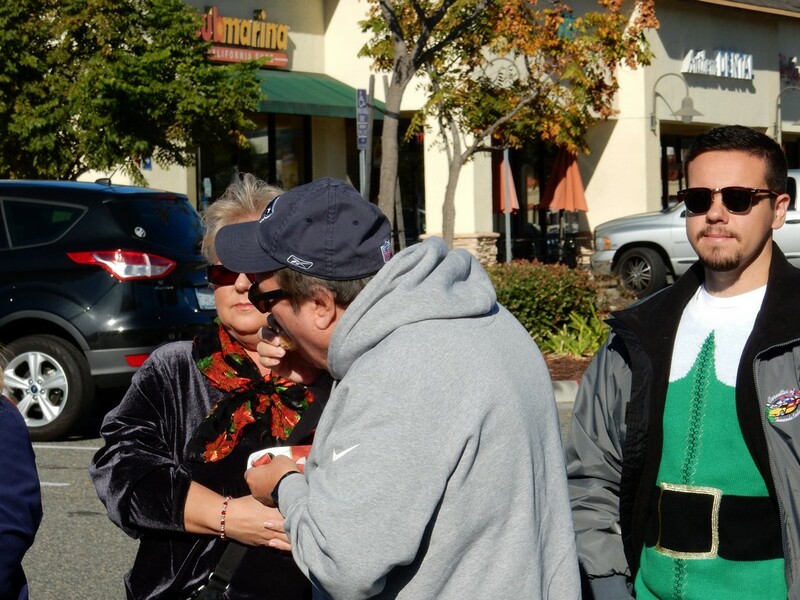 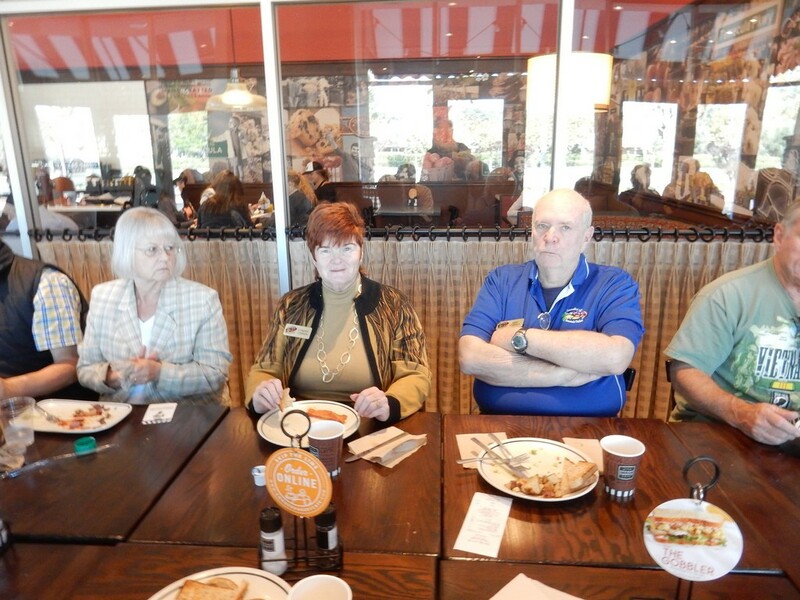 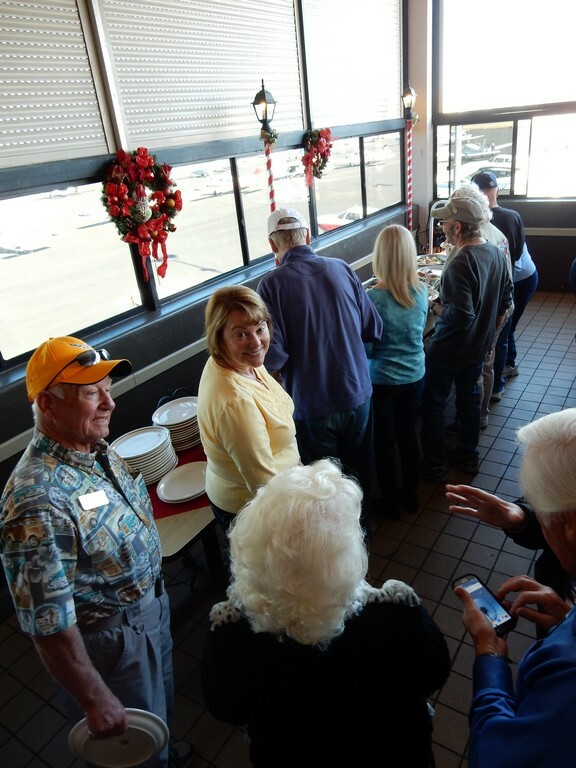 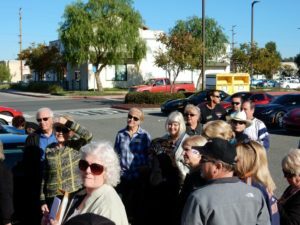 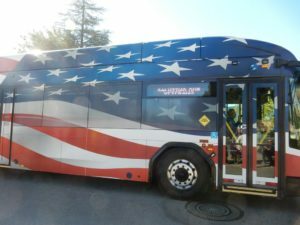 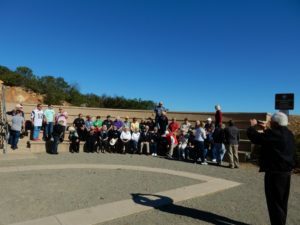 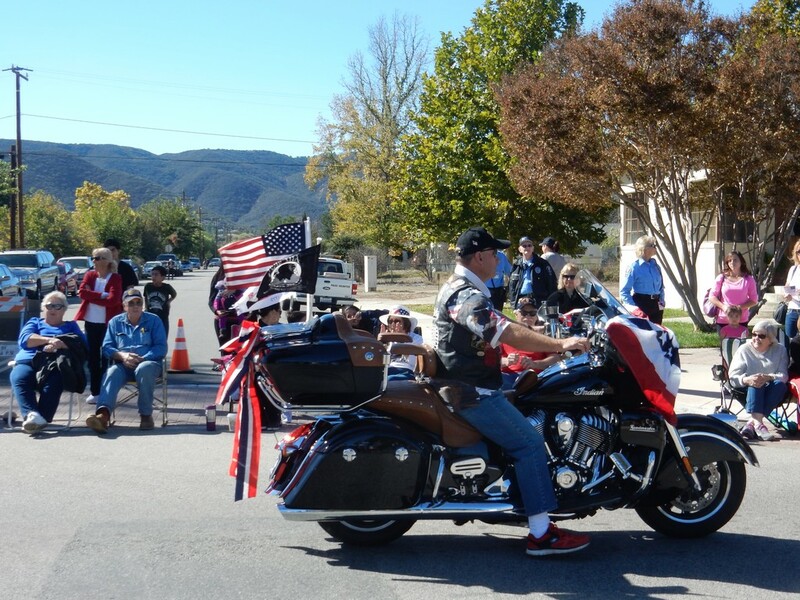 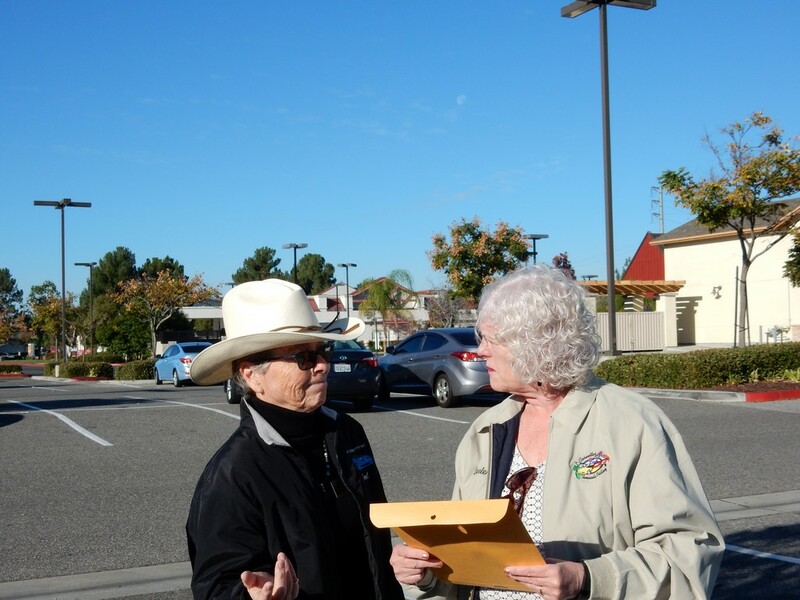 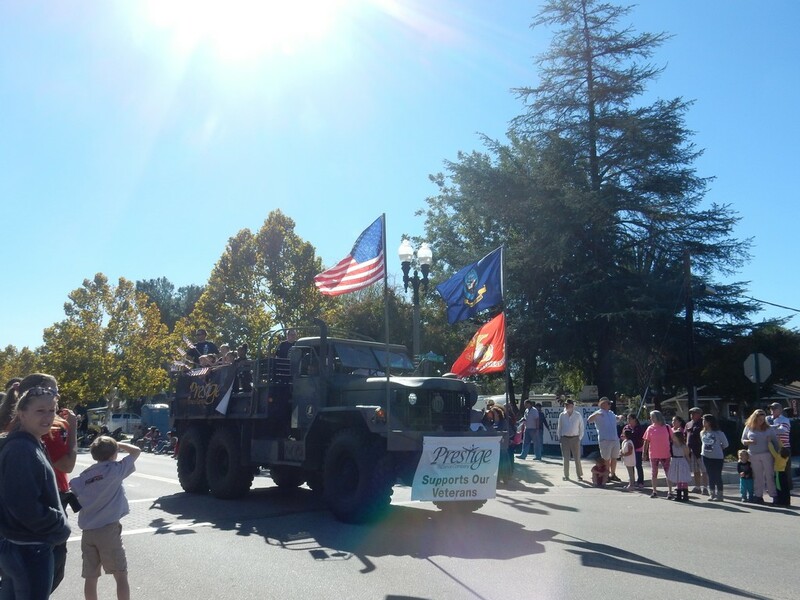 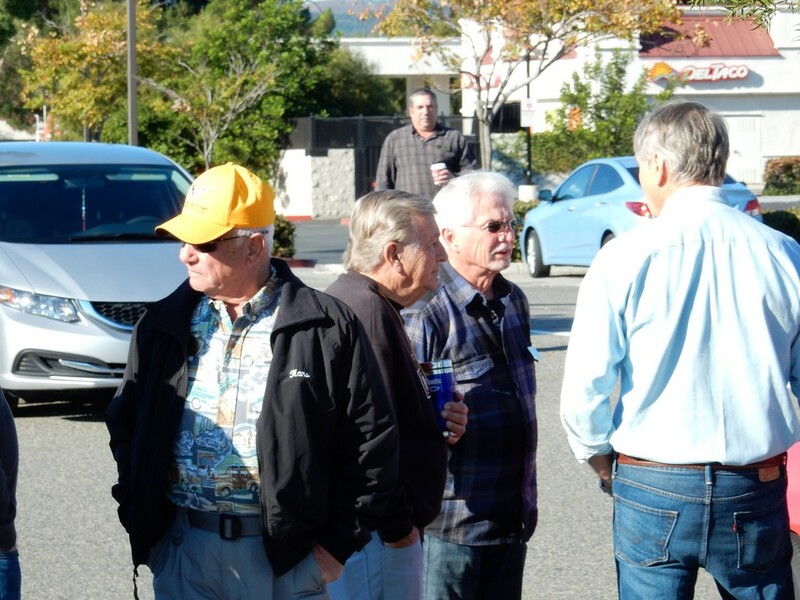 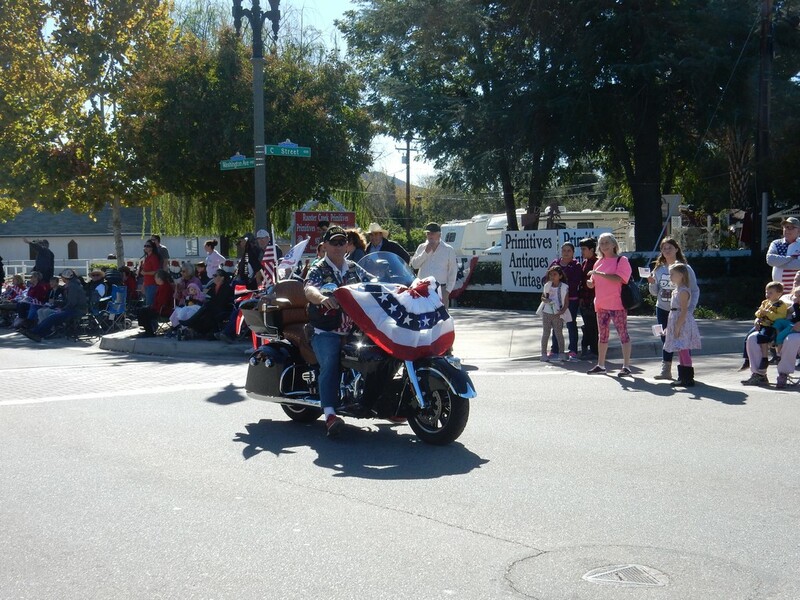 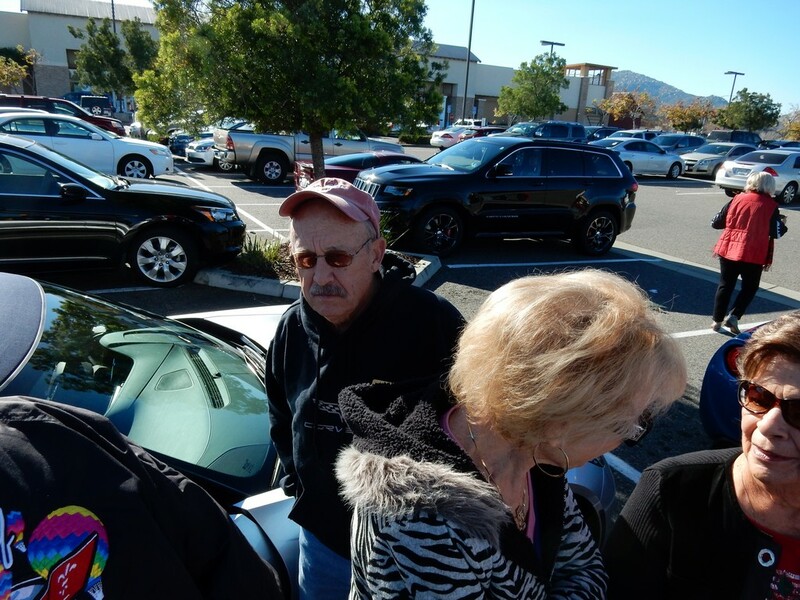 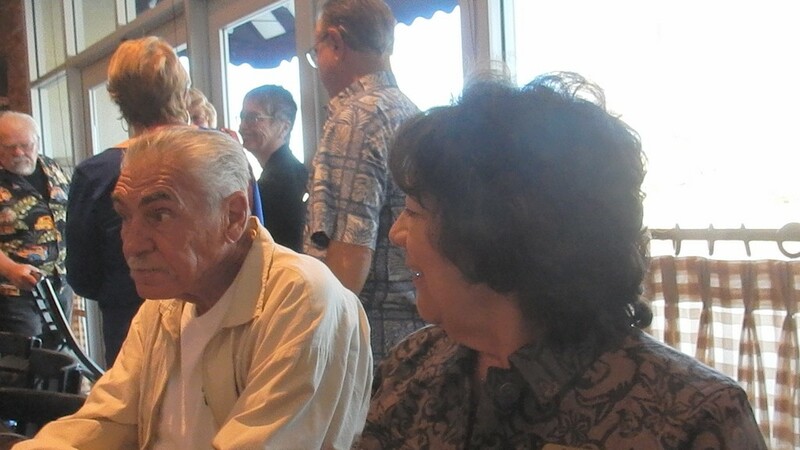 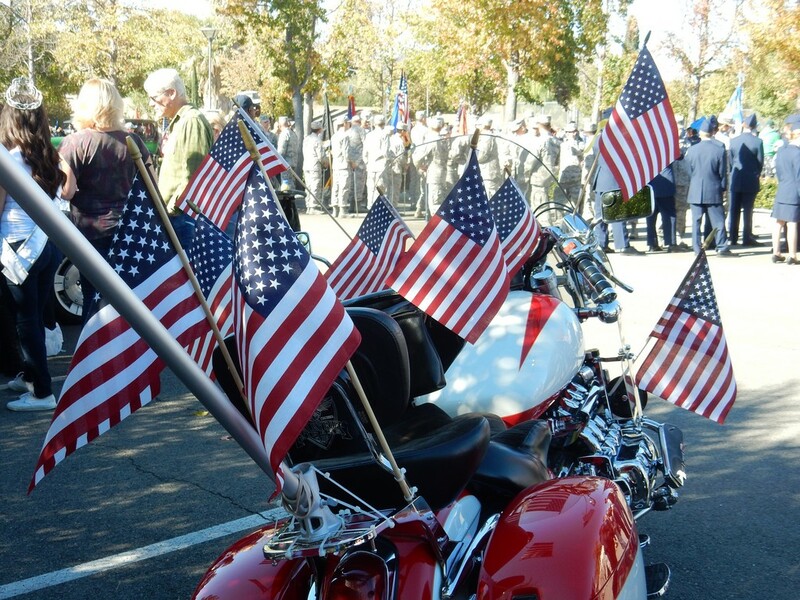 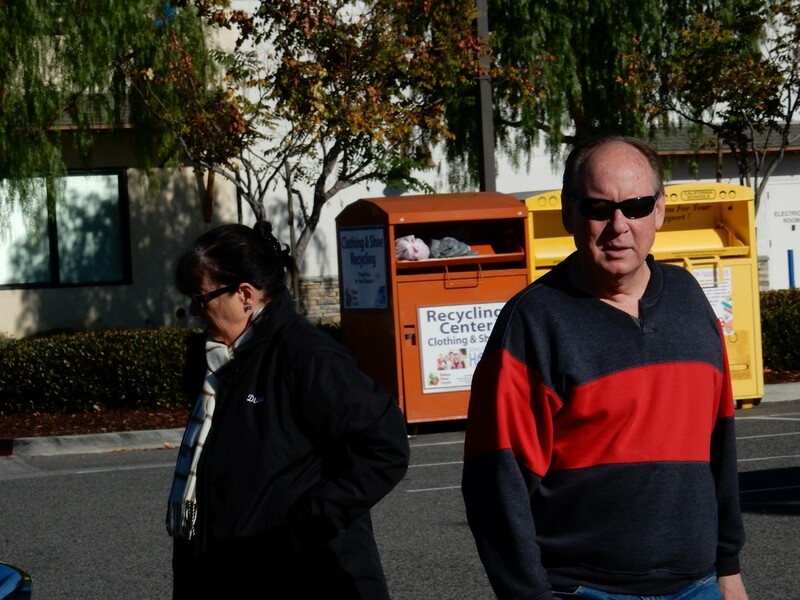 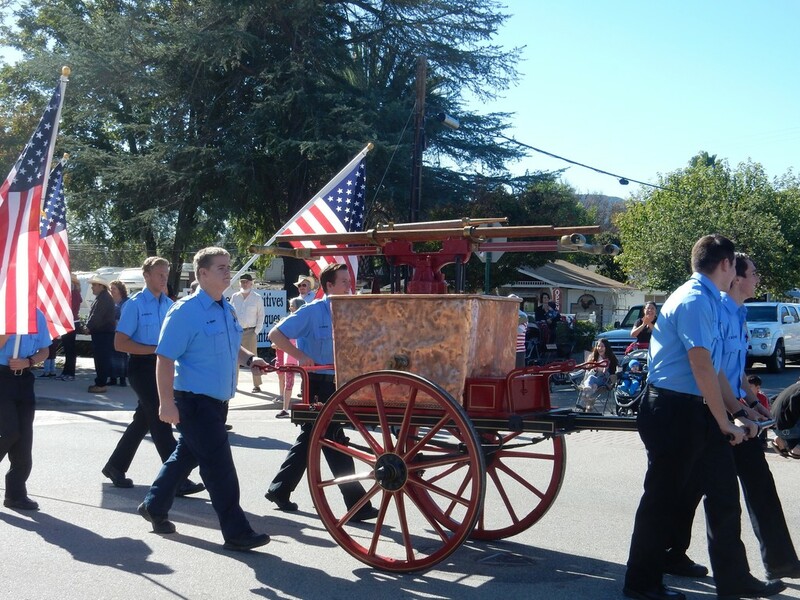 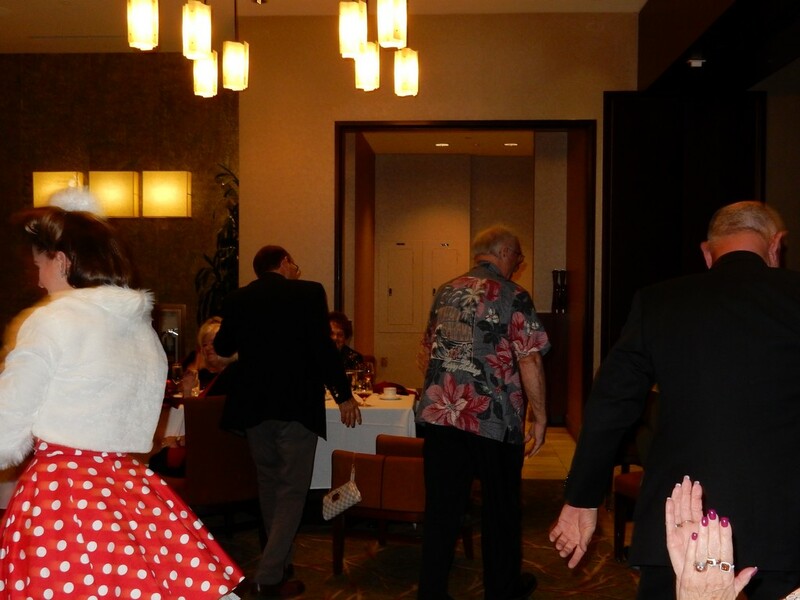 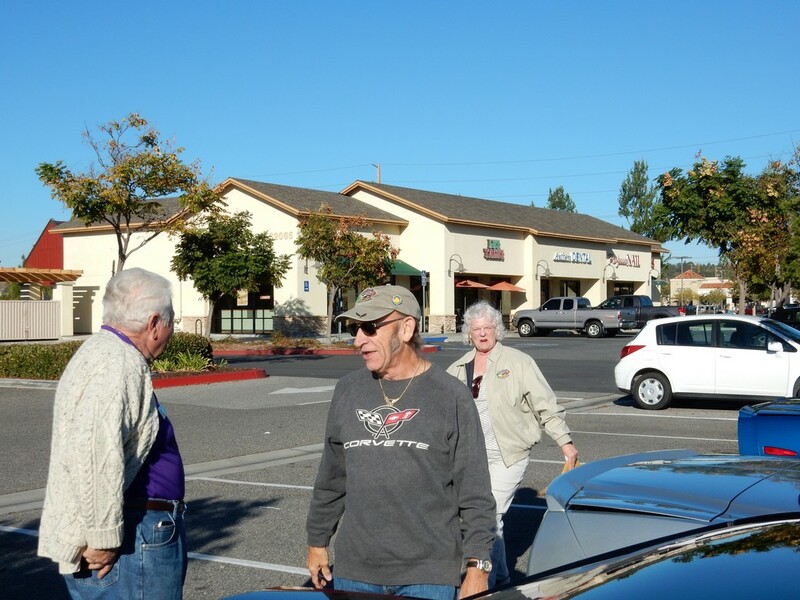 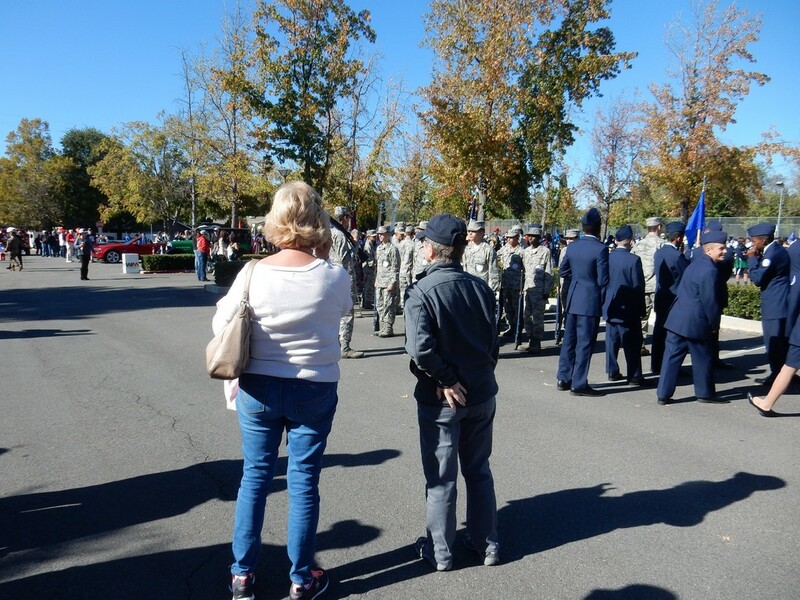 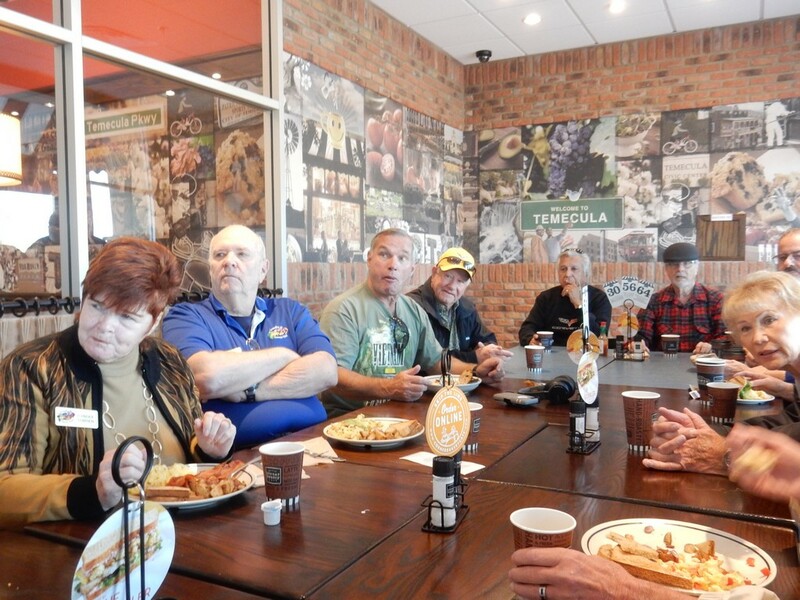 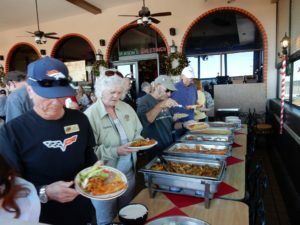 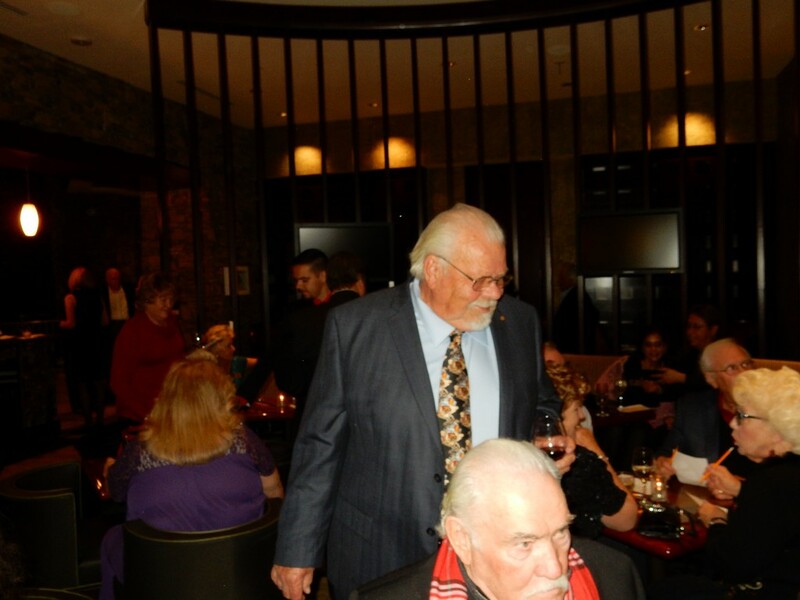 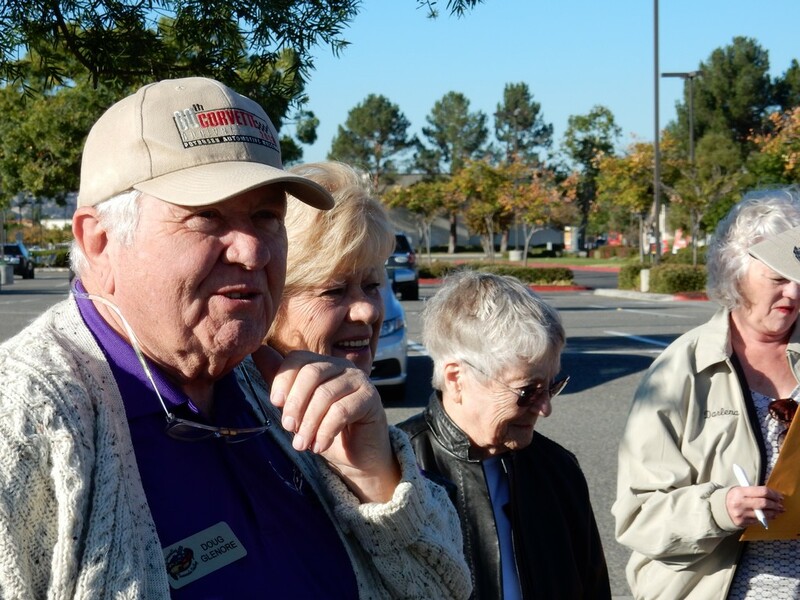 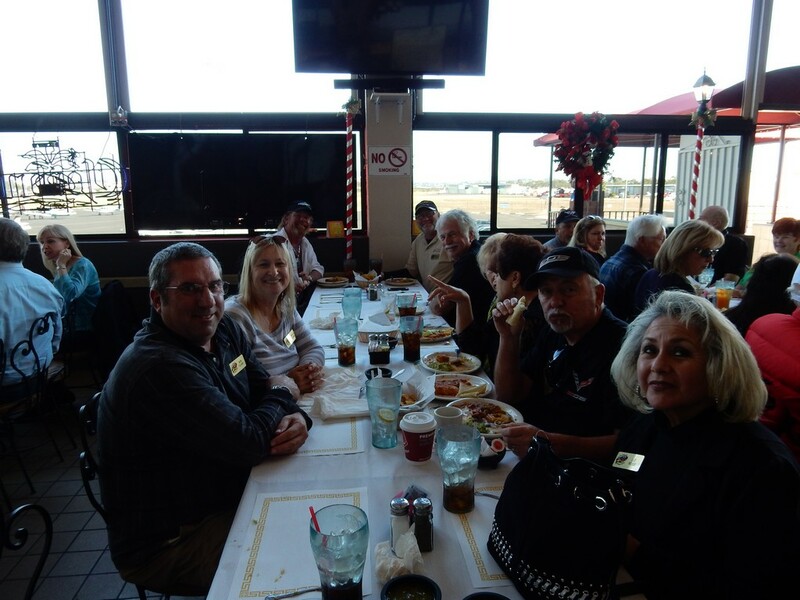 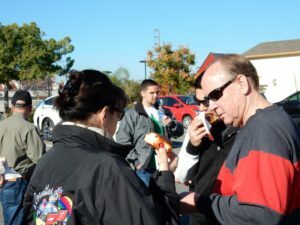 Those who were hungry afterwards headed to Pechanga for the buffet honoring veterans. 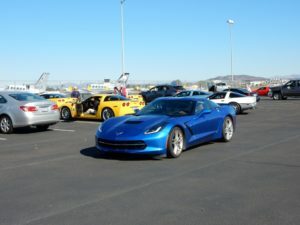 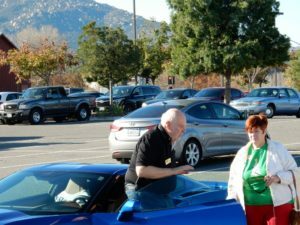 When you register, select SATURDAY, select the $75 option , tell them about your car and select your lucky number, select “Don’t want timing” (that’s what the pad and pen are for), if this is your first time driving at Speed Ventures enter discount code SV091515MC and get $10 dollars off, and don’t worry about the helmet requirements as in the past they never checked. 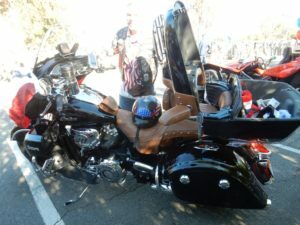 You have to have a full helmet (plastic covers your ears). 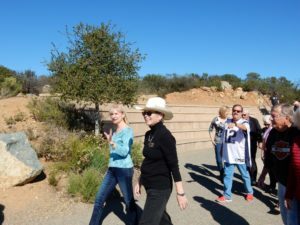 And don’t forget the Carte Blanche option which allows you to run in all the groups so you only have to take a break when you want to. 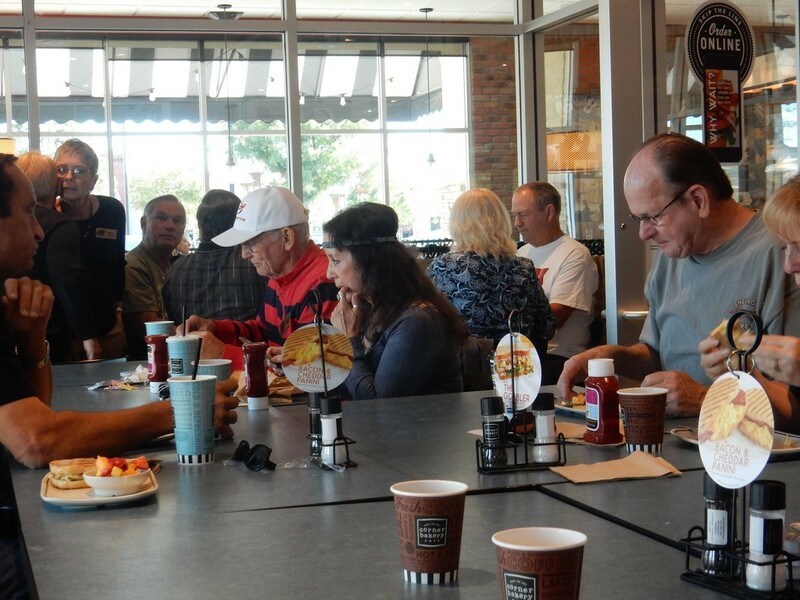 Today marked the last of our first year of breakfast socials. 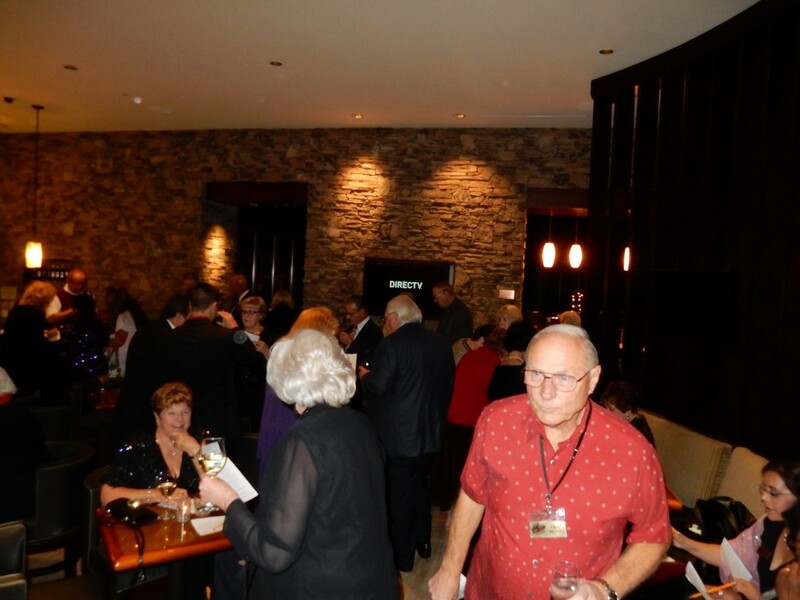 It has become such a successful event that COTV will be continuing with 6 new ones in 2016. 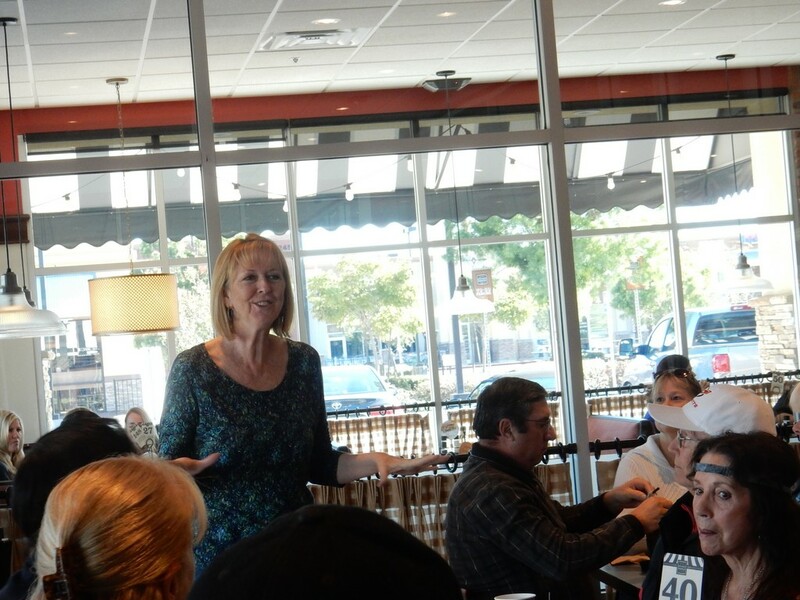 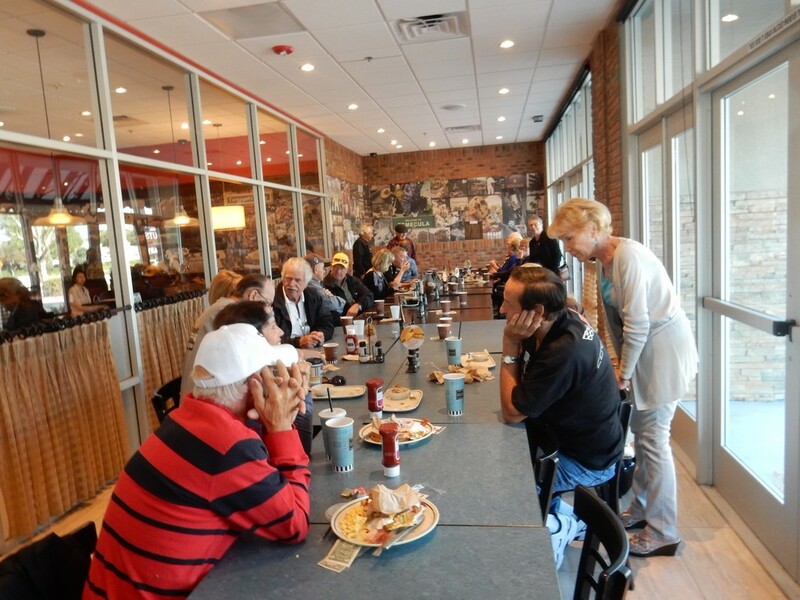 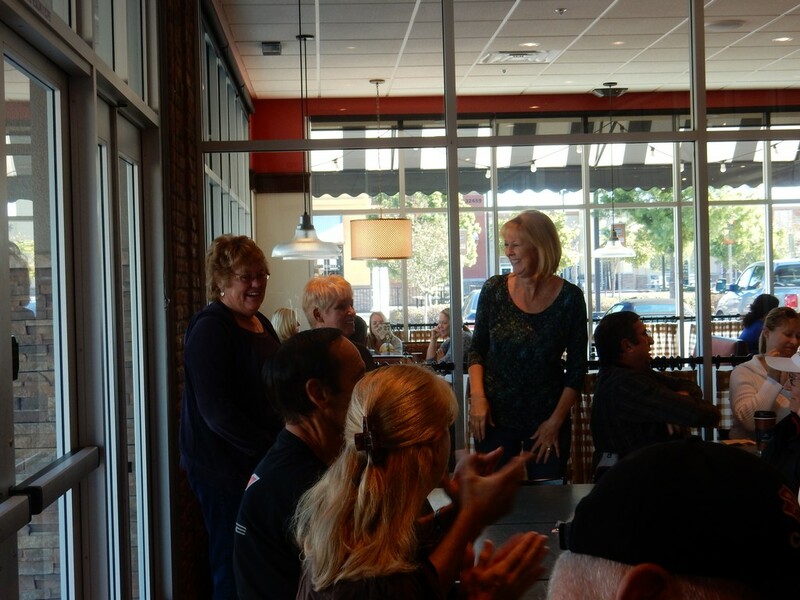 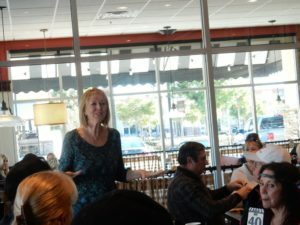 Vickie Hackworth introduced the team who will work together to find new and interesting places to eat that all-important meal of the day. 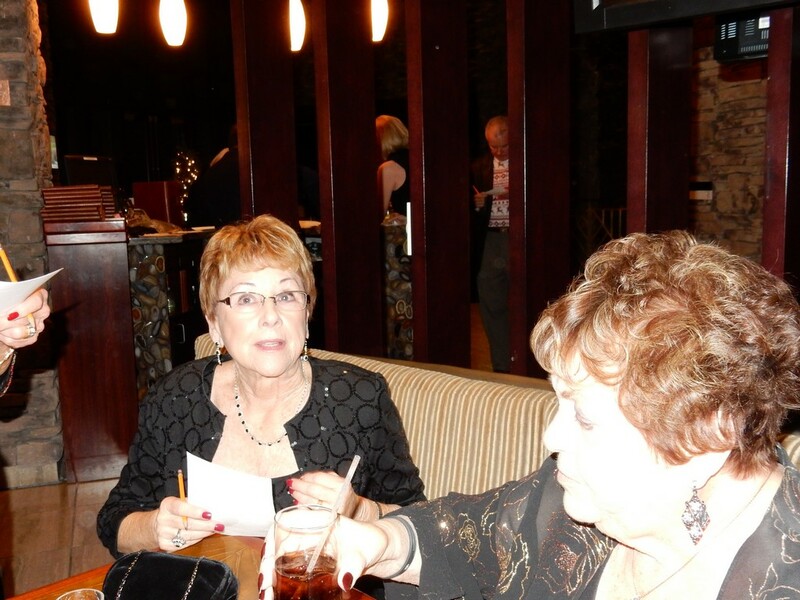 Carol Buote and Marilyn Watson will coordinate for the next year. As always, if you arrived after 8:30am for a COTV event involving food scheduled to start at 9am, you could be considered late. 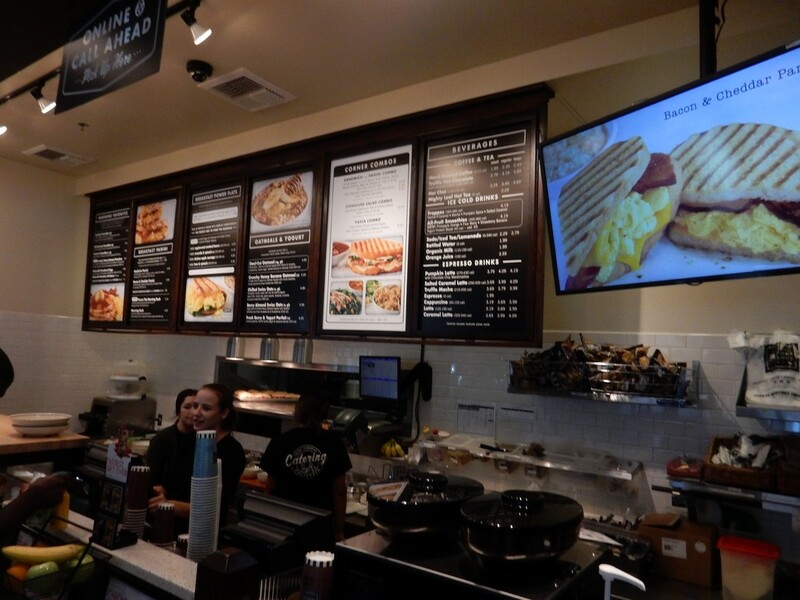 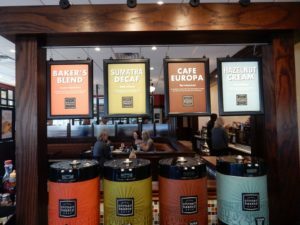 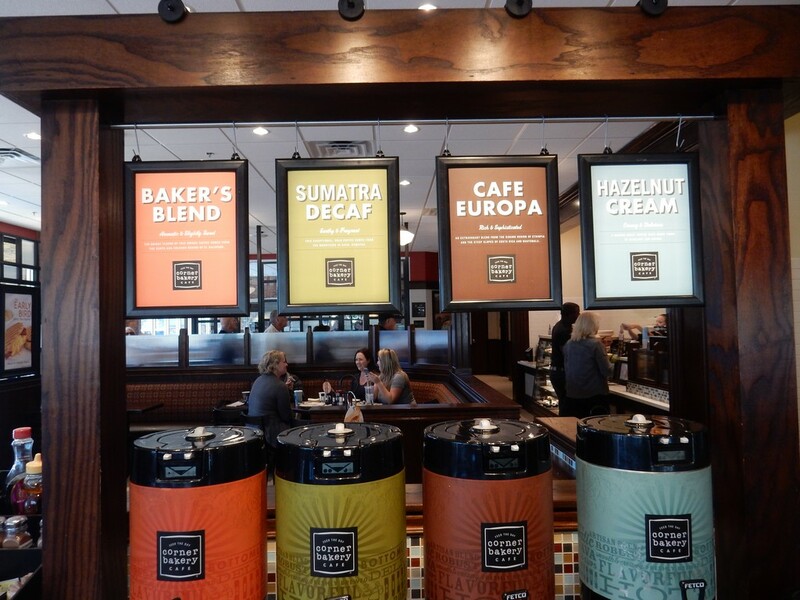 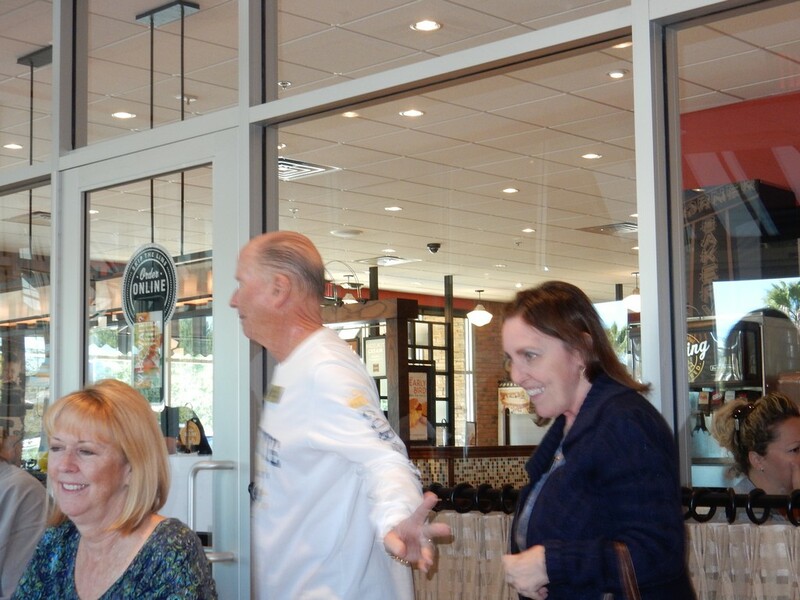 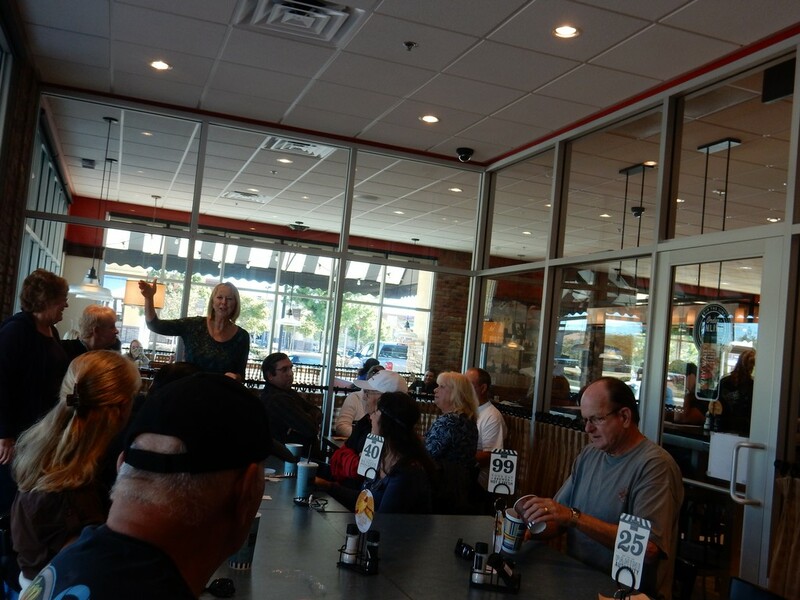 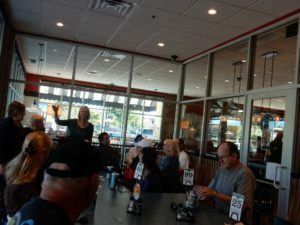 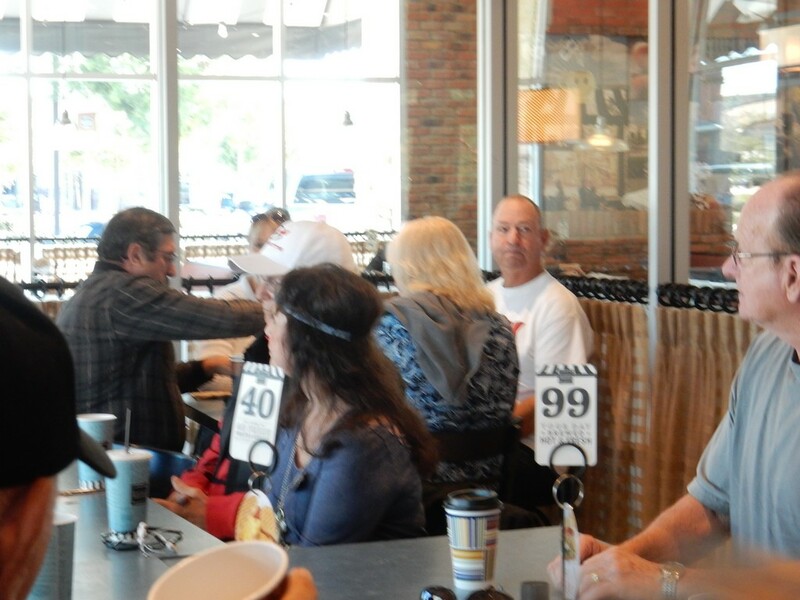 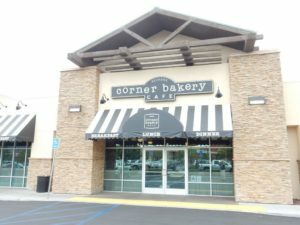 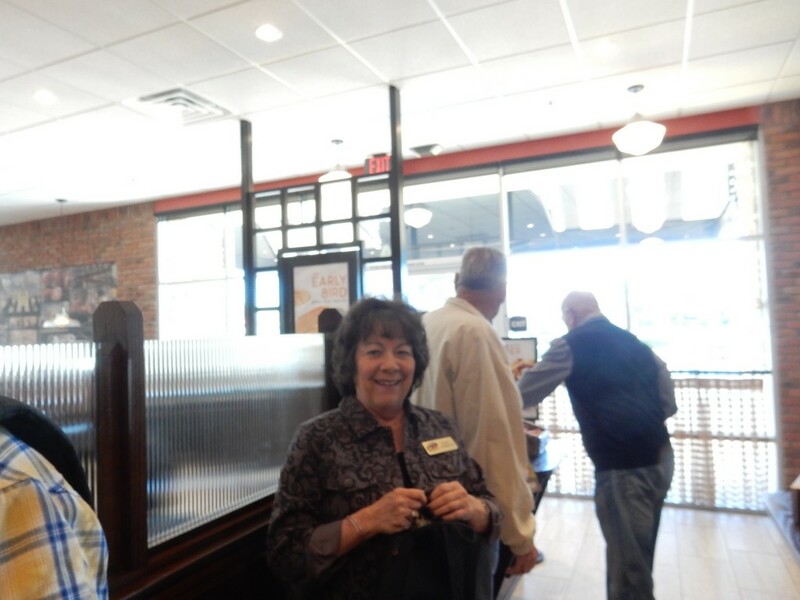 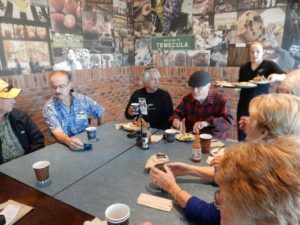 By 8:40, there was already food on the table in the private room at the Corner Bakery, where you place your order and the staff delivers it to you when it is ready. For some reason, oatmeal seemed to be more difficult to get out in a timely manner than the more complicated combinations, so Leonard and Carol might have been among the first to arrive, but not necessarily the first to eat. 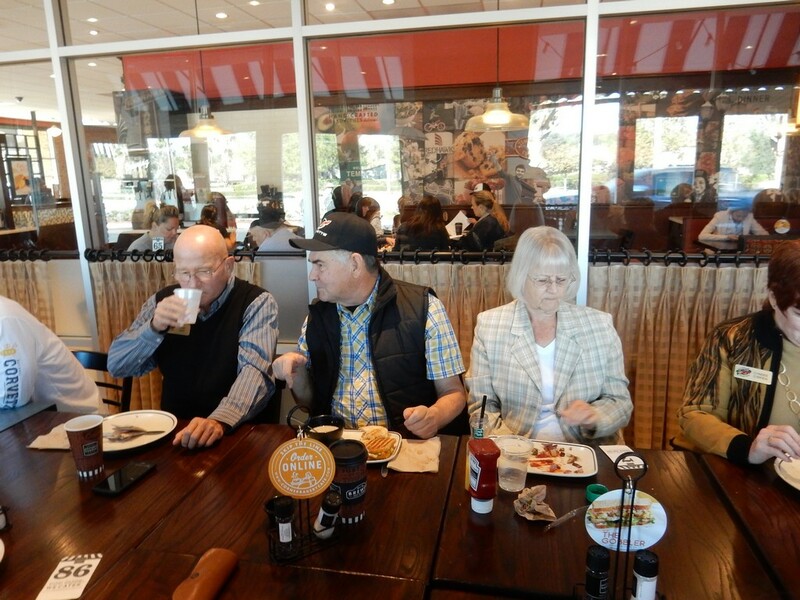 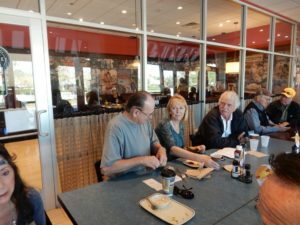 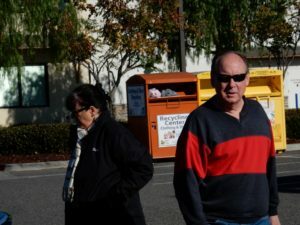 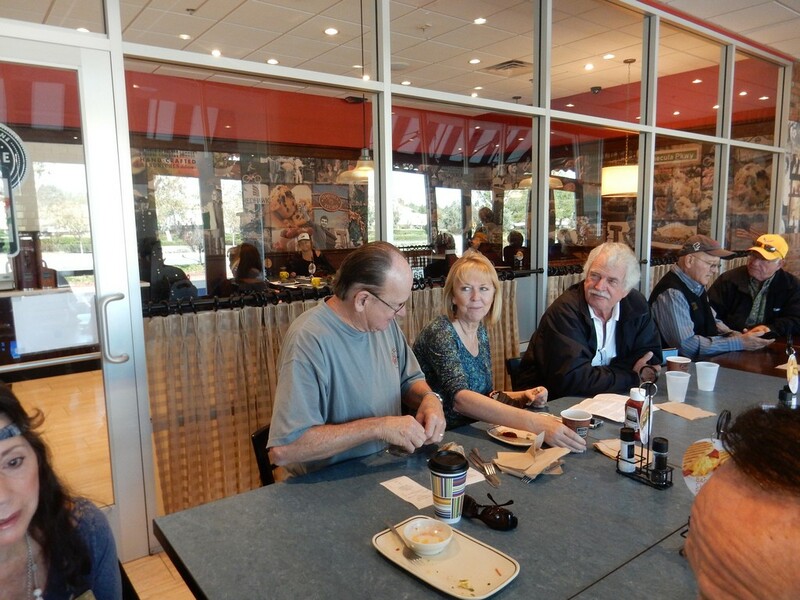 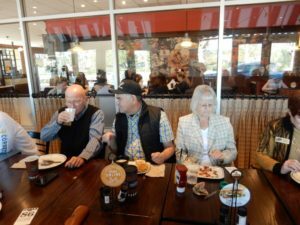 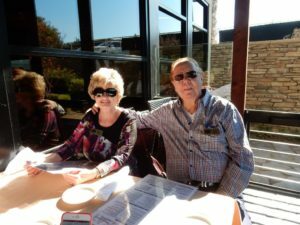 Somewhere between 30 and 35 COTV members turned up to chow down and catch up – including the Buotes, the Clarks, the Crooks, the Finches, Greg Grajeck and Cindy Hart, the Hackworths, Skip Hipp, the Homans, the Jenkins, Ray McIntosh (he walked from home! ), the O’Briens, John Olivas, the Sommars (ahead of time for the second event in a row – maybe he is taking his new role as Events Coordinator for 2016 seriously! 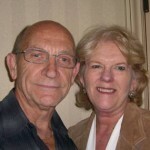 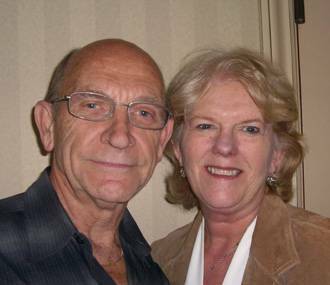 ), Bob Smith and Rose Streets, the Sparks, the Thackwells, the Watsons, and the Webers. 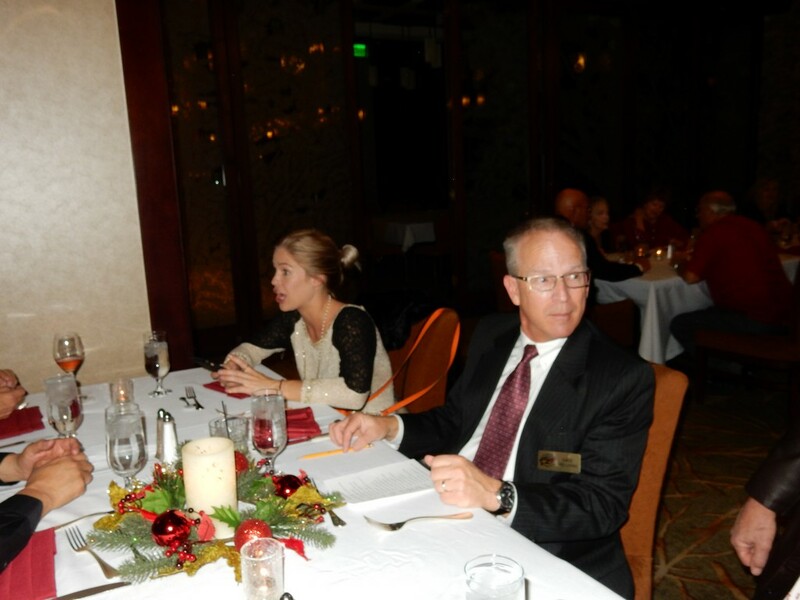 We kept adding tables and chairs to the configuration in the room until we almost ran out of room. 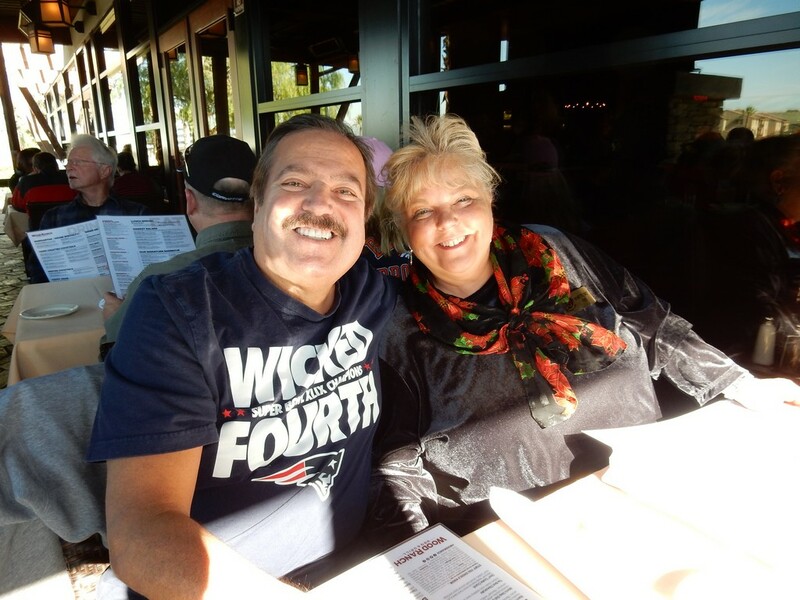 Well, Vickie, thanks for introducing this great idea and starting a new custom in such style. 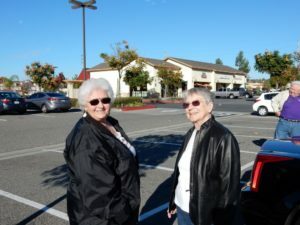 We are already looking forward to what Carol and Marilyn can come up with for January.